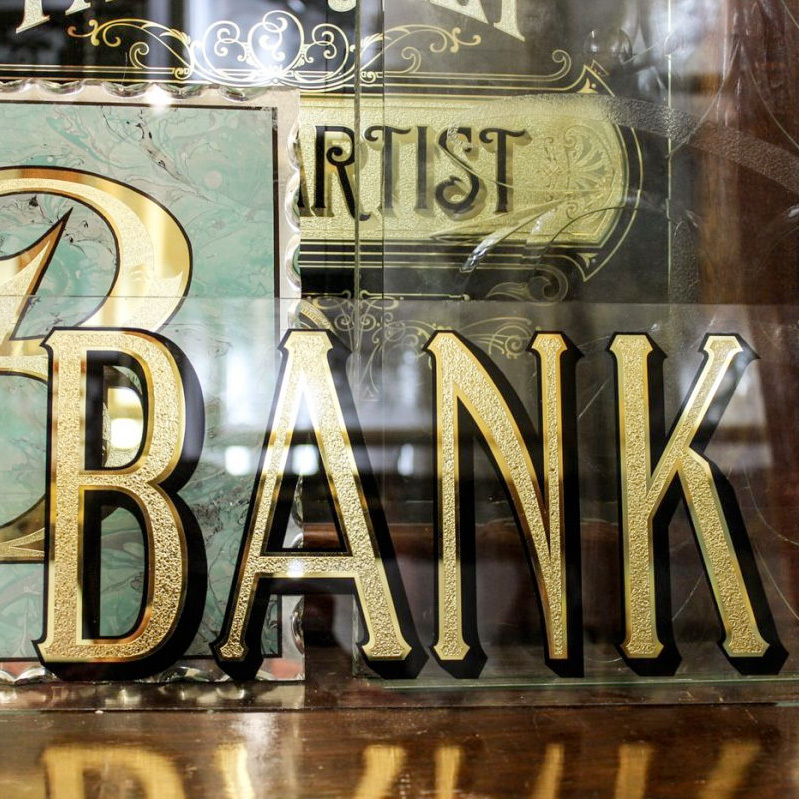 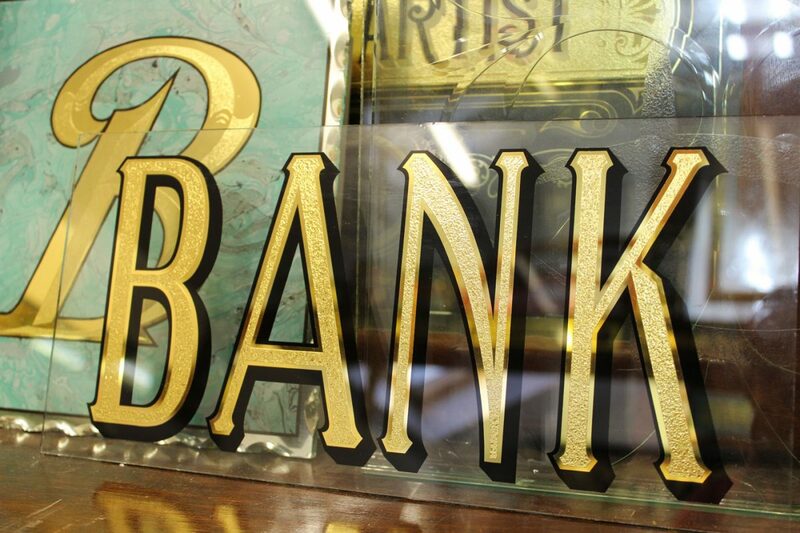 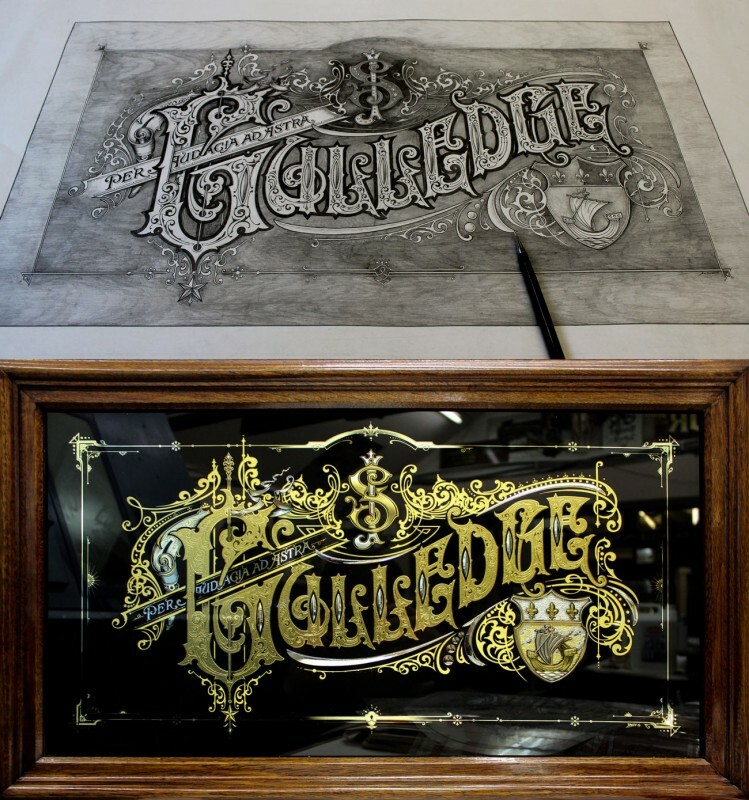 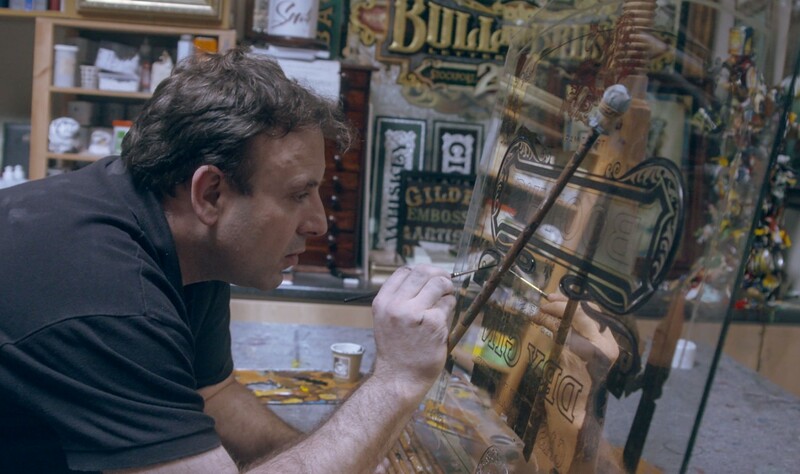 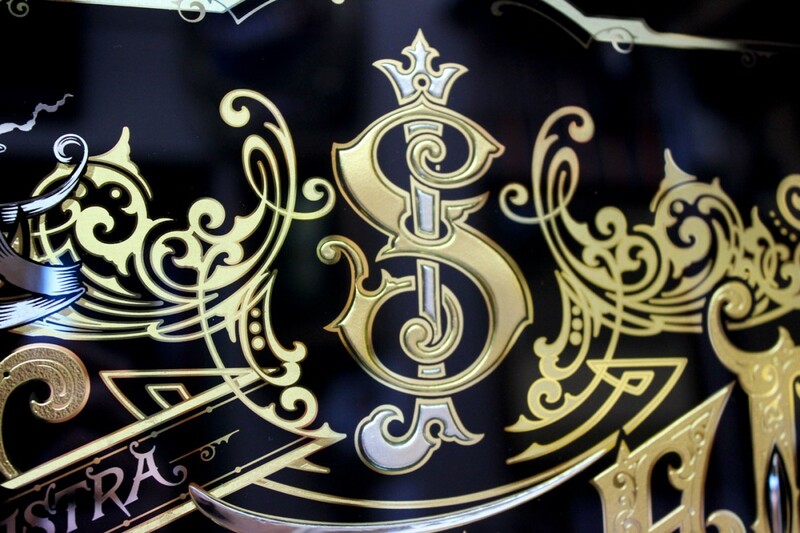 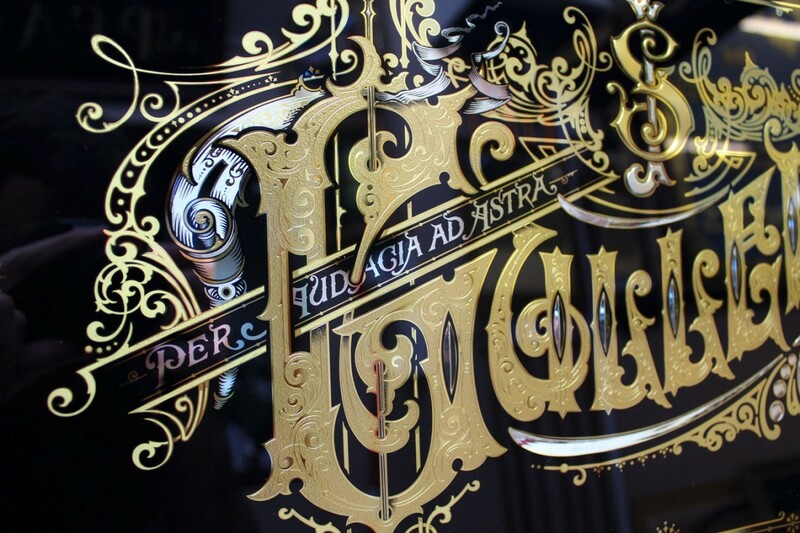 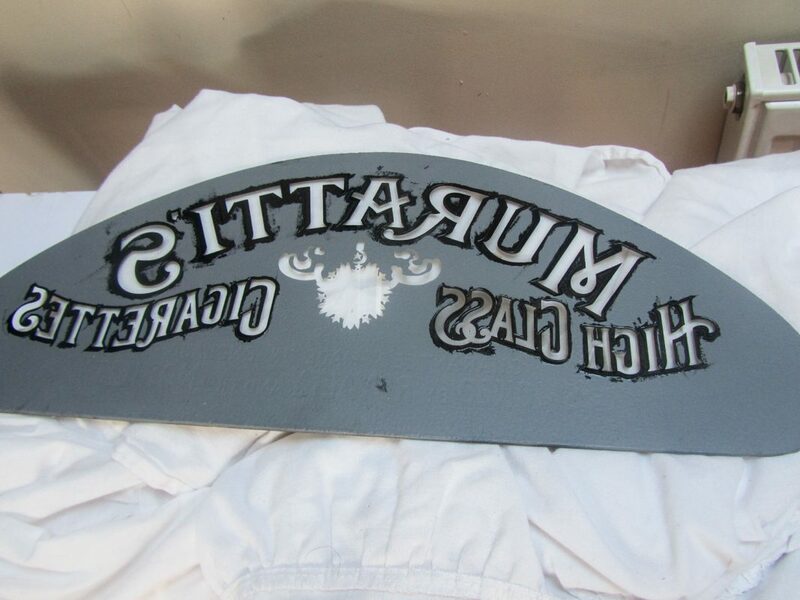 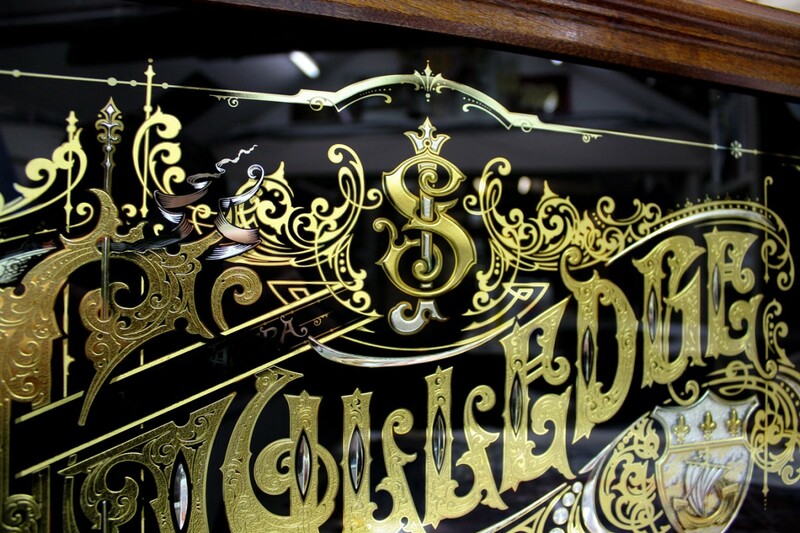 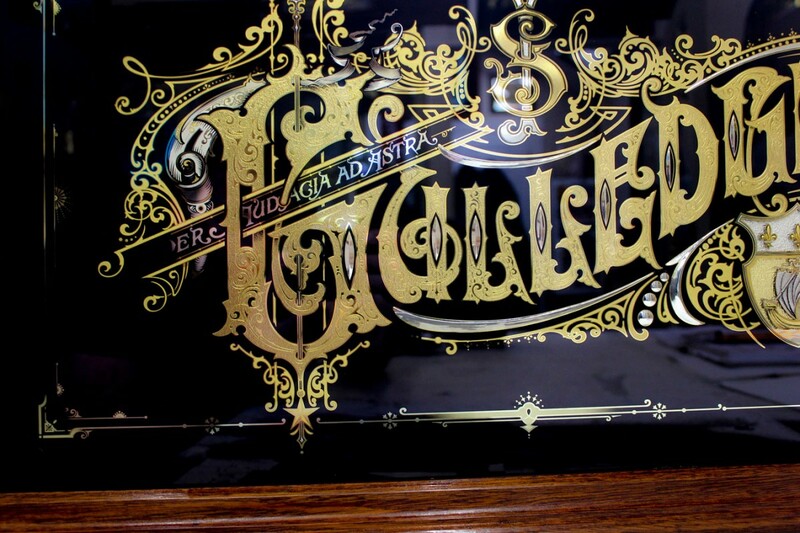 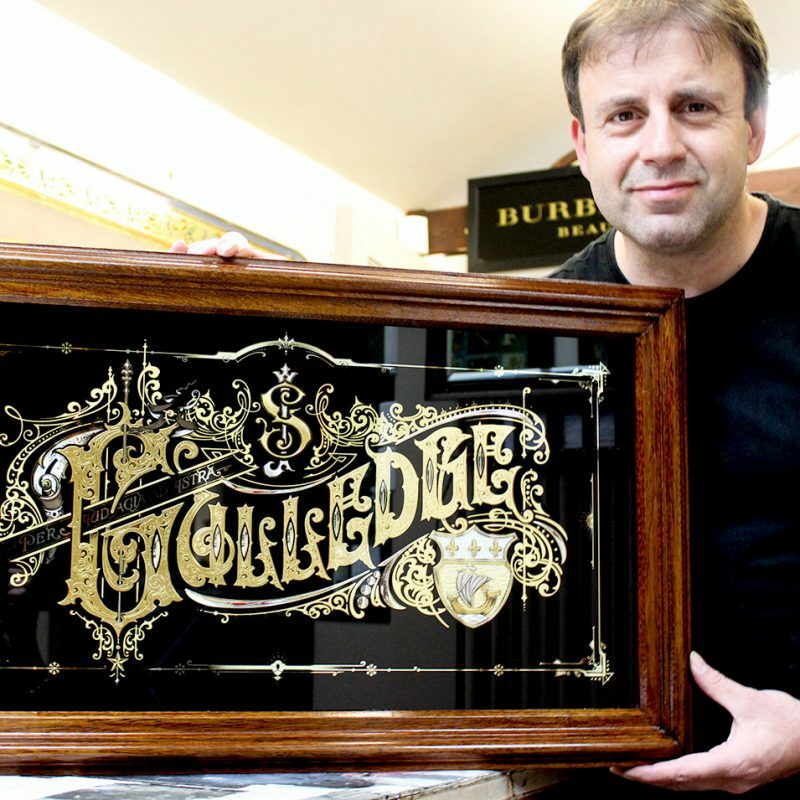 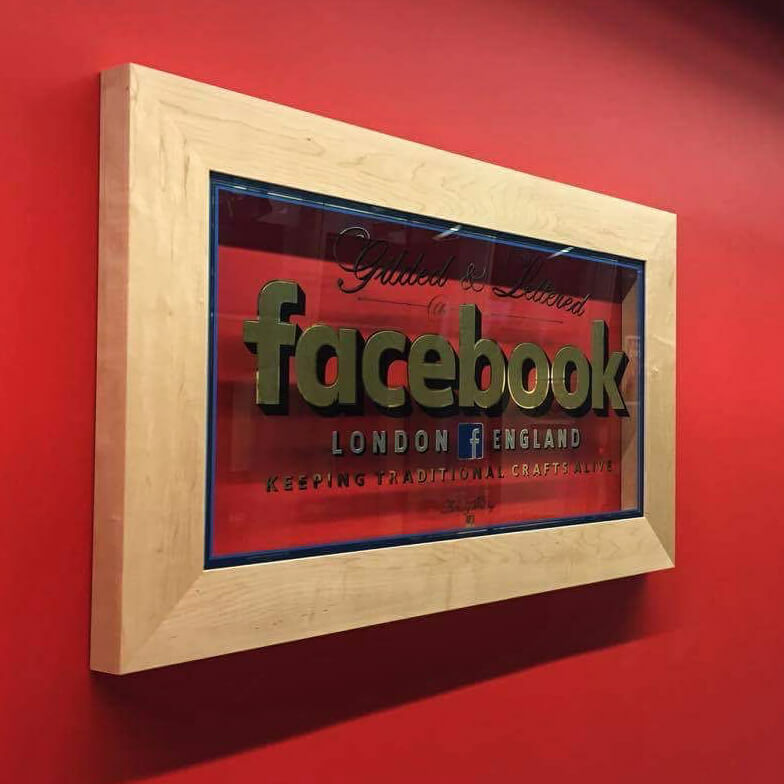 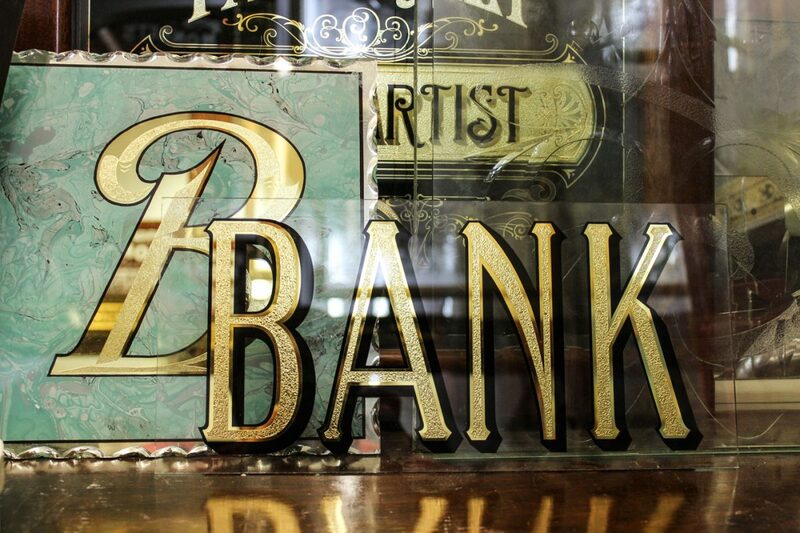 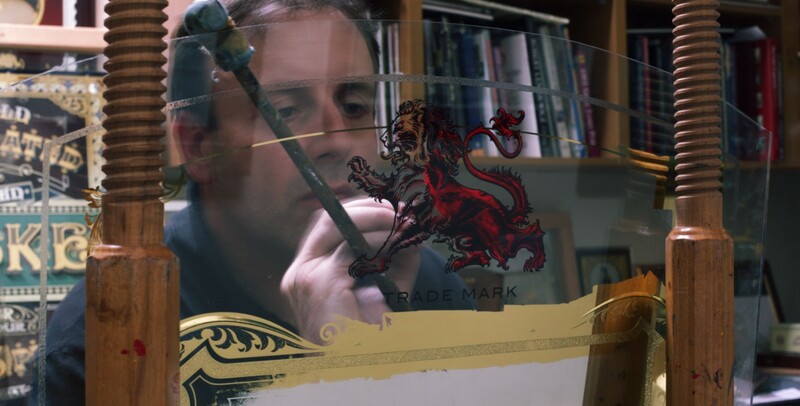 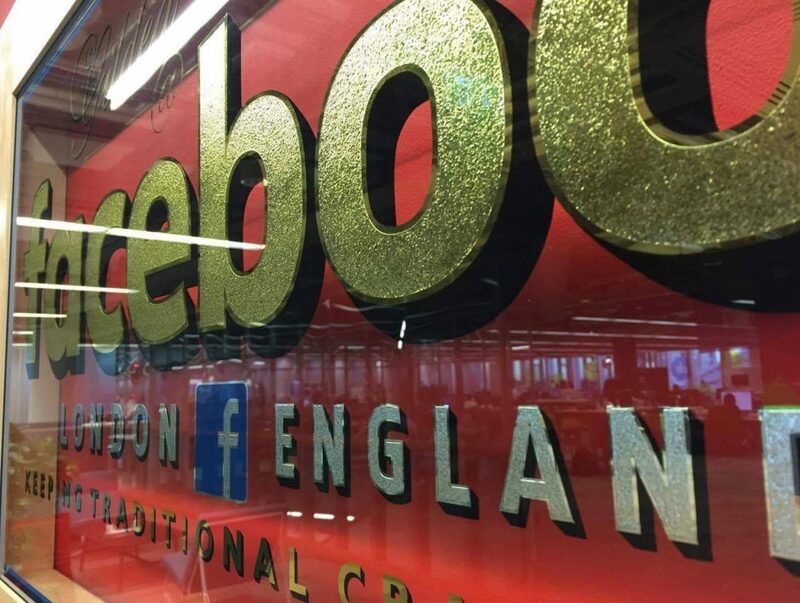 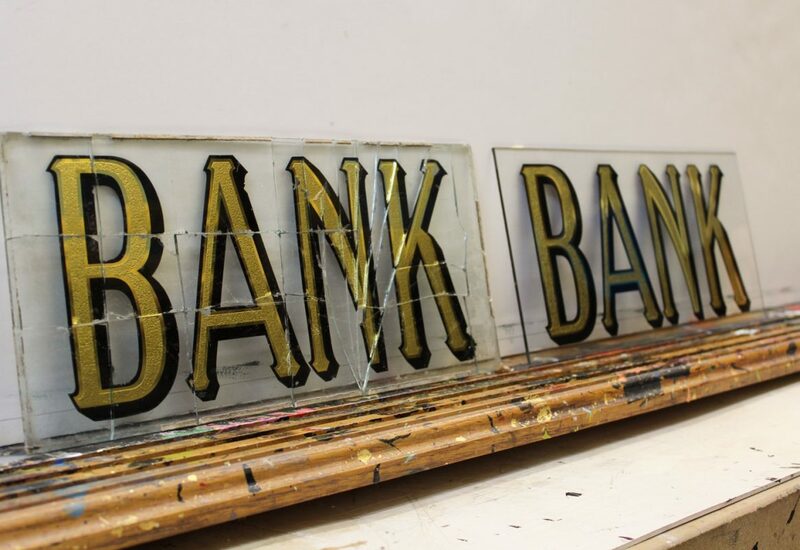 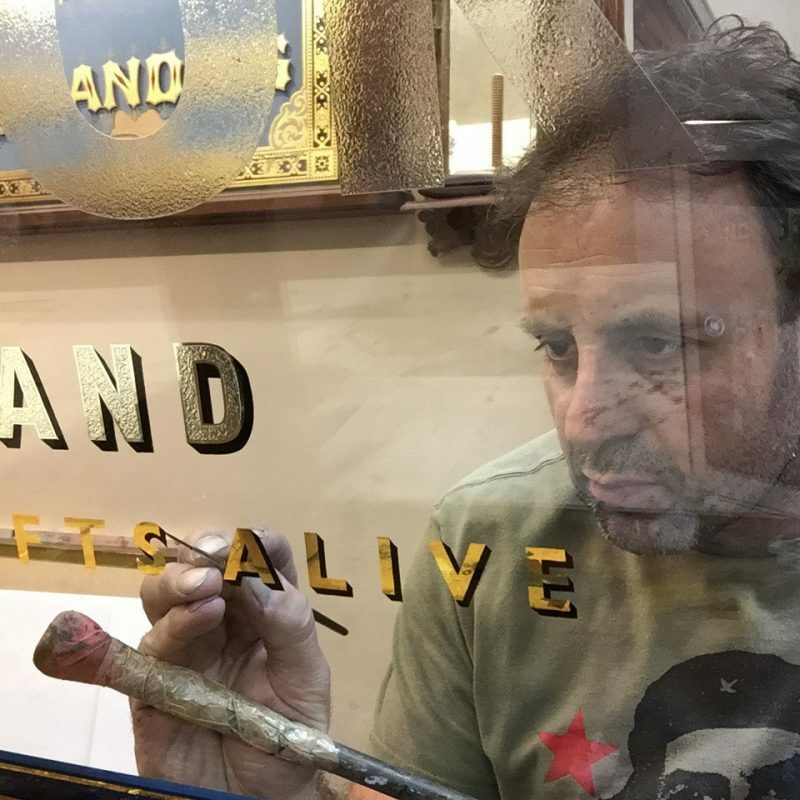 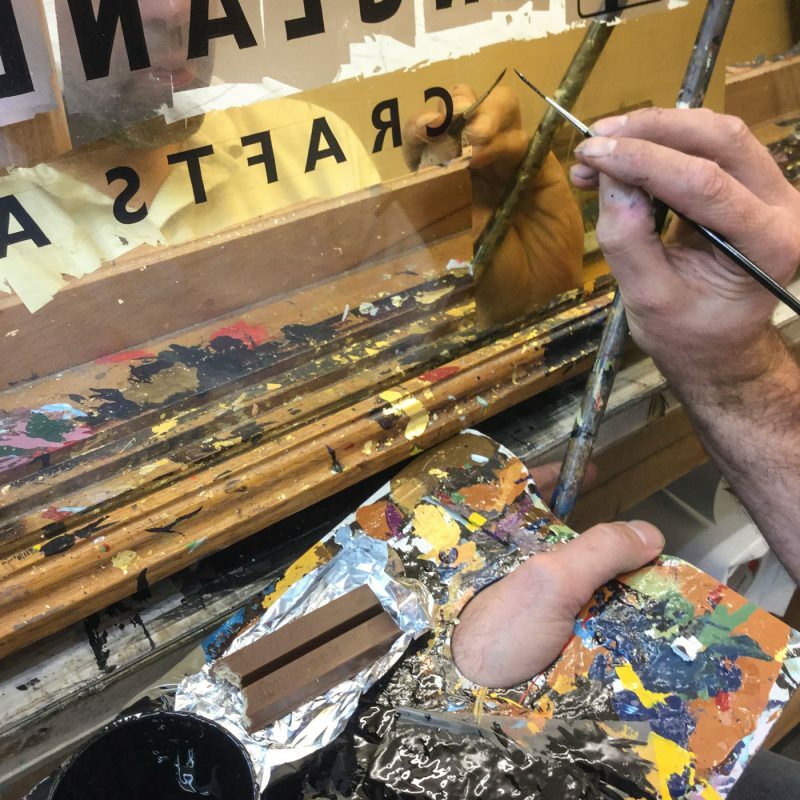 This reverse glass sign was hand painted and water gilded with the lettering acid etched. 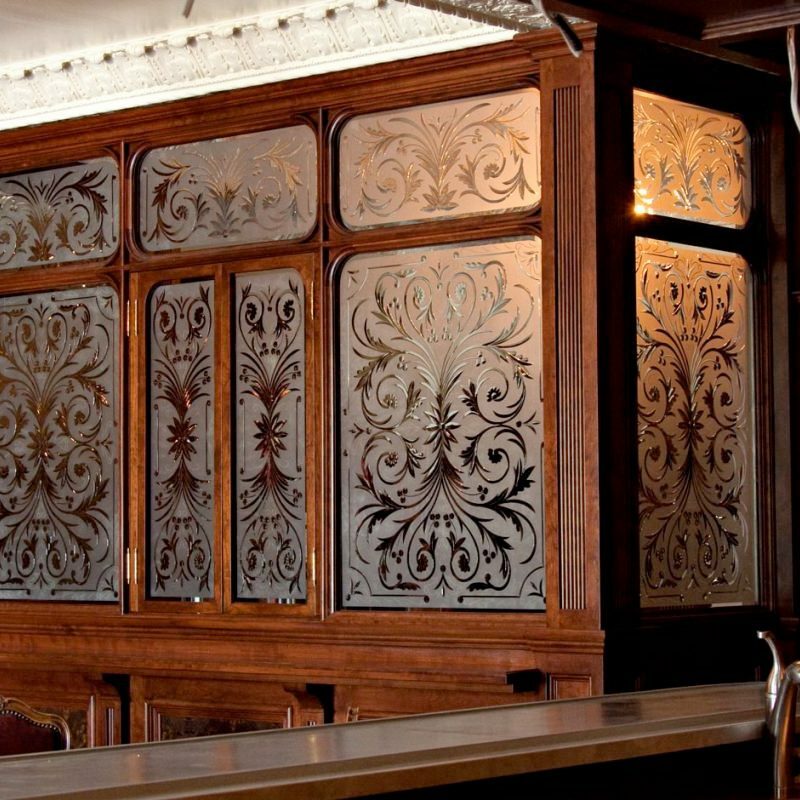 It was made to match an original 1900 broken panel. 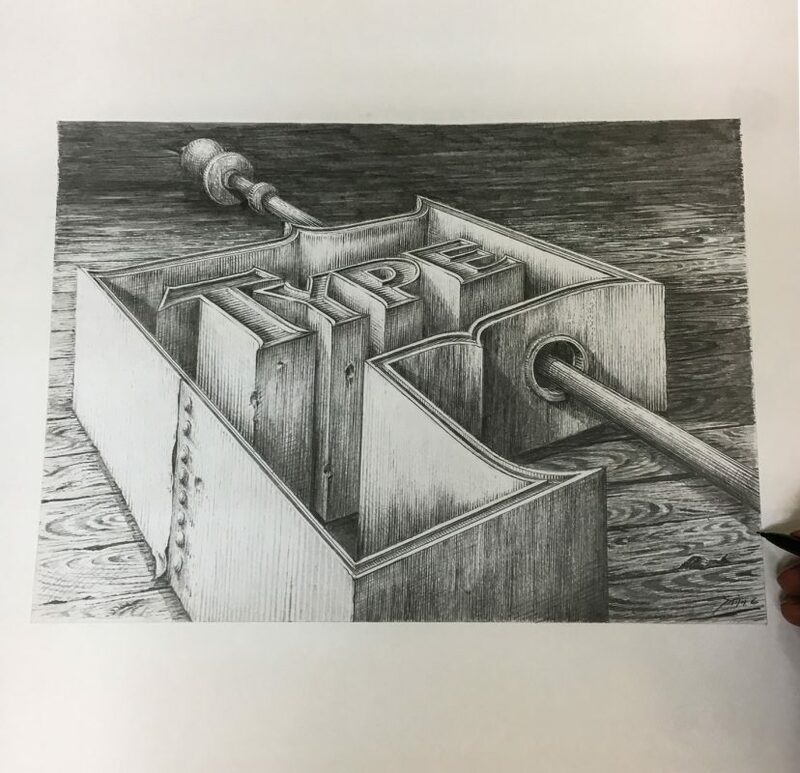 Hand drawn in pencil 2017. 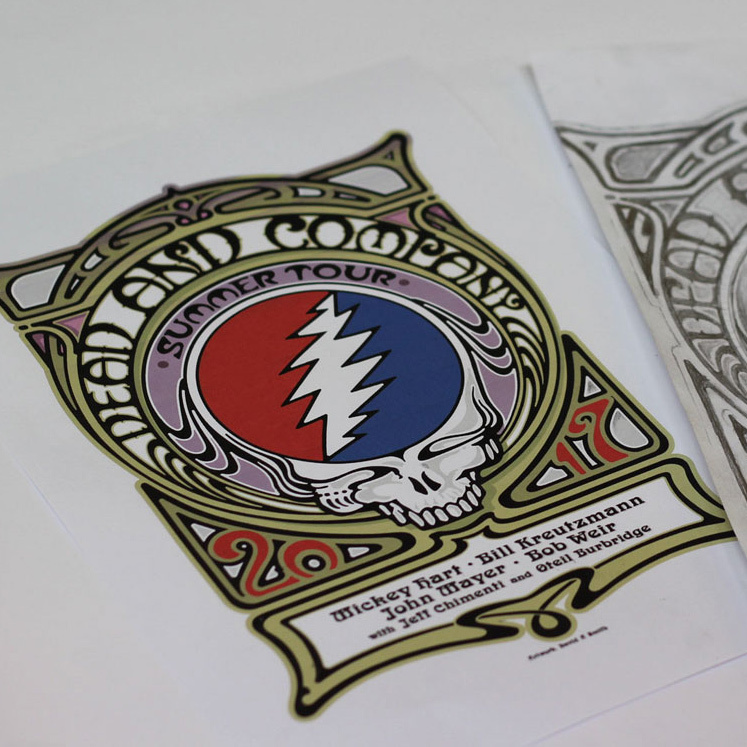 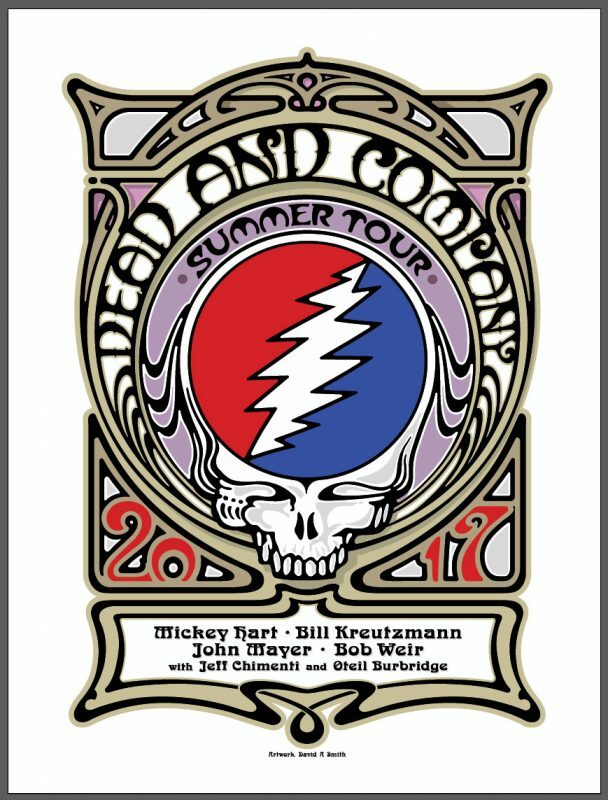 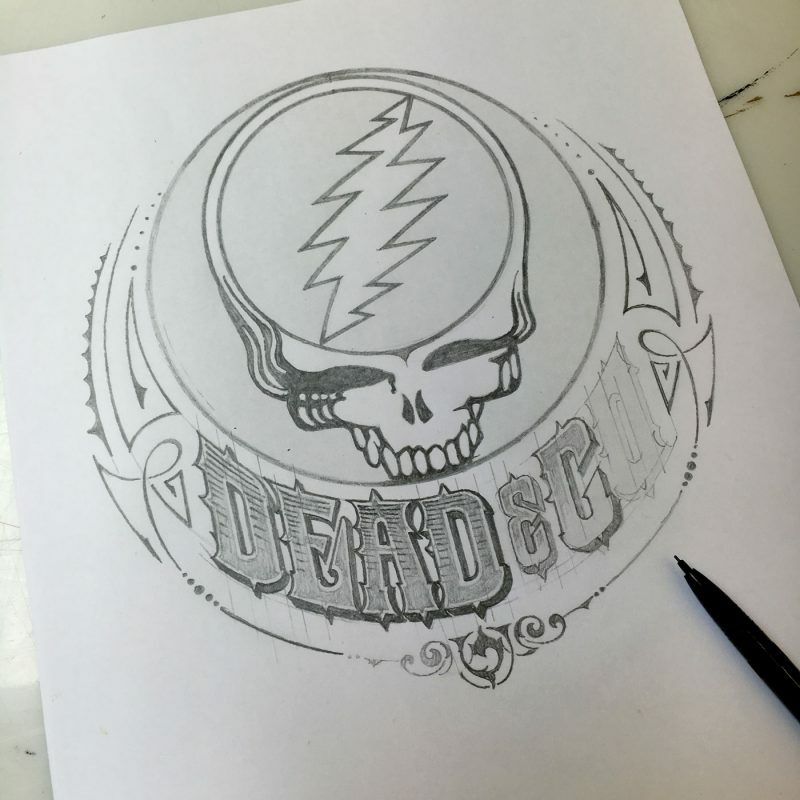 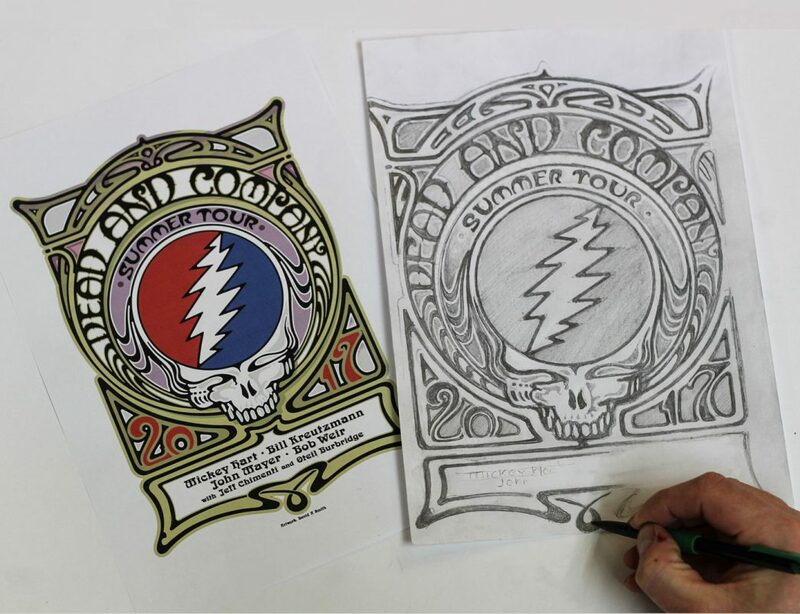 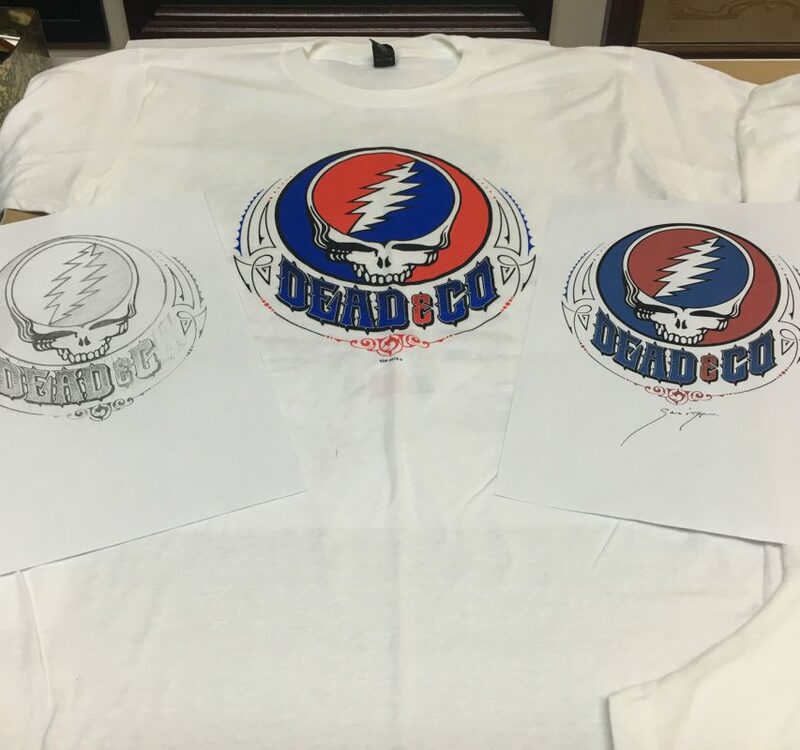 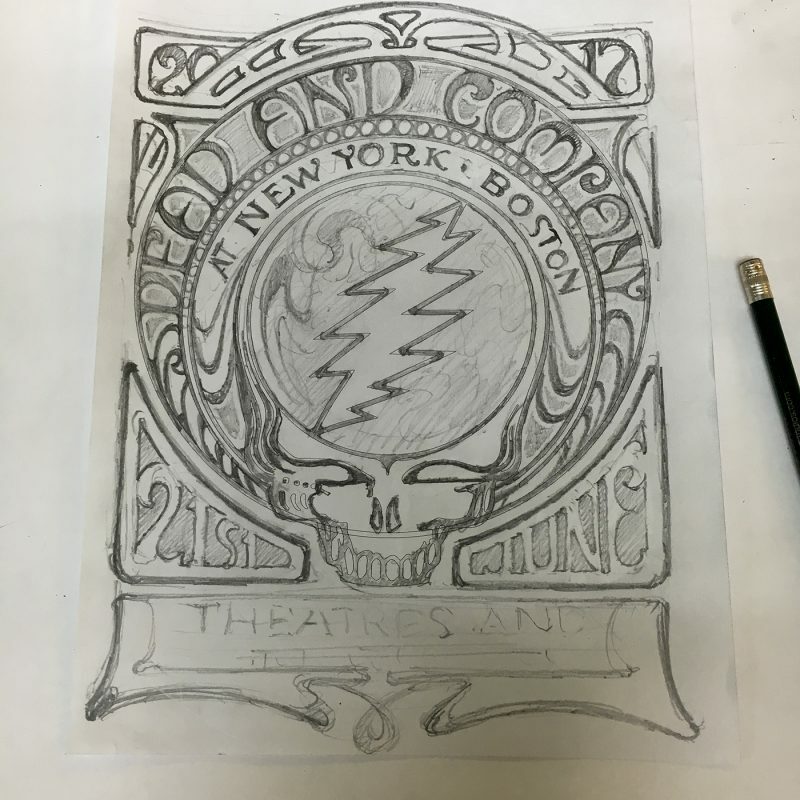 Various pieces of artwork / Merchandise that I have made for The American band Dead and Company. 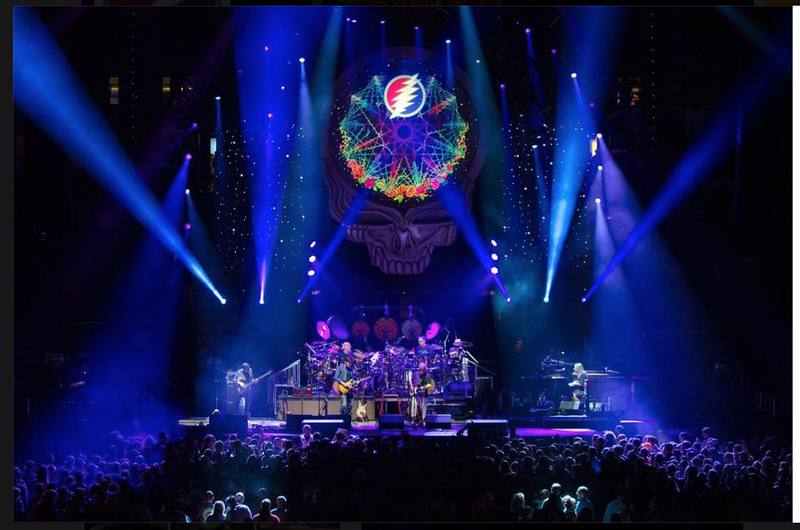 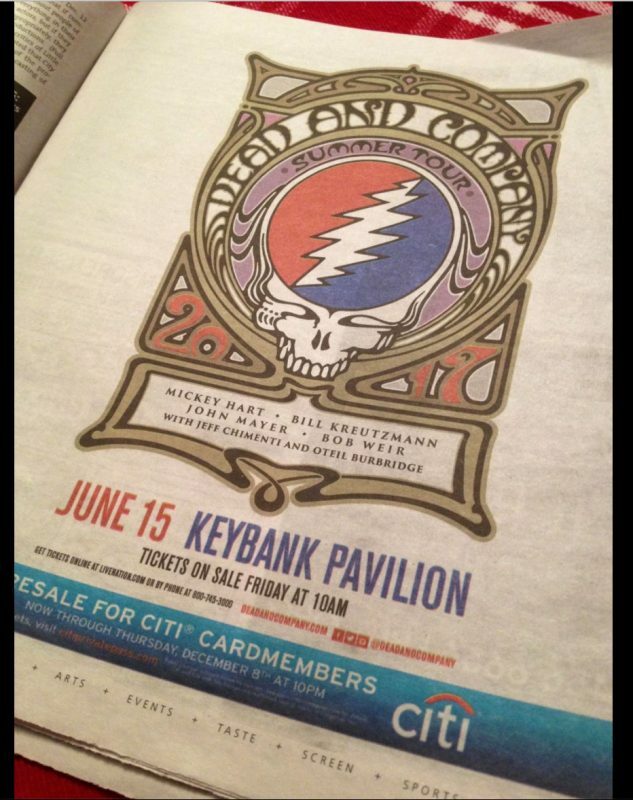 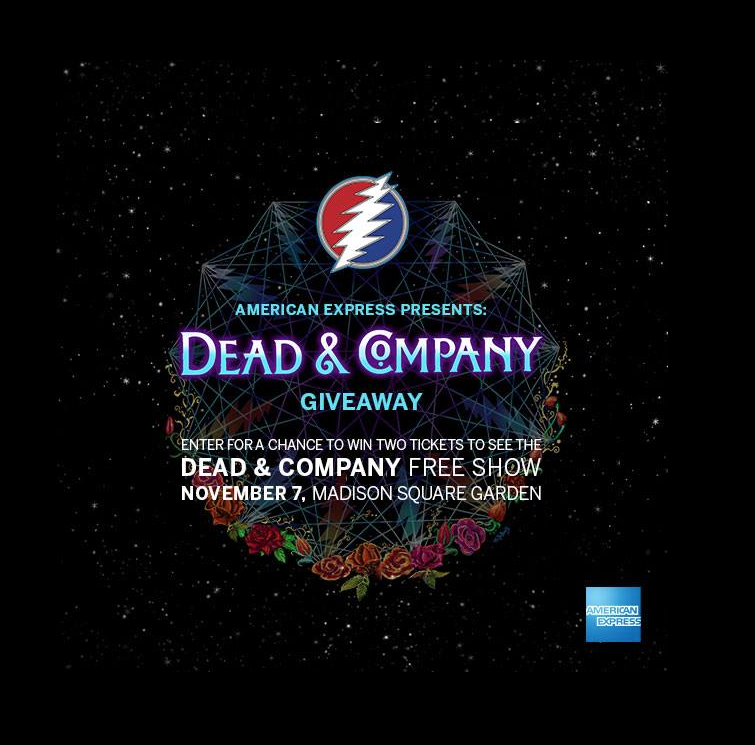 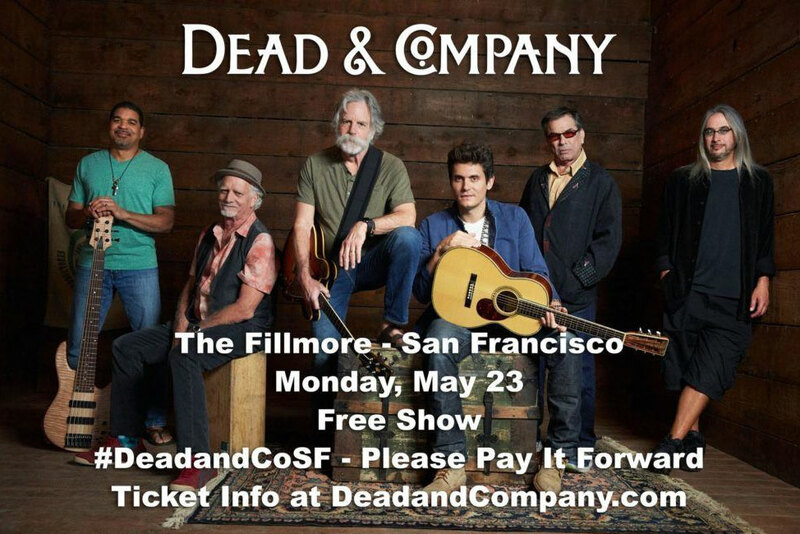 The band members consist of Mickey Hart, Bill Kreutzmann ,John Mayer, Bob Weir, Jeff Chimenti and Otell Burbridge. 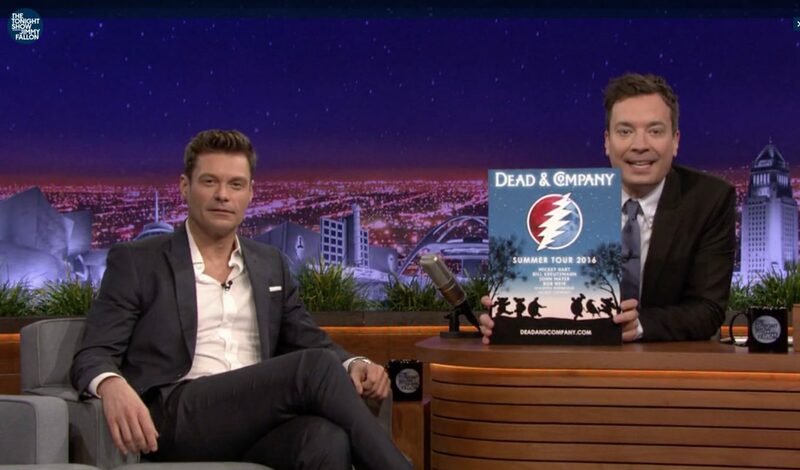 The lettering made it onto the Vinyl on The Jimmy Fallon Show. 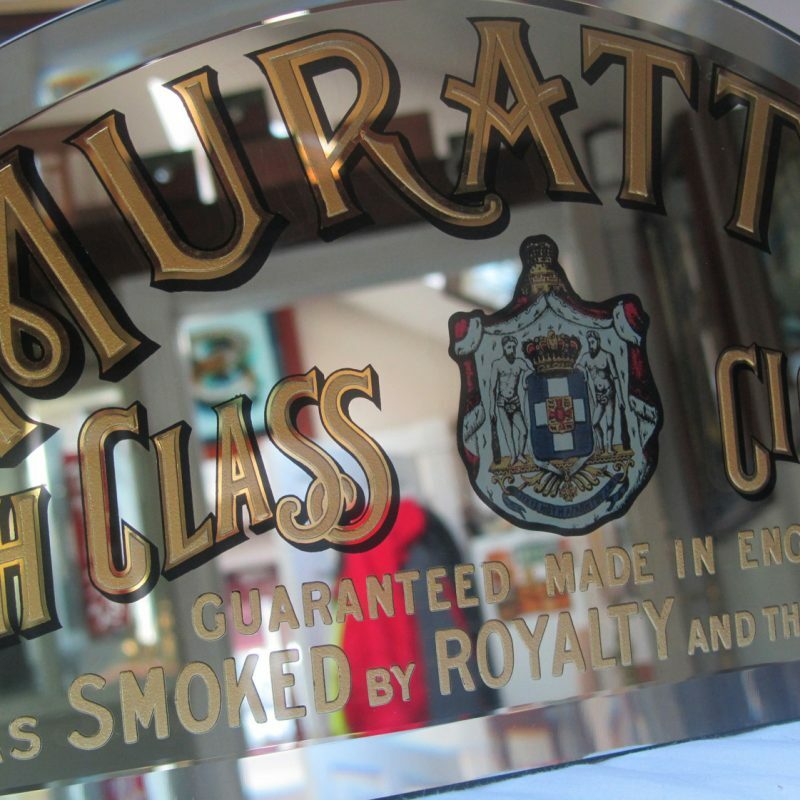 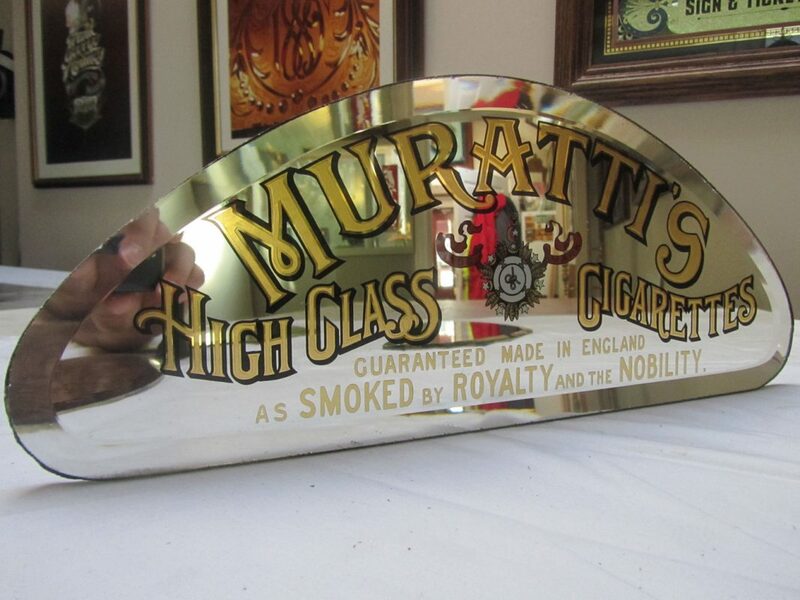 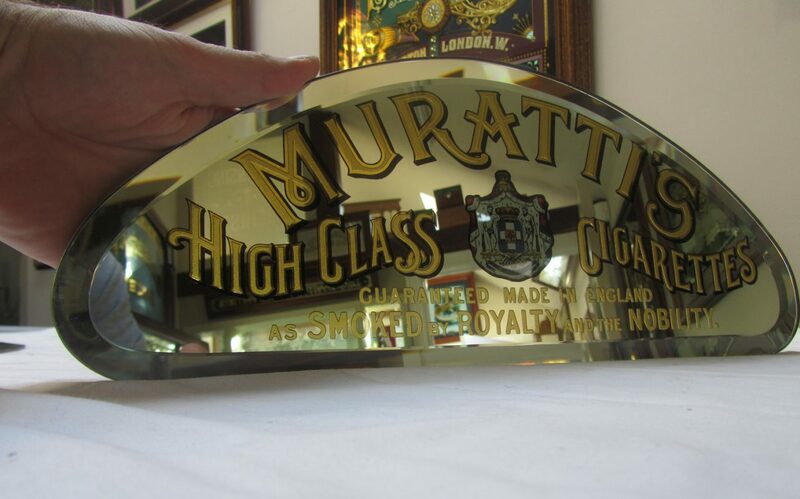 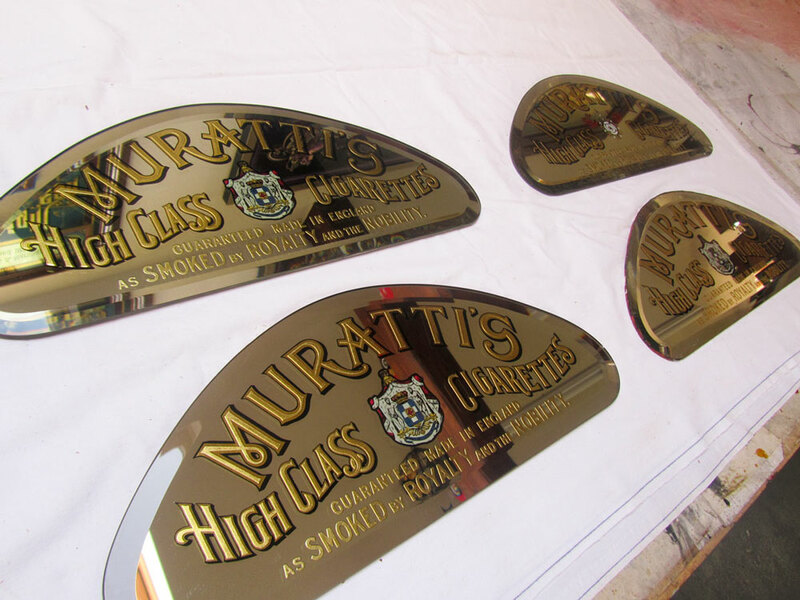 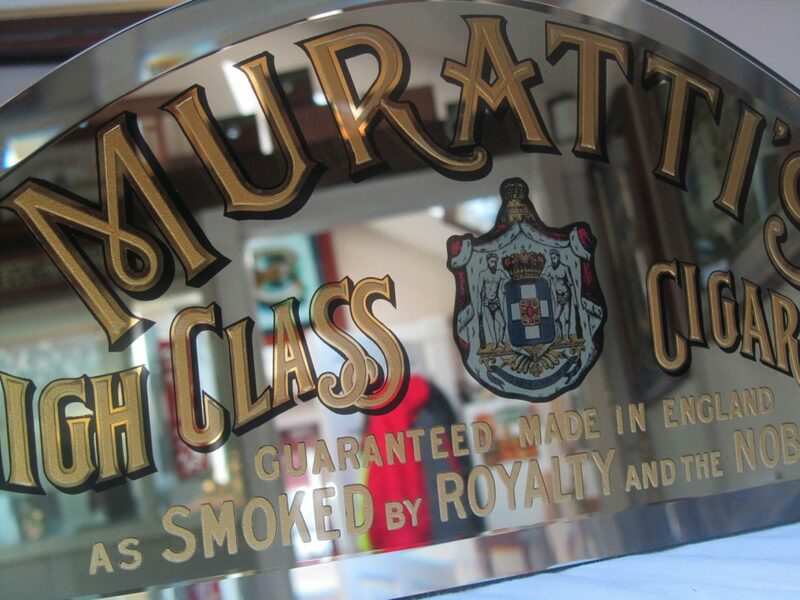 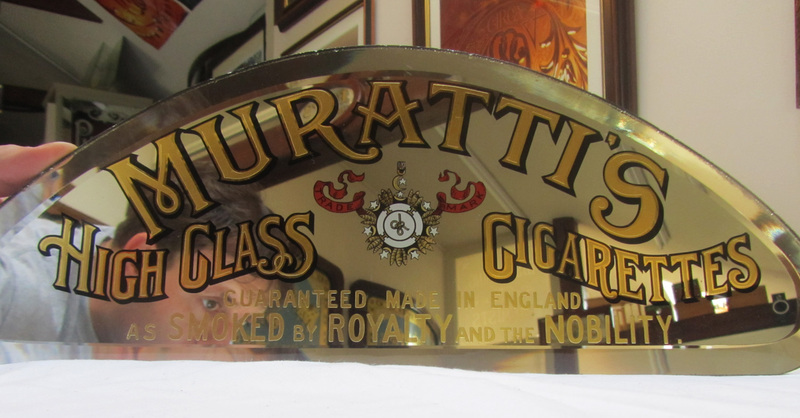 These small hand made glass signs were created in 2009 for a advertising collector of this old cigarette brand. 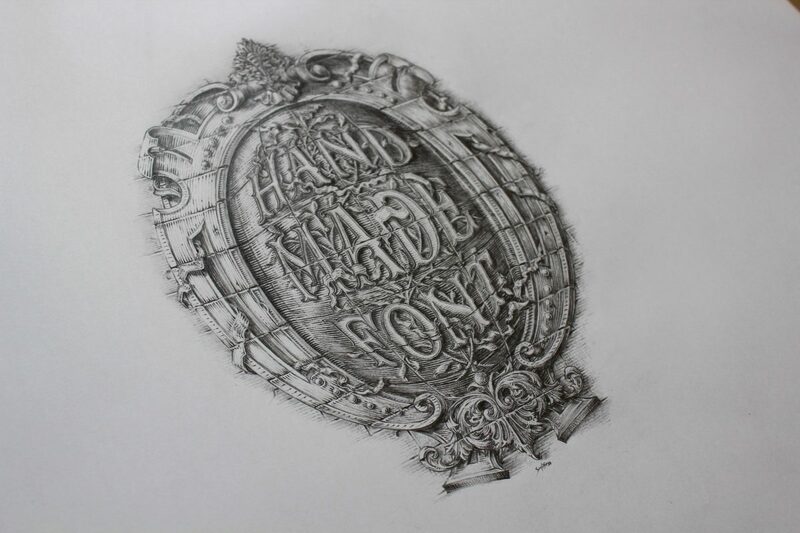 Hand drawn pencil sketch made in 2014 for Russell Manley of the famous hair salon Ludlow and Blunt based in New York and Brooklyn, USA. 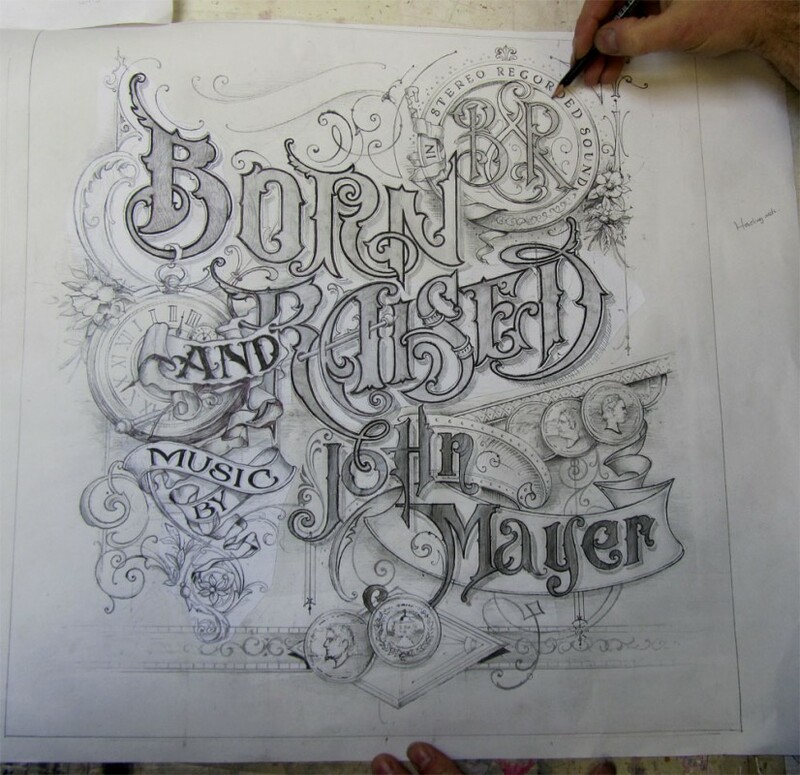 I was commissioned by Sony Music/columbia records, New York to design an album cover for John Mayer, the American pop and blues rock musician. 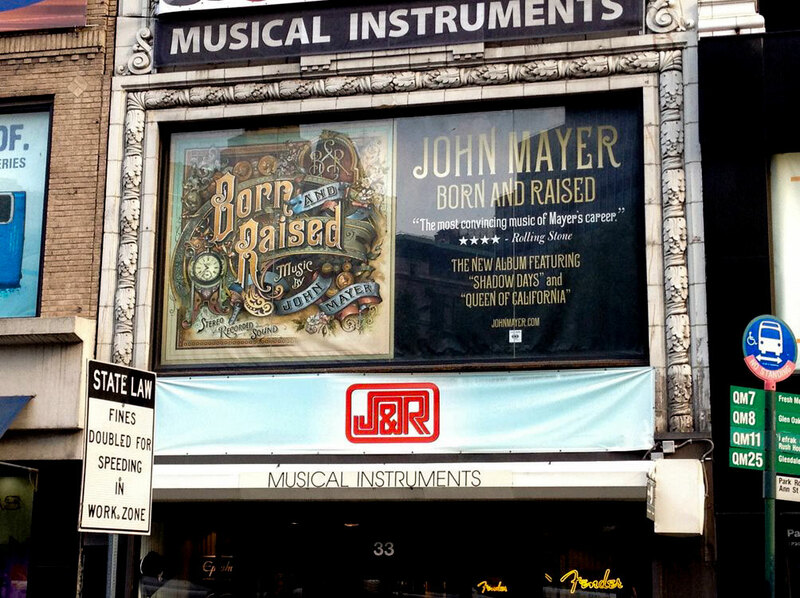 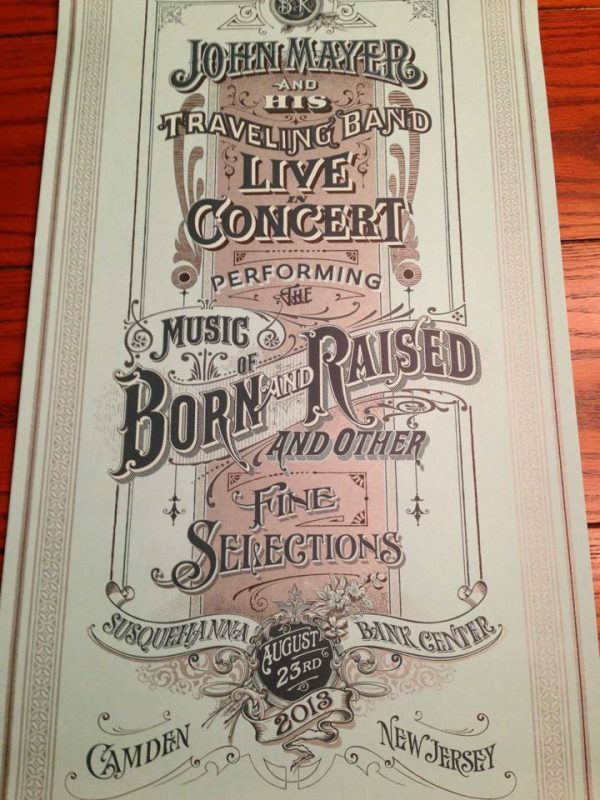 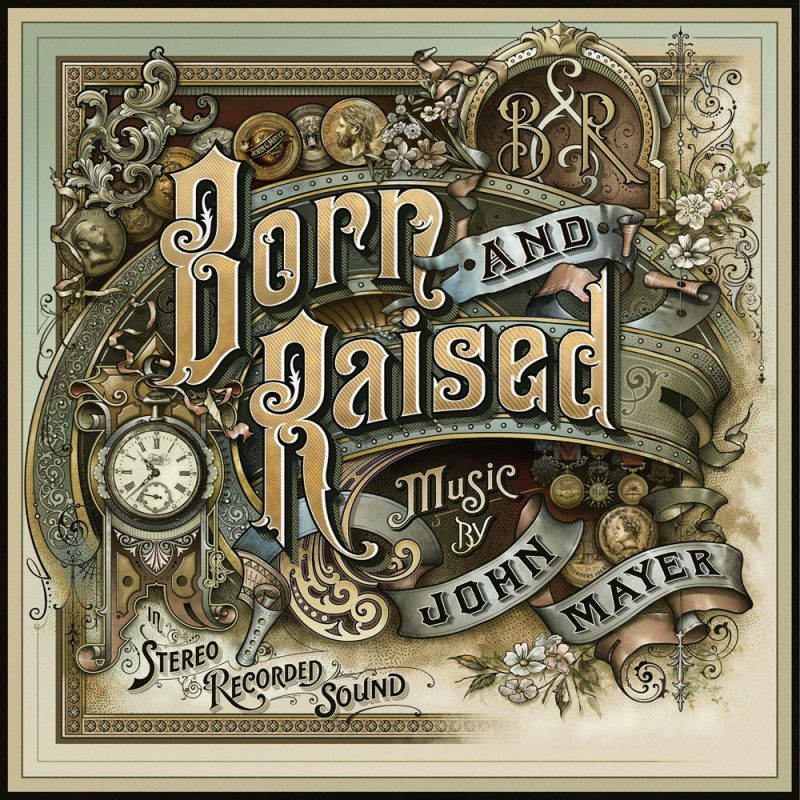 The album is called Born and Raised. 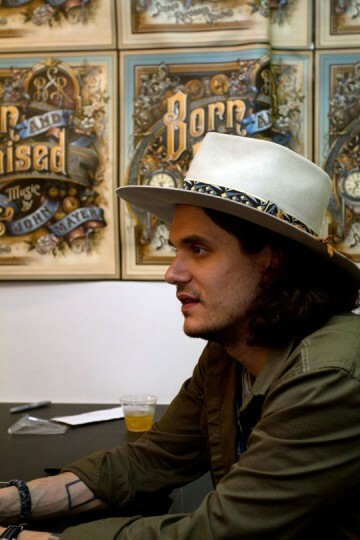 John as you know, is a singer-songwriter, recording artist and music producer. 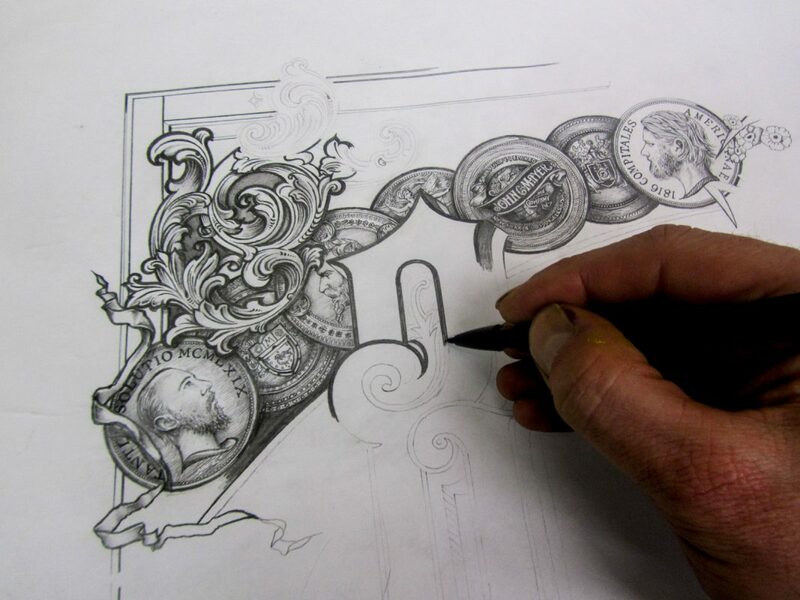 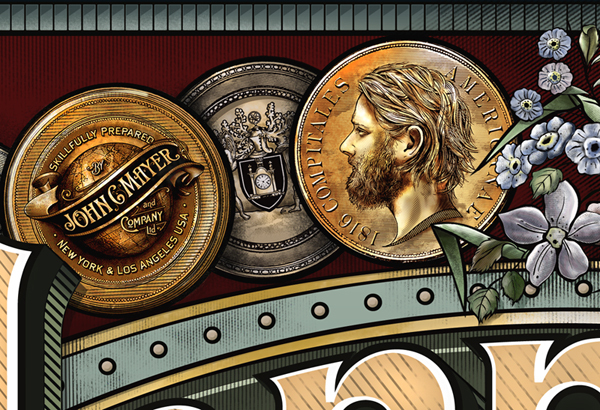 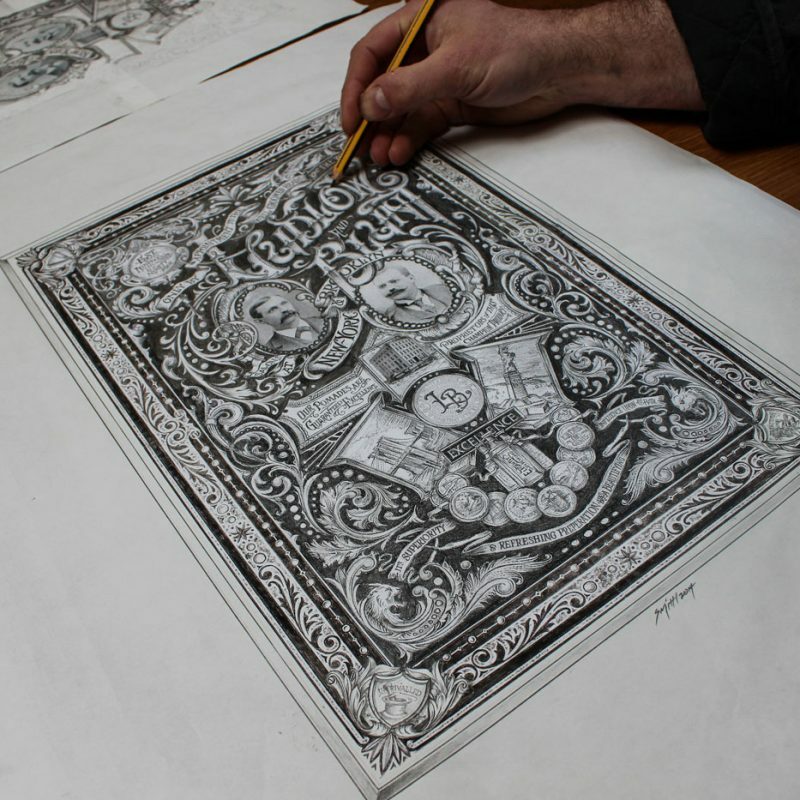 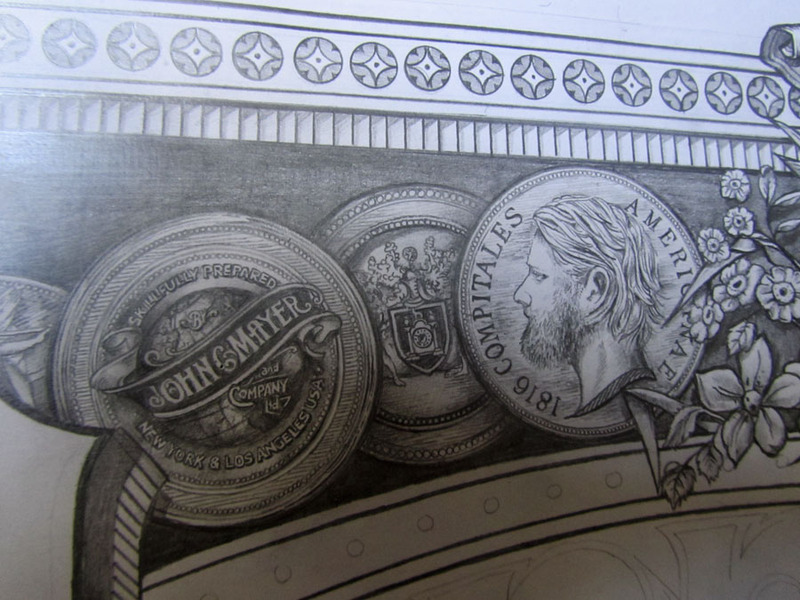 Working with John on the brief of the artwork, he asked me to include coins, watches, flowers, and ribbons. 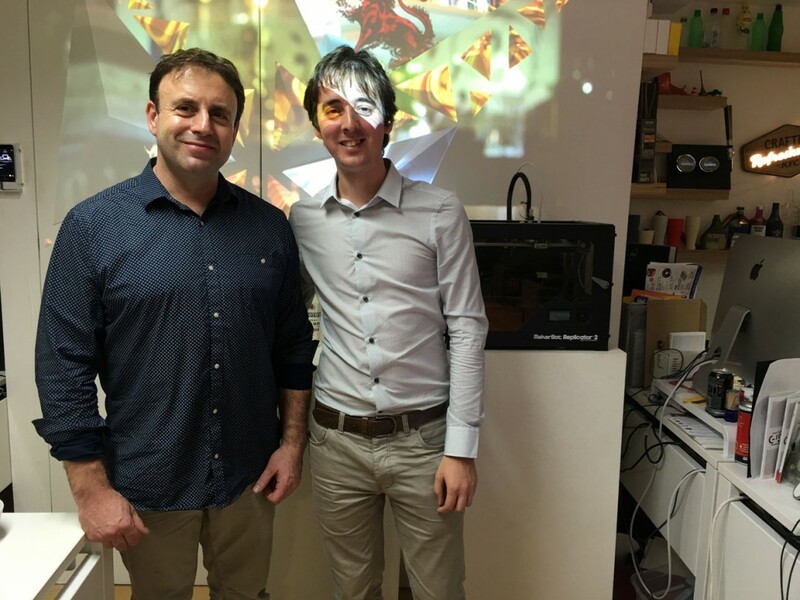 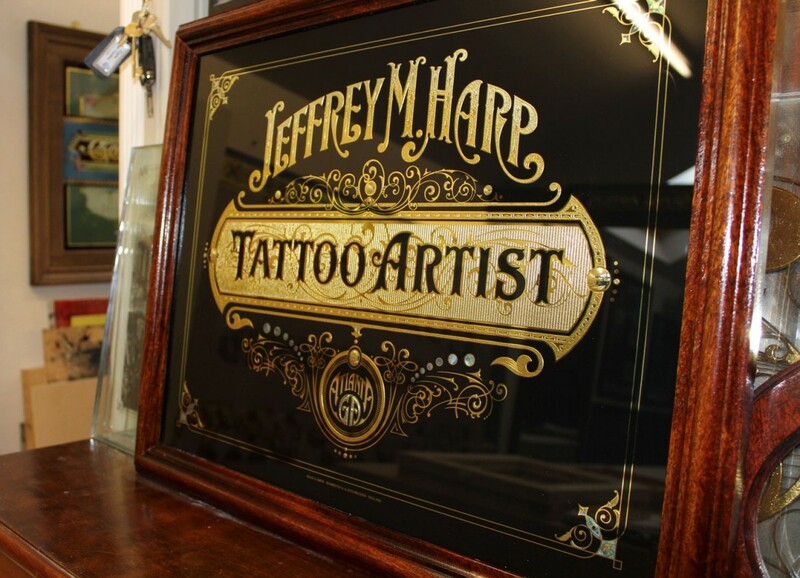 I had a great start because of his direction and experience in graphic design and knew this would go smoothly. 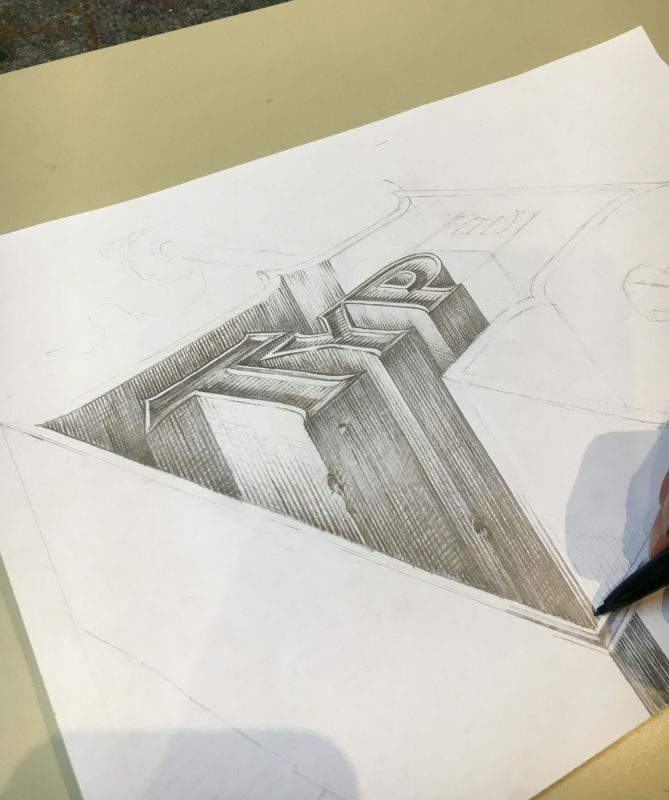 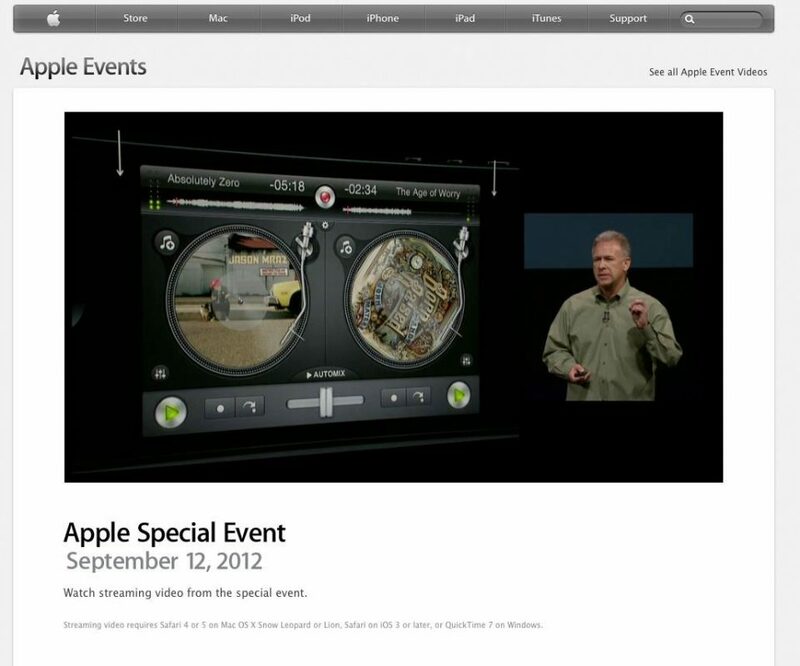 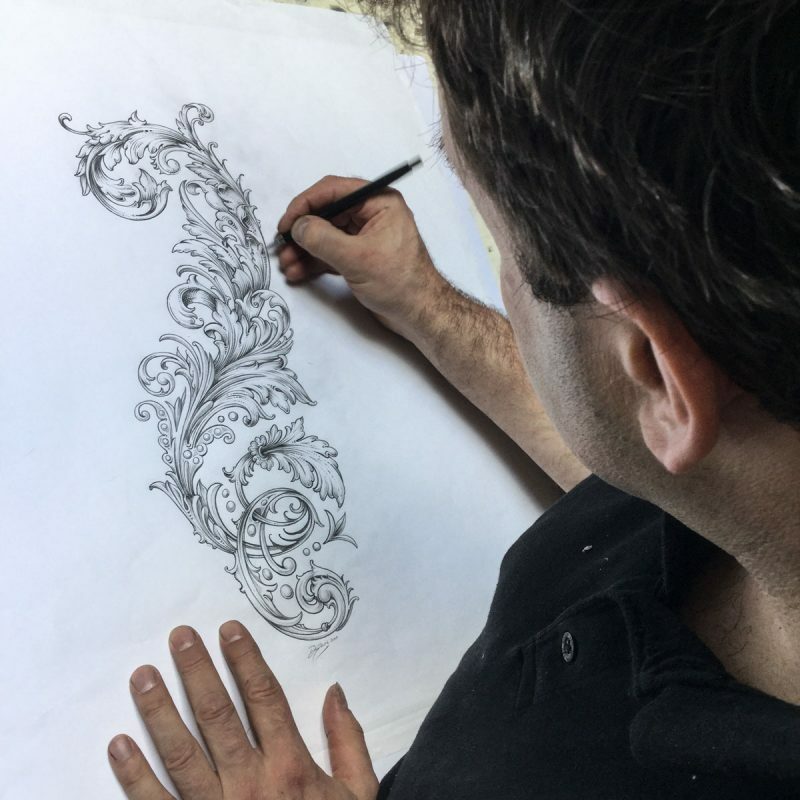 He also has a great eye for detail and design. 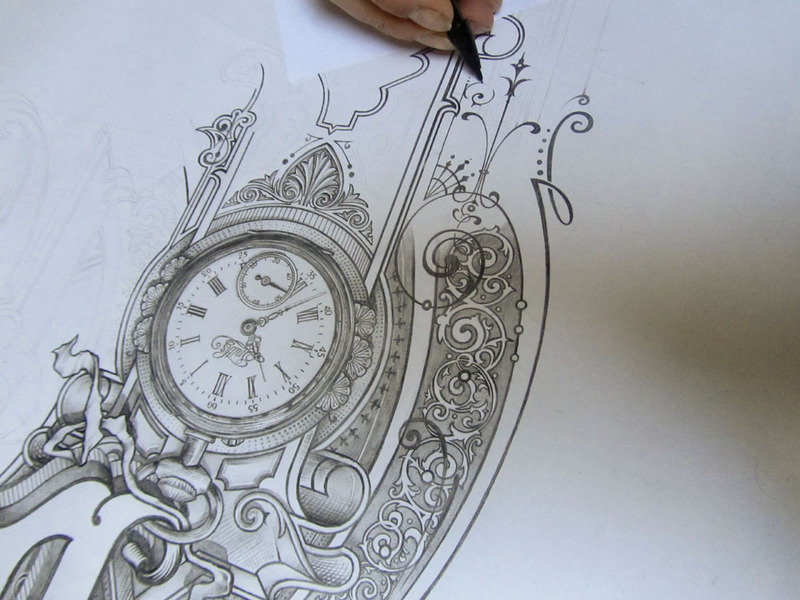 The artwork took roughly one month to complete, drawings were made separately in this time, but most of the artwork from Vectoring and finishing in Photoshop took just short of 28 days. 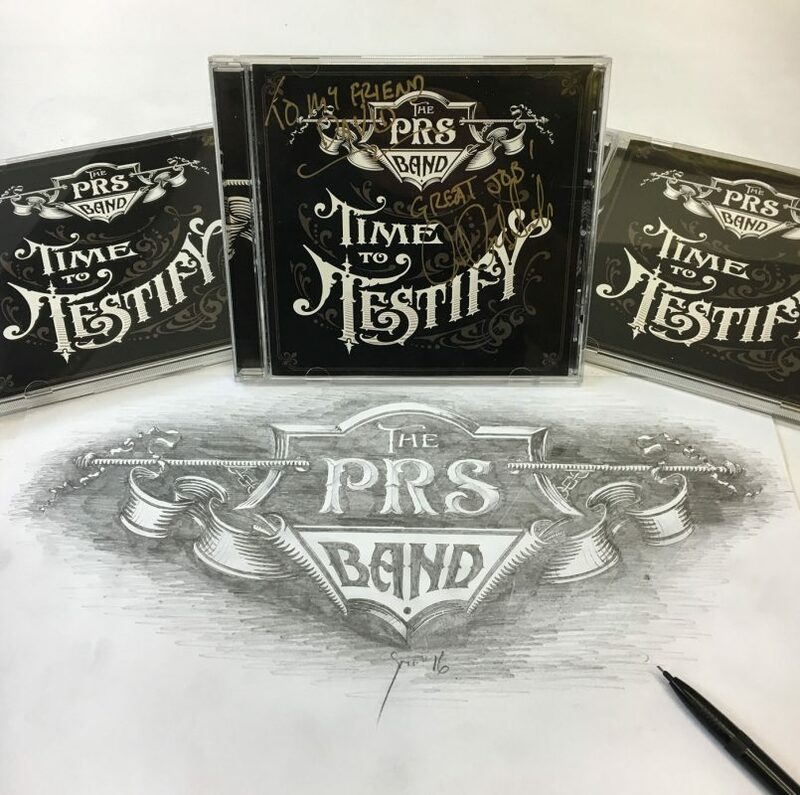 This has without a doubt been one of the most enjoyable projects I have been involved with due to the person I was working for. 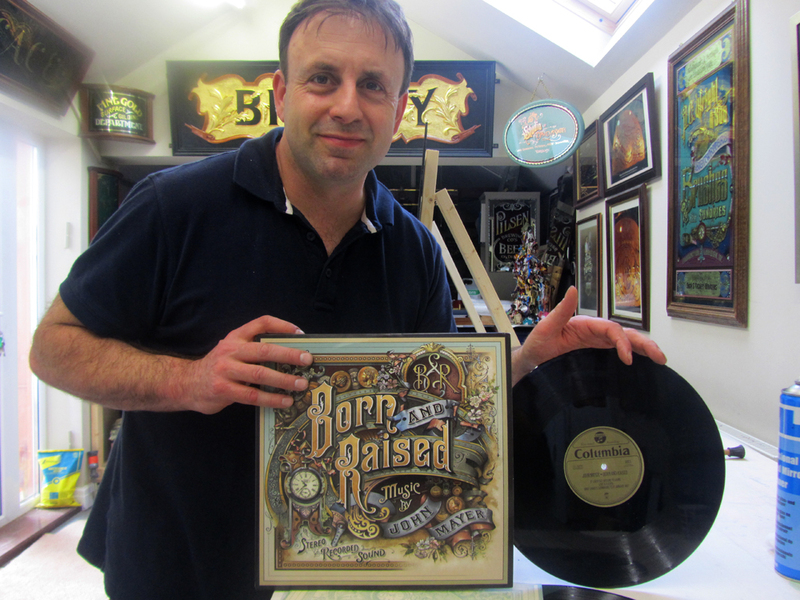 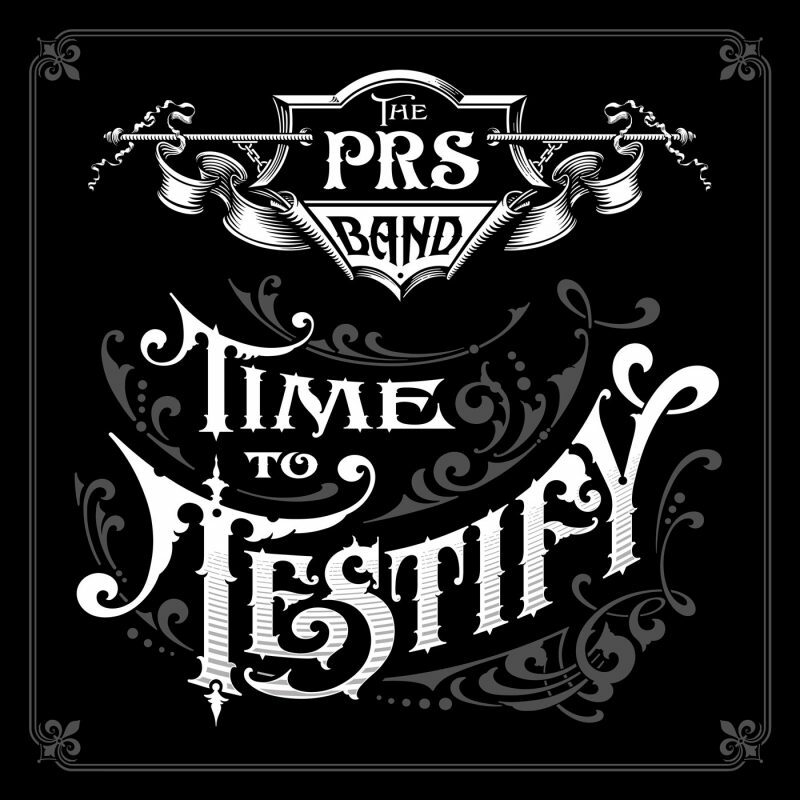 The album is out now on iTunes and has also been made as a traditional LP with full cover jacket and internal artwork. 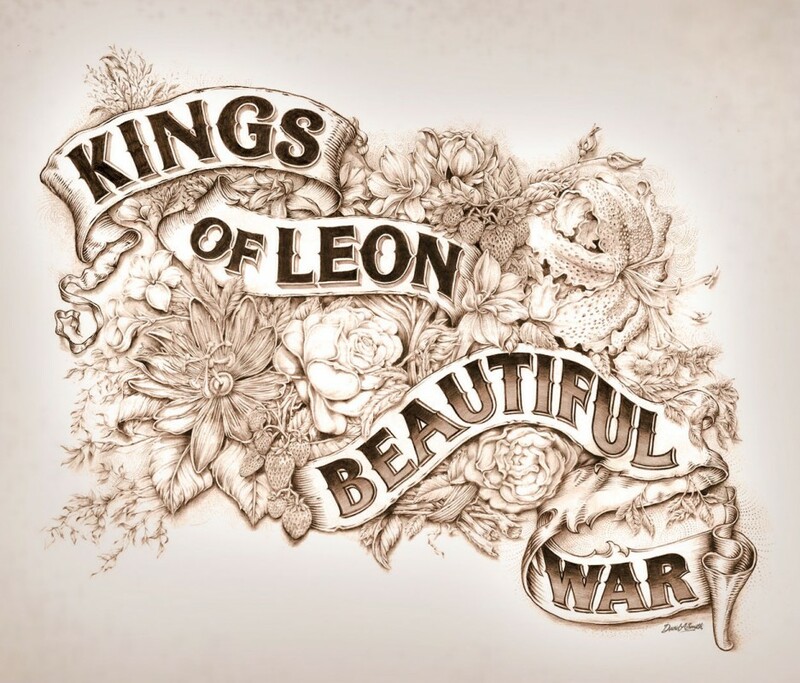 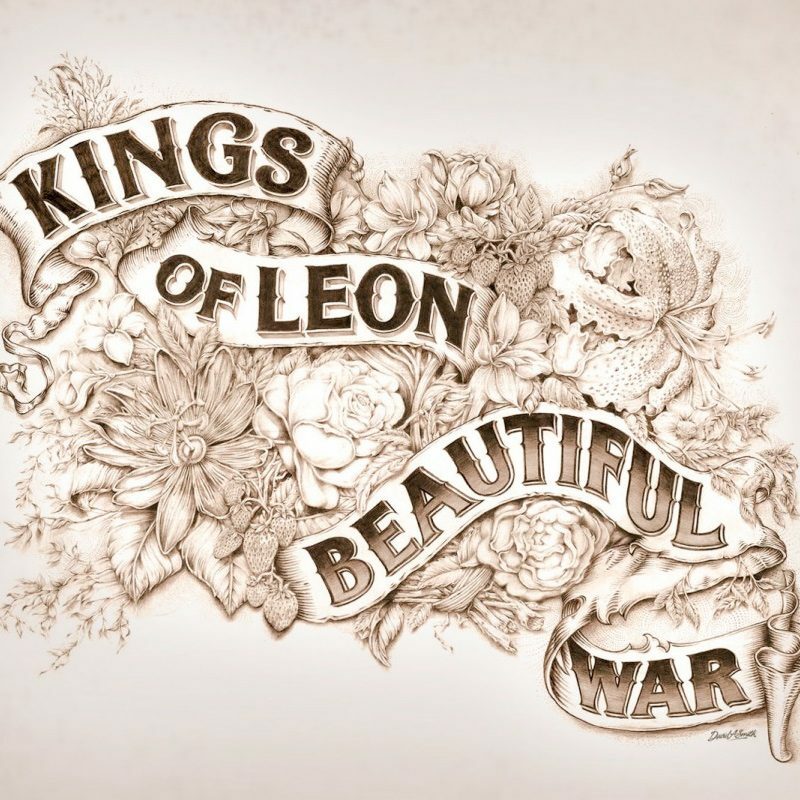 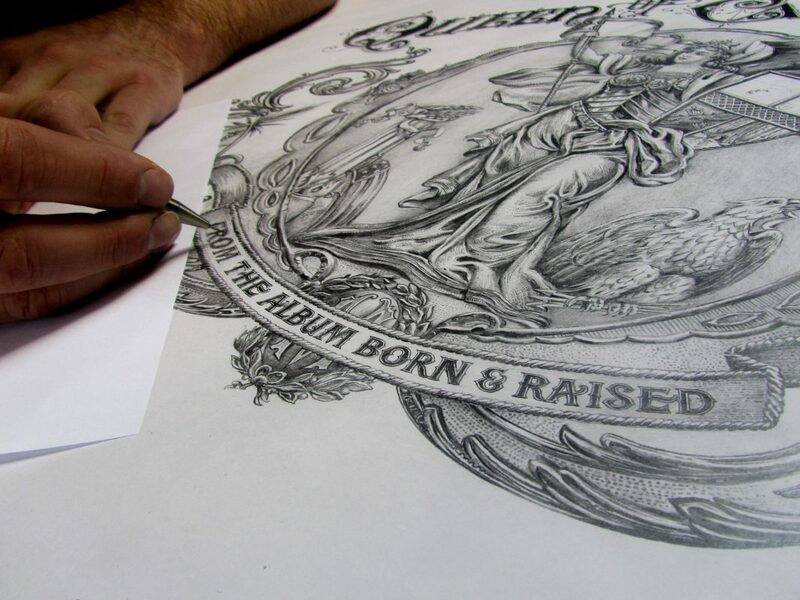 The work was commissioned by Sony Music and Columbia Records, New York at the beginning of 2012. 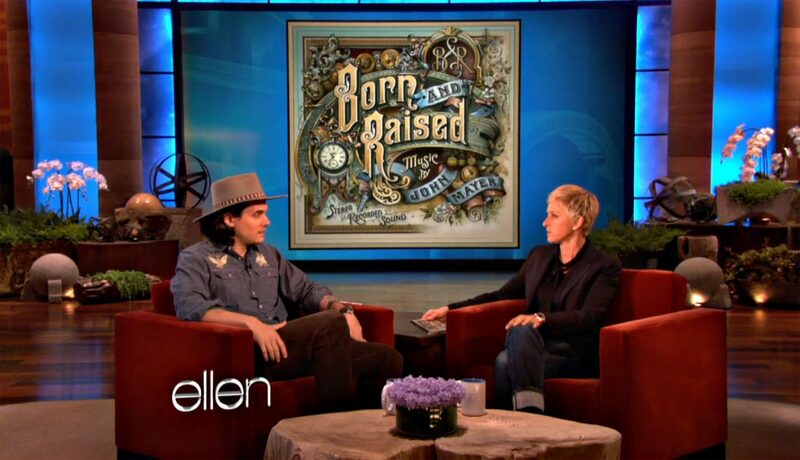 It appeared on the Ellen DeGeneres show on the 14th May 2012 in Chicago and David Letterman Show on the 17th May in New York 2012. and many more international shows. 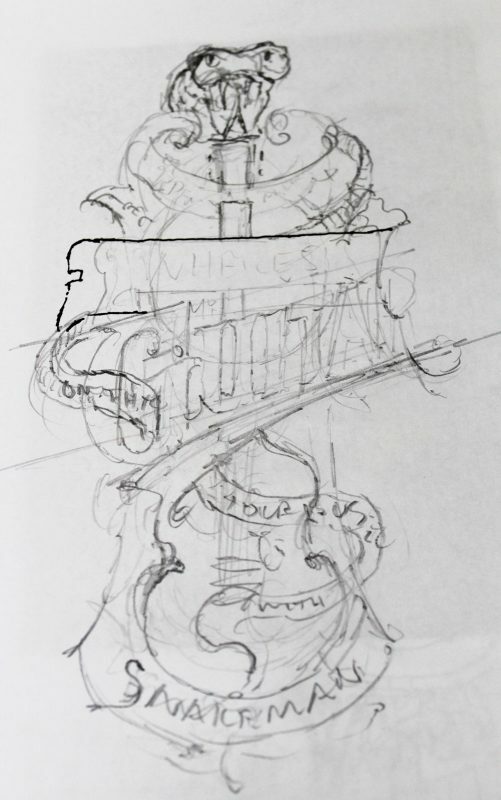 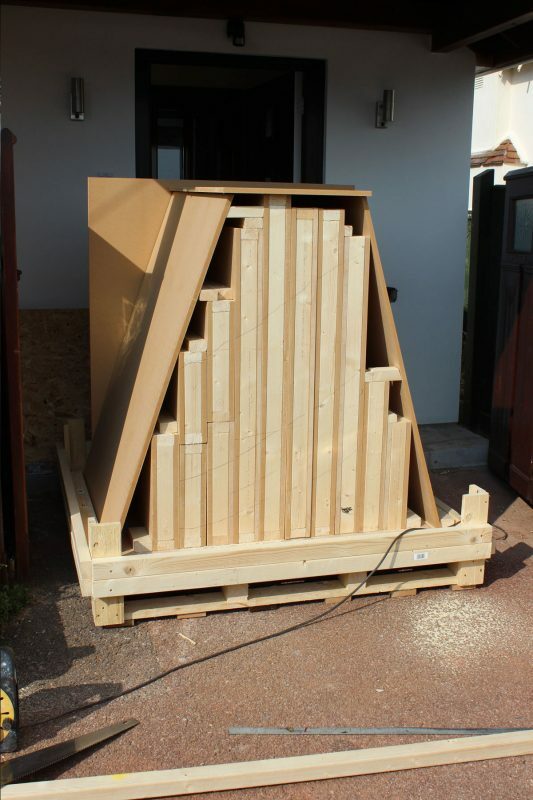 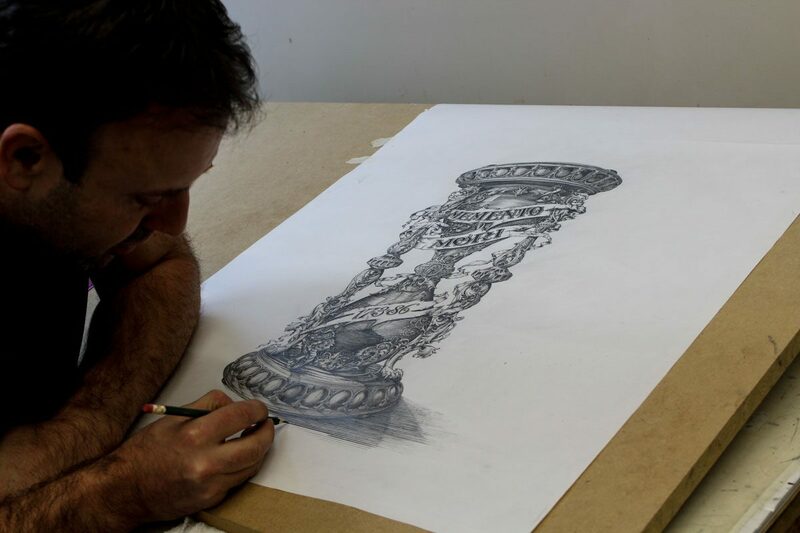 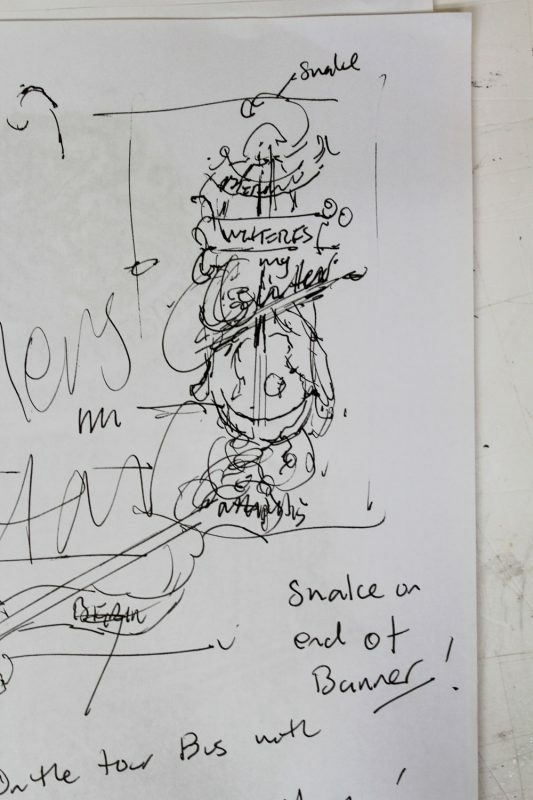 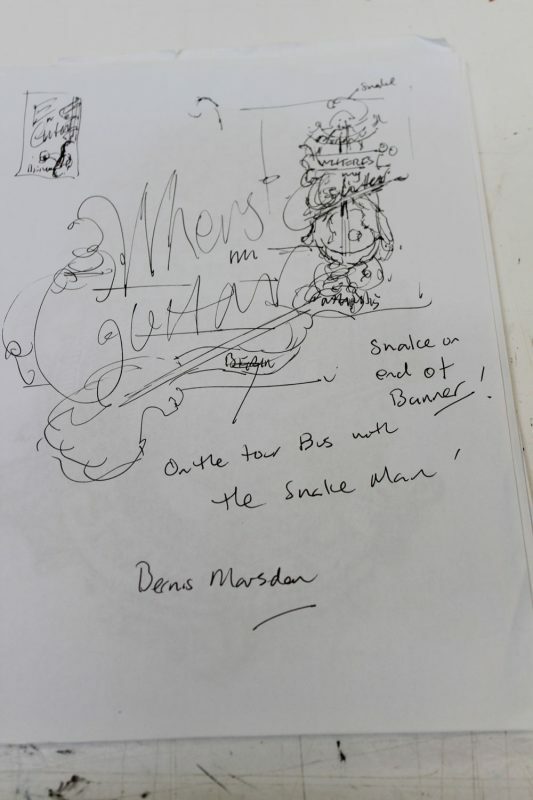 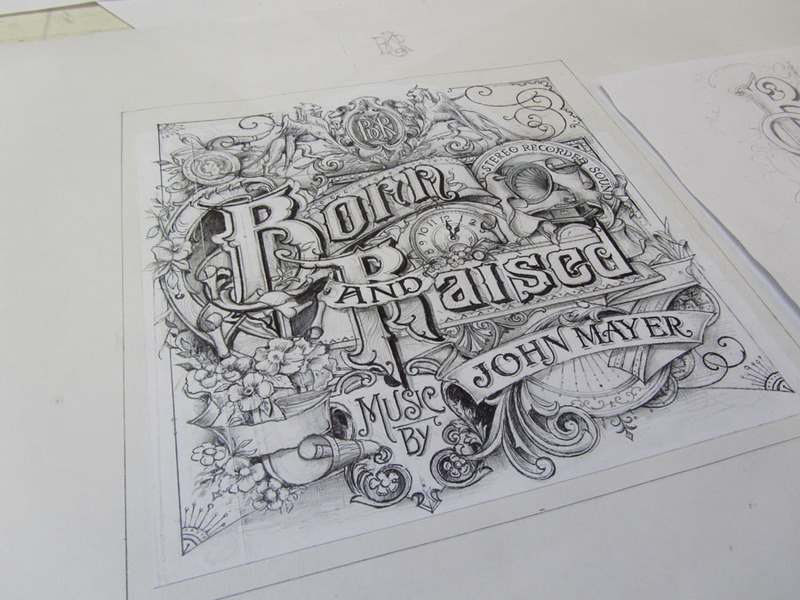 The images below show step by step artwork of the cover along with other ideas presented to John back in December 2011. 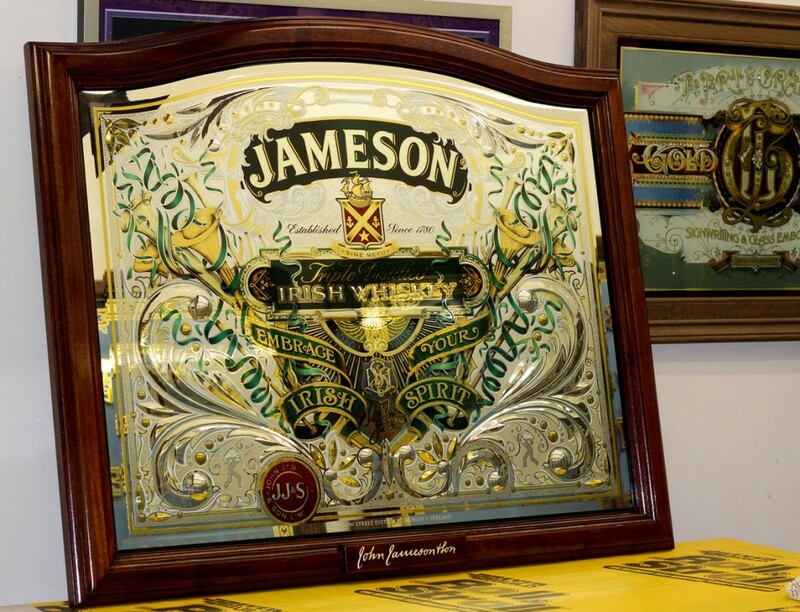 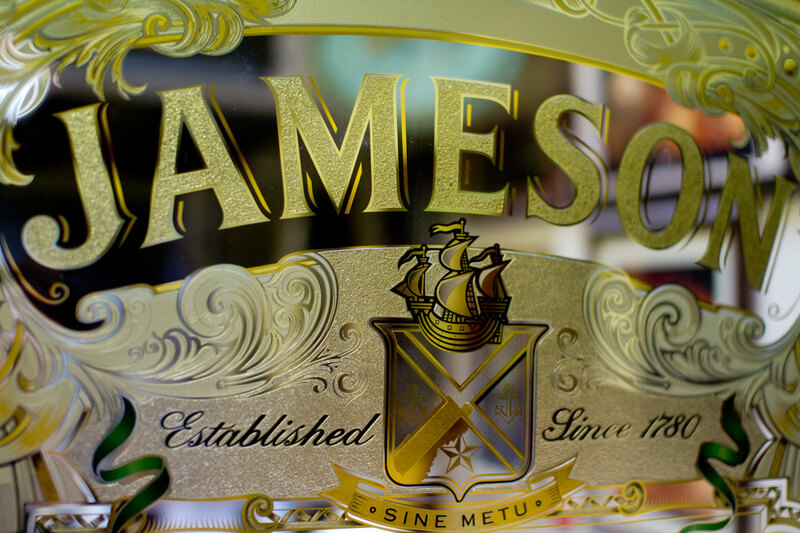 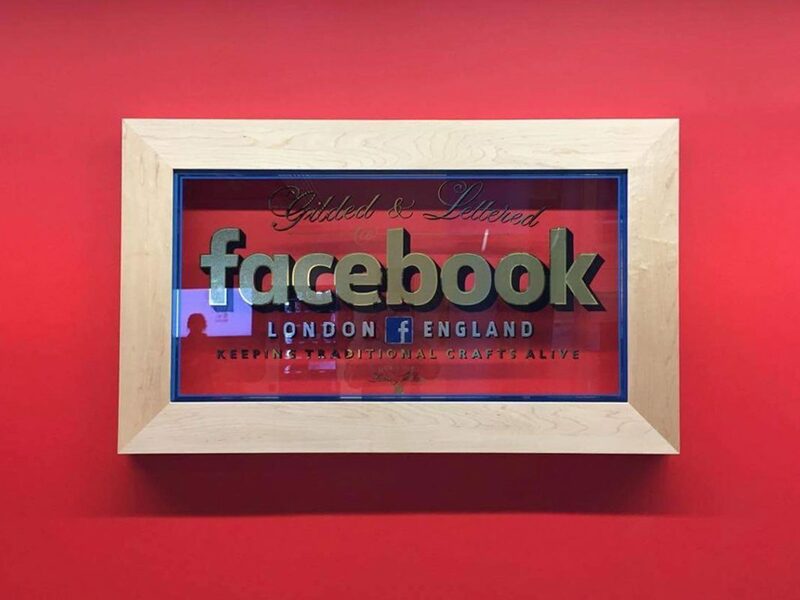 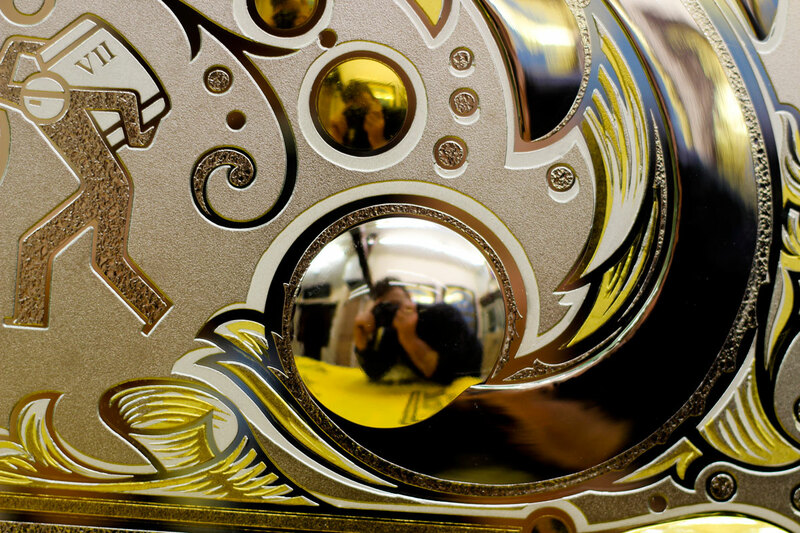 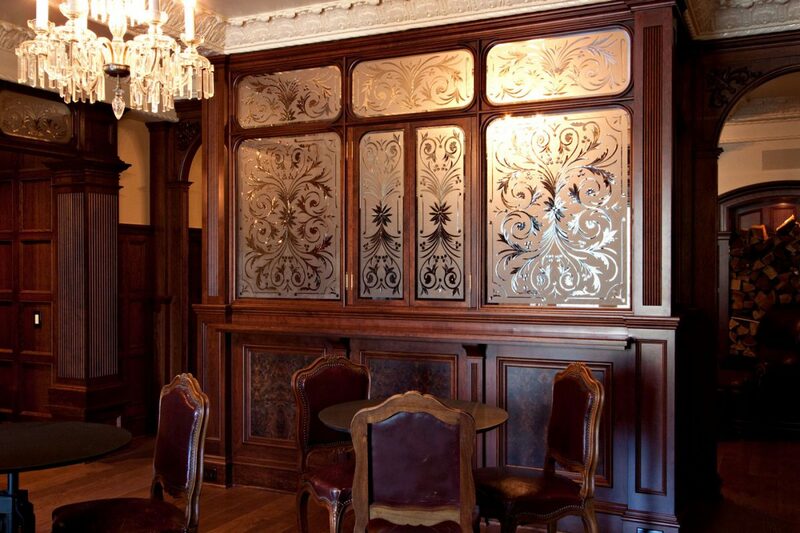 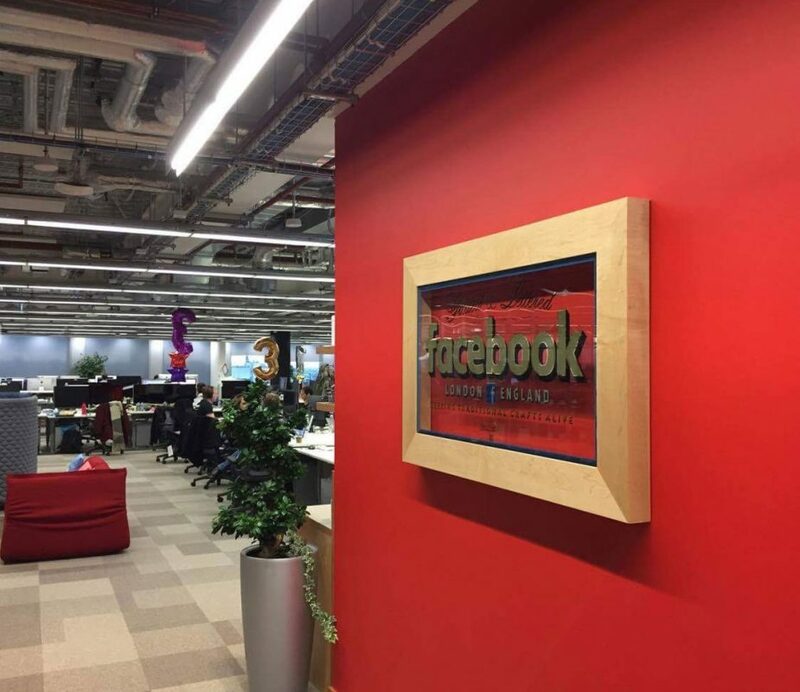 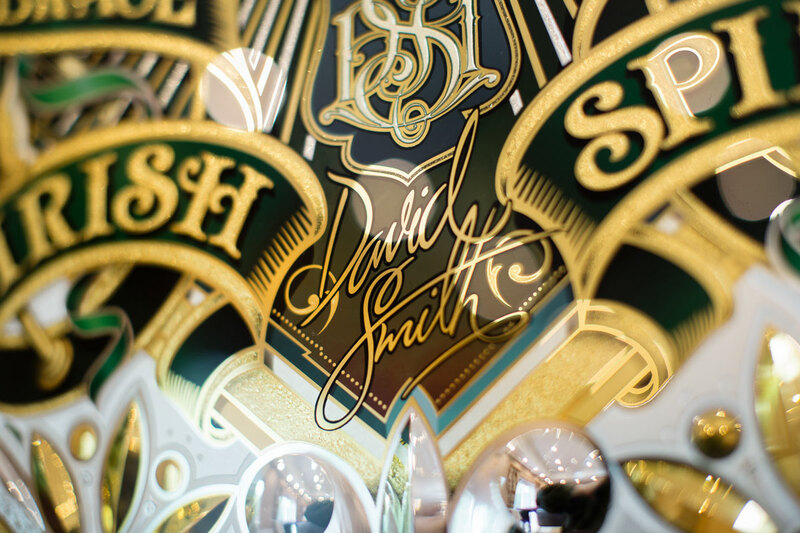 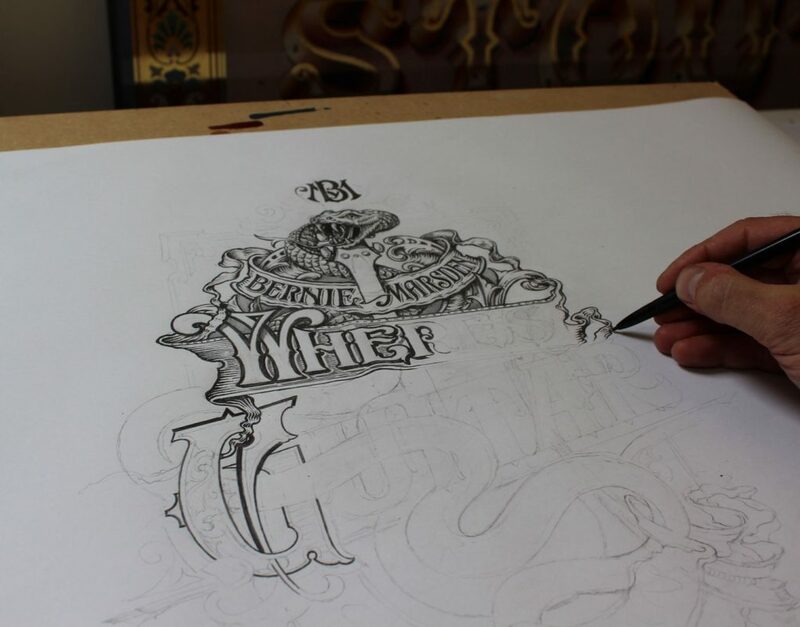 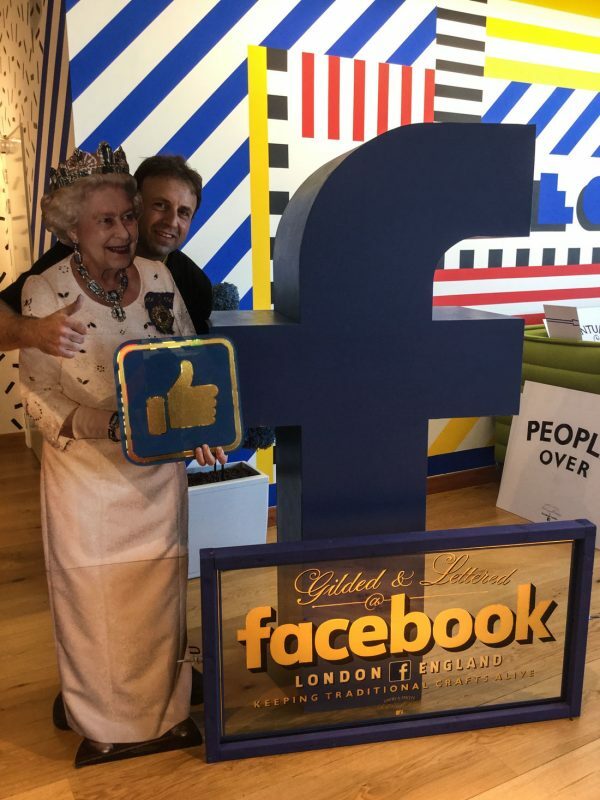 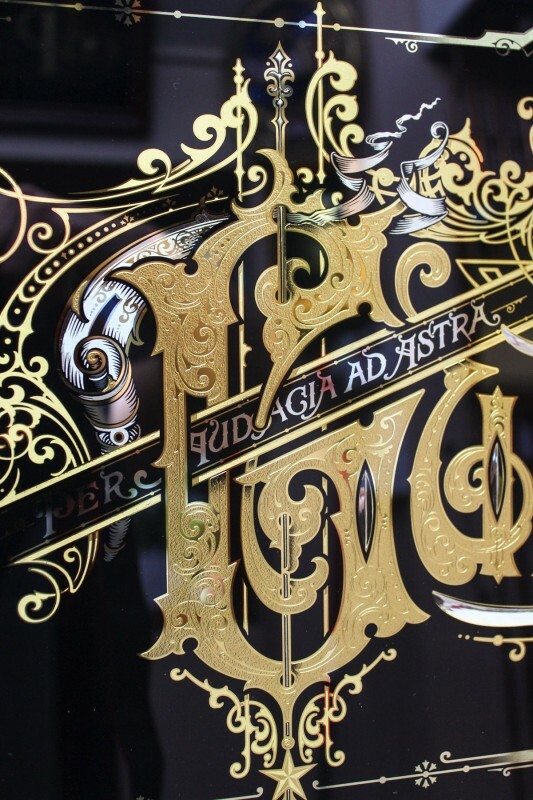 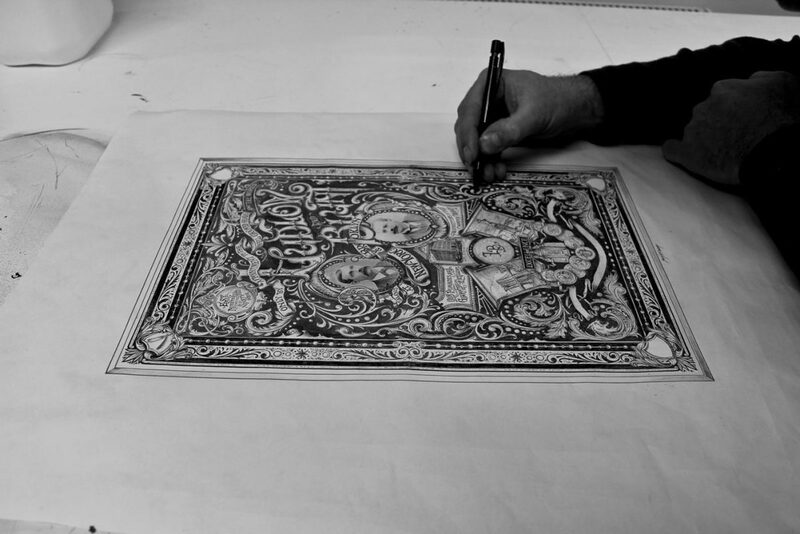 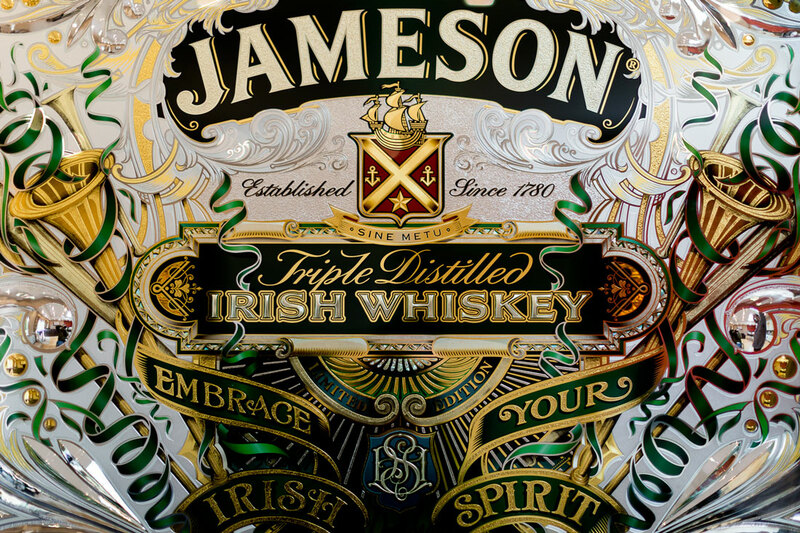 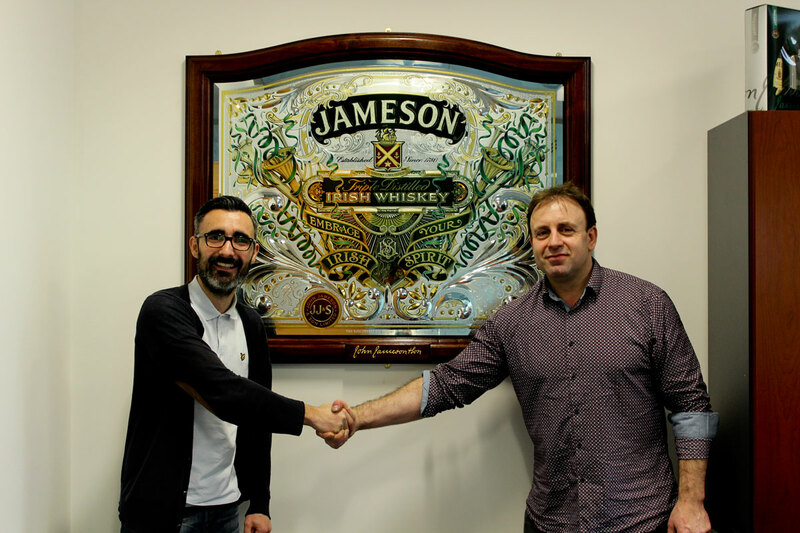 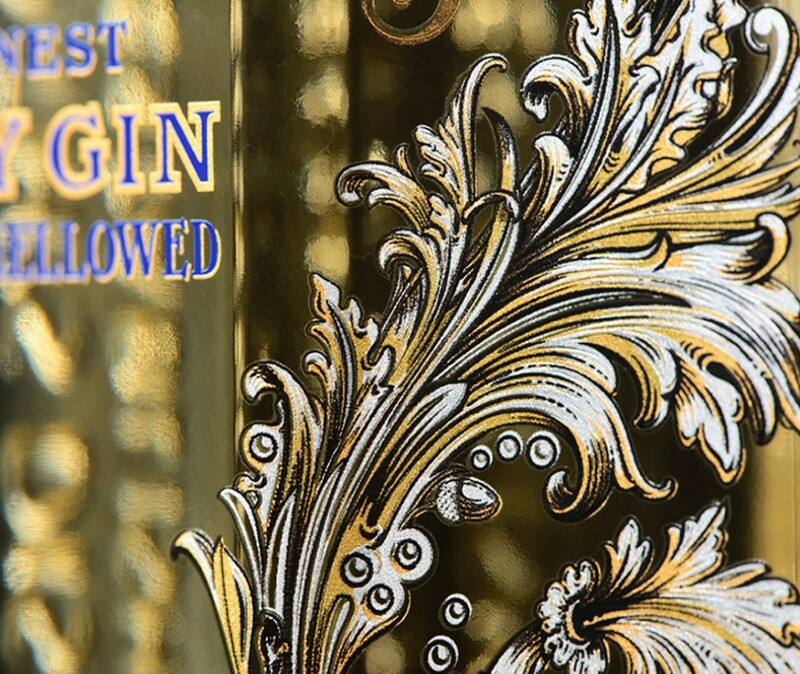 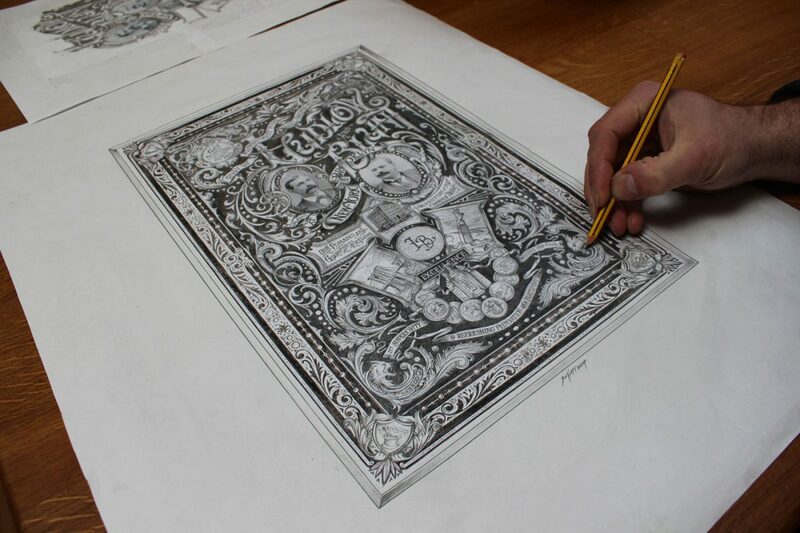 This Reverse gilded and silvered ornate mirror, was commissioned by Jameson Whiskey Dublin, Ireland for St. Patricks Day 2013. 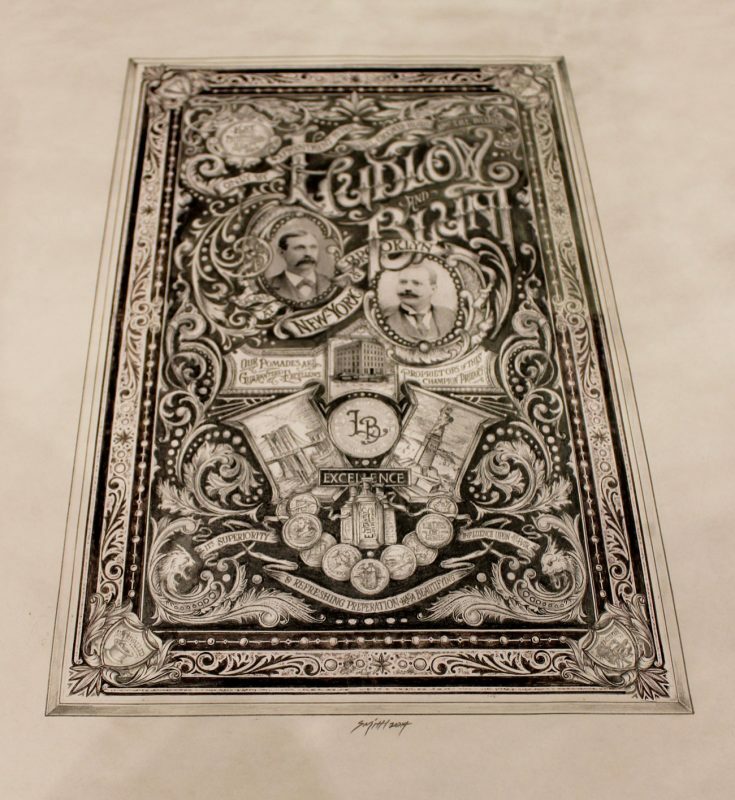 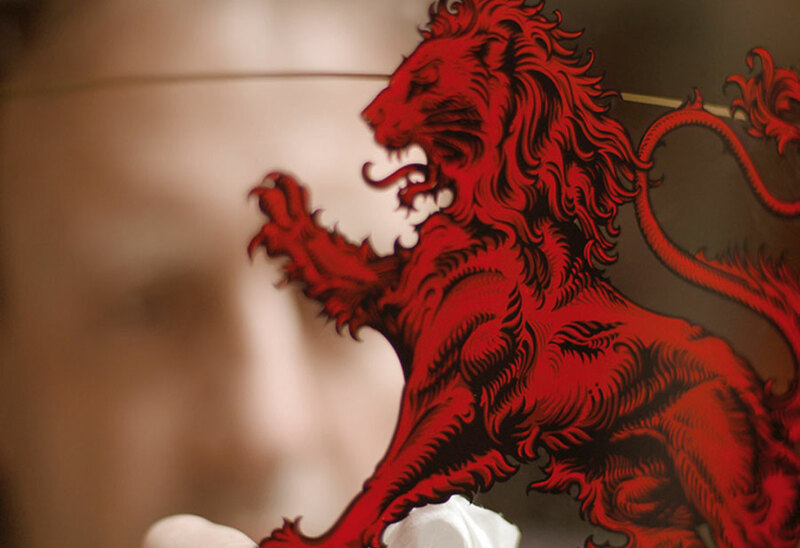 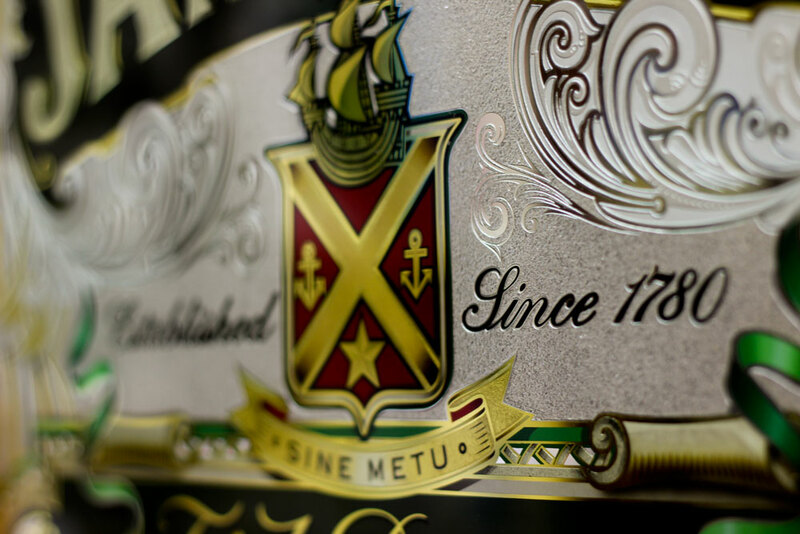 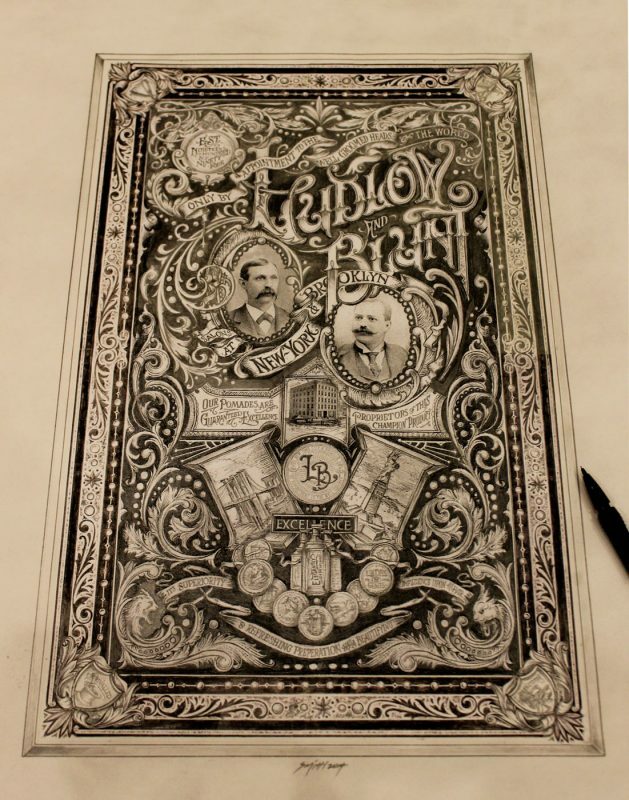 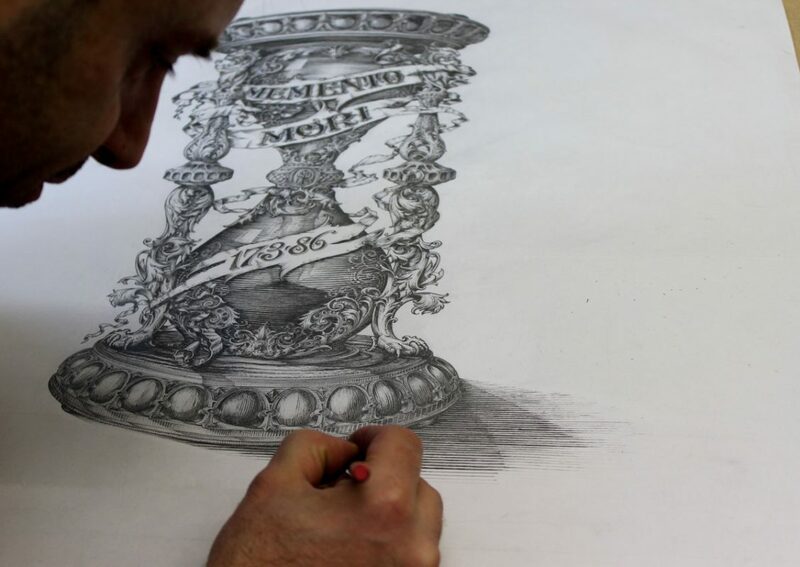 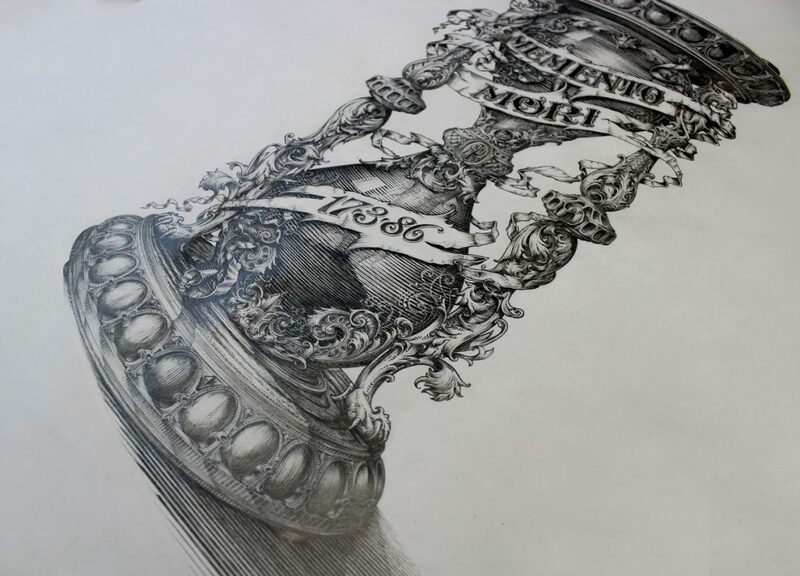 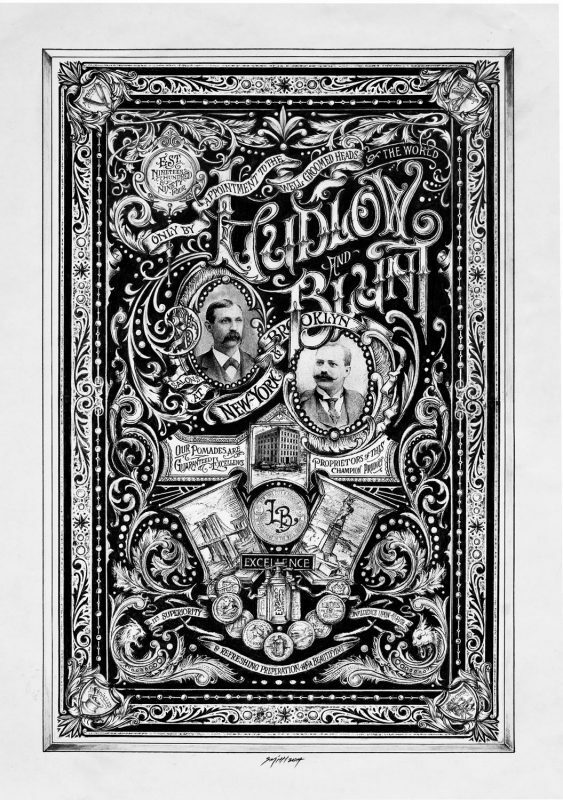 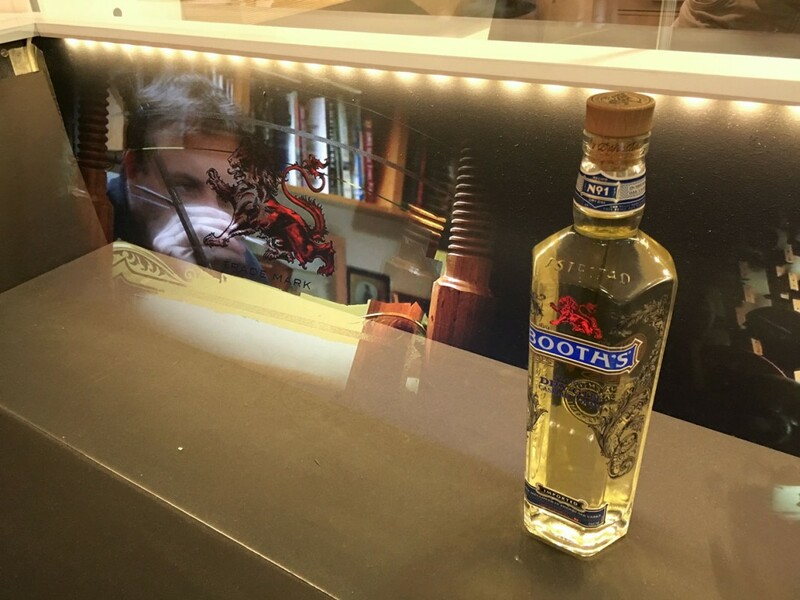 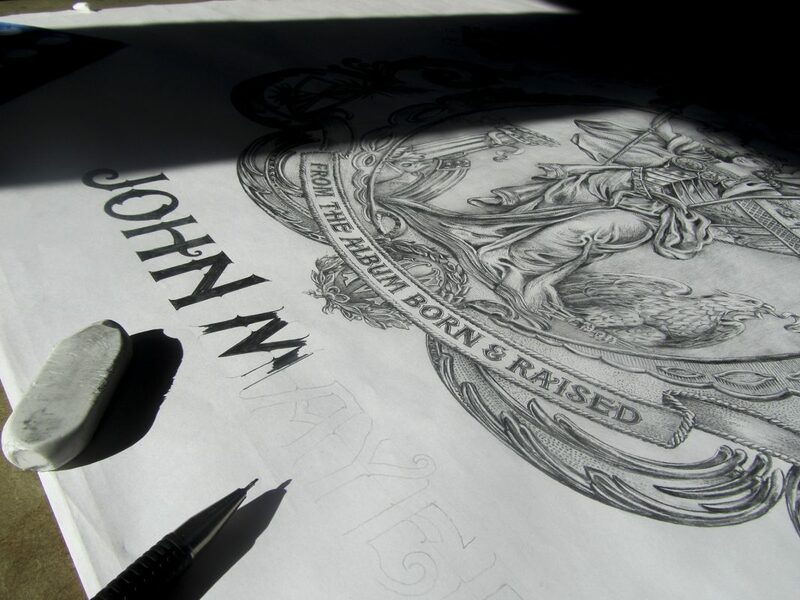 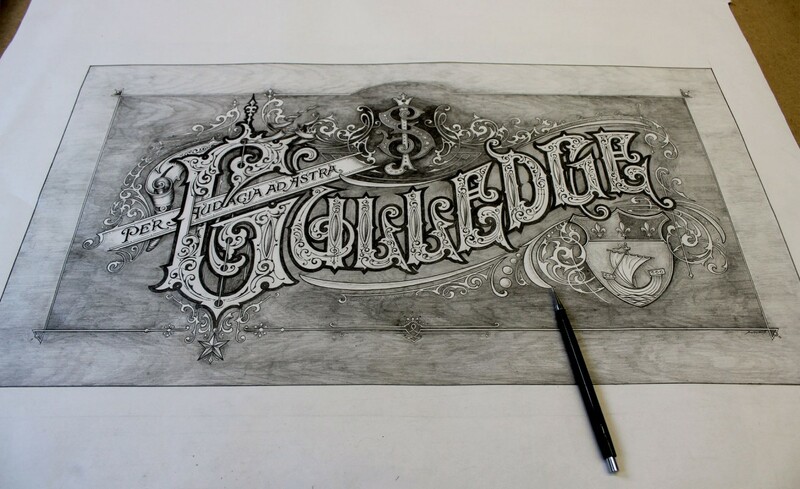 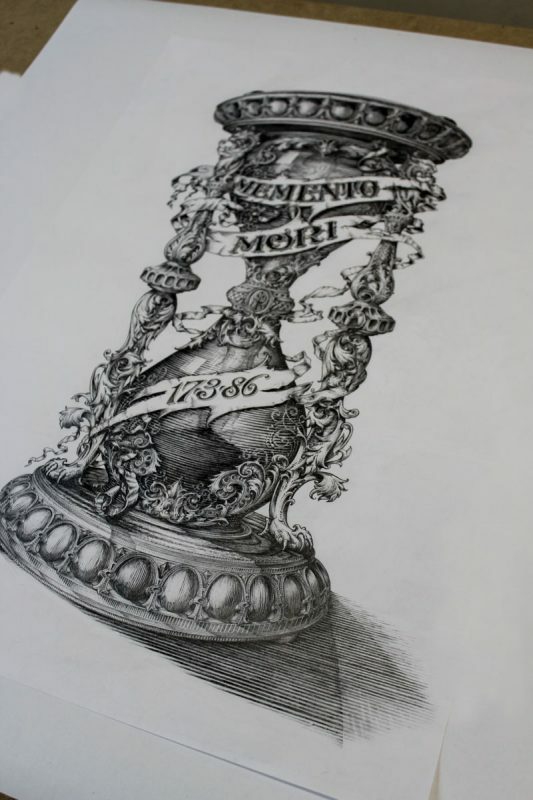 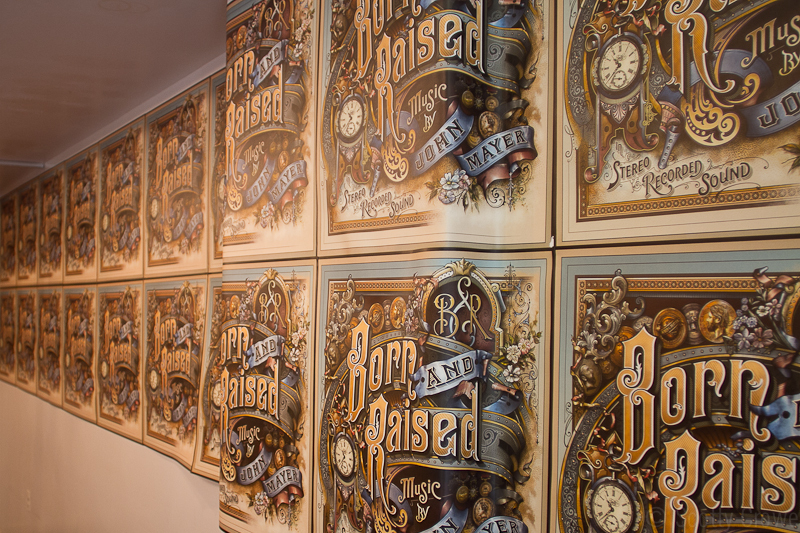 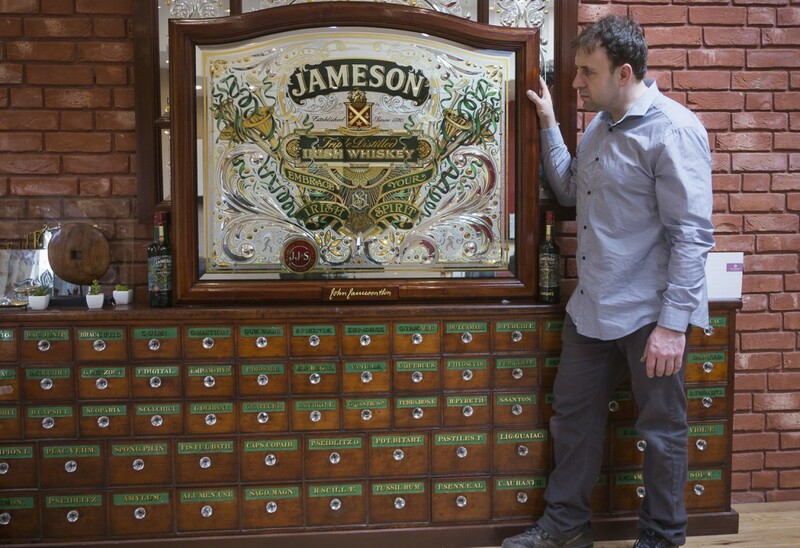 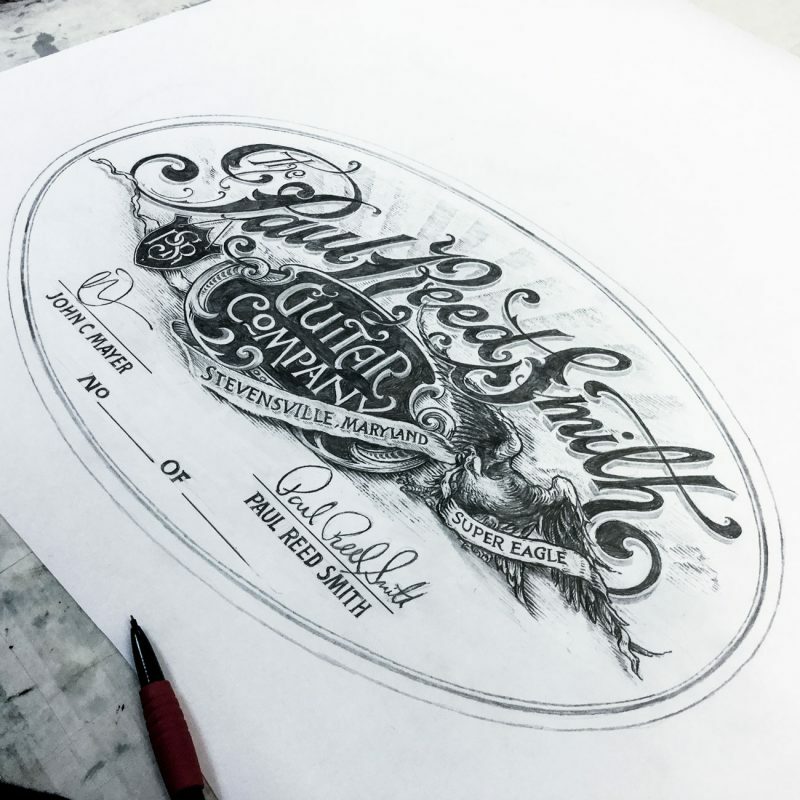 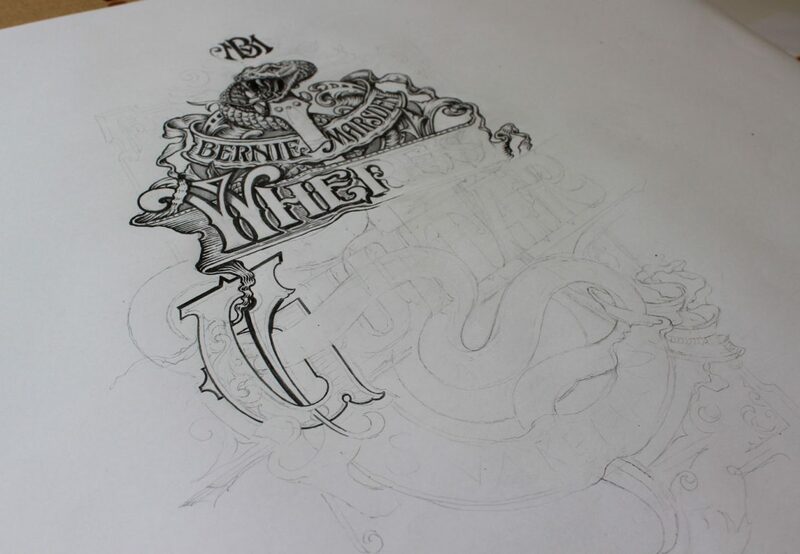 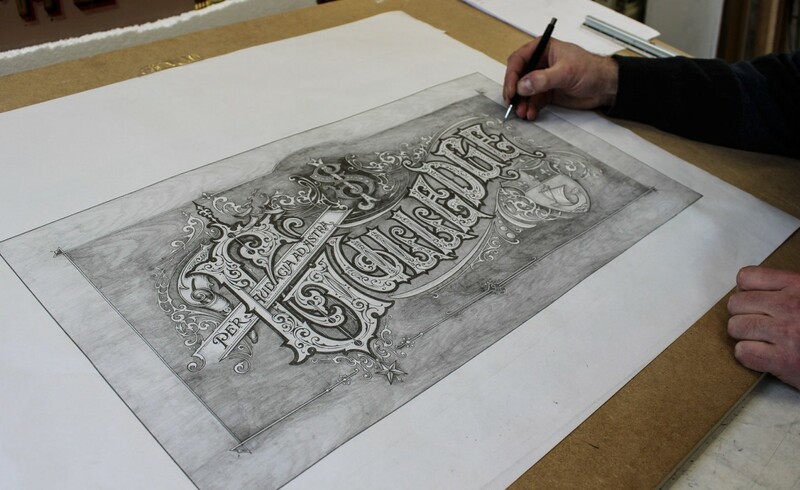 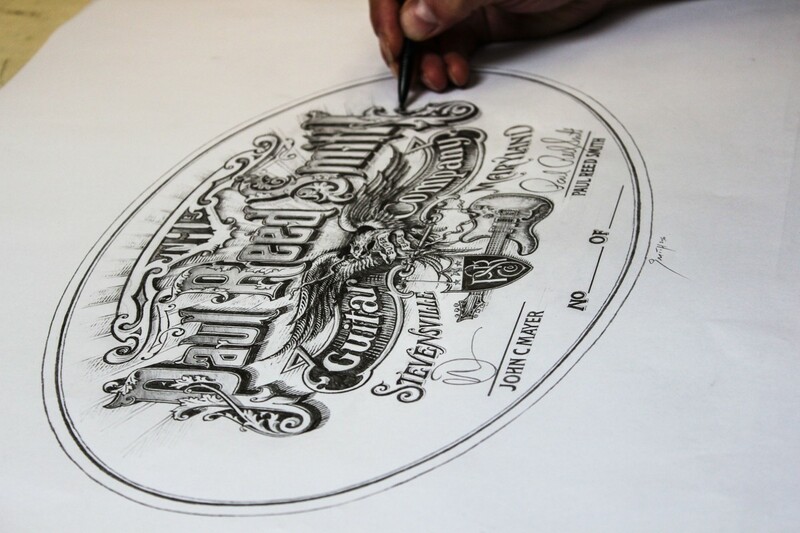 It was truly an honour to make this artwork for such a renowned world famous Whiskey company. 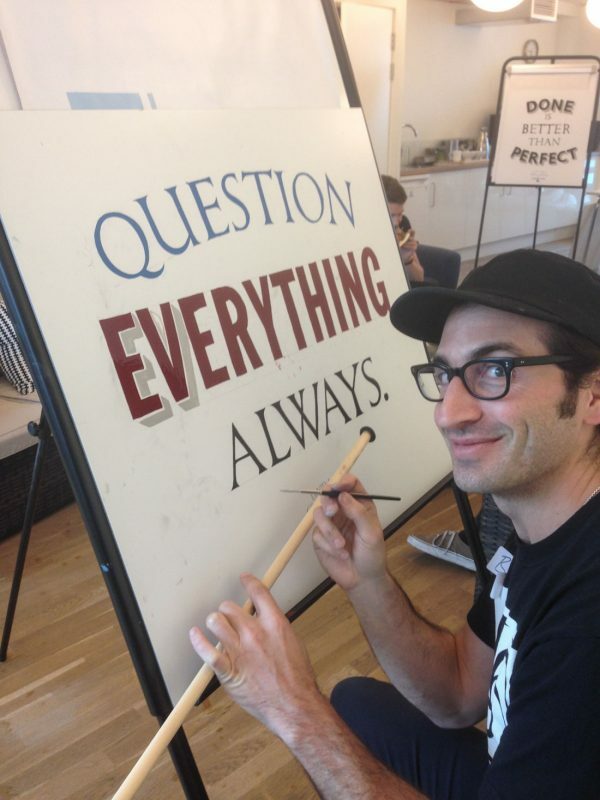 The techniques are as follows. 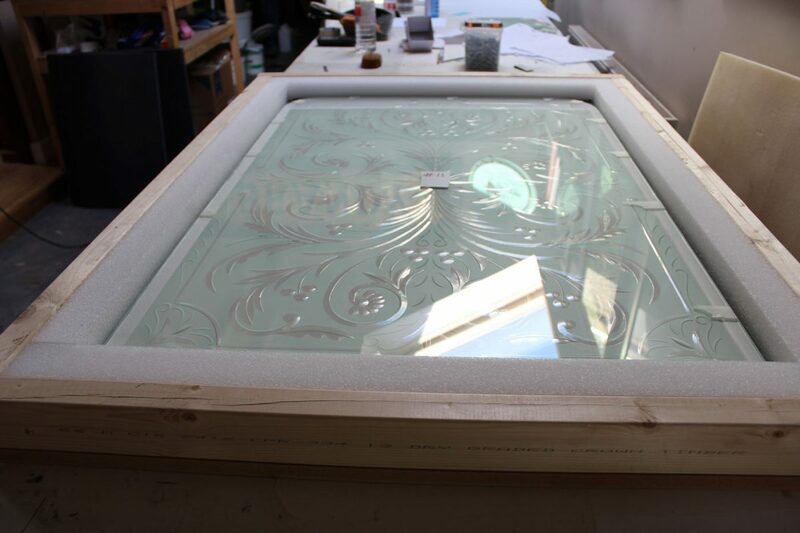 Hand sketched design transfered to the back of the glass, The next stage was to brilliant cut part of the design using old stone wheels, and then to polish the cuts with a wood and felt wheel to bring them back to a crystal clear glass finish. 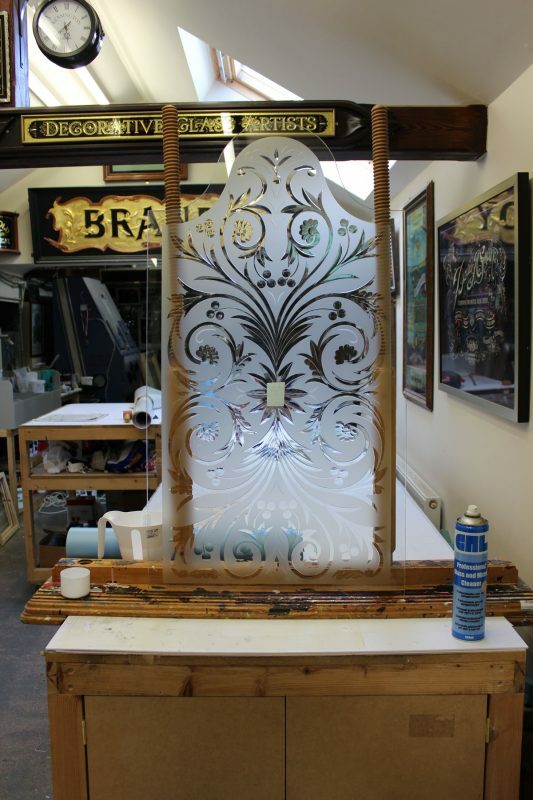 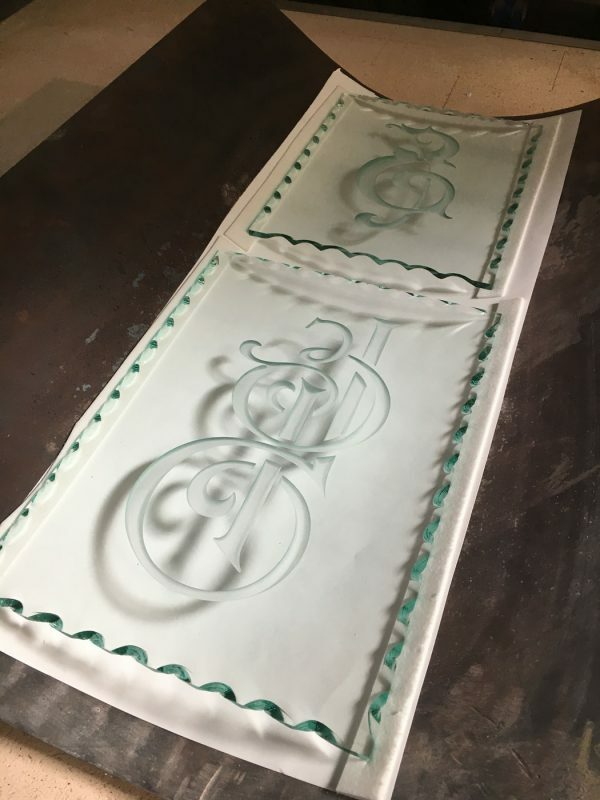 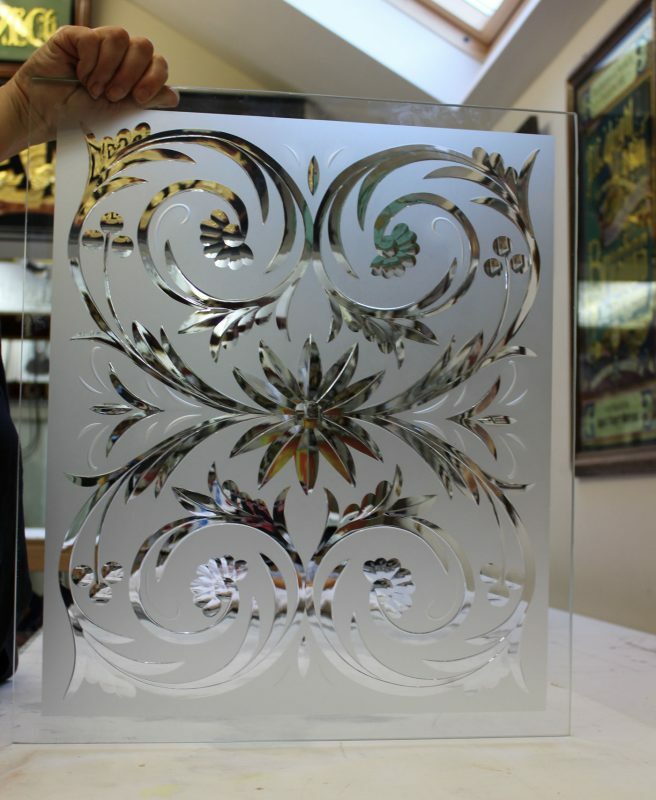 The cuts were then masked out and numerous acid etchings were made to give various tones and depth to the glass and design. 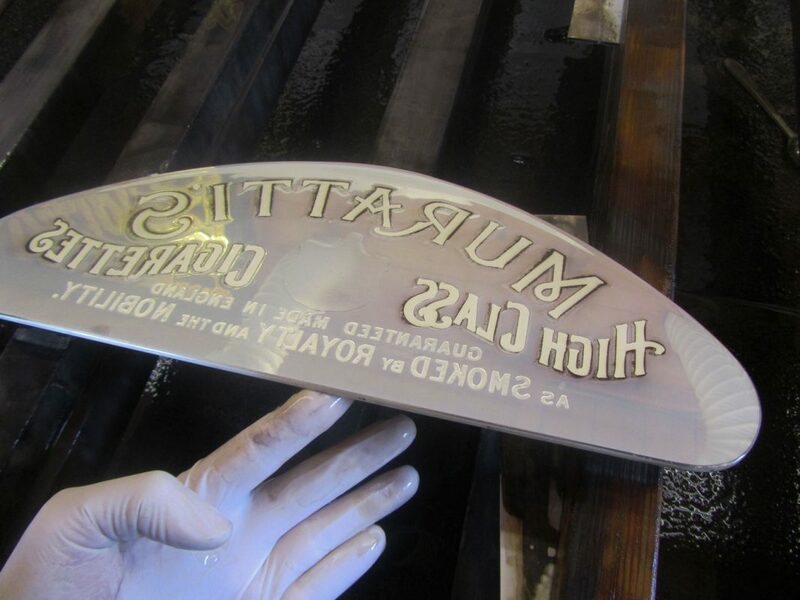 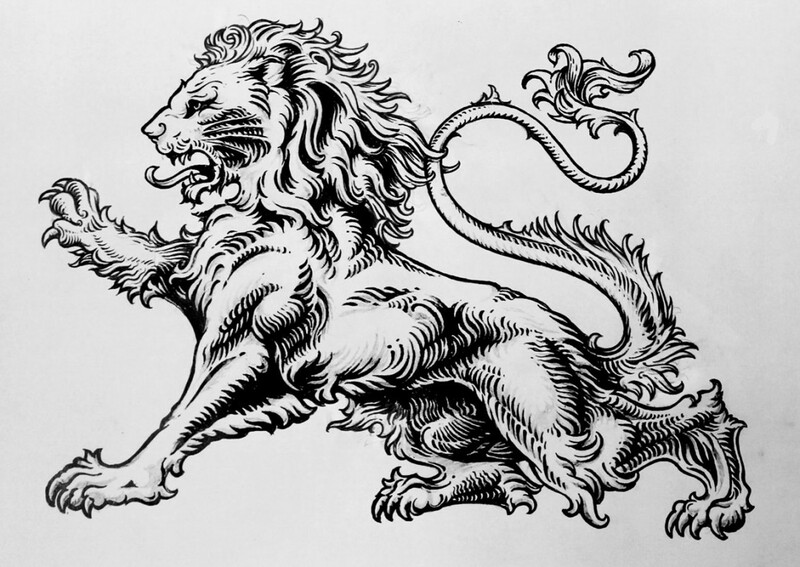 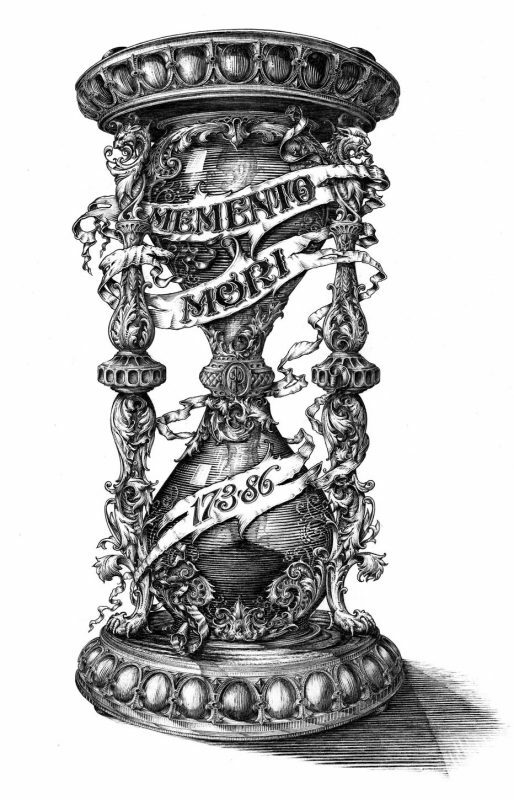 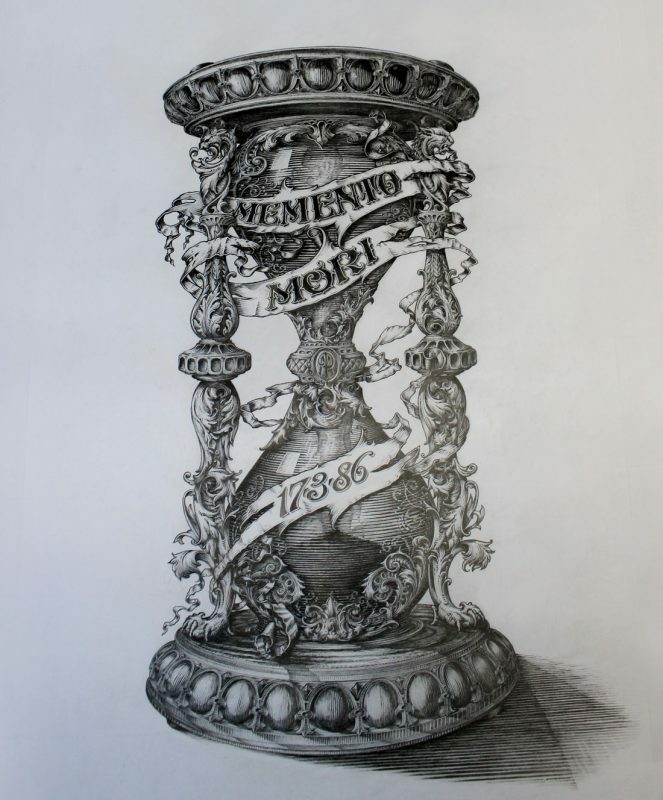 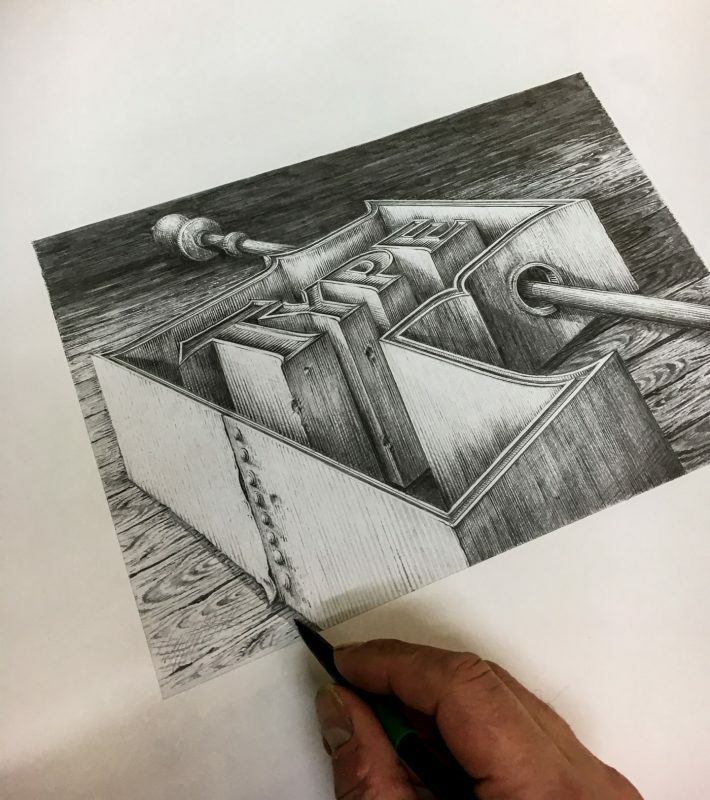 The etching process is an early turn of the century technique using Hydroflouric acid and distilled water in various ratios. 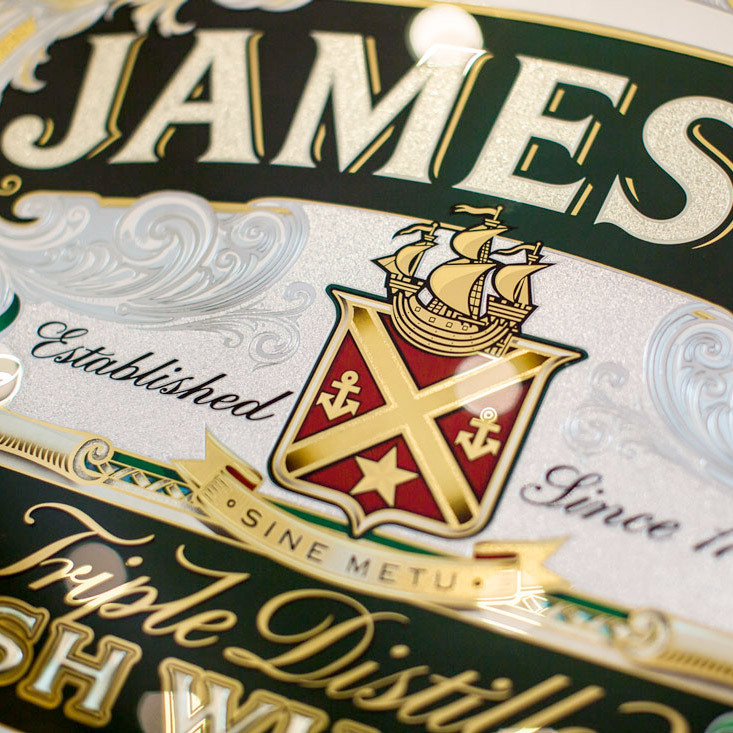 The textured centre around the Jameson Shield is mica stippled which gives a mottled finish like fine hammered steel, a beautiful effect when silvered ,gilded or even left clear. 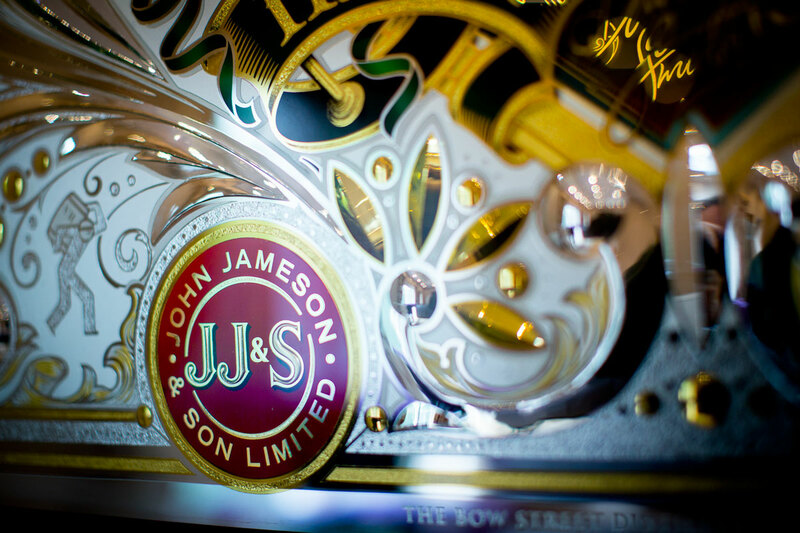 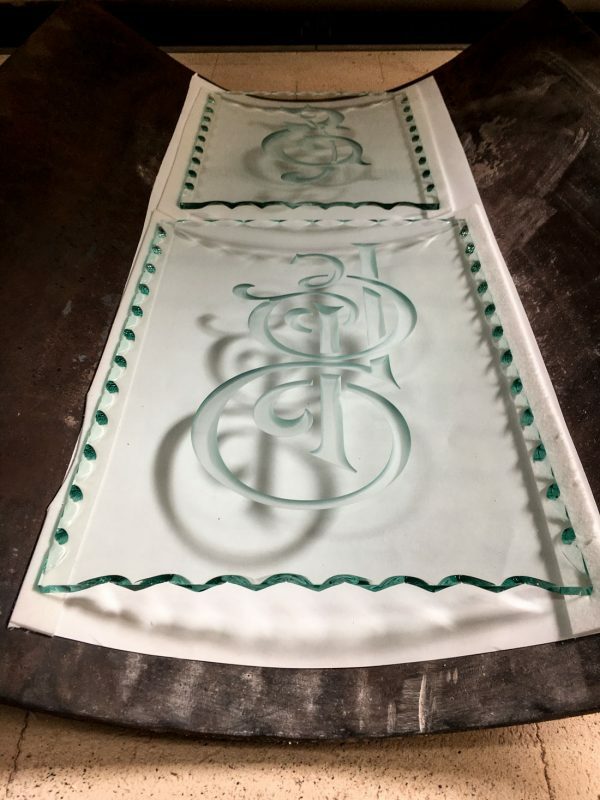 Deep sandblasting was used for the words IRISH WHISKEY and also the JJ&S design at the right corner in the marroon circle, this was then water gilded and painted. 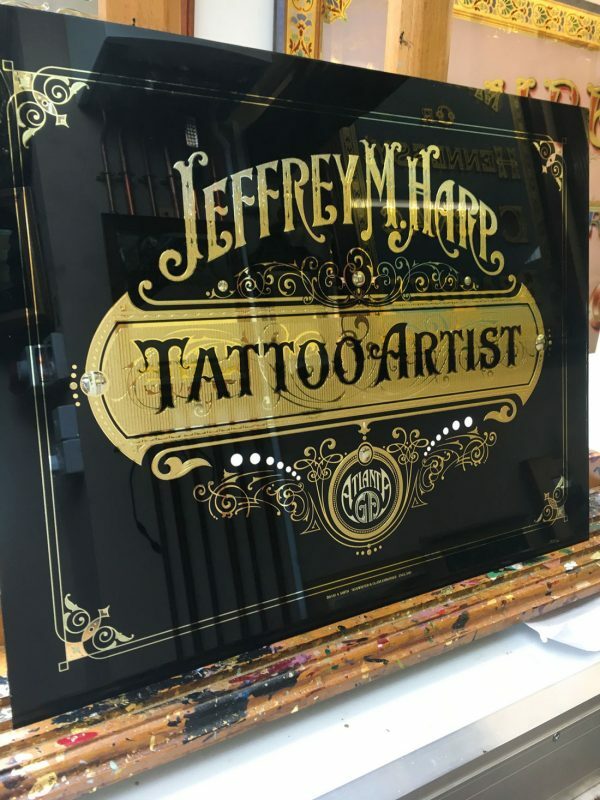 The centre of the glass was then water gilded and hand painted, in some smaller areas of tight detail i decided to screen print to get the best possible detail. 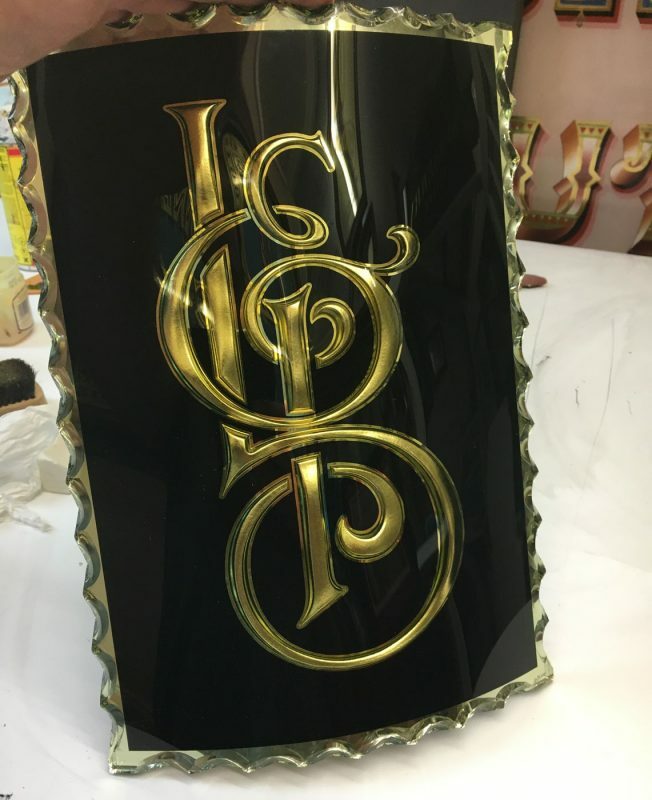 Once all the gilding was done using 24crt,22crt,18crt,16 lemon gold and 12crt gold for silver finish, i hand painted the shades of colours to all areas along with Mother-of Pearl inlay and glitter effects. 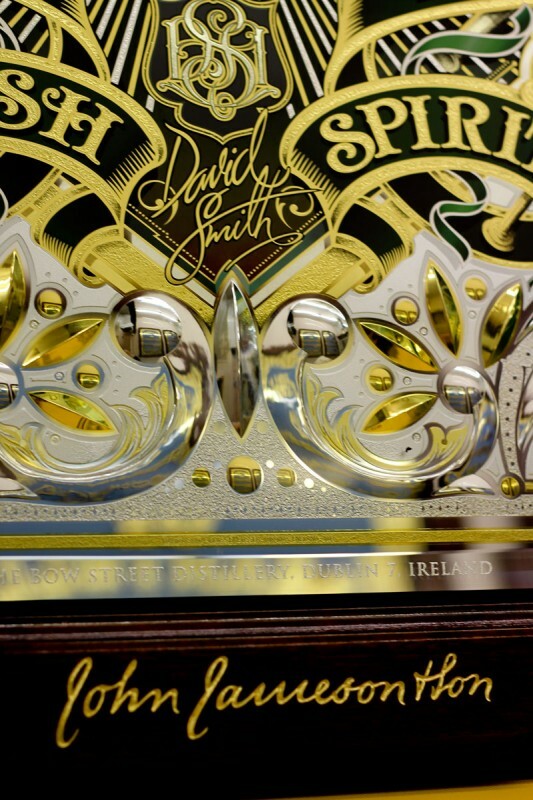 Hand blending was used on the ribbons using smiths cream and gold size. 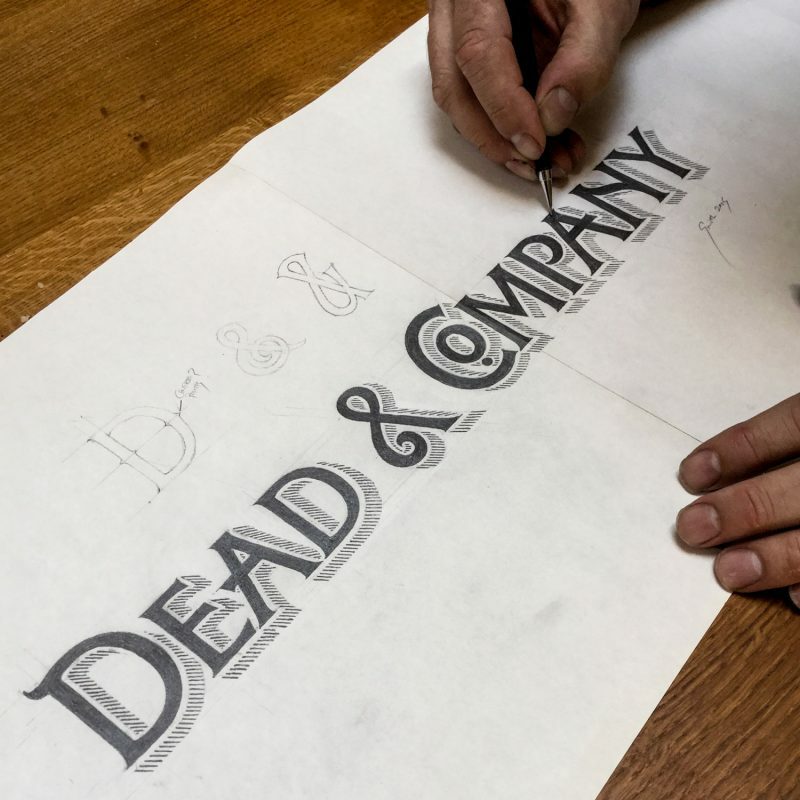 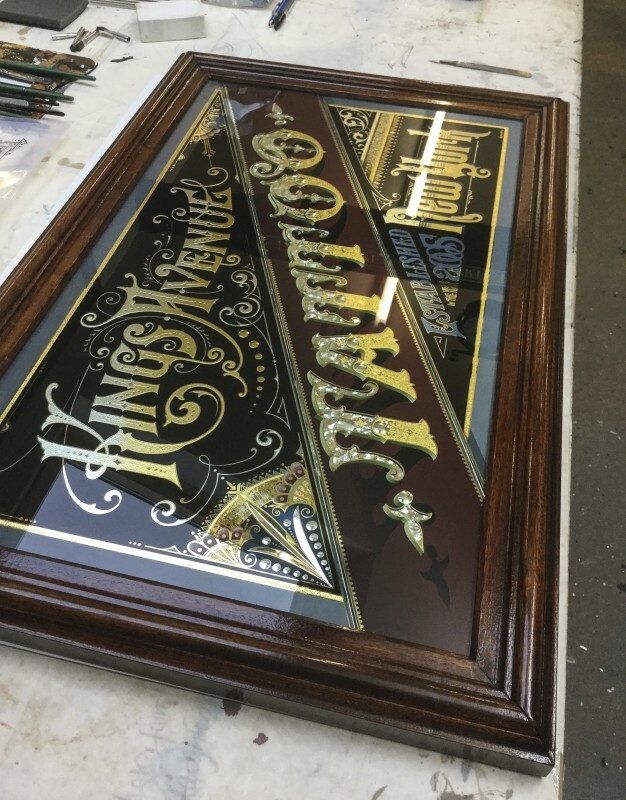 A fun project to make for a very appreciative Whiskey company! 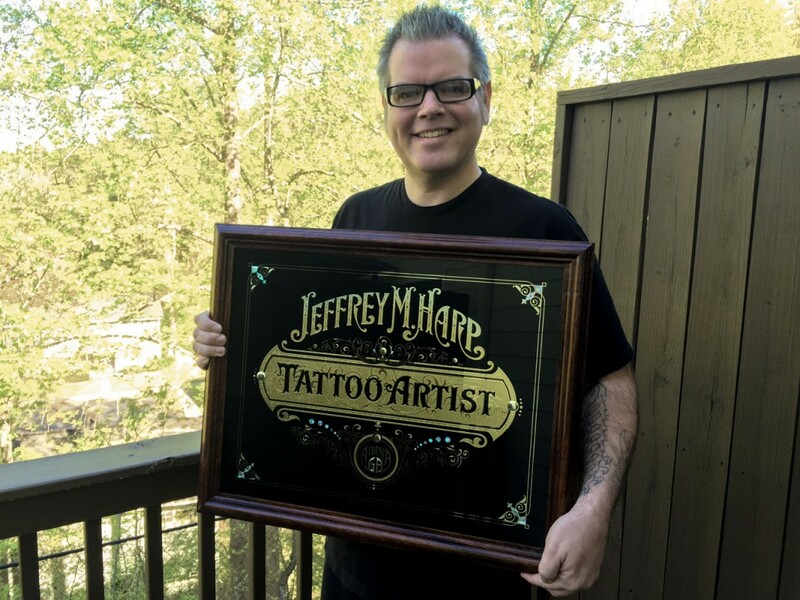 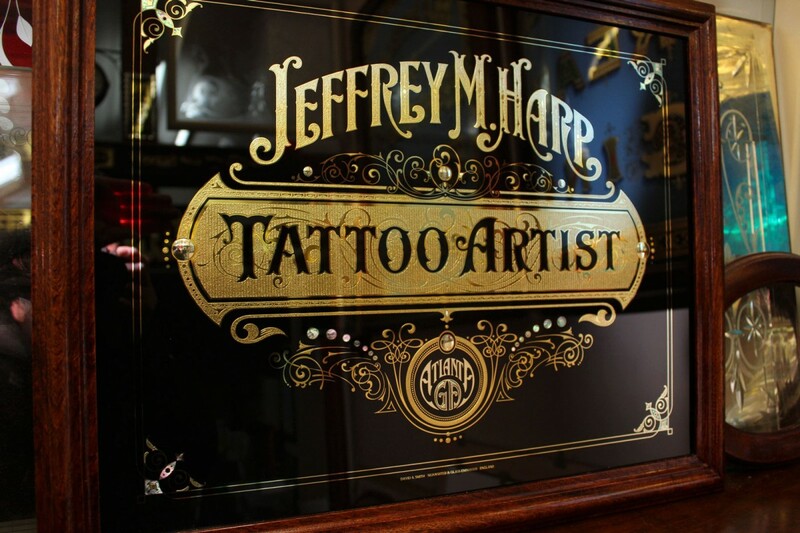 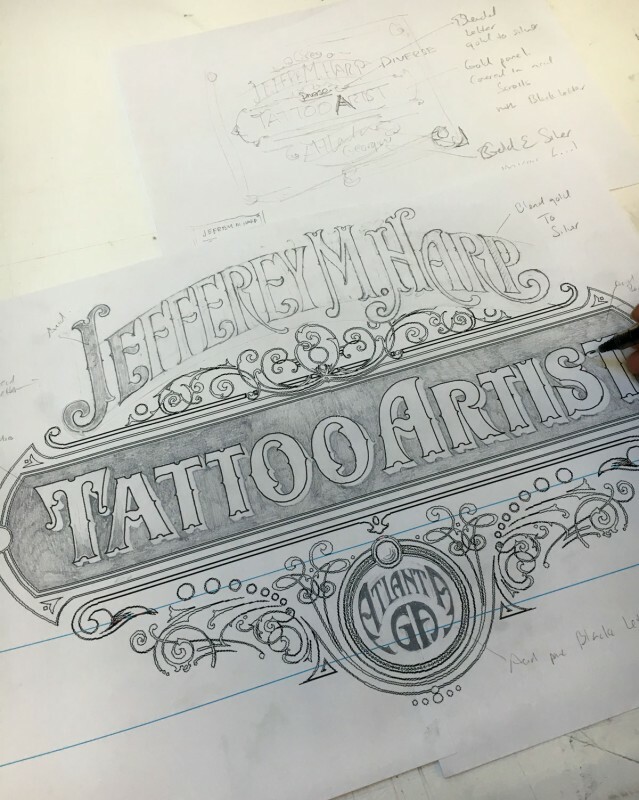 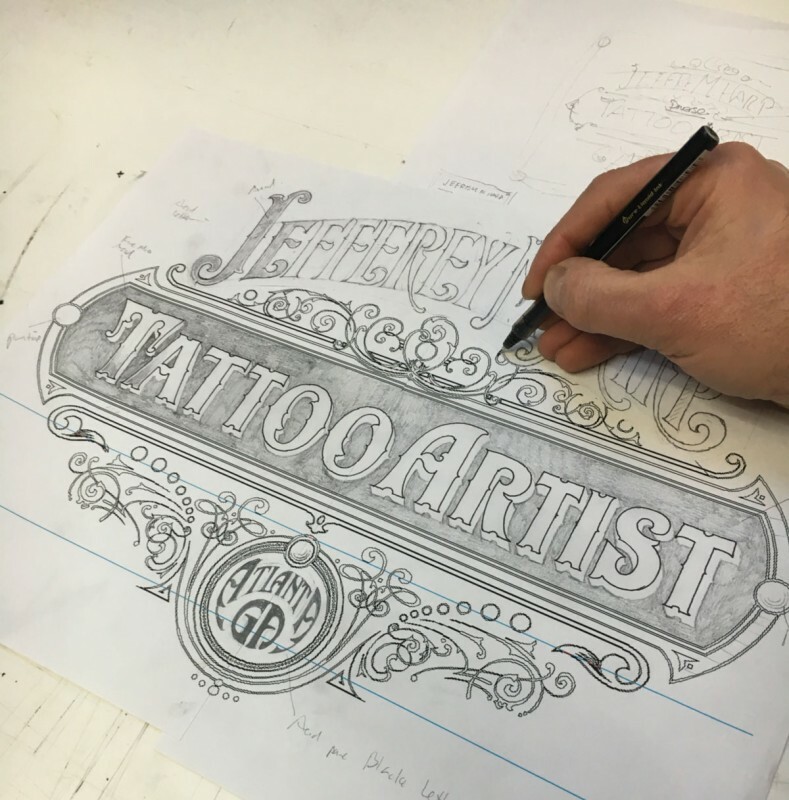 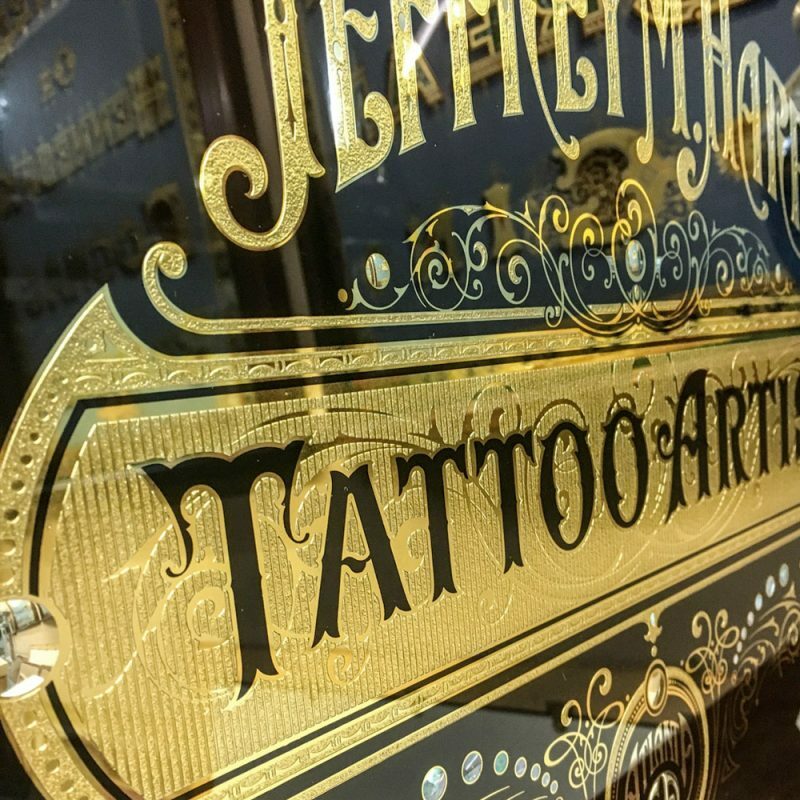 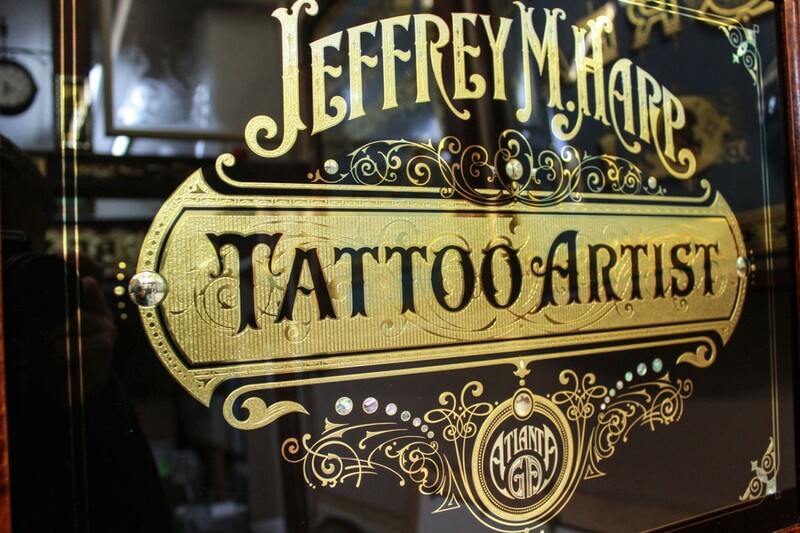 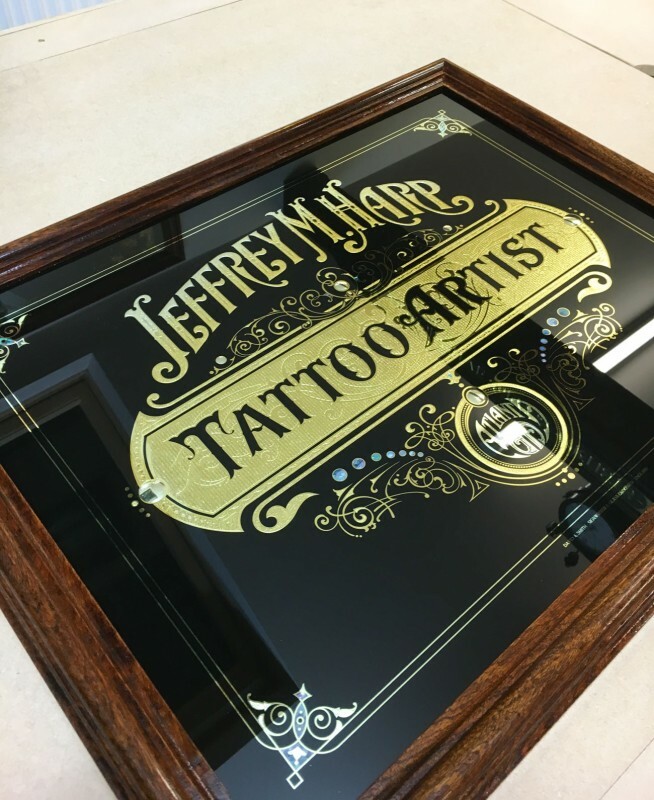 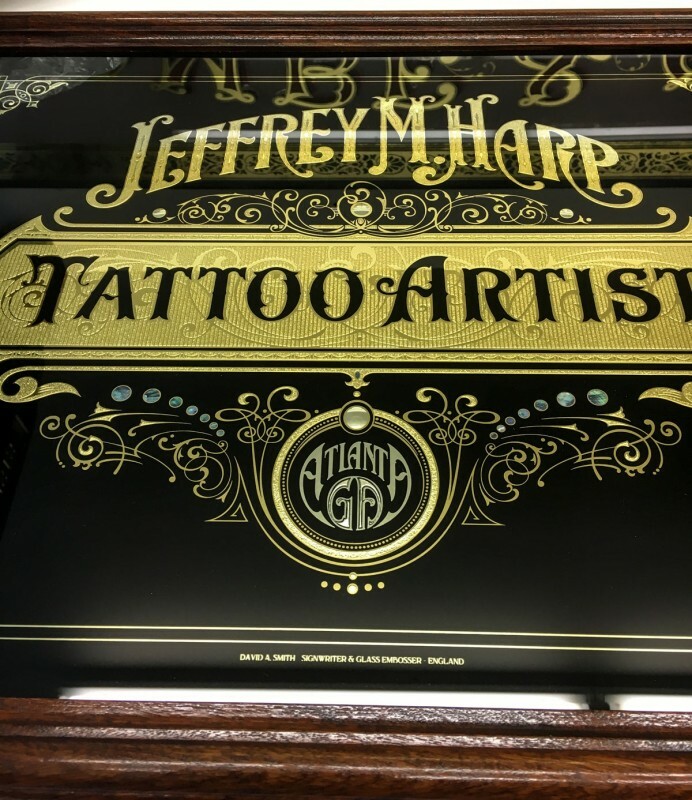 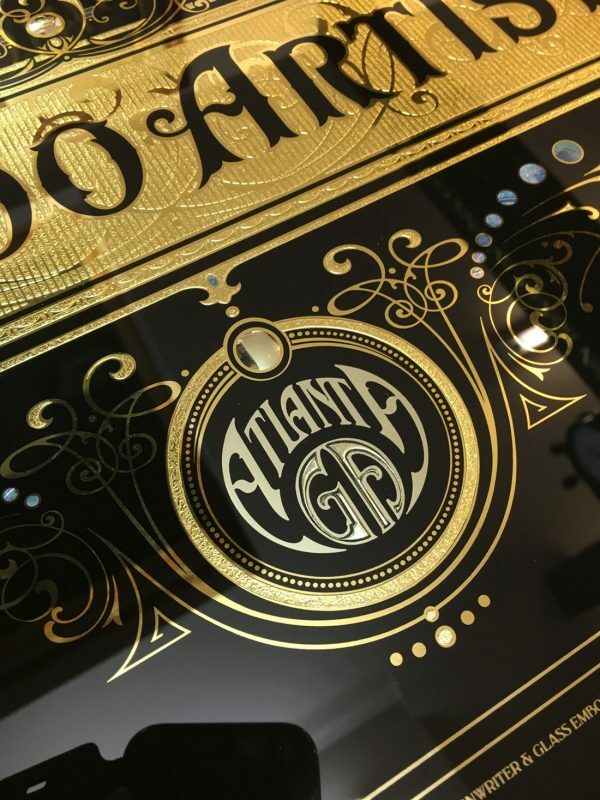 This glass sign was made for Jeffrey.M.Harp a talented tattooist based in Atlanta, Georgia, USA. 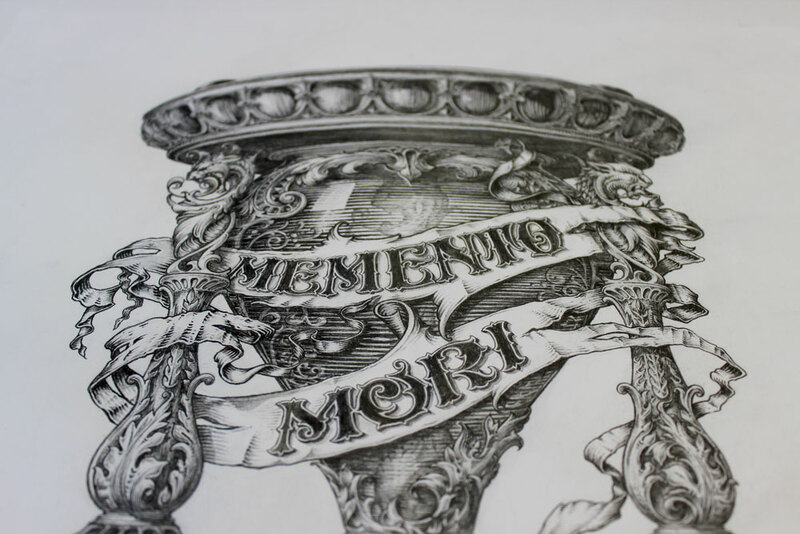 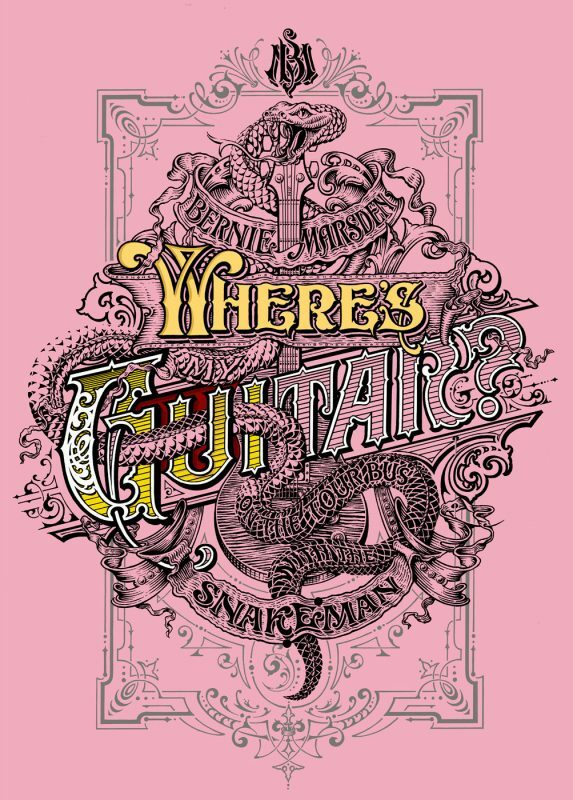 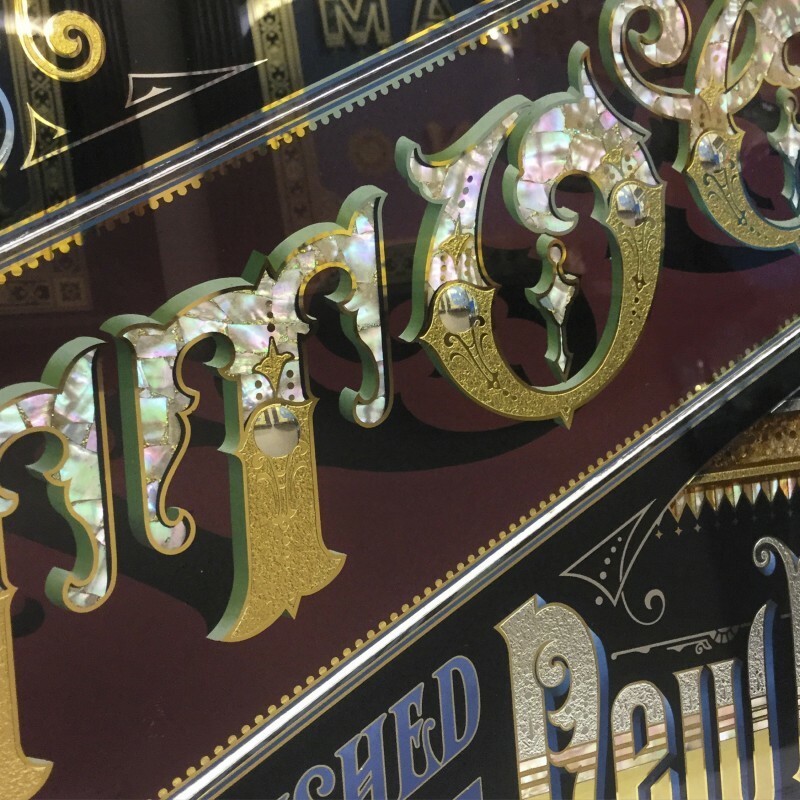 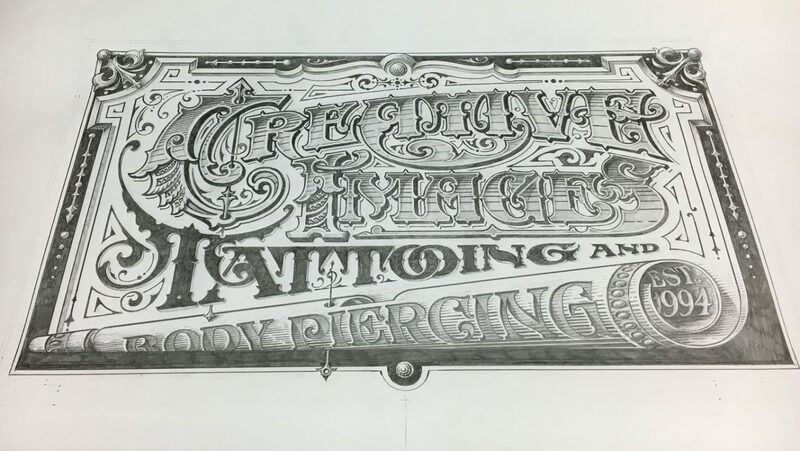 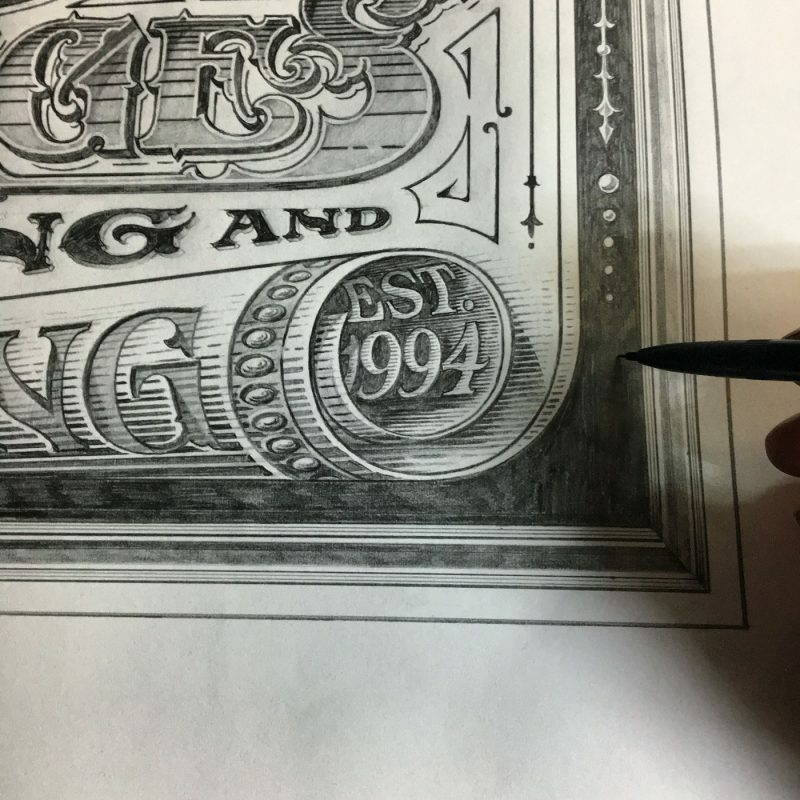 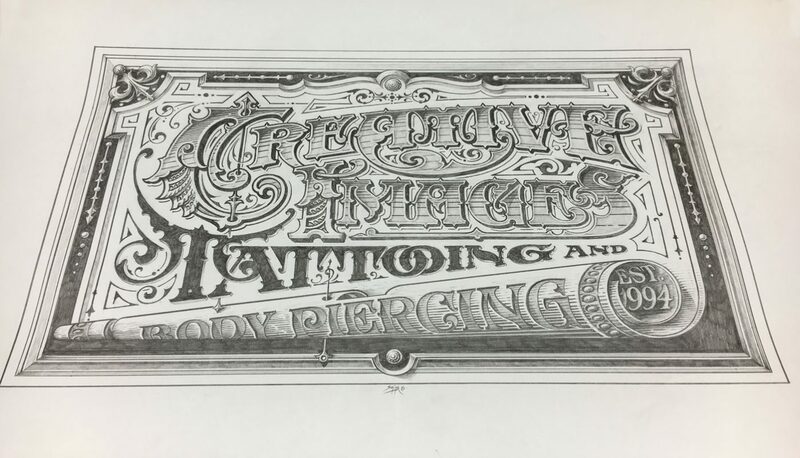 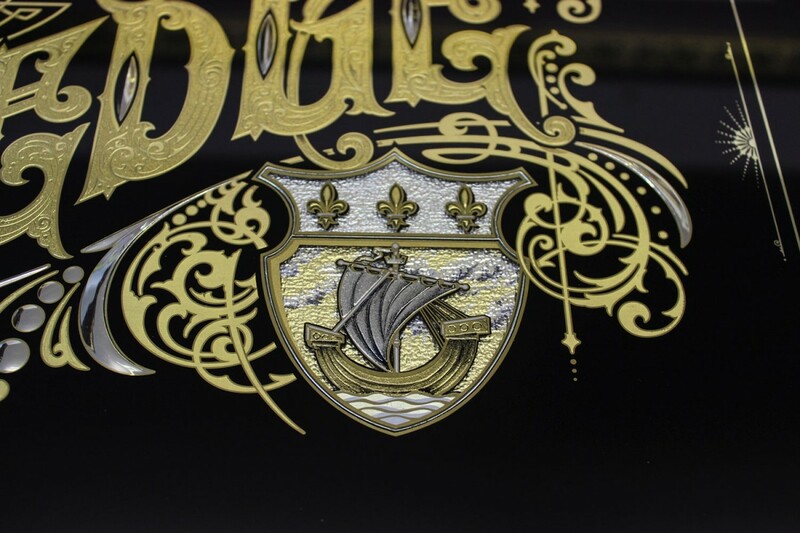 The lettering is acid etched with a slight mica stipple, the main copy of lettering is blended using water gilded 12crt to 23crt gold to silver blends. 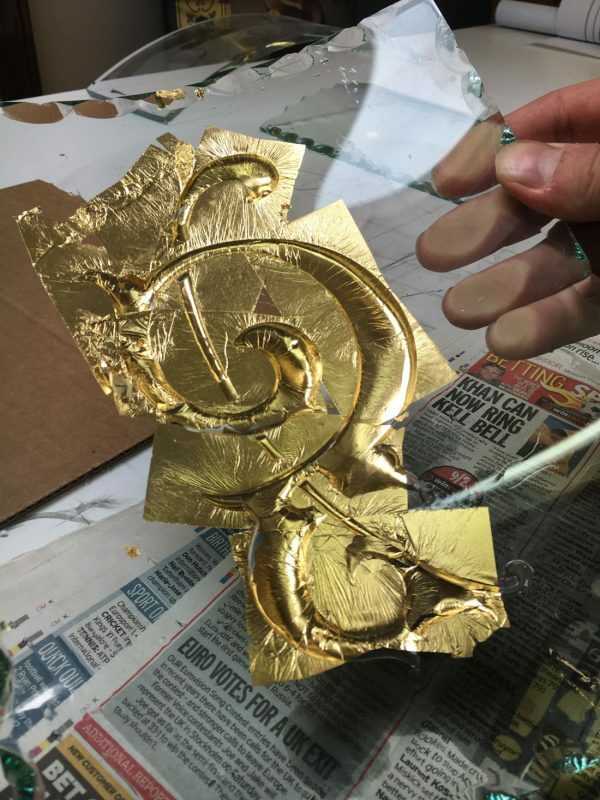 This was created using course wire wool and scratching back the silver gently to form a gradient blend allowing the gold leaf to cover over. 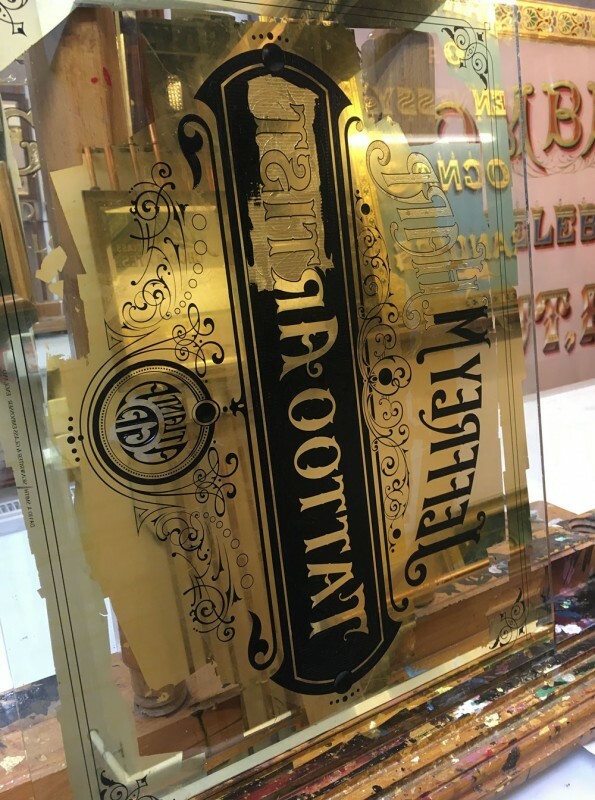 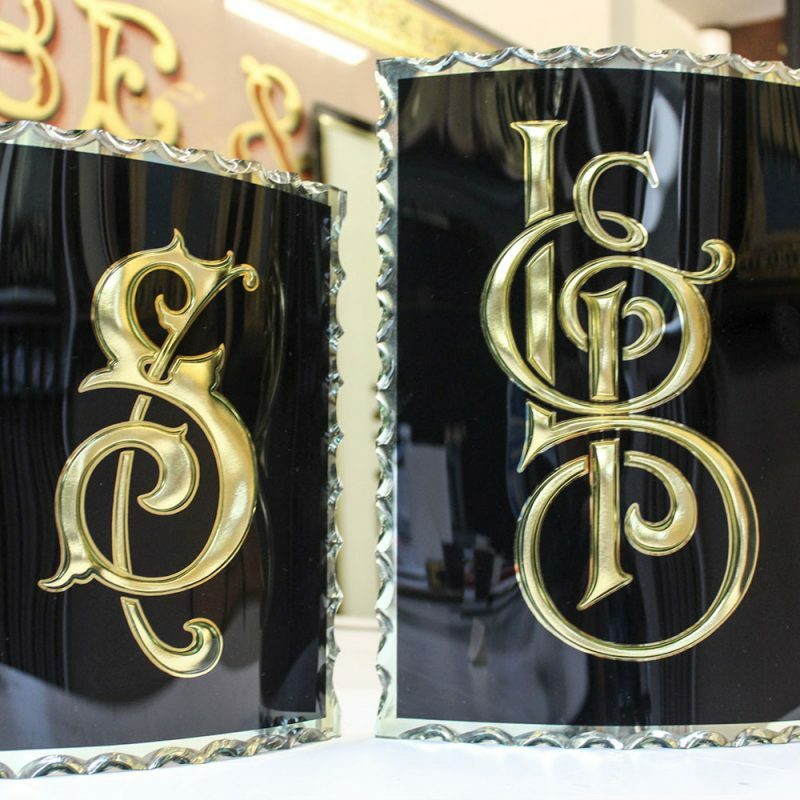 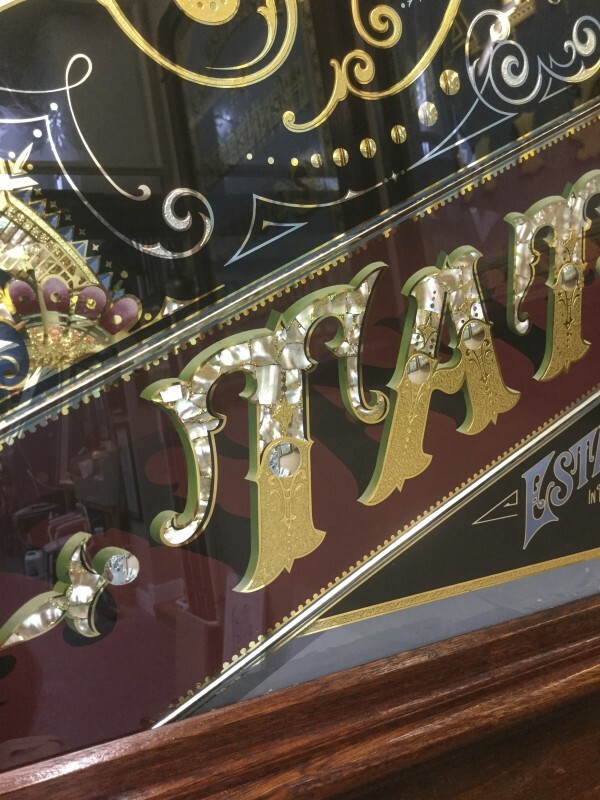 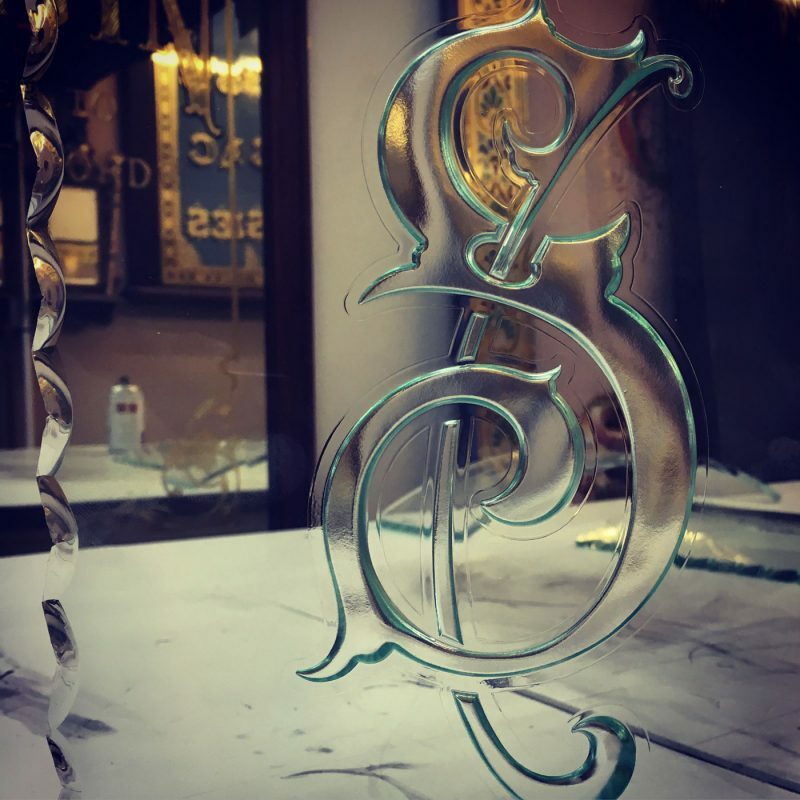 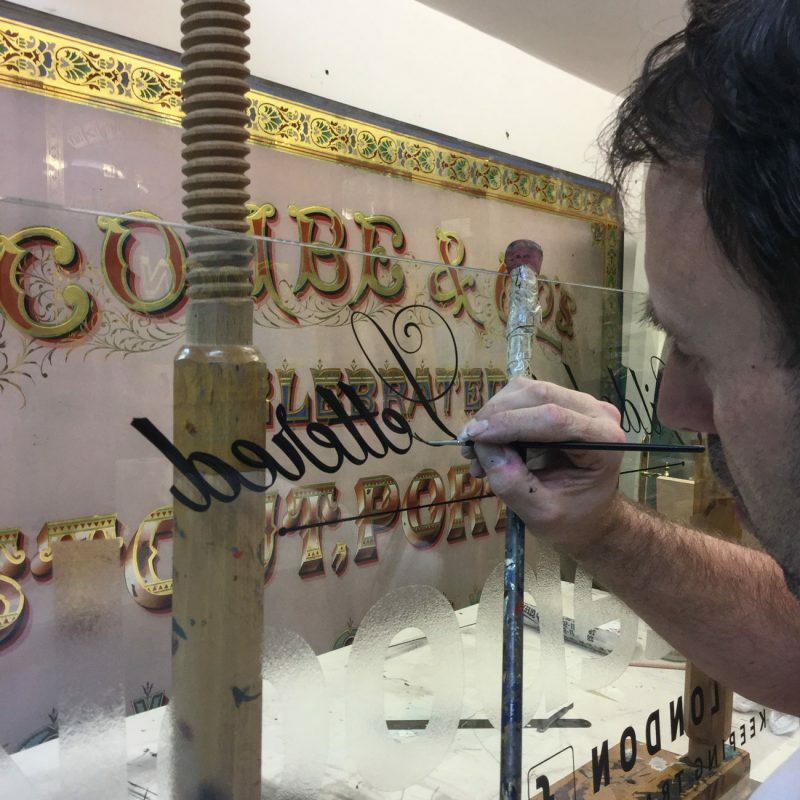 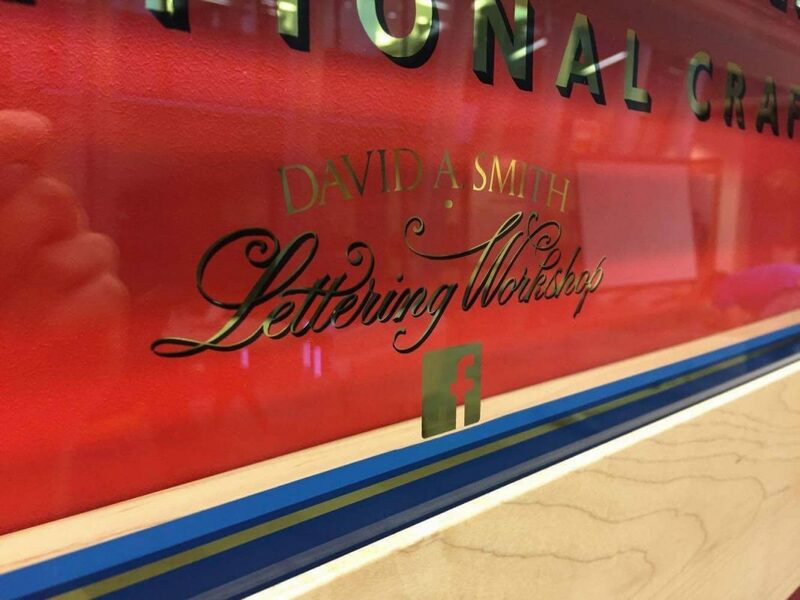 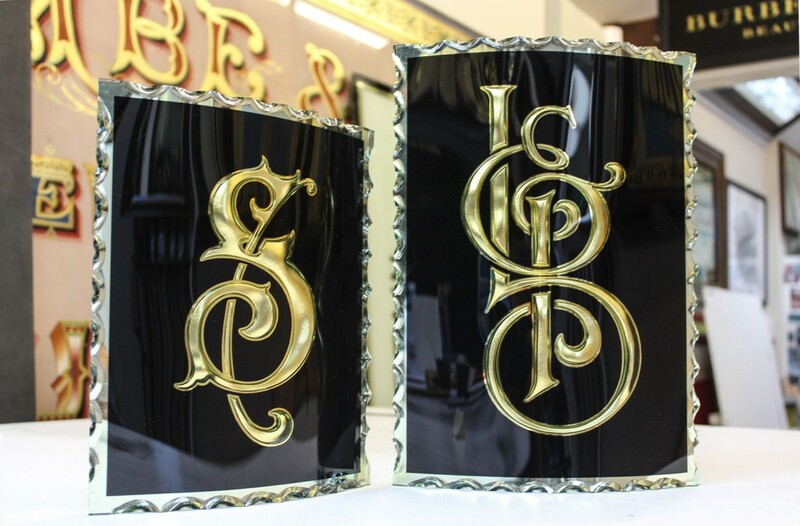 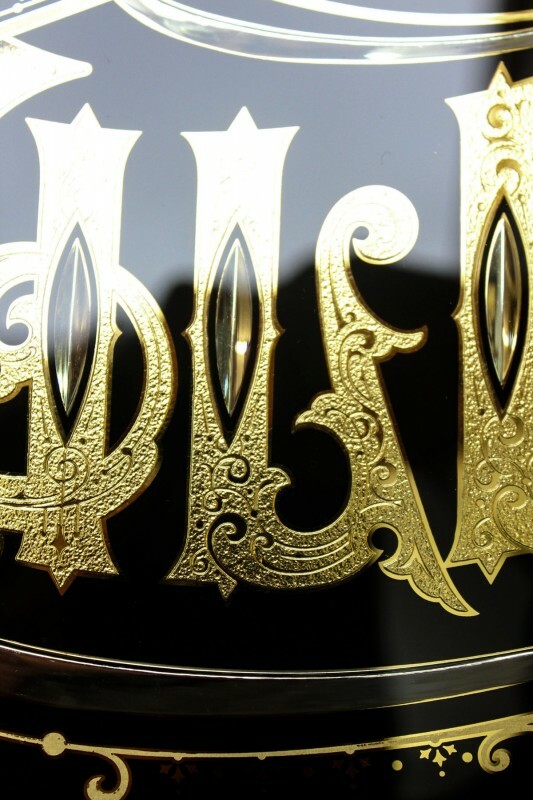 GA lettering is deep blasted and water gilded and in each corner of the glass has abalone shell inlaid into the clear areas. 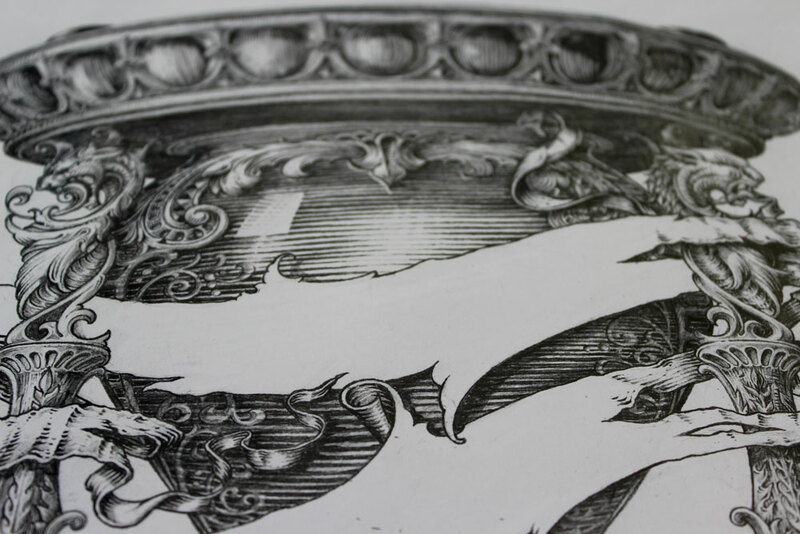 The circles in silver are known as puntie cuts and are were brilliant cut and polished. 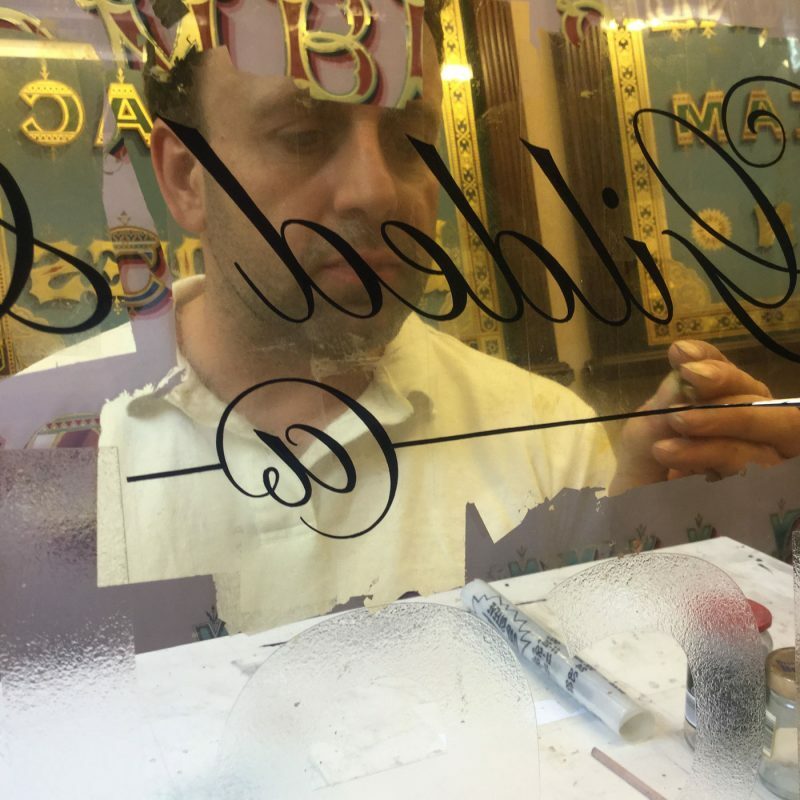 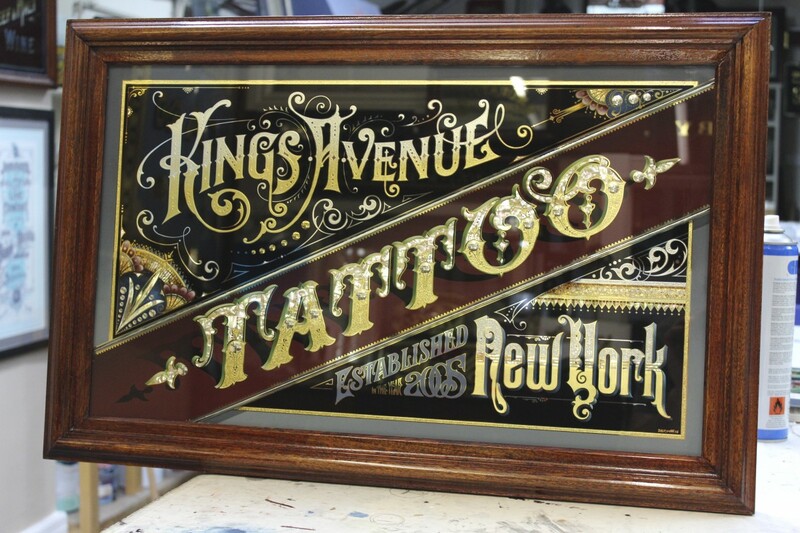 This glass sign was made as a gift for this Iconic men’s hairdressers Ludlow and Blunt in New York. 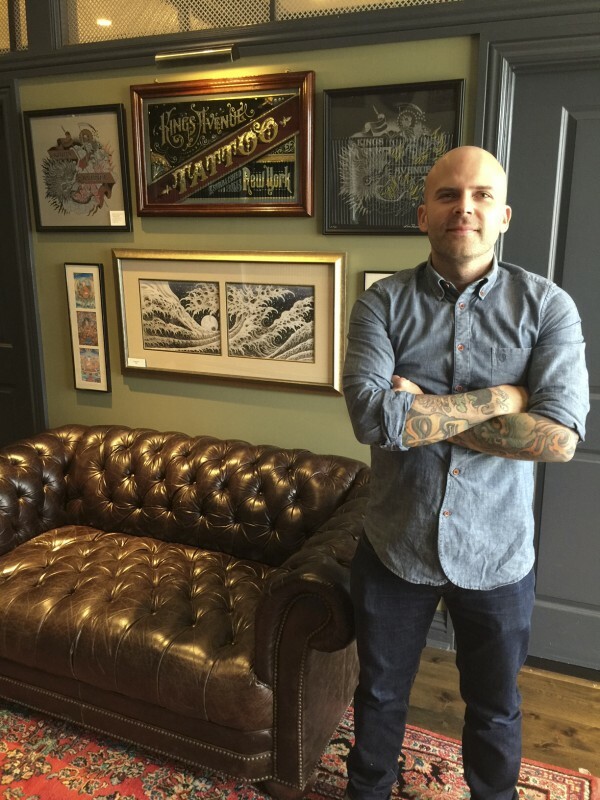 Ludlow and Blunt blens a heritage barbershop narrative with modern day techniques & Craftsmanship. 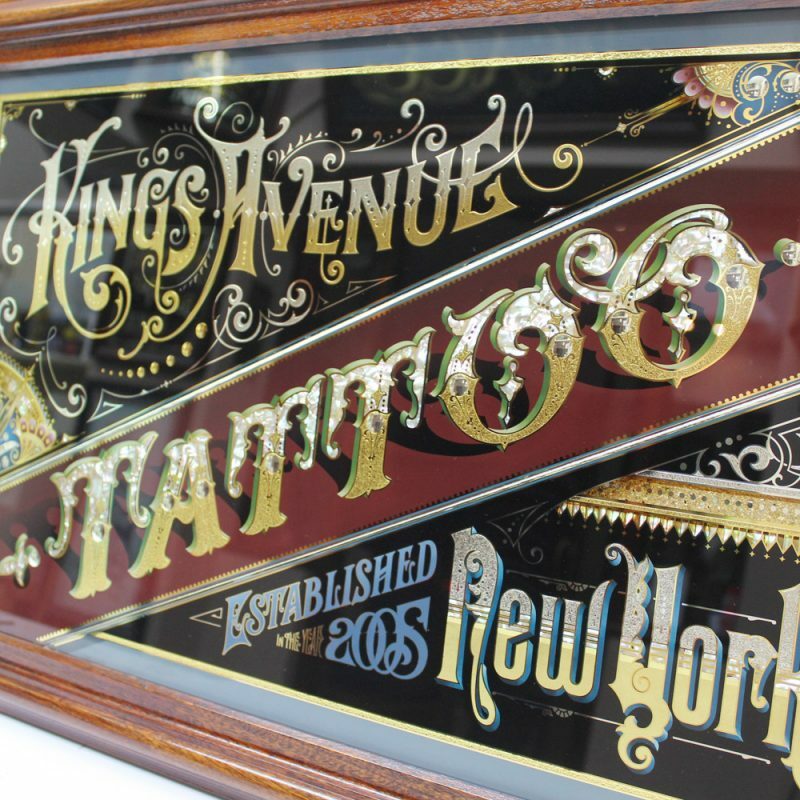 If you are in New York this is the place for a proper haircut vintage style! 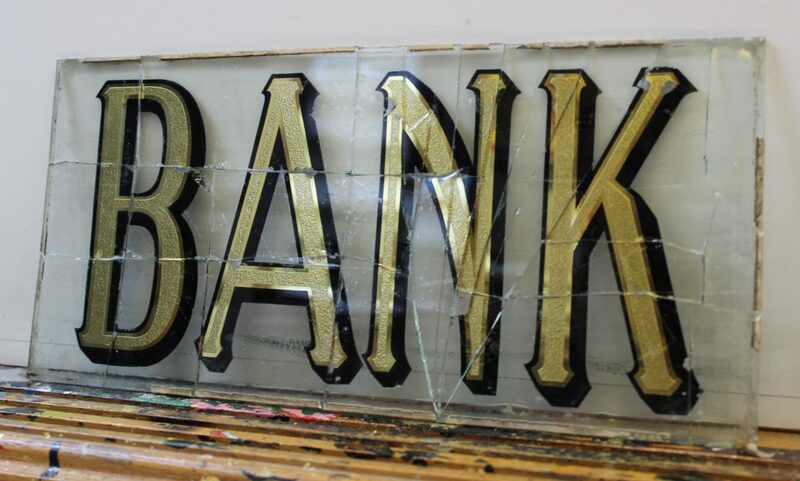 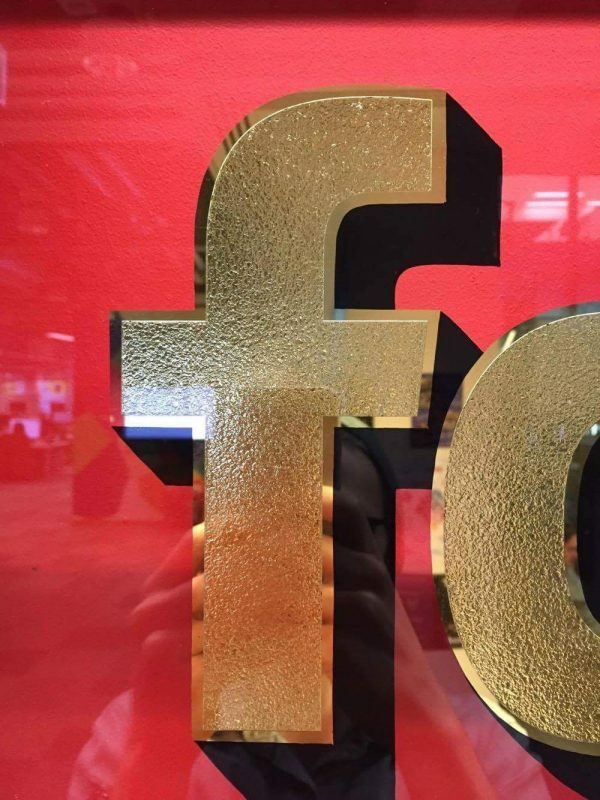 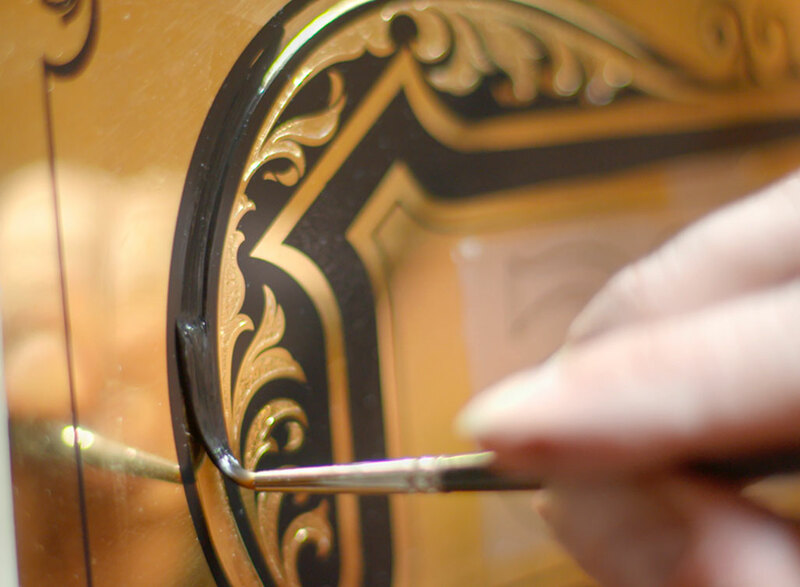 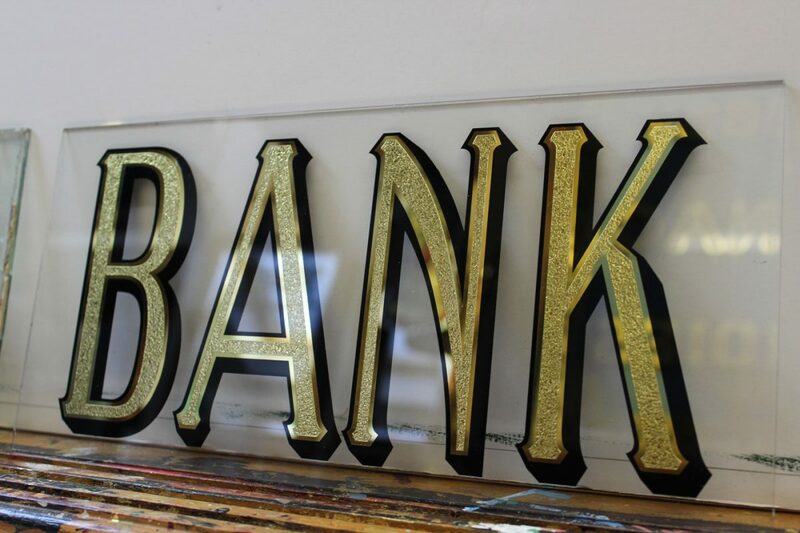 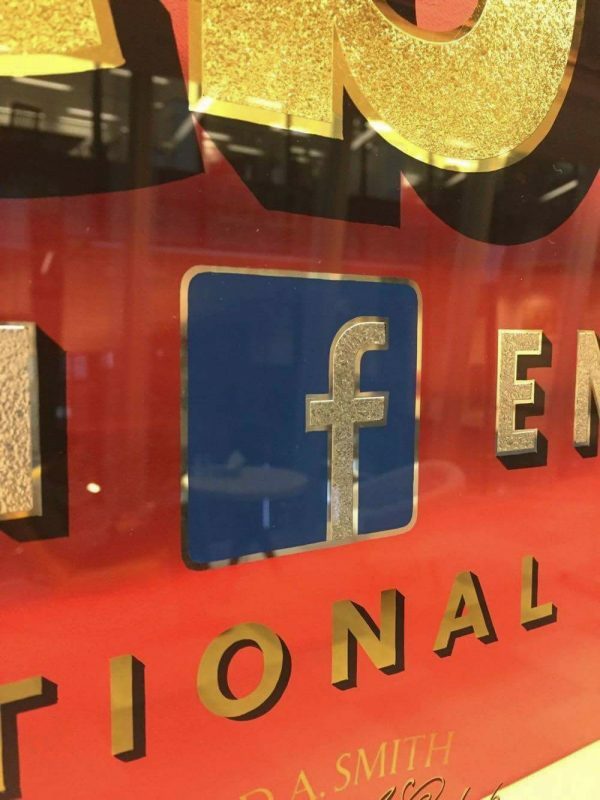 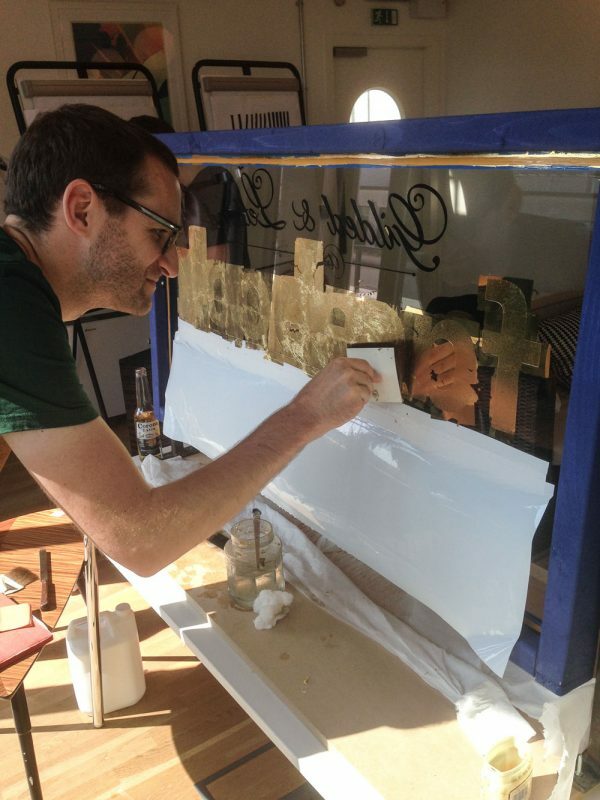 The glass has been heat bended in a kiln and the lettering is deep blasted and gilded in 23 crt gold leaf. 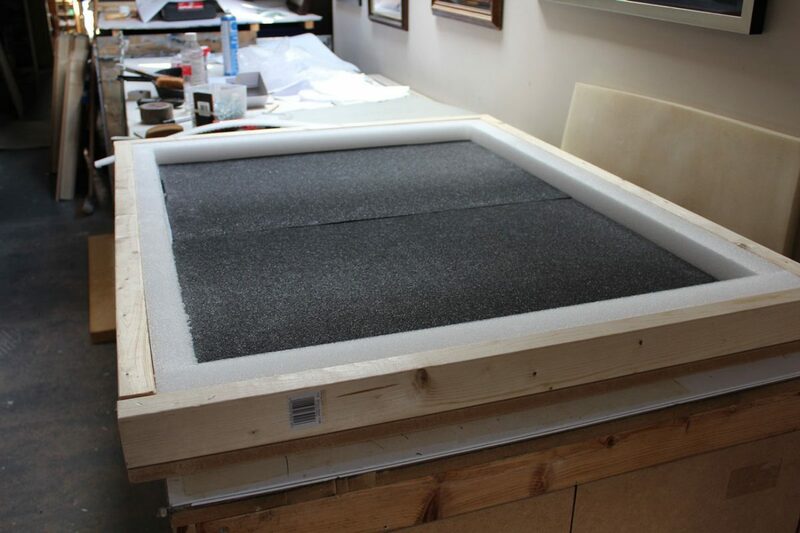 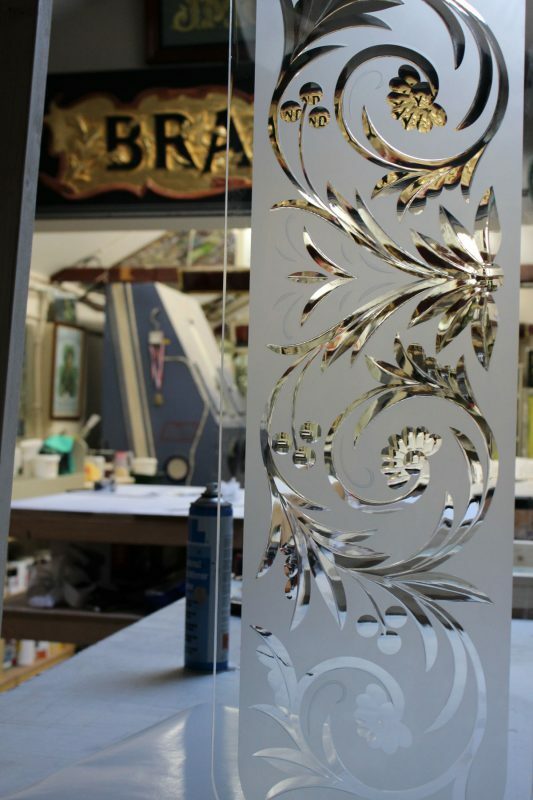 The border has been glass nipped to create a bright facet effect and brilliance against the 18 crt bright lustre gild. 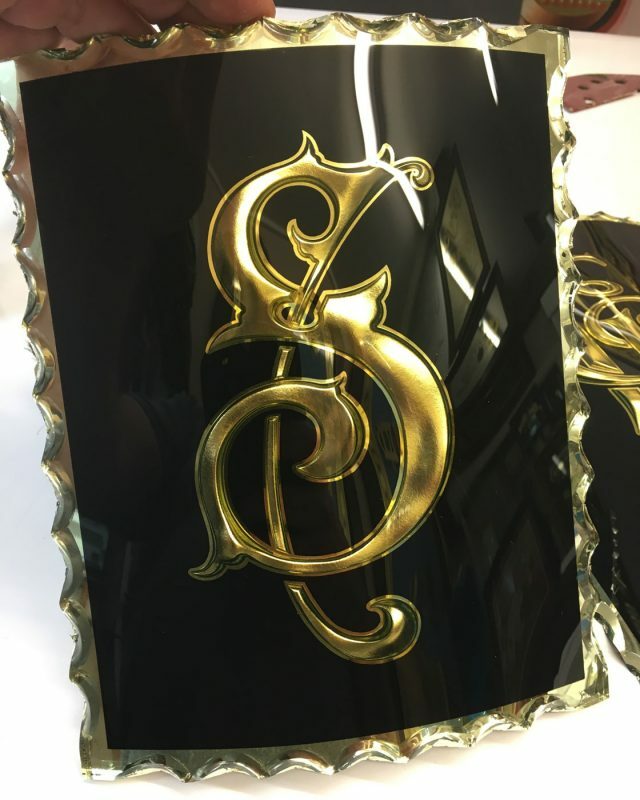 The letter S has the same techniques. 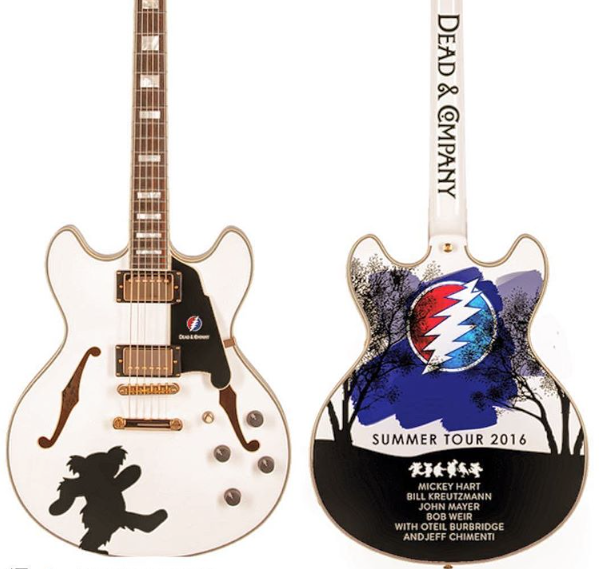 Both pieces were all hand made with no computer help just good old fashioned craftsmanship! 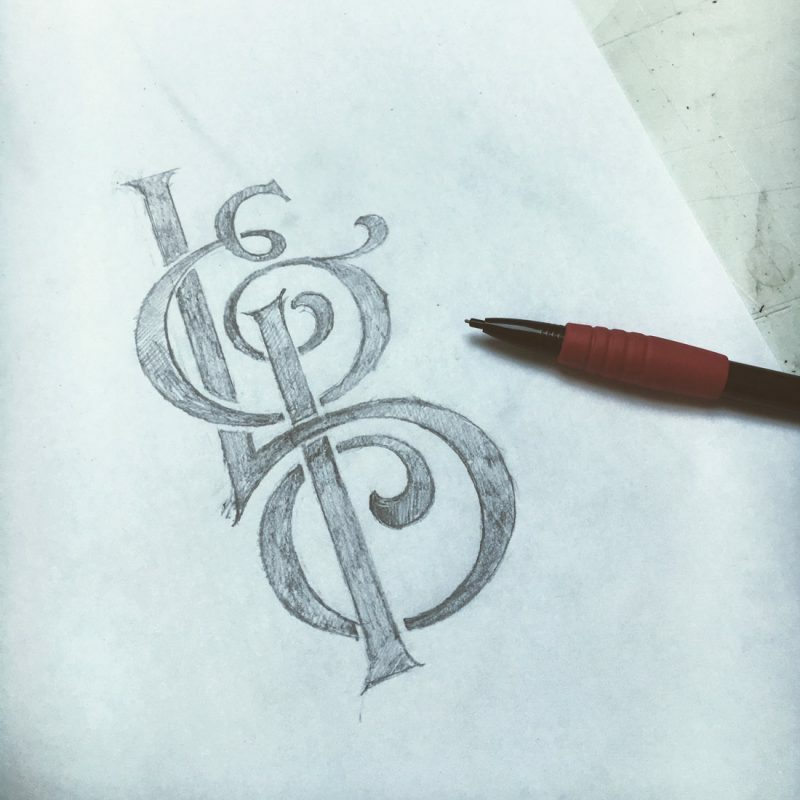 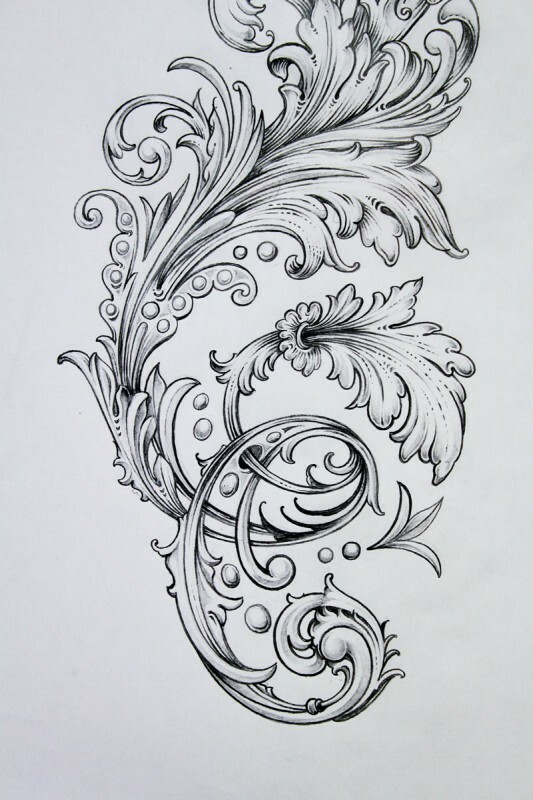 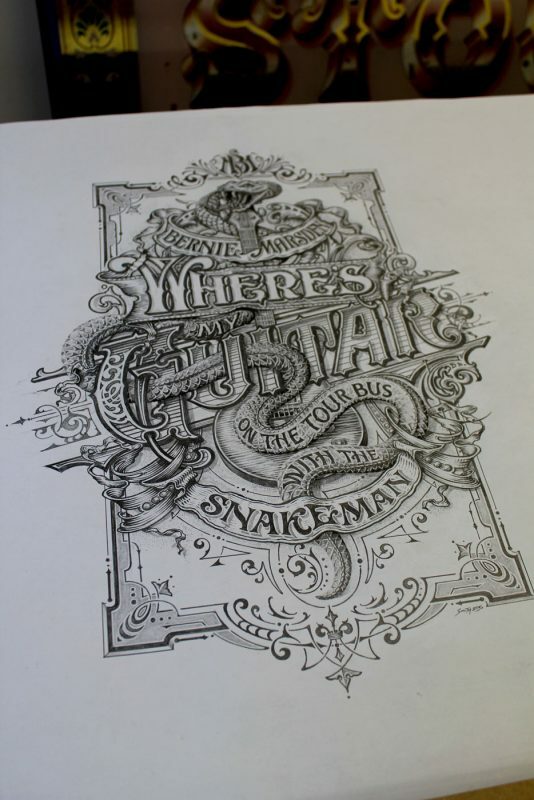 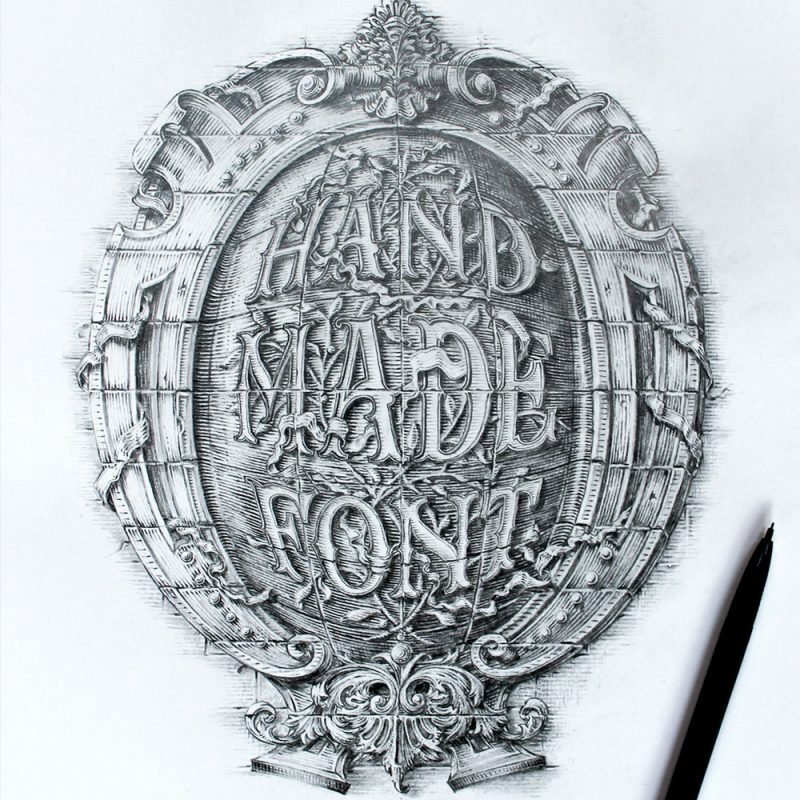 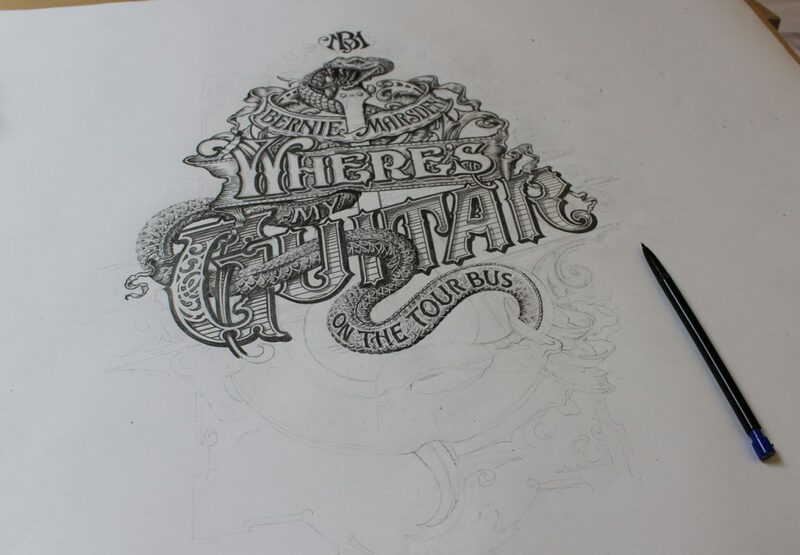 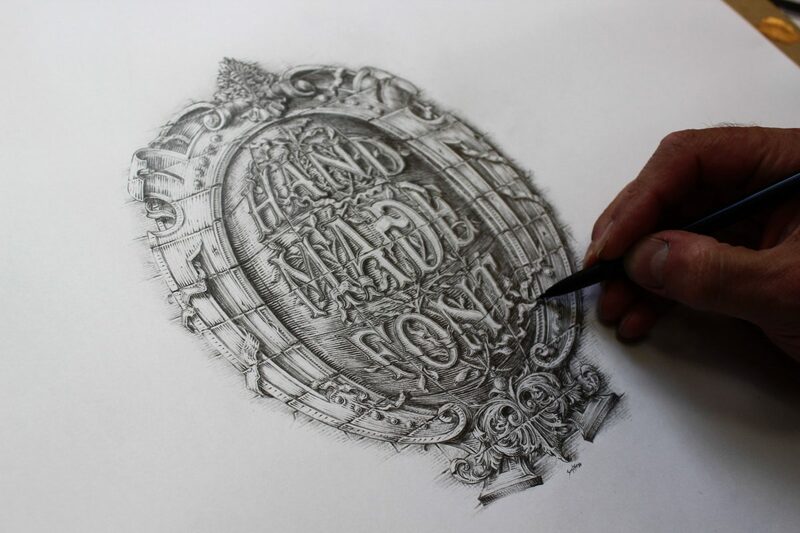 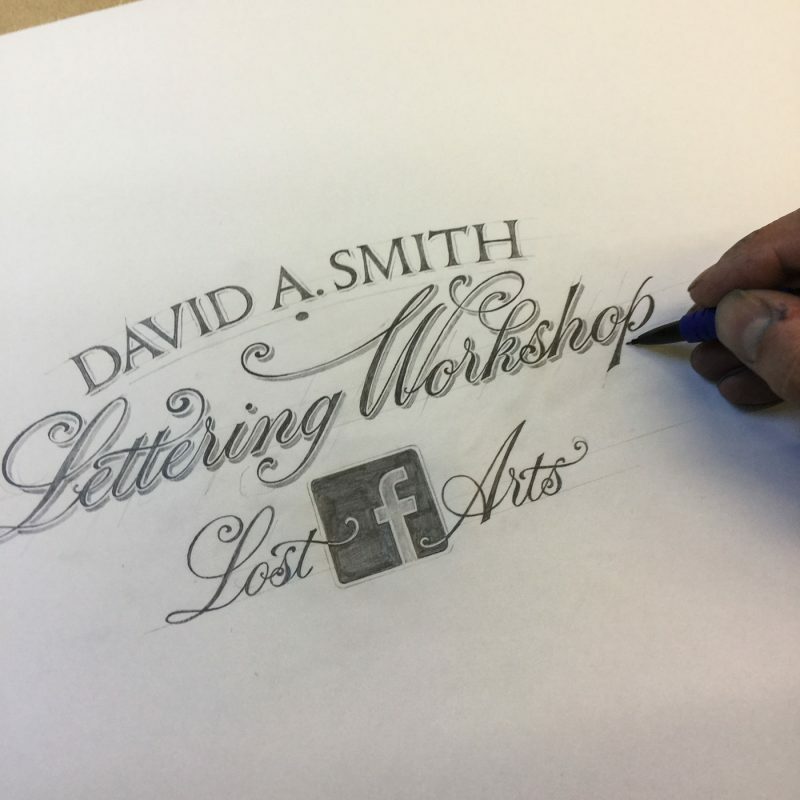 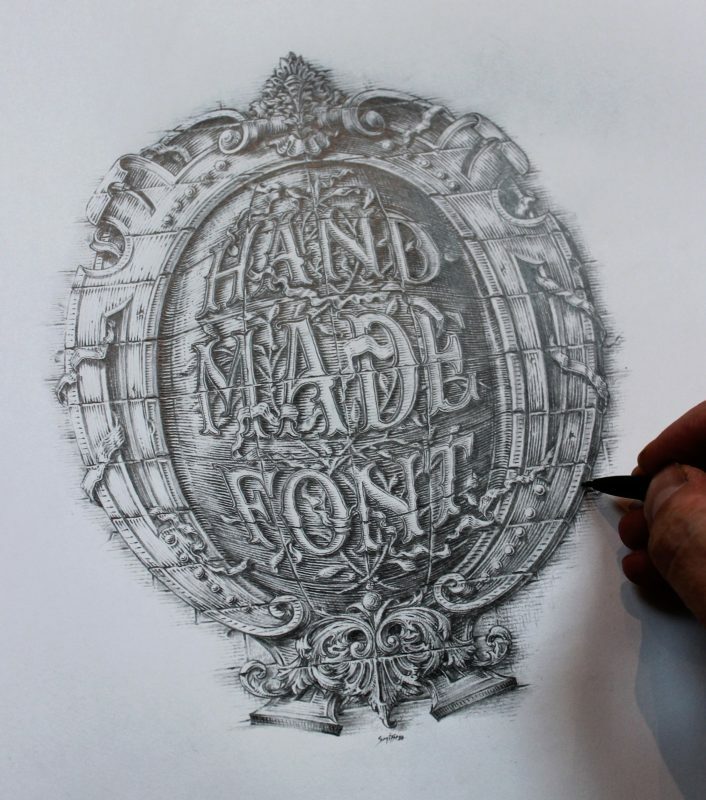 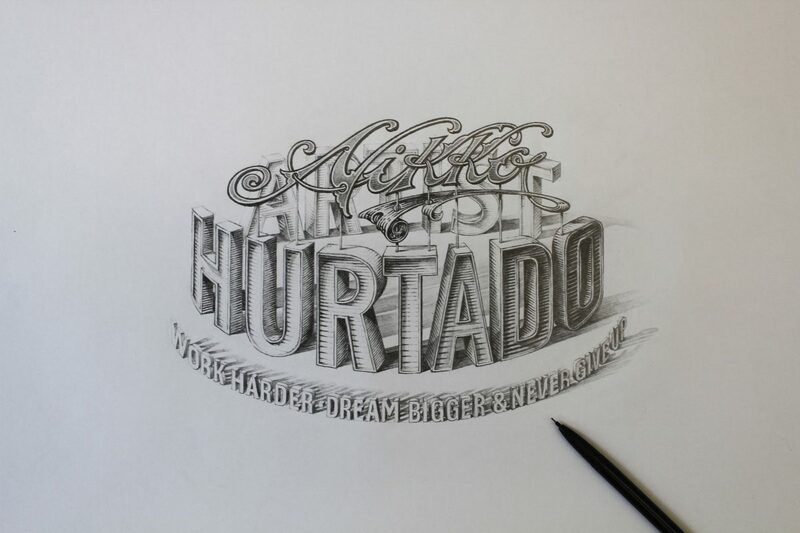 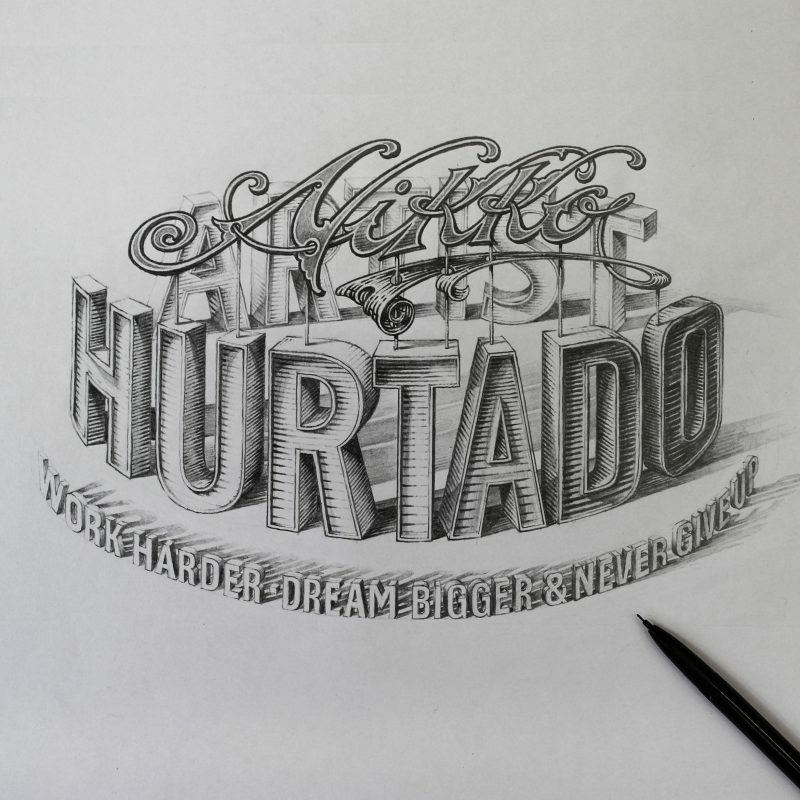 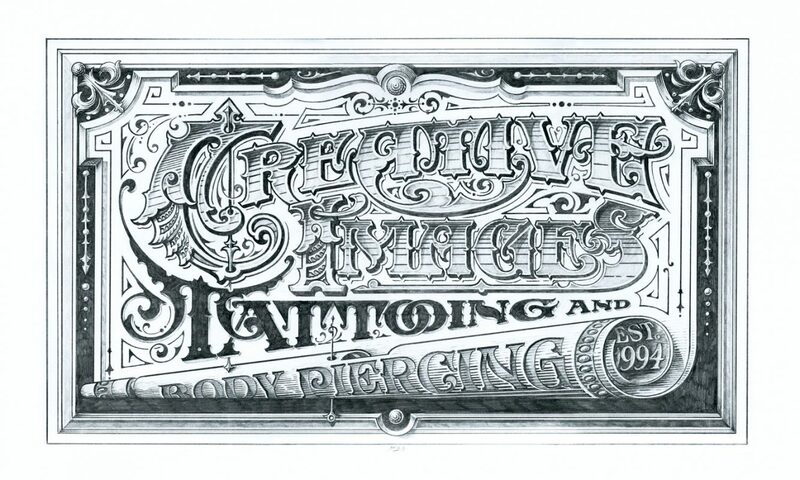 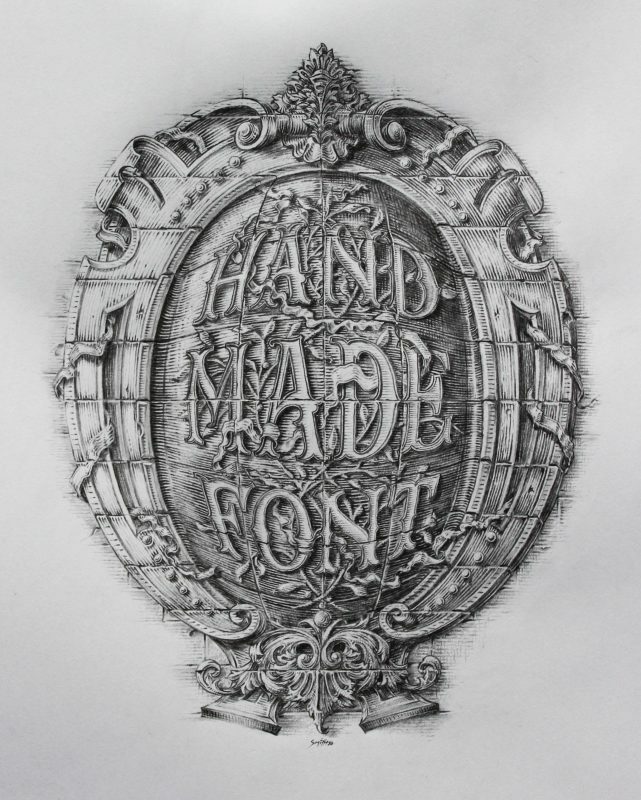 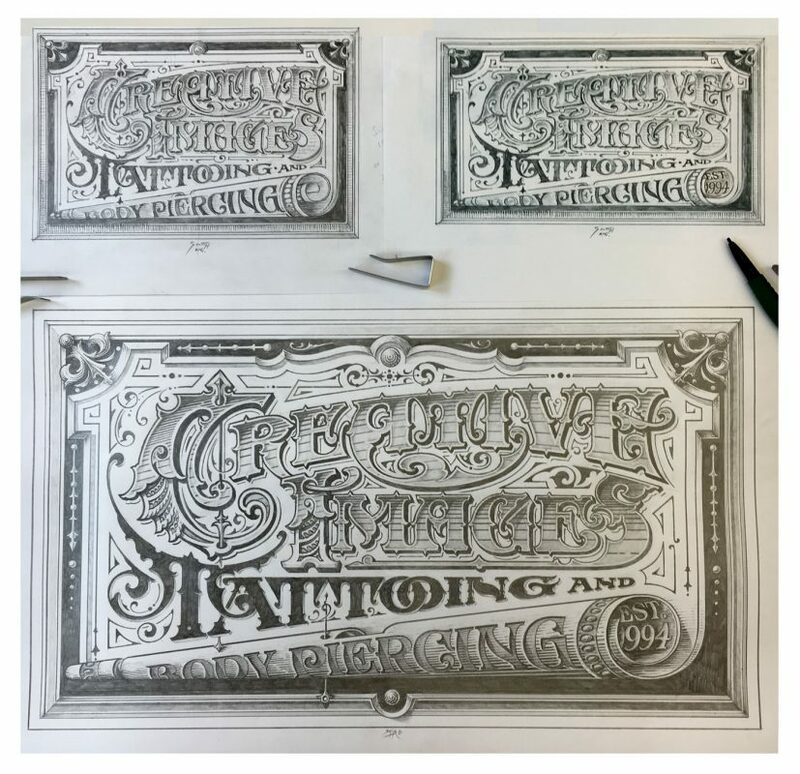 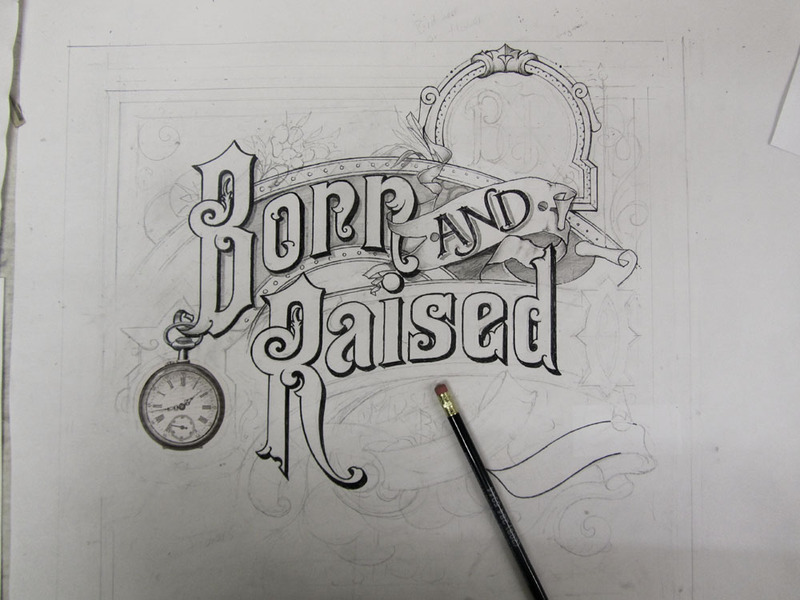 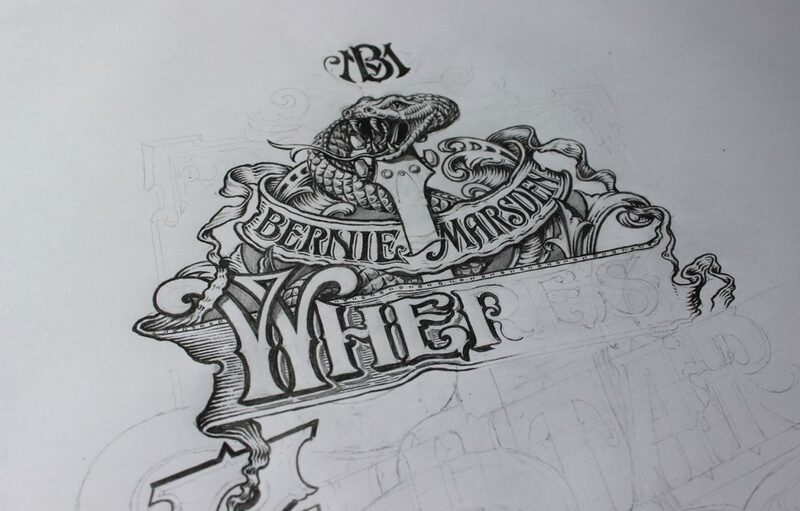 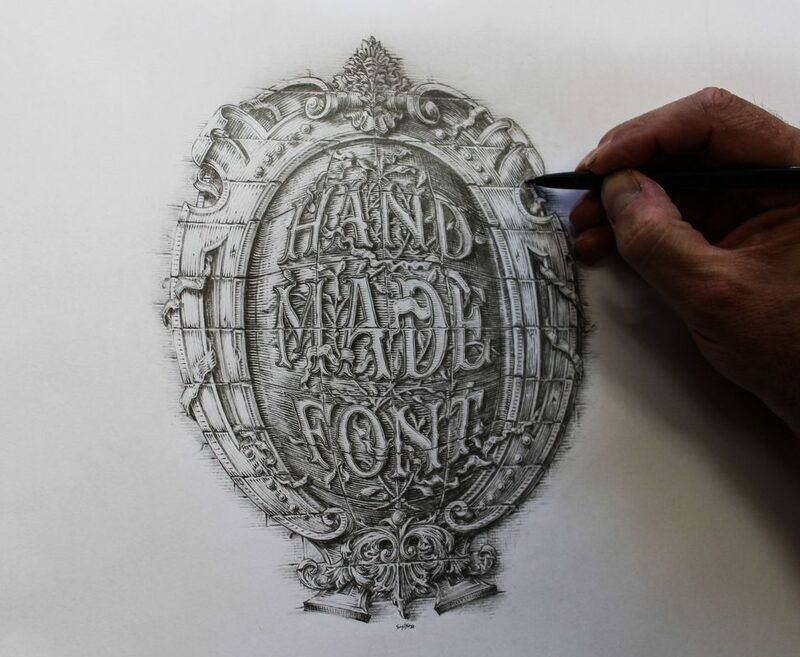 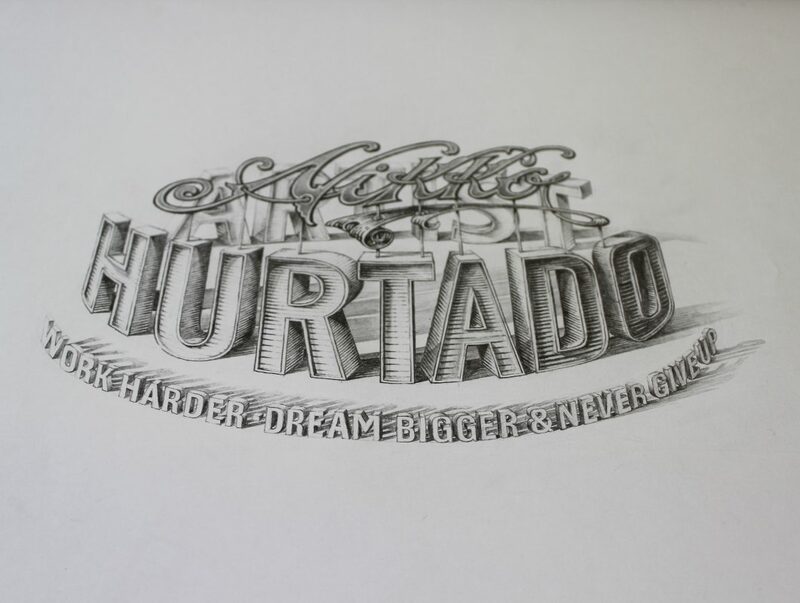 Hand Sketched artwork in pencil finish for the website HAND MADE FONT. 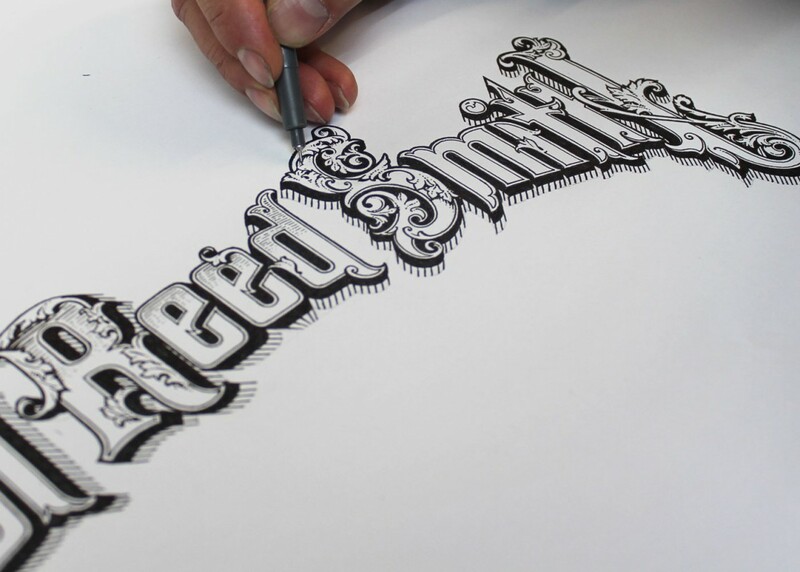 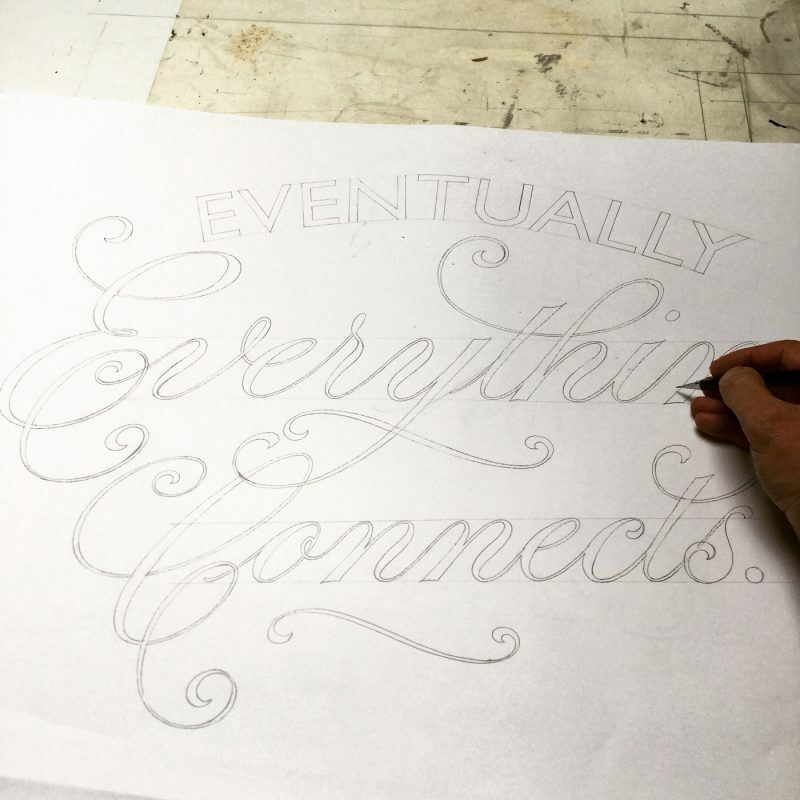 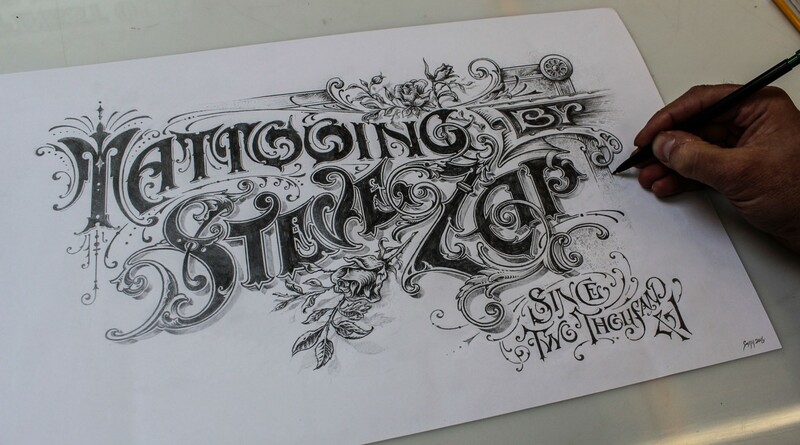 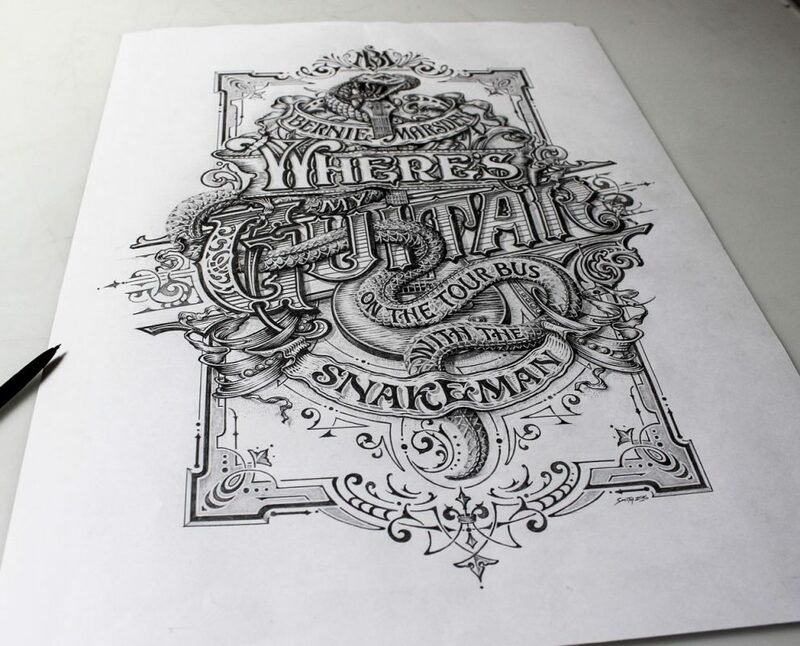 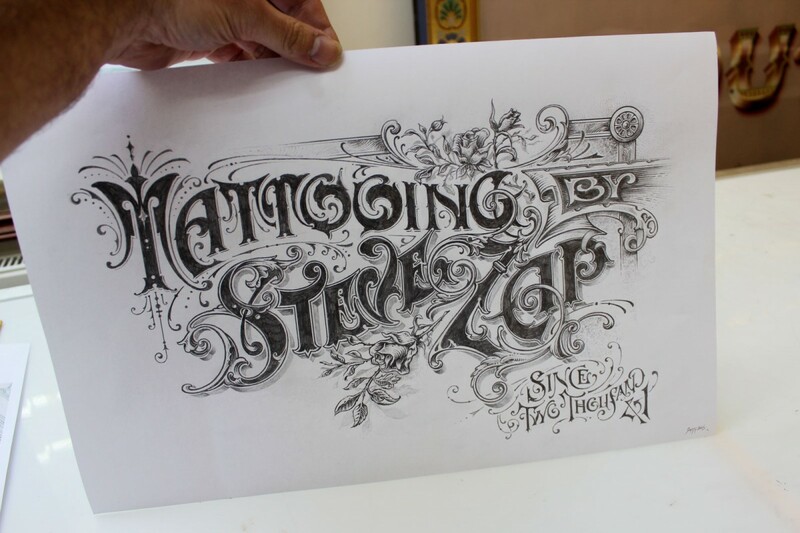 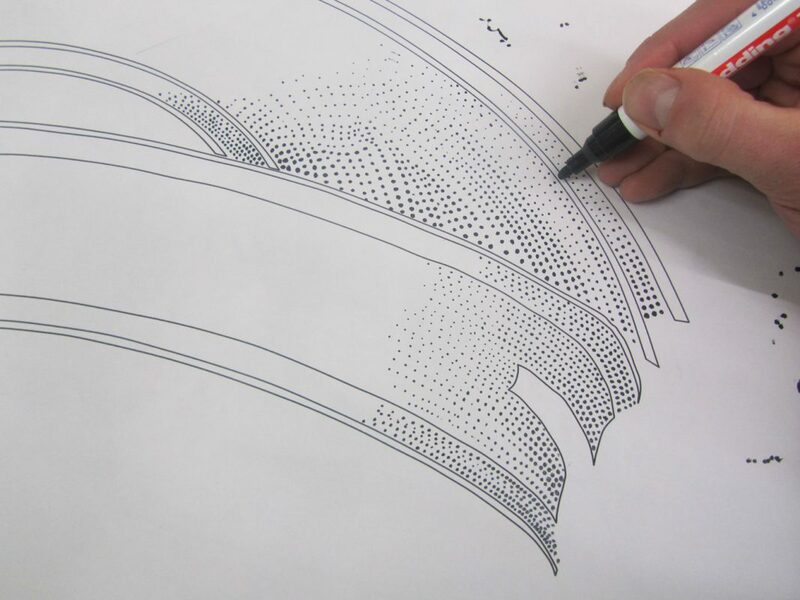 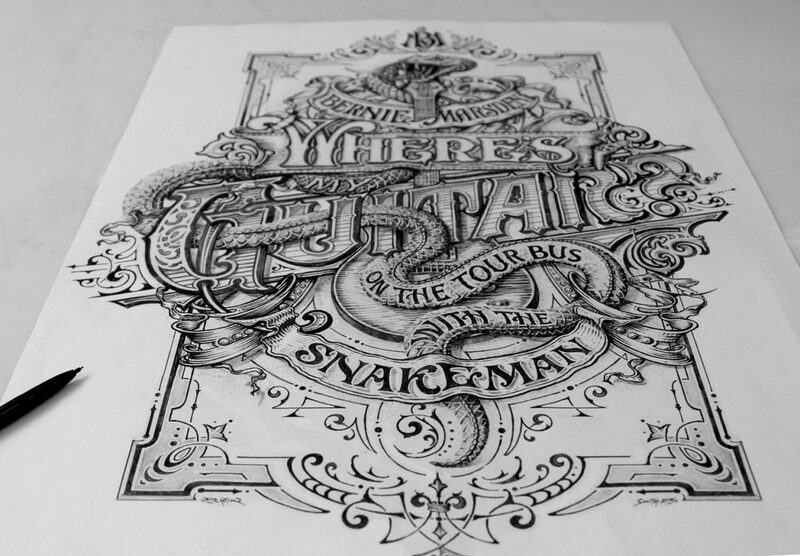 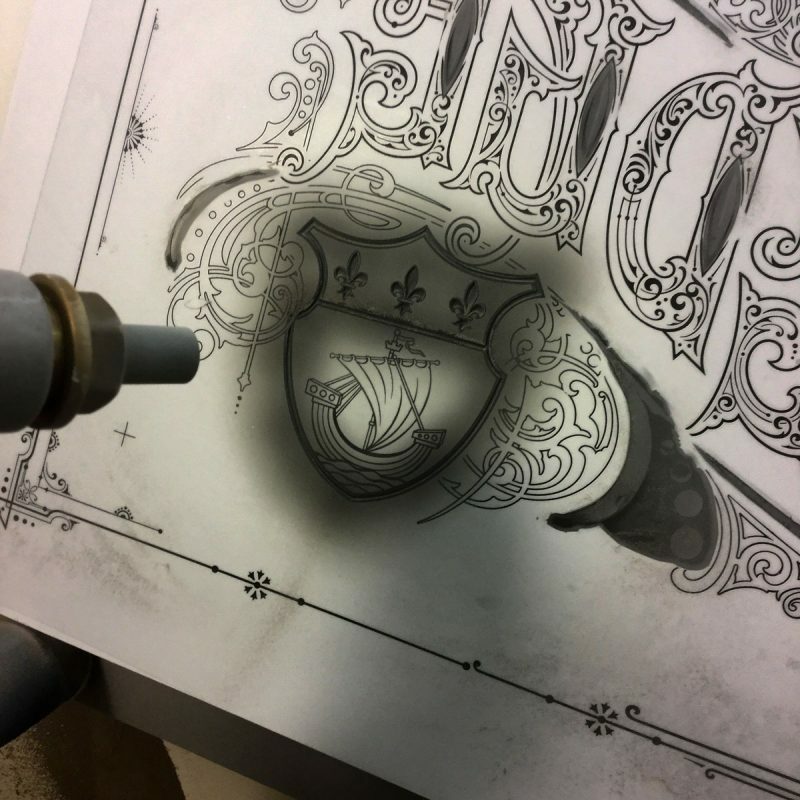 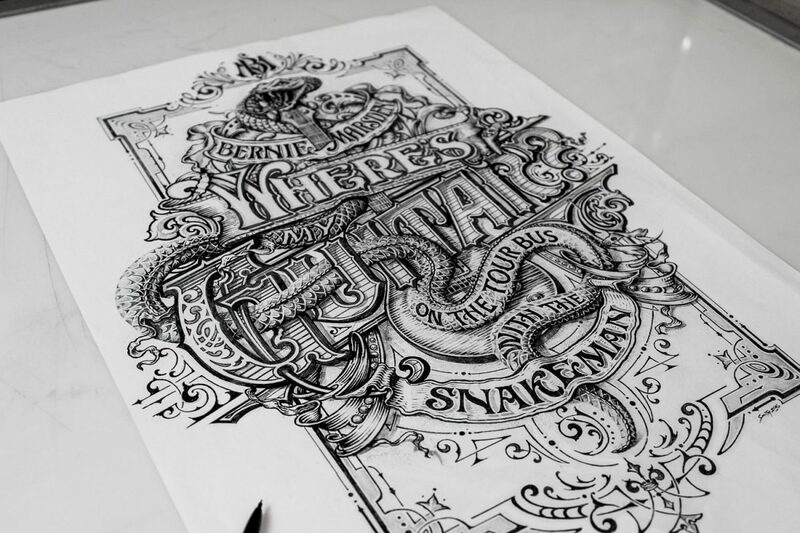 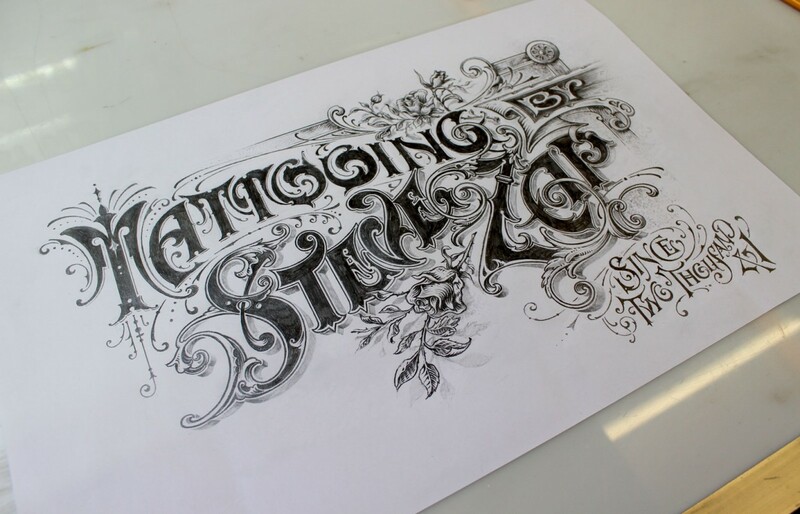 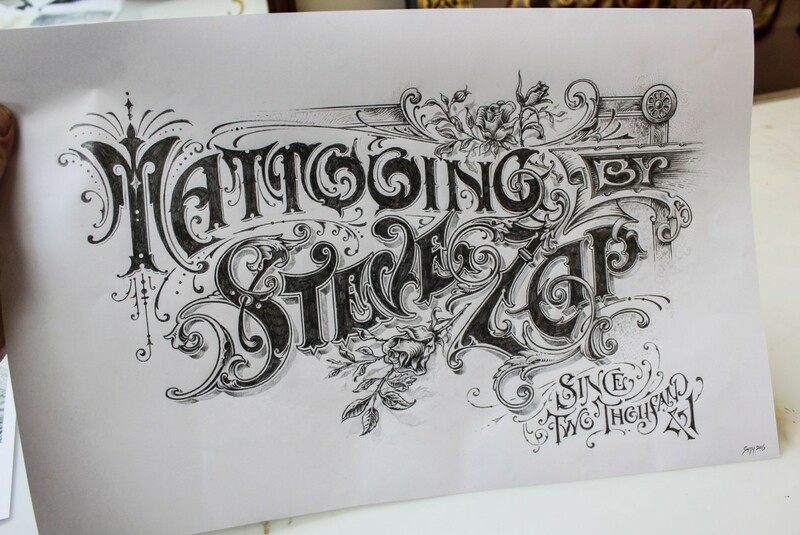 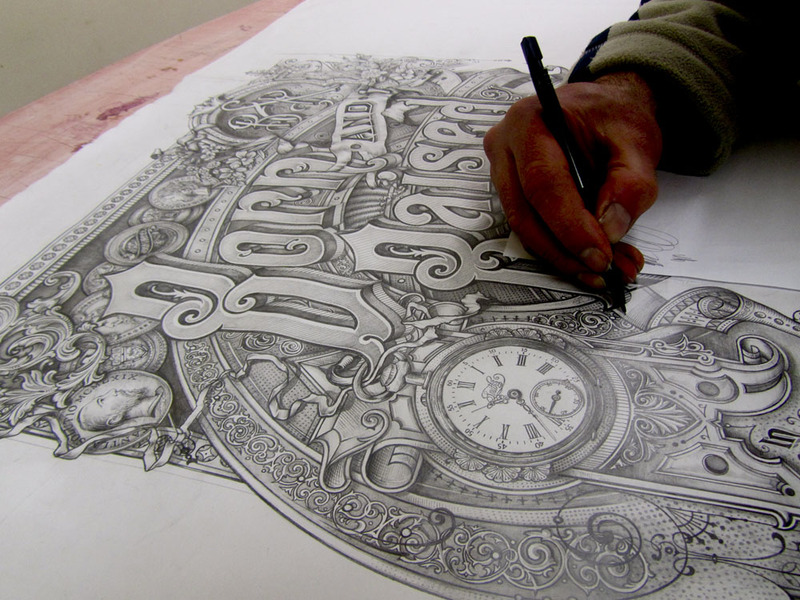 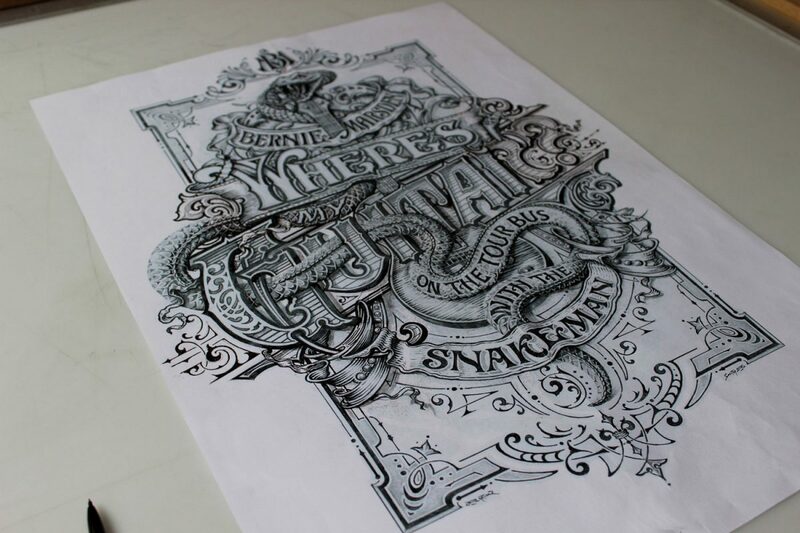 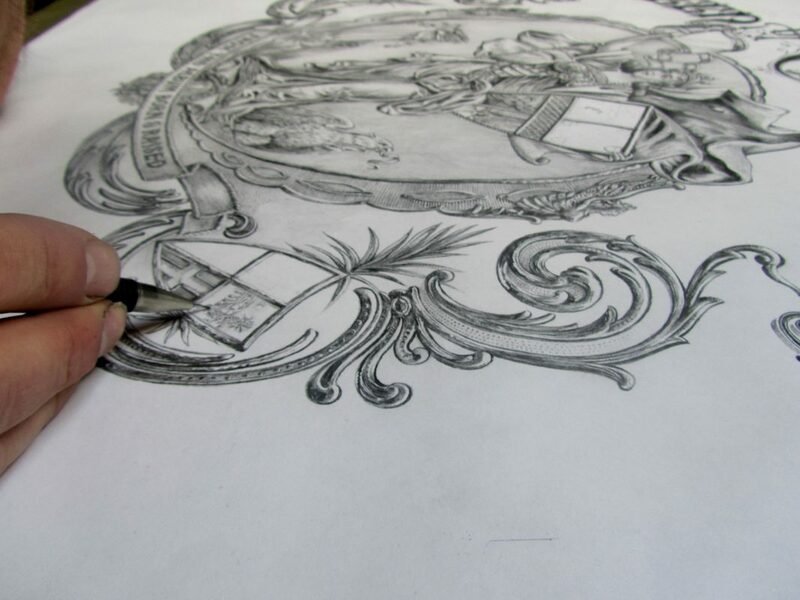 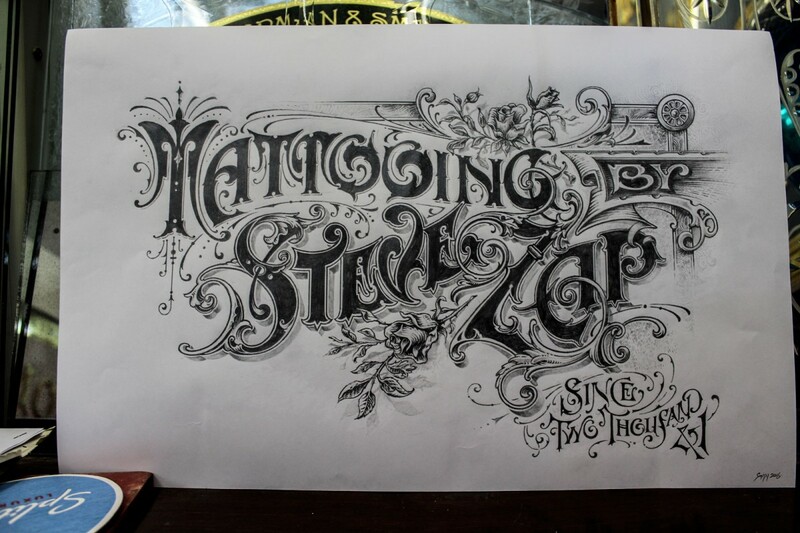 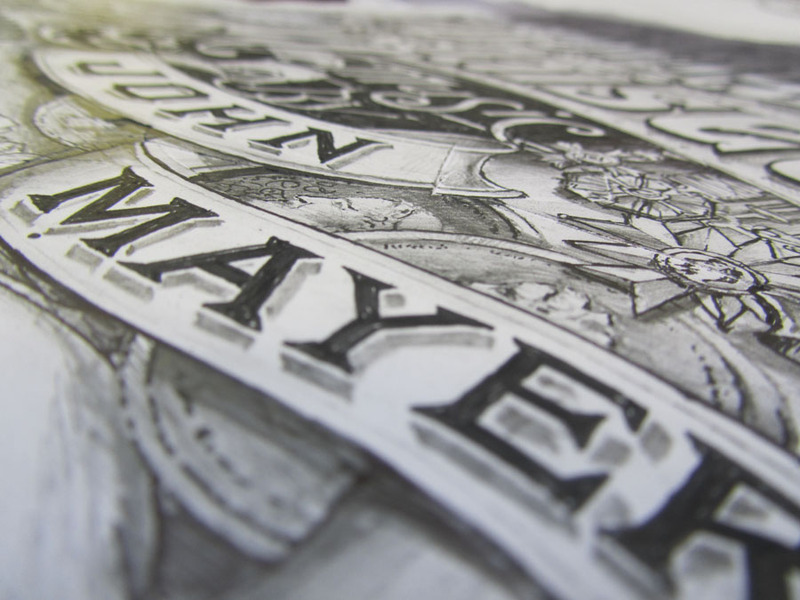 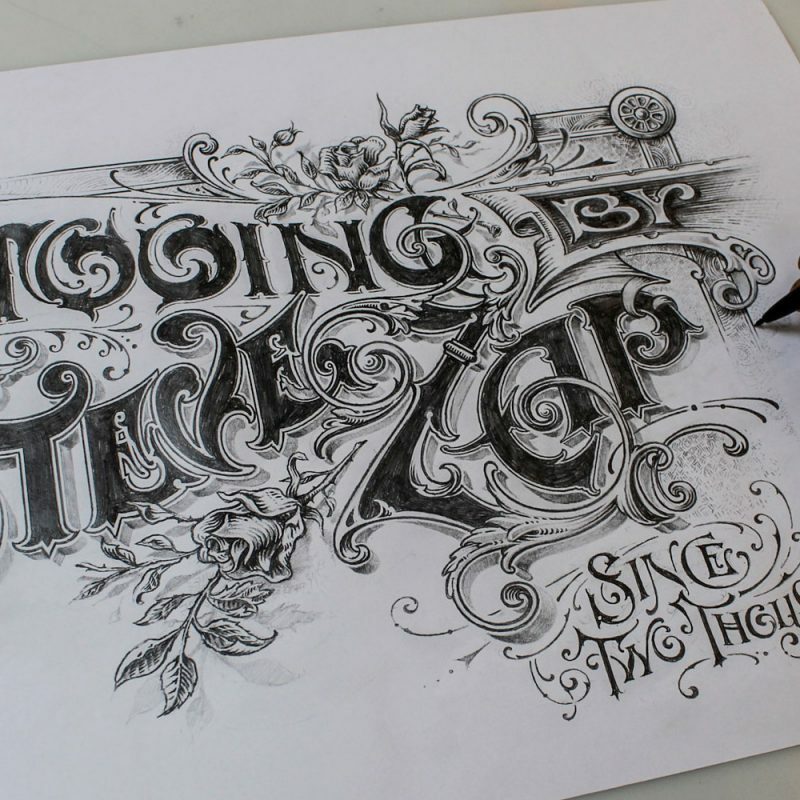 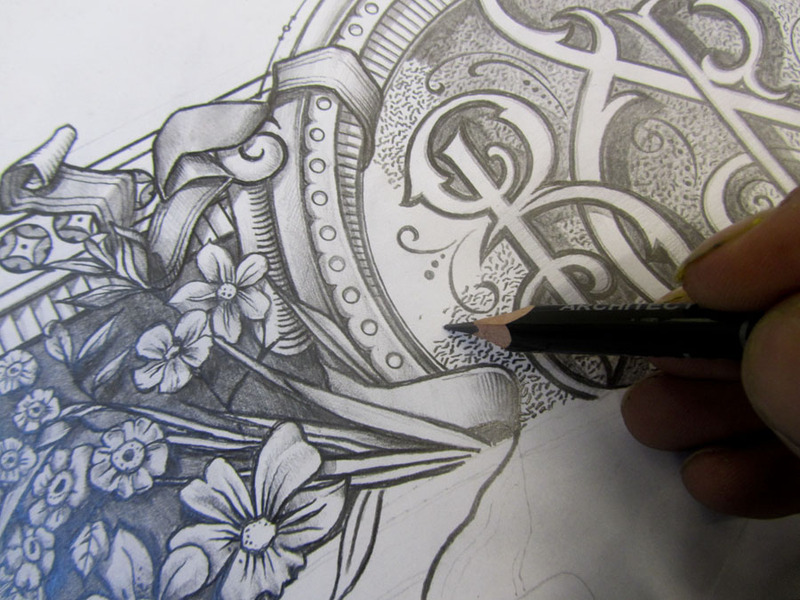 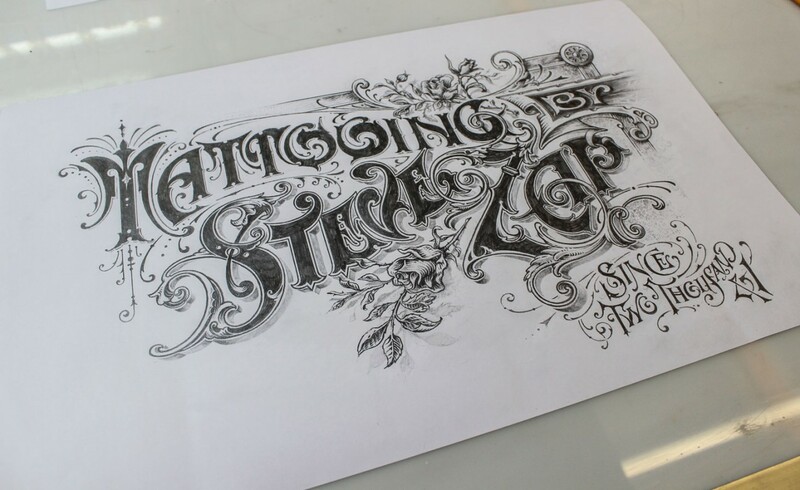 Hand drawn artwork for Steve Zap based in Miami, USA. 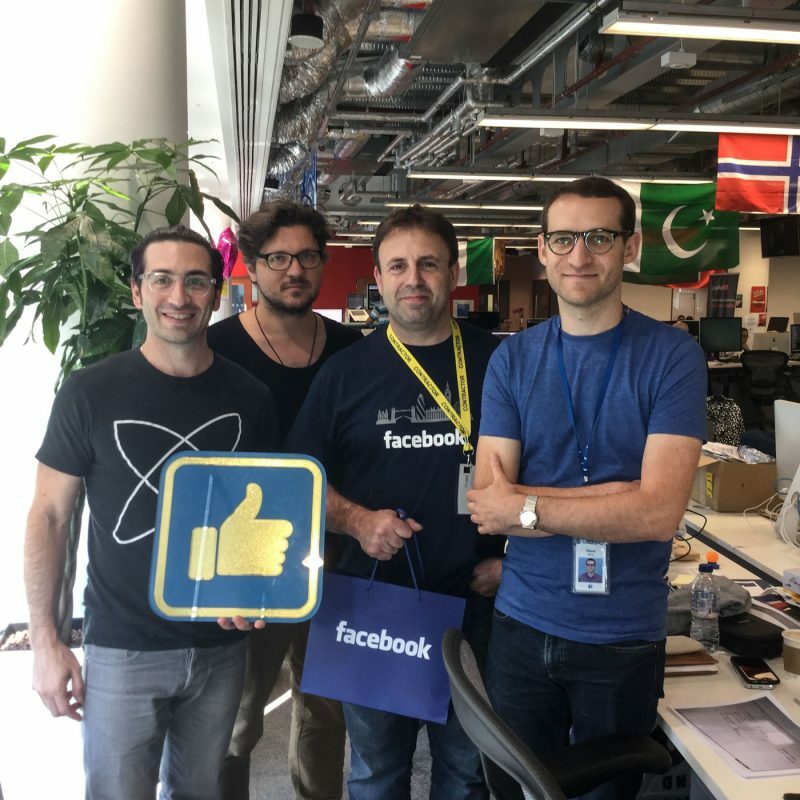 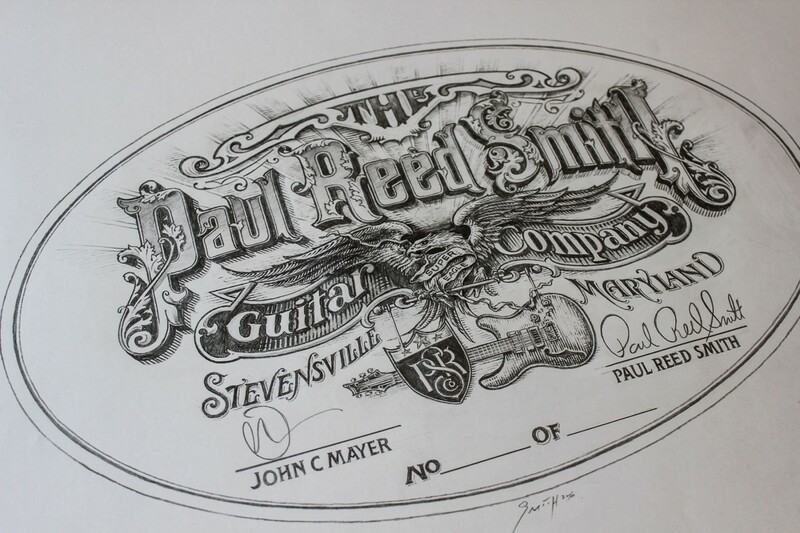 A present from his close friend in 2016. 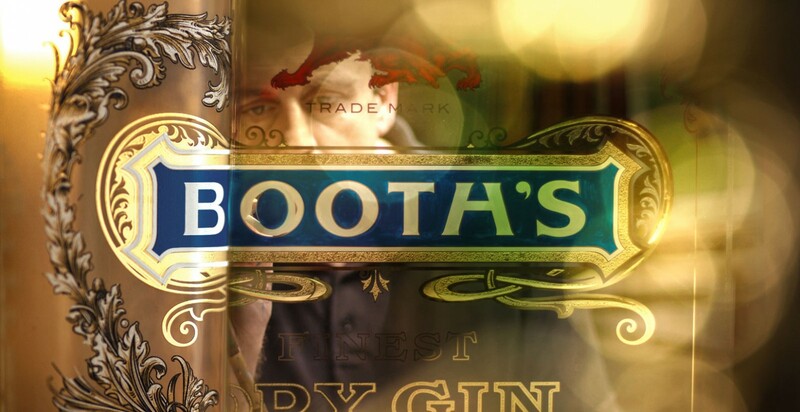 Booth’s has a fascinating story. 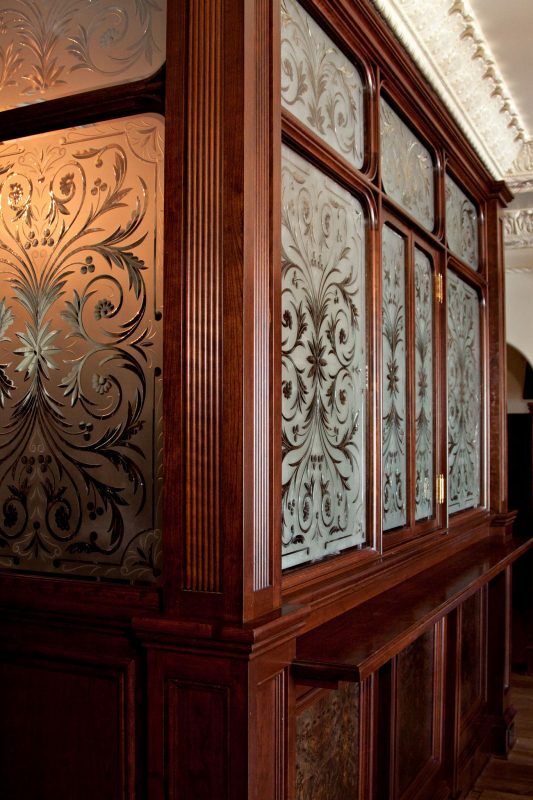 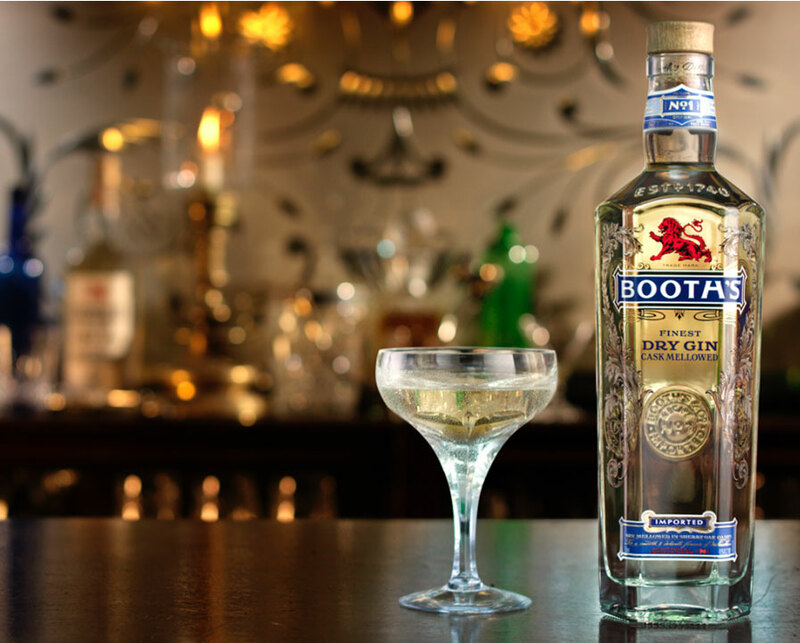 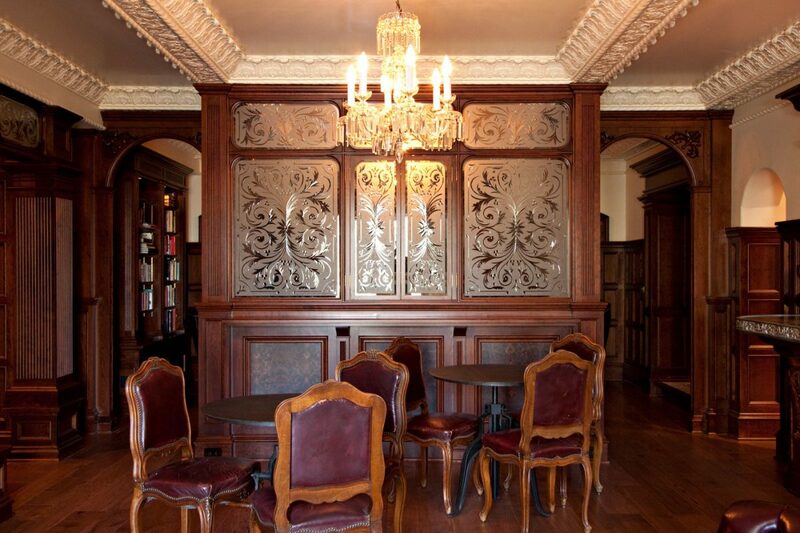 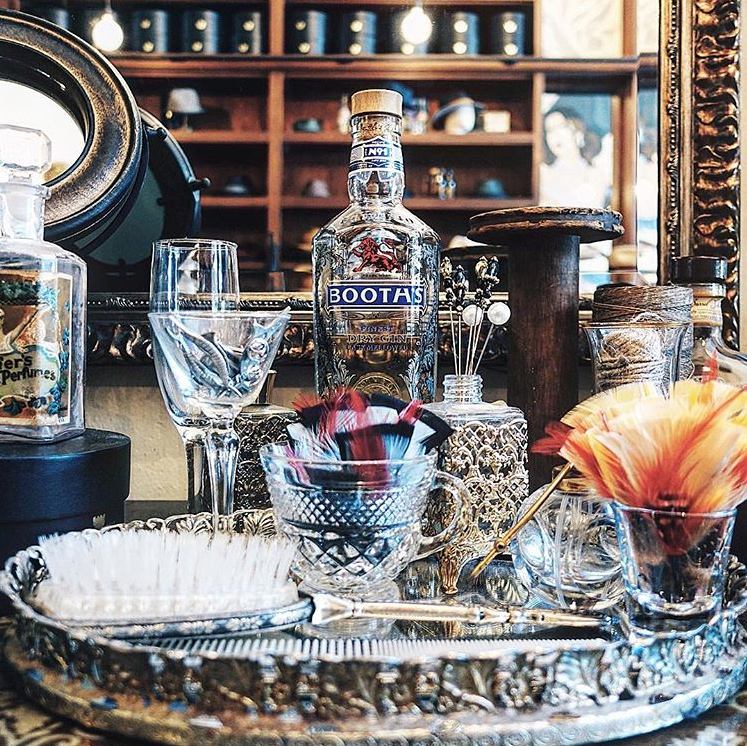 Savoured in Victorian gin palaces and favoured in the infamous hotel bars of the Golden Age of Cocktails, even King William IV was a Booth’s enthusiast. 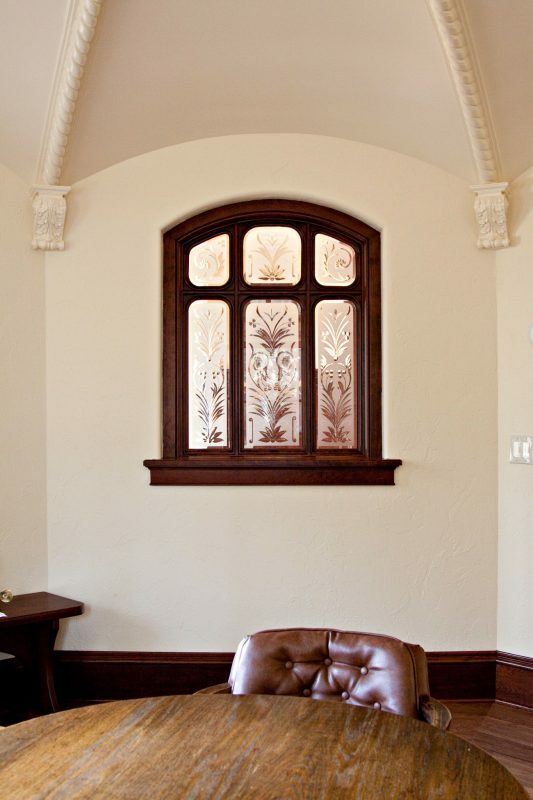 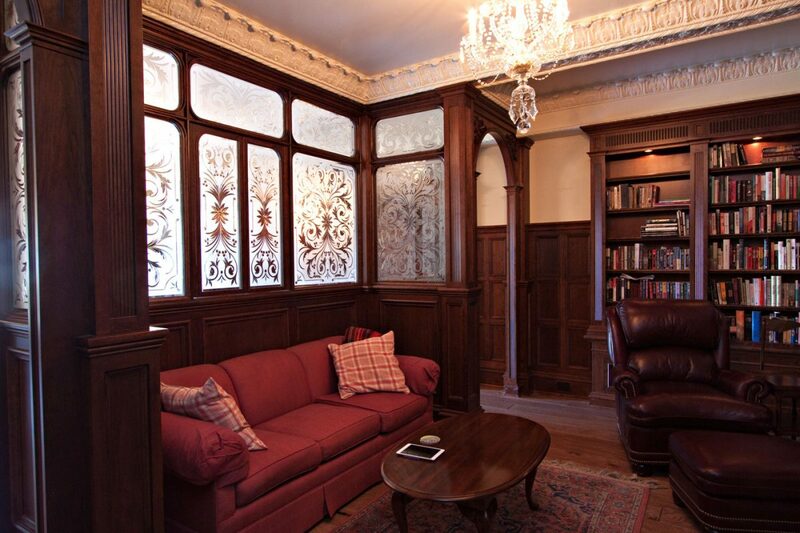 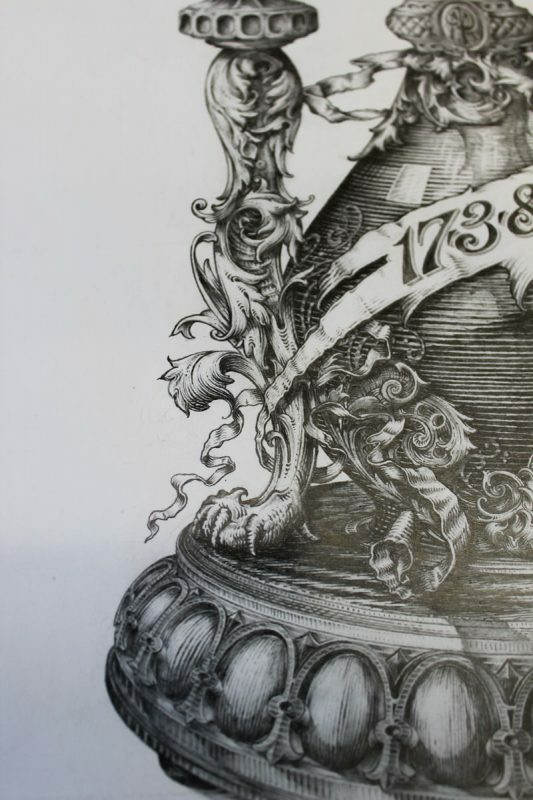 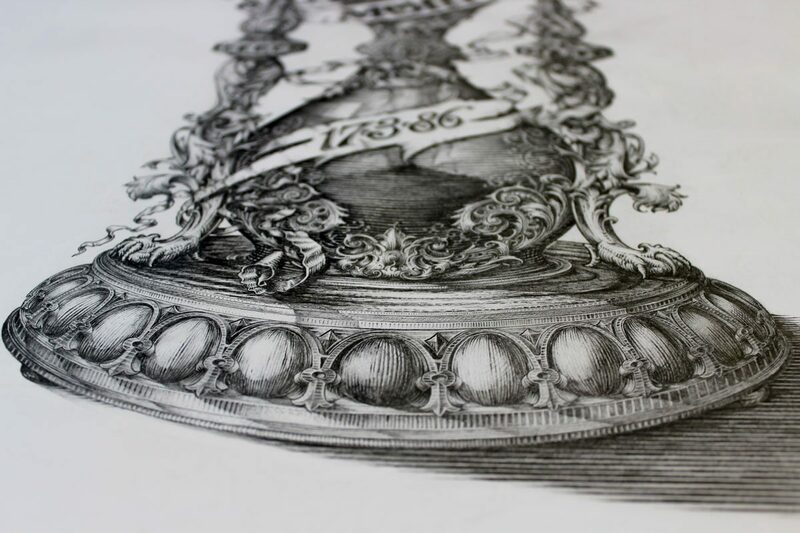 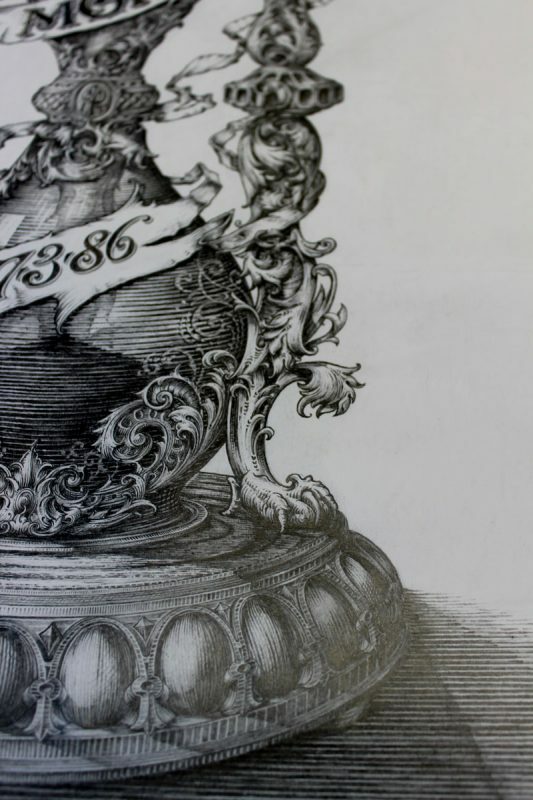 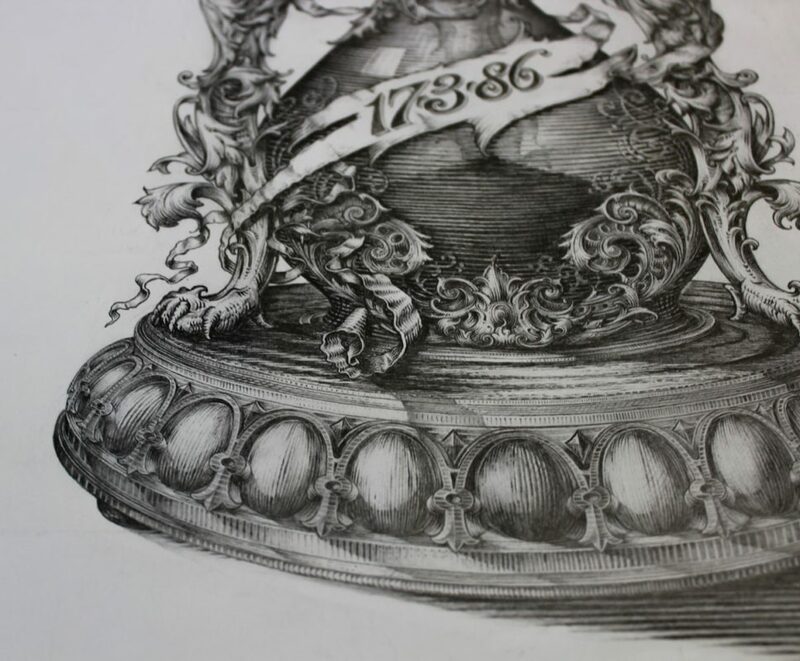 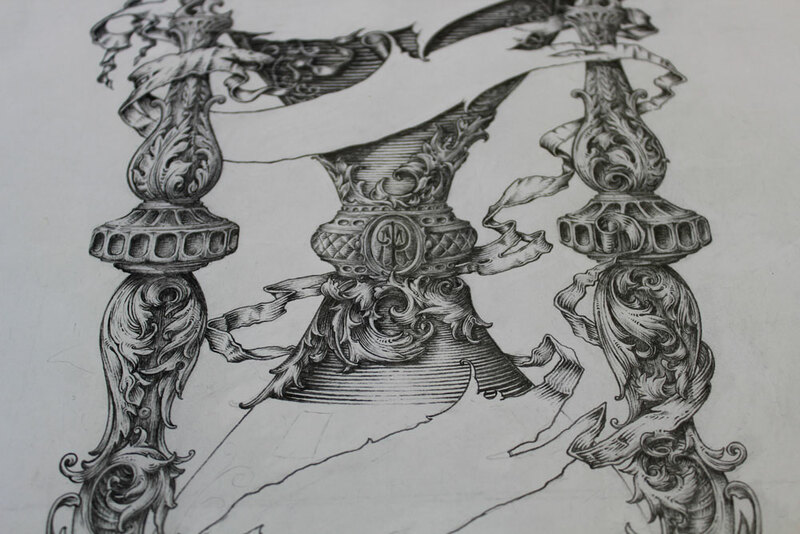 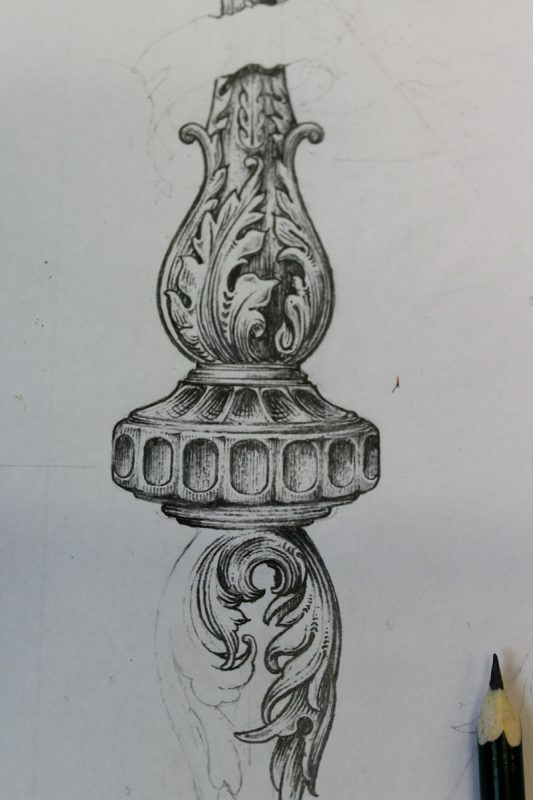 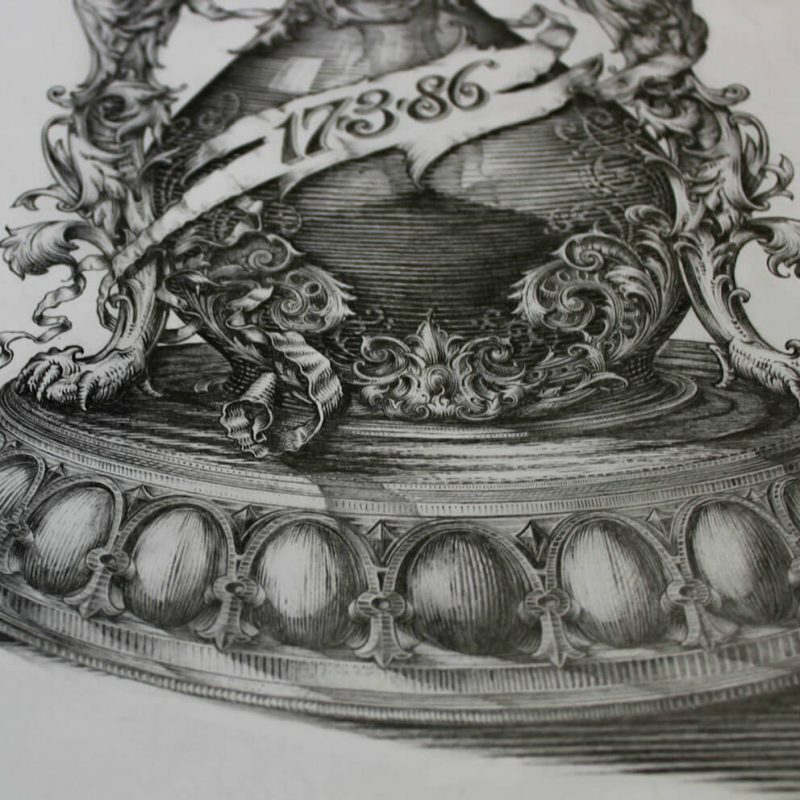 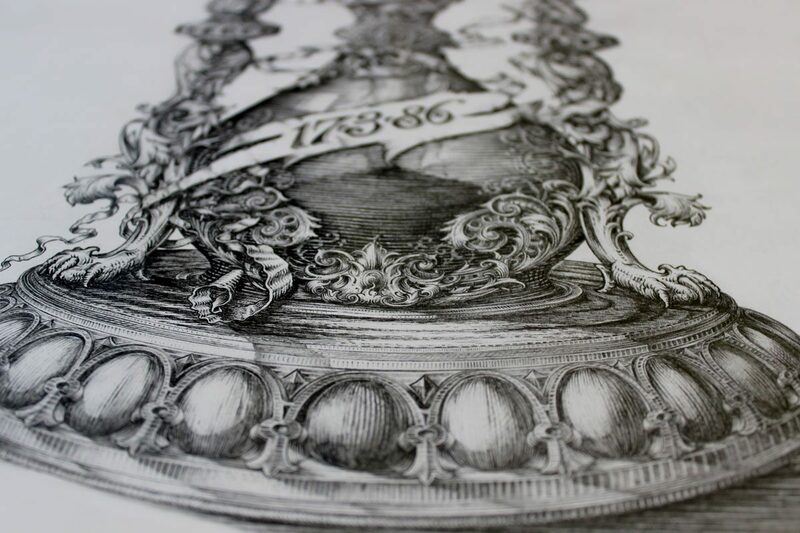 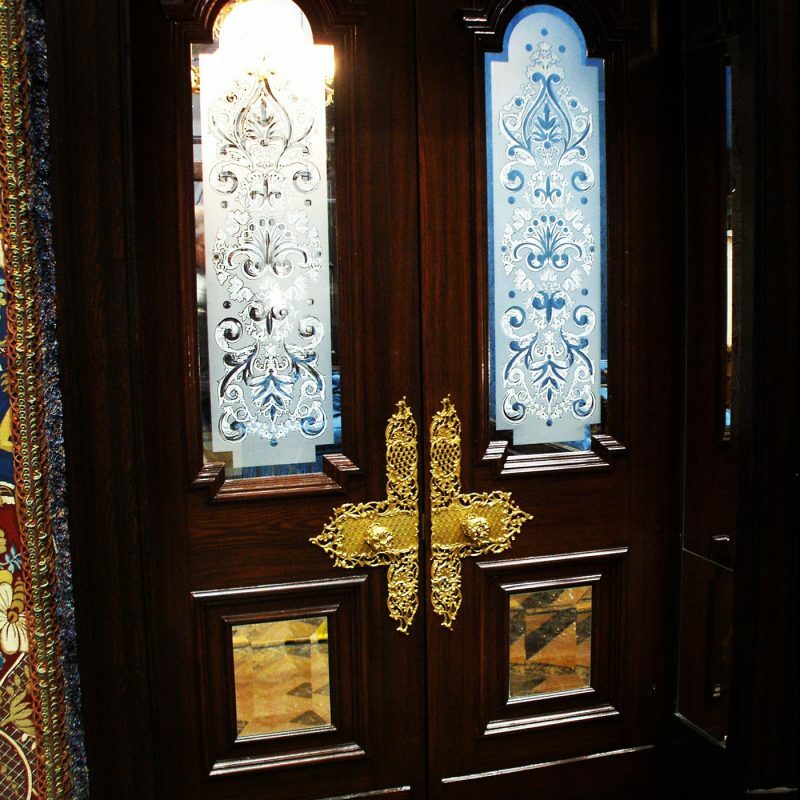 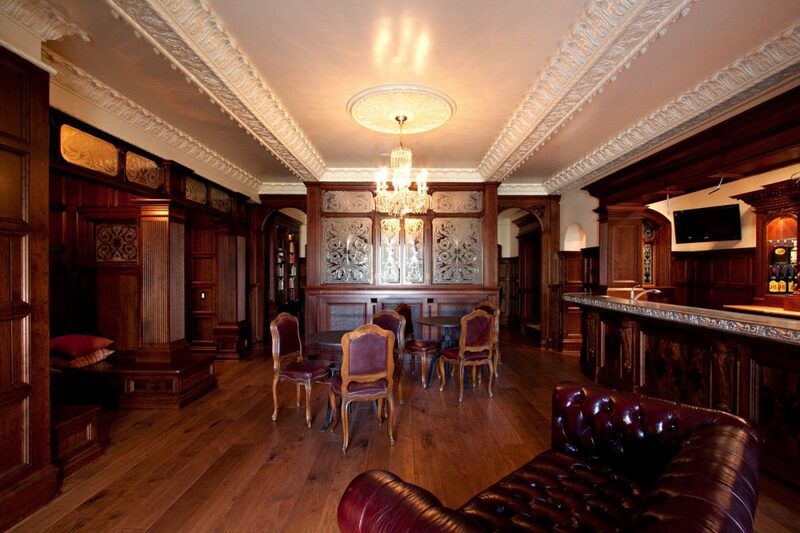 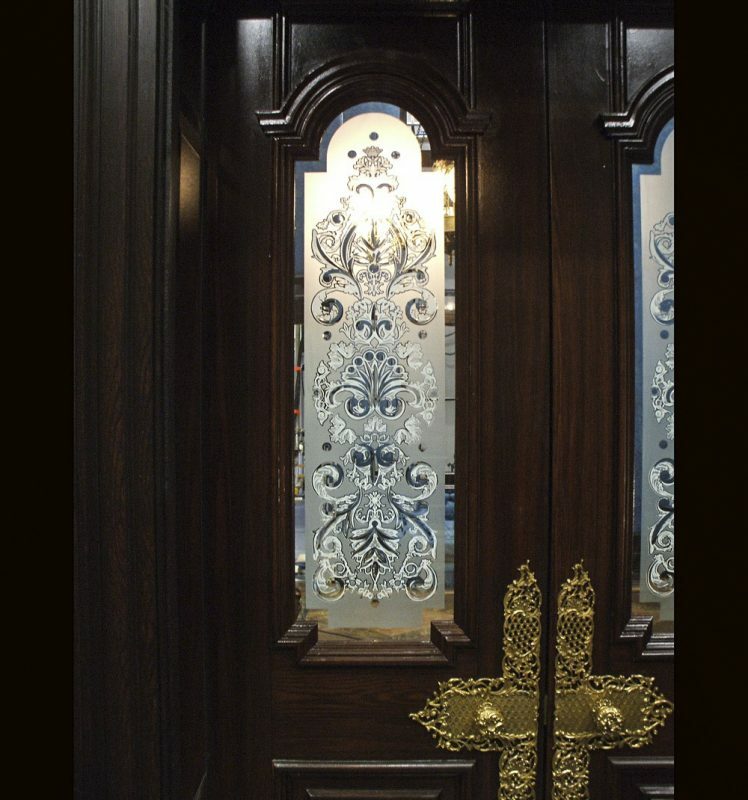 It was these historic references that inspired this design and the design really is in the detail. 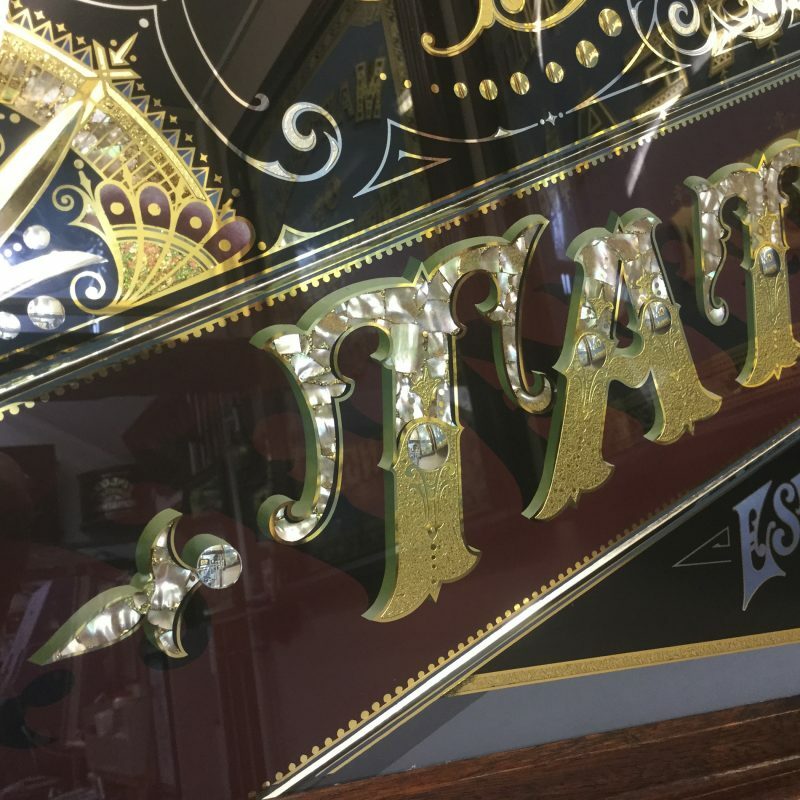 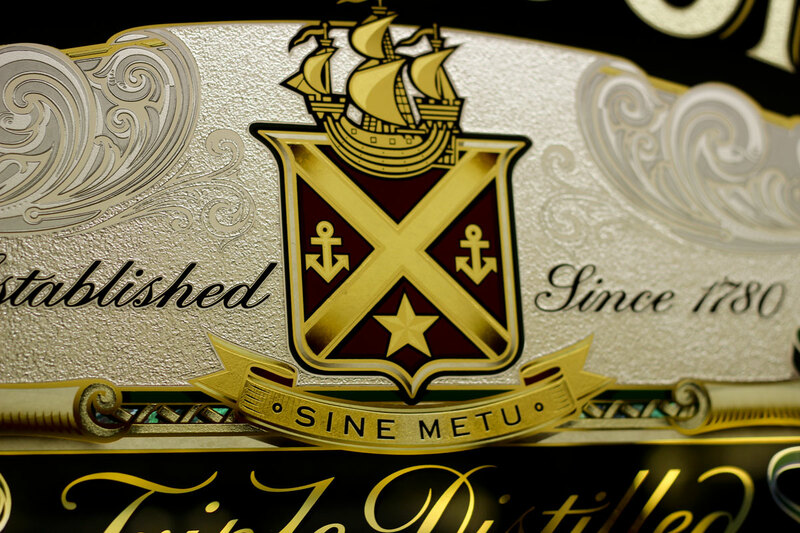 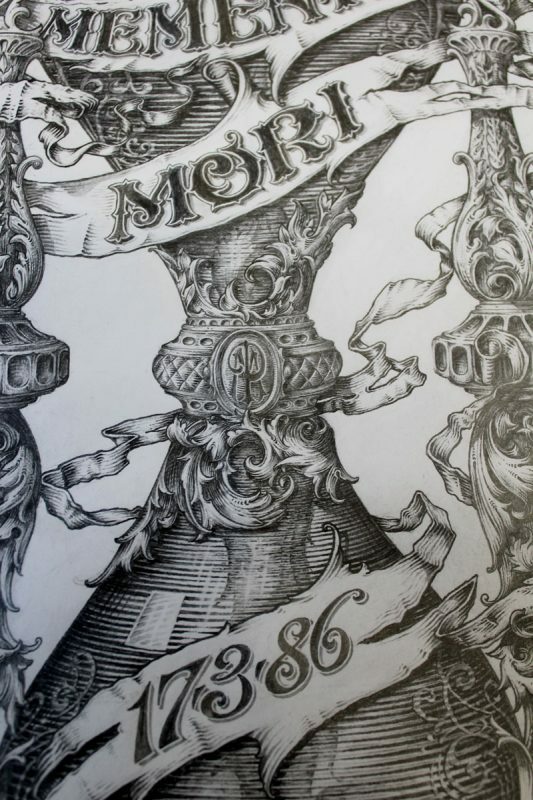 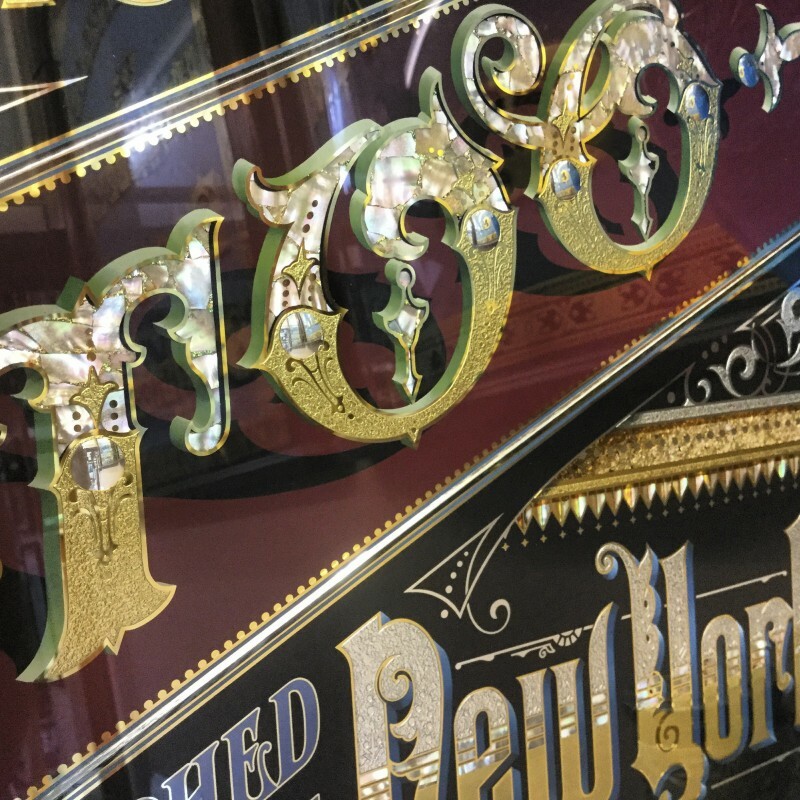 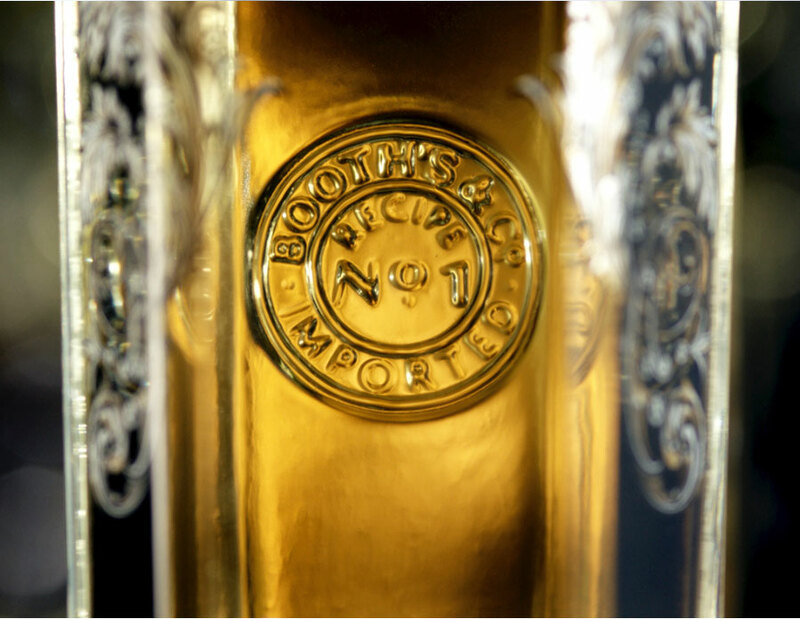 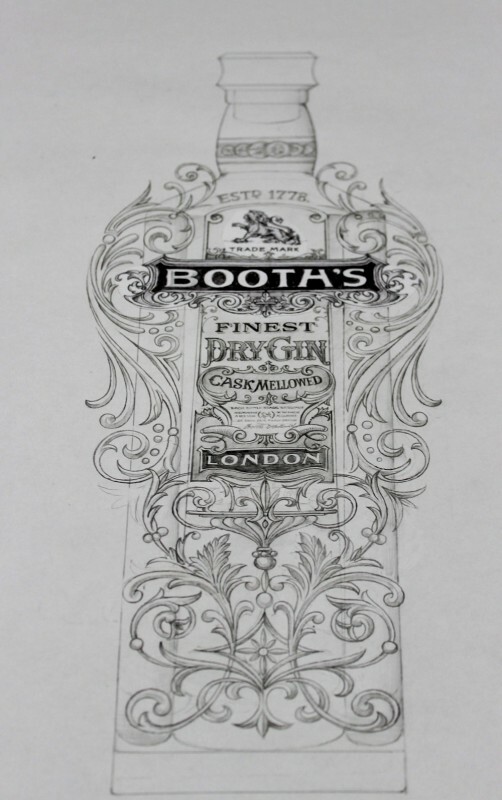 Note the gilded oak leaf scroll filigree, representing the gin mellowing in sherry oak casks, and the decorative letter ‘H’ in the Booth’s wordmark – a charming quirk of personality on the original art deco bottle. 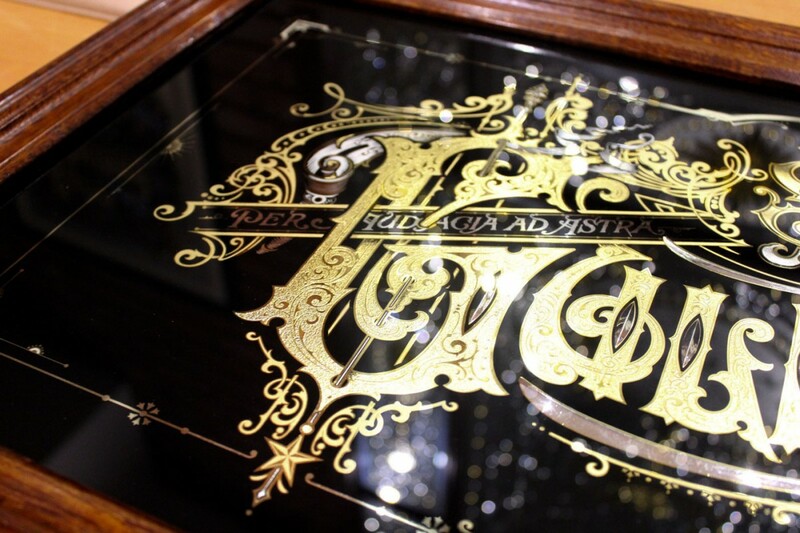 Every element reveals a part of the Booth’s story. 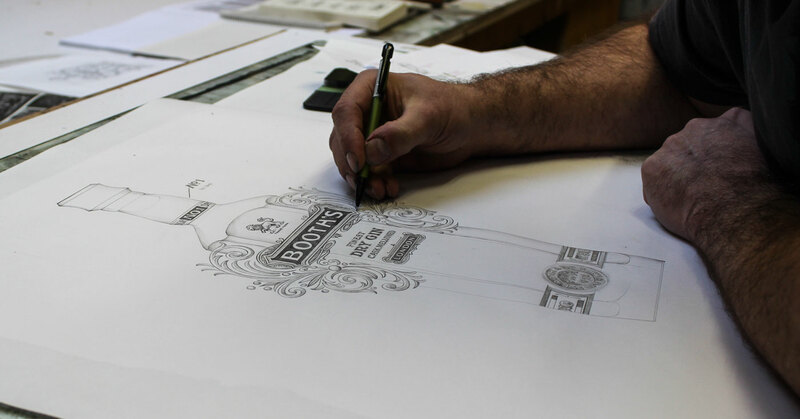 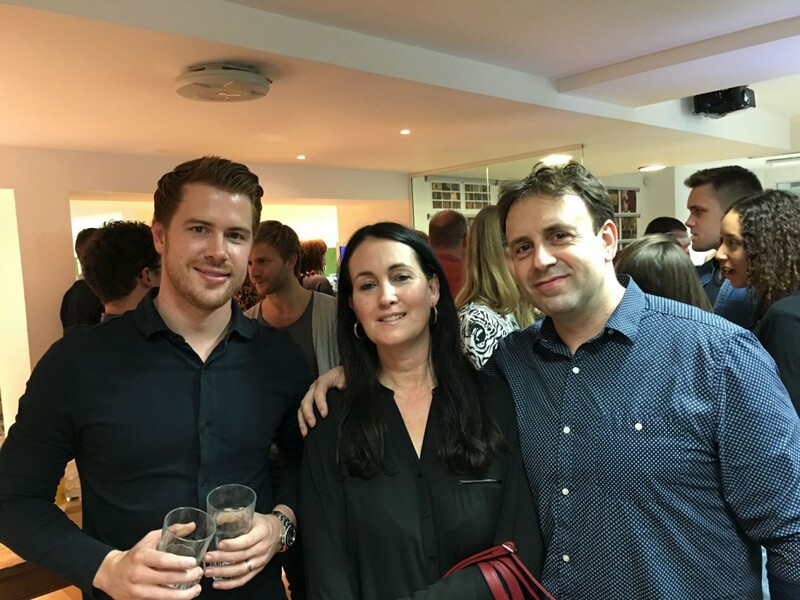 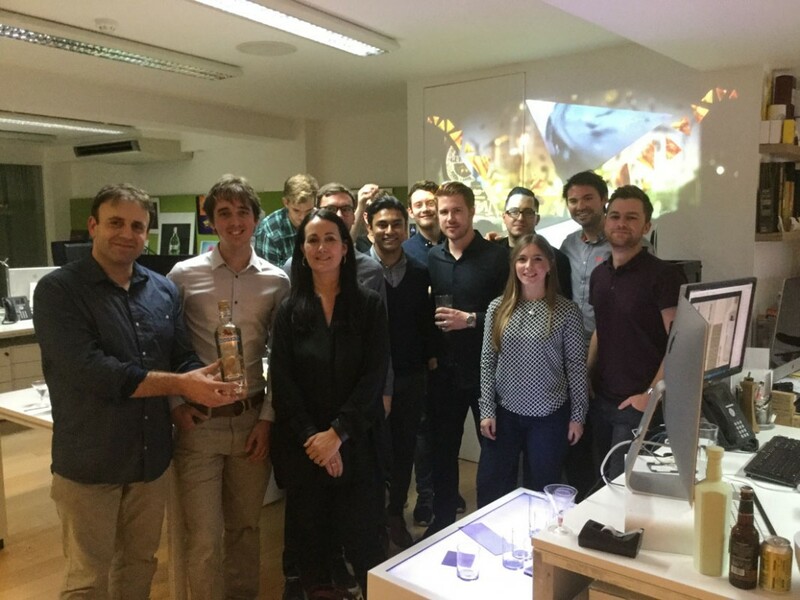 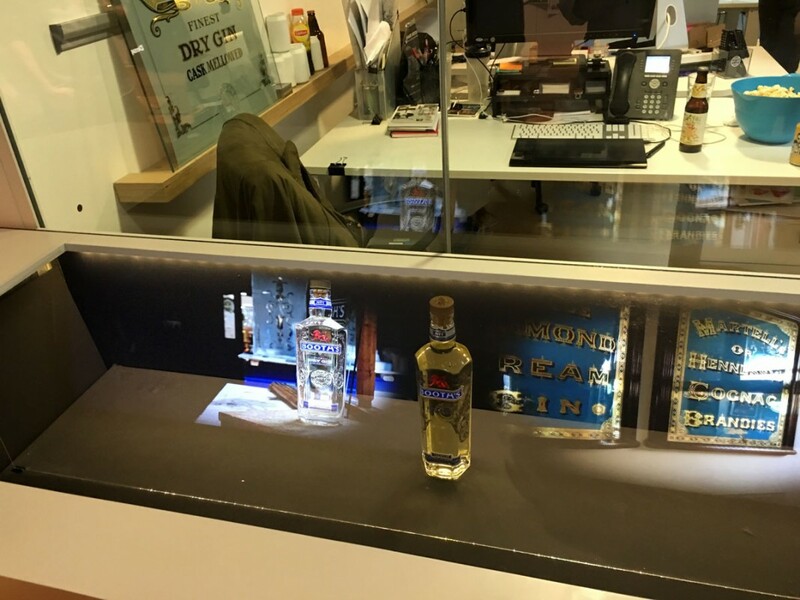 I worked alongside London’s amazing design company Design Bridge to produce a bottle that would stand out not only in the design artwork but also with its beautiful glass work and embossing that was achieved through hours of work. 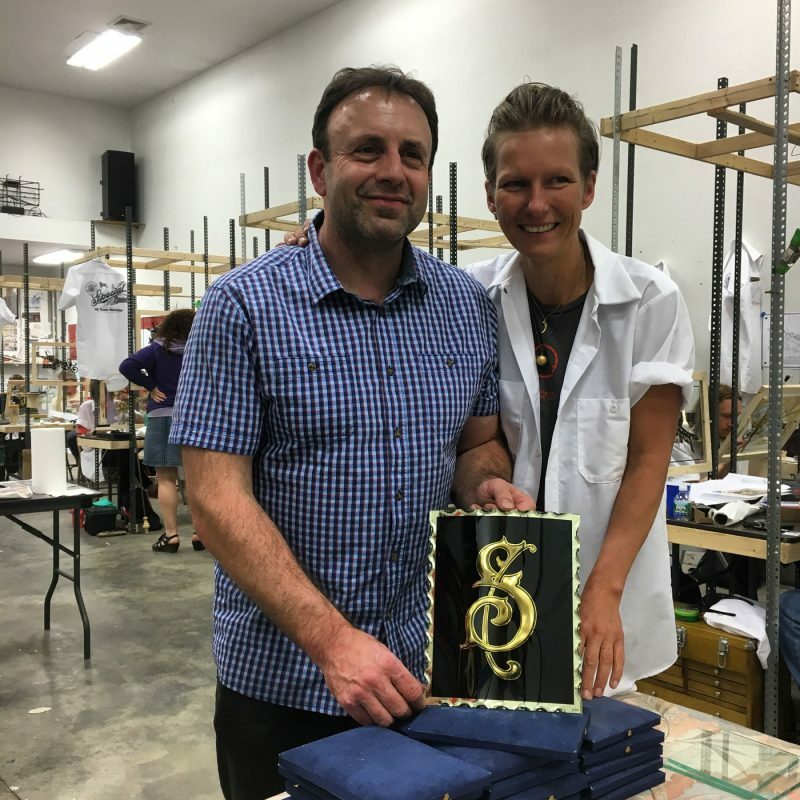 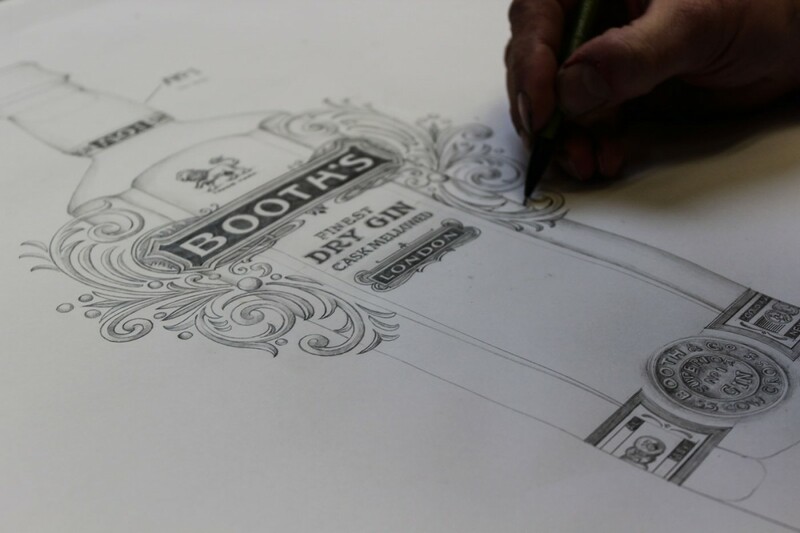 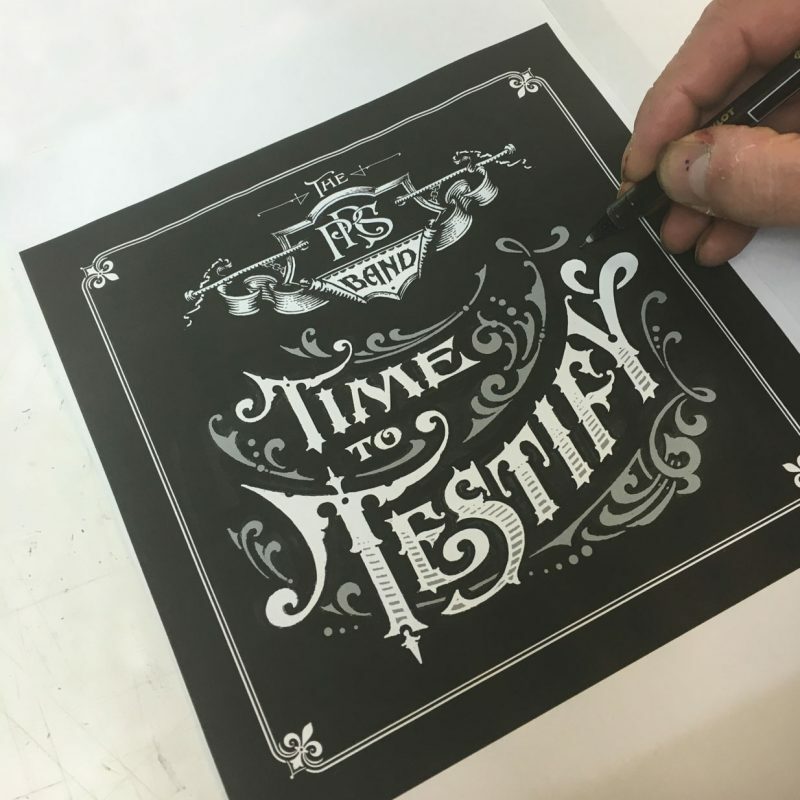 By delving into the history of Booth’s and collaborating with Design Bridge we’ve been able to bring back the brand’s unique charm and character. 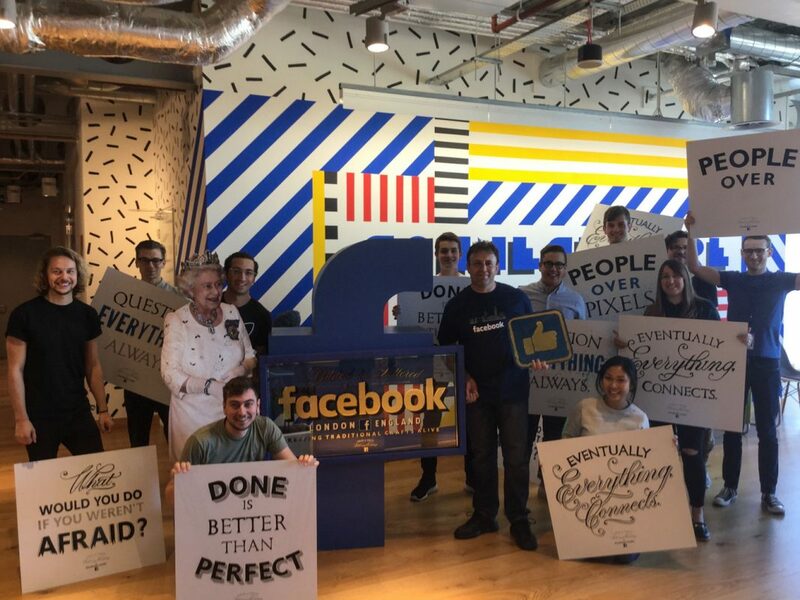 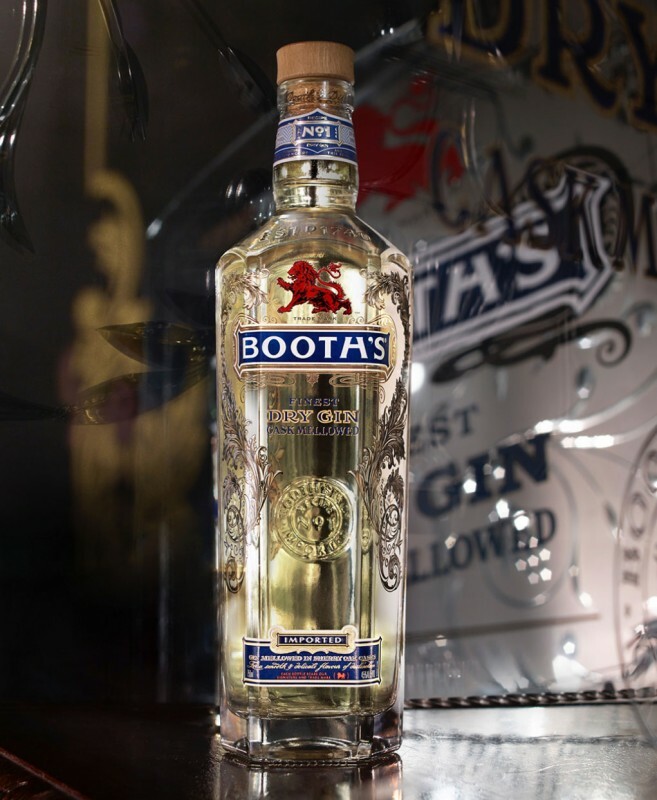 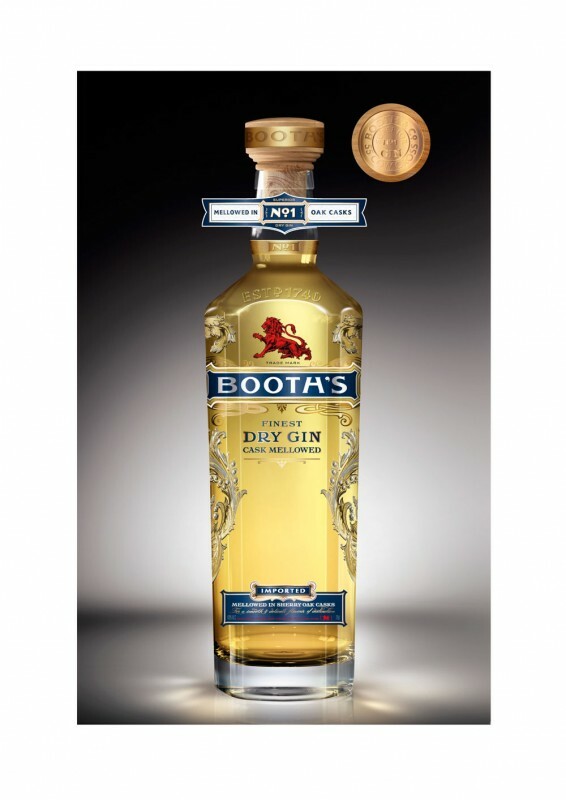 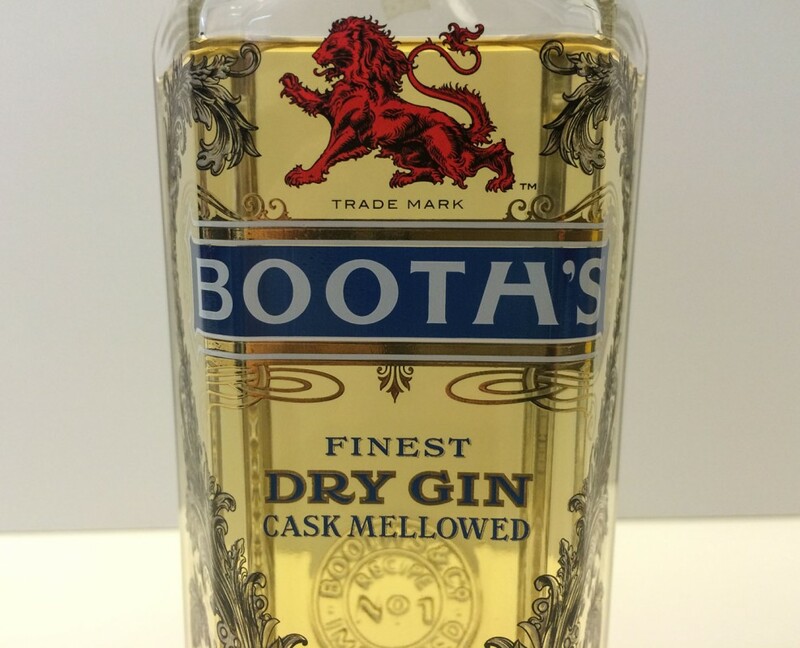 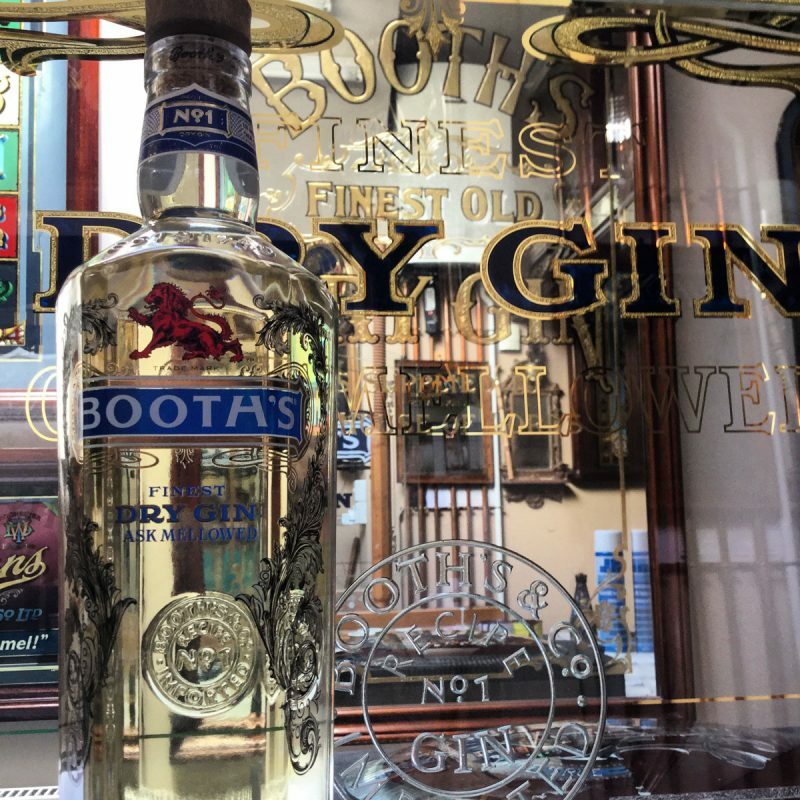 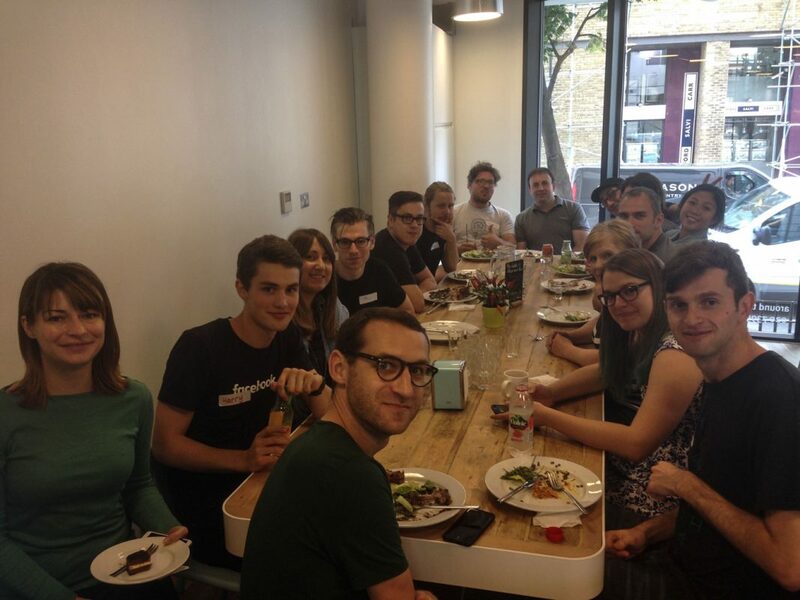 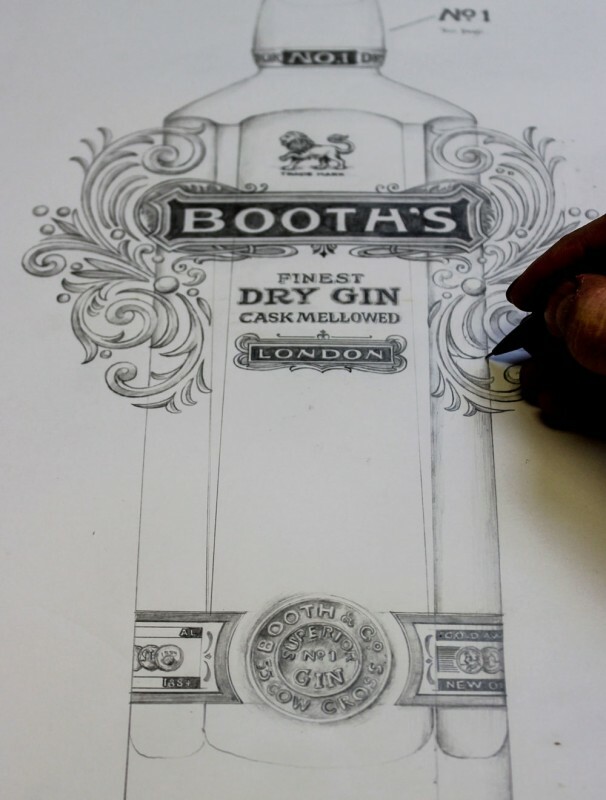 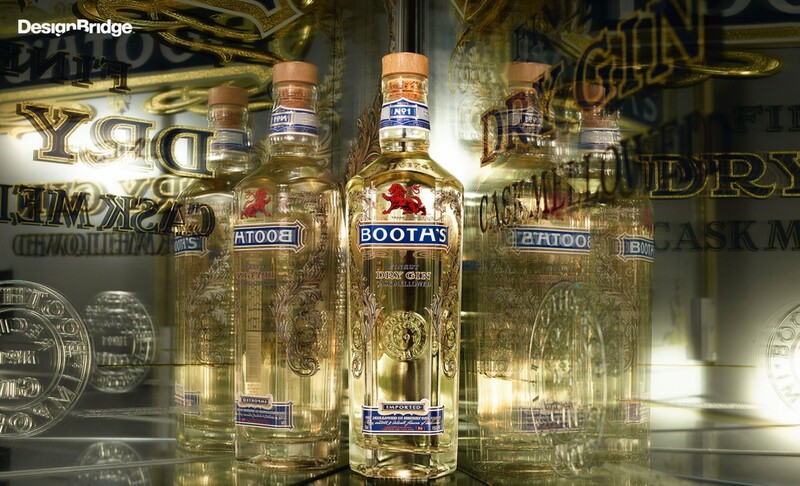 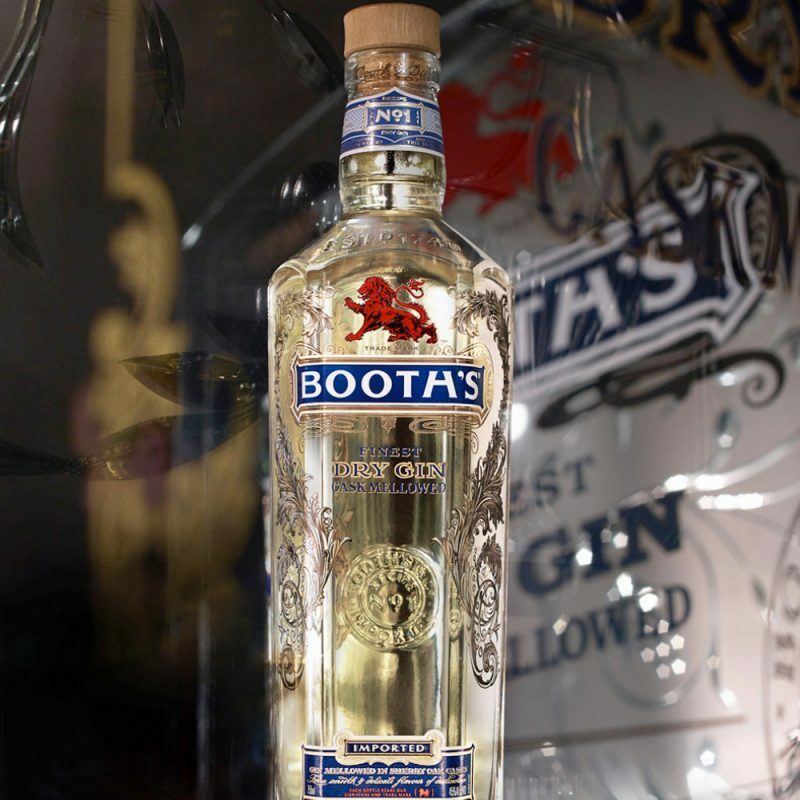 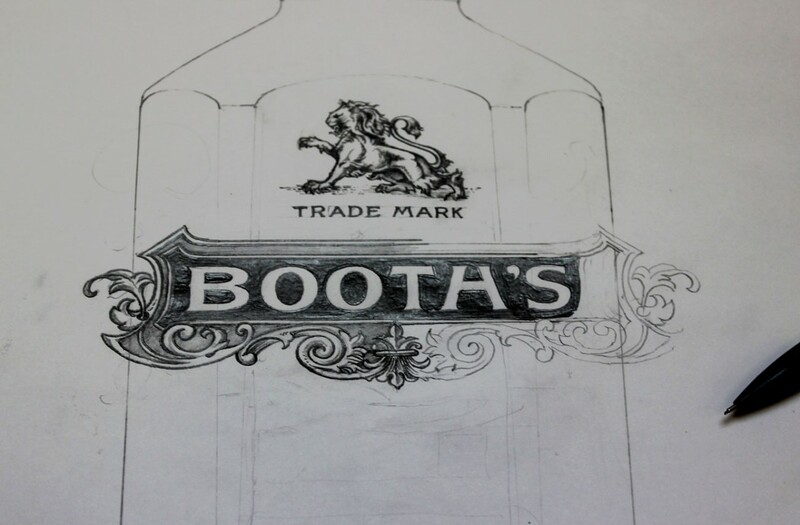 Booth’s is now a stylish, complex and deeply authentic brand resurrected for today. 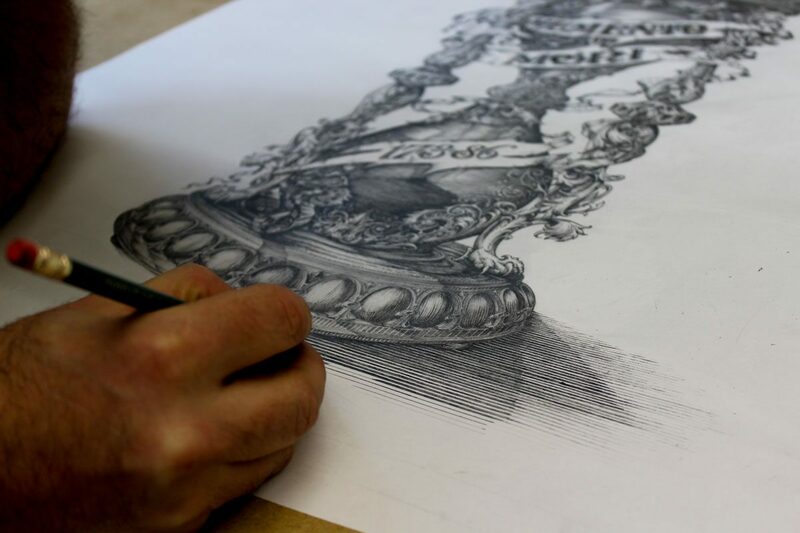 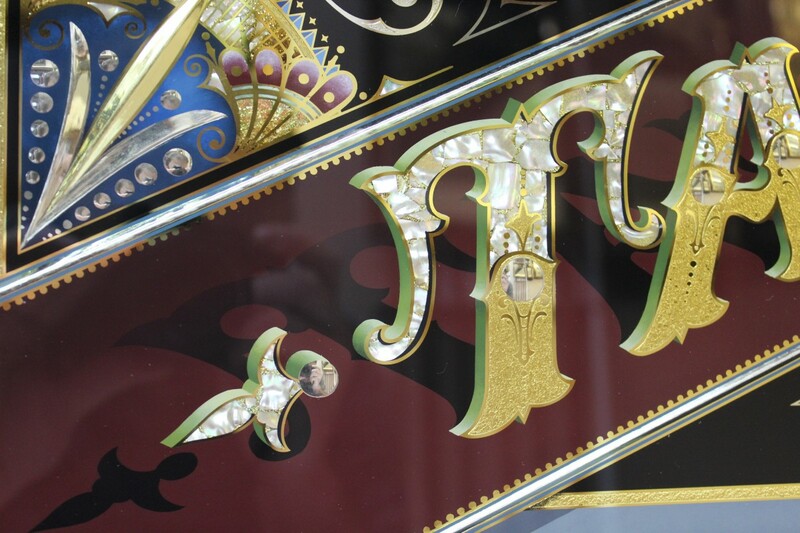 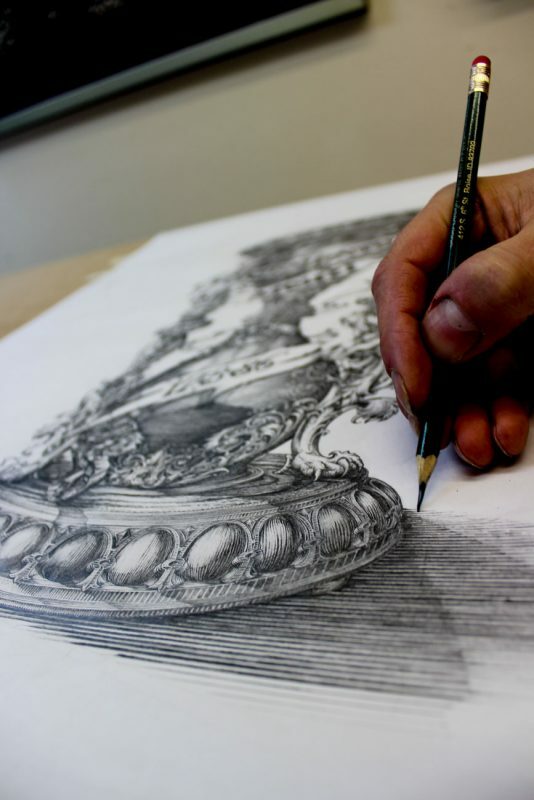 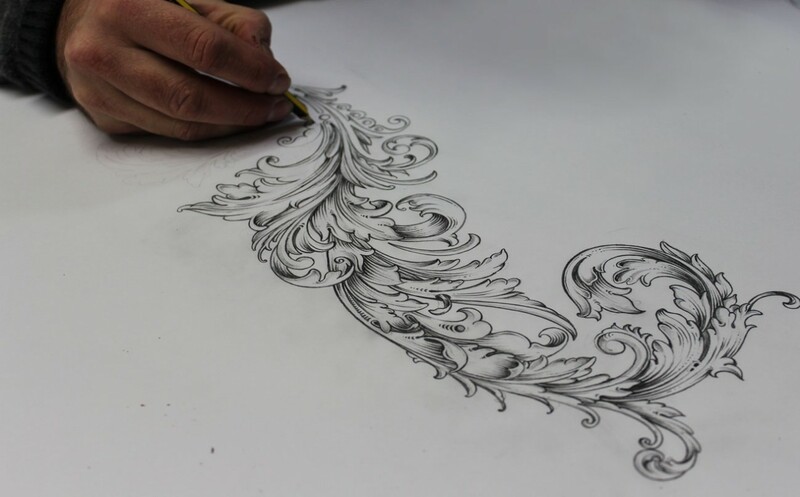 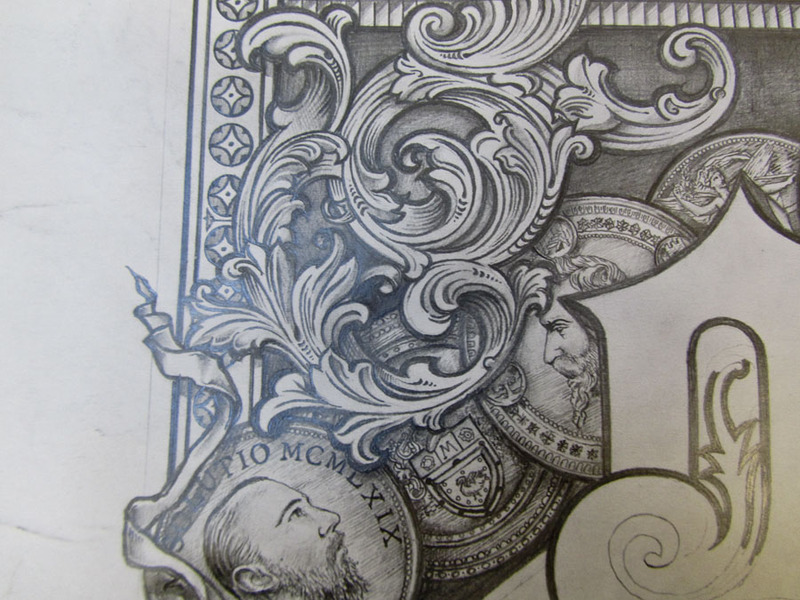 Ornamental, original and obsessive about detail, this is craft and creativity at its glorious best. 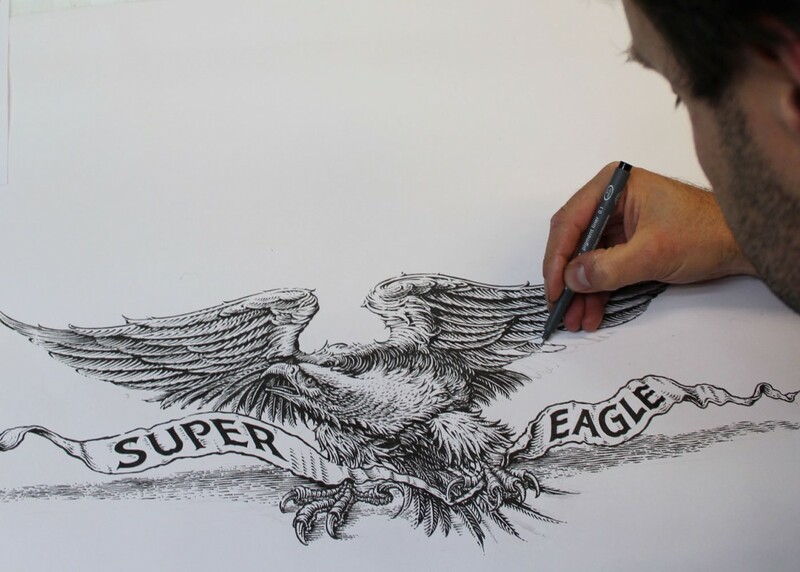 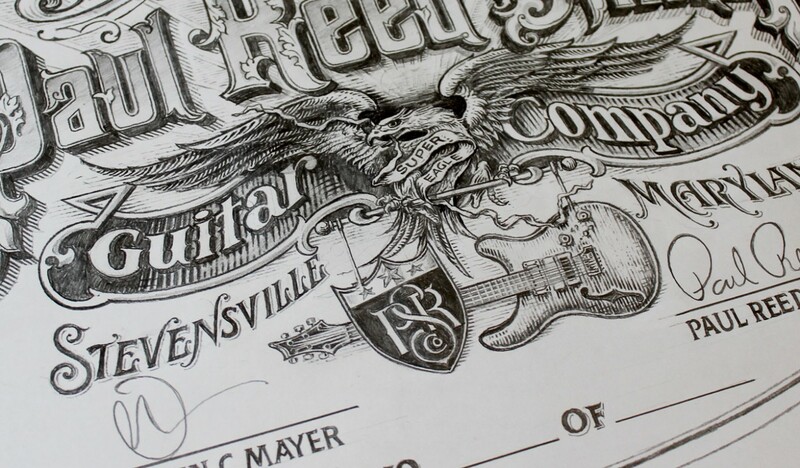 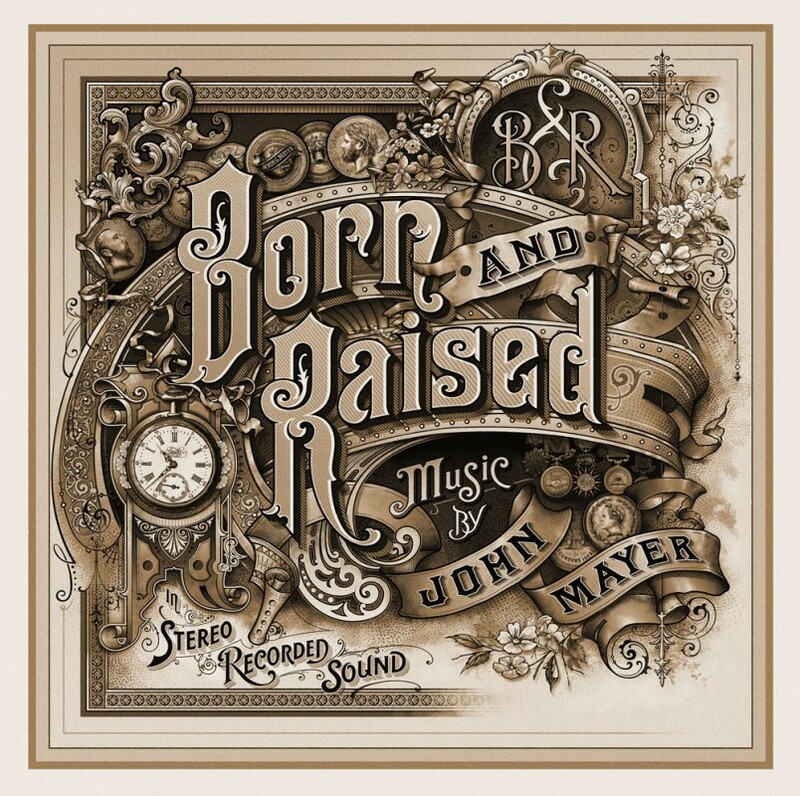 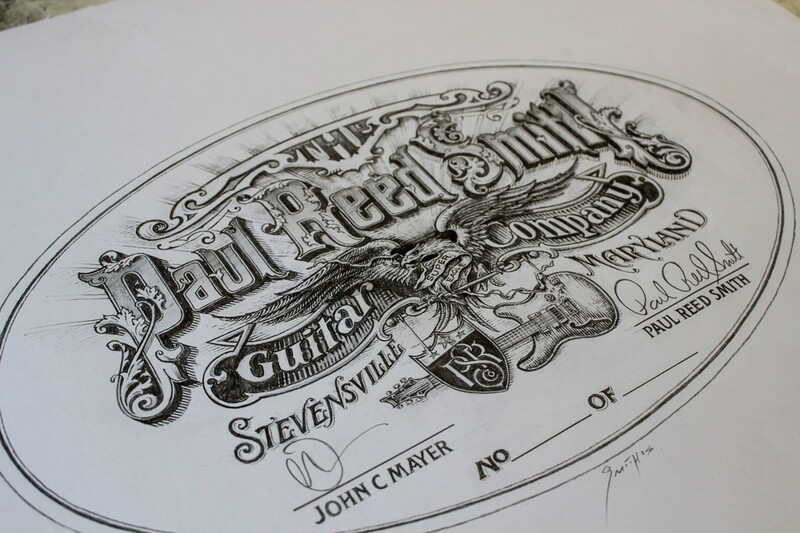 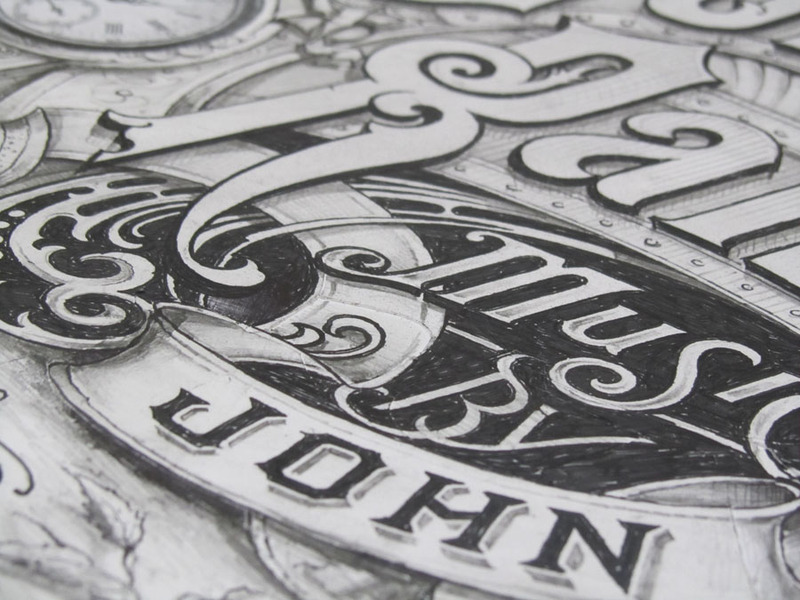 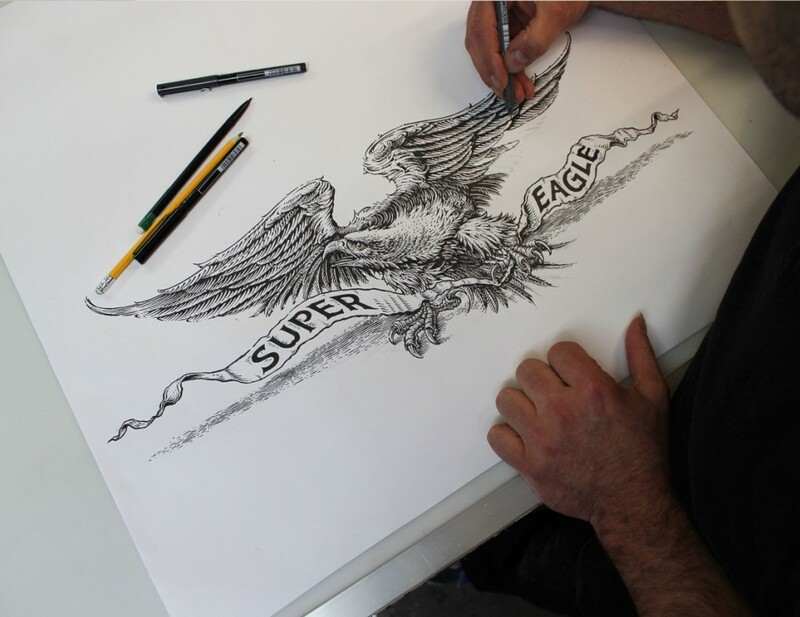 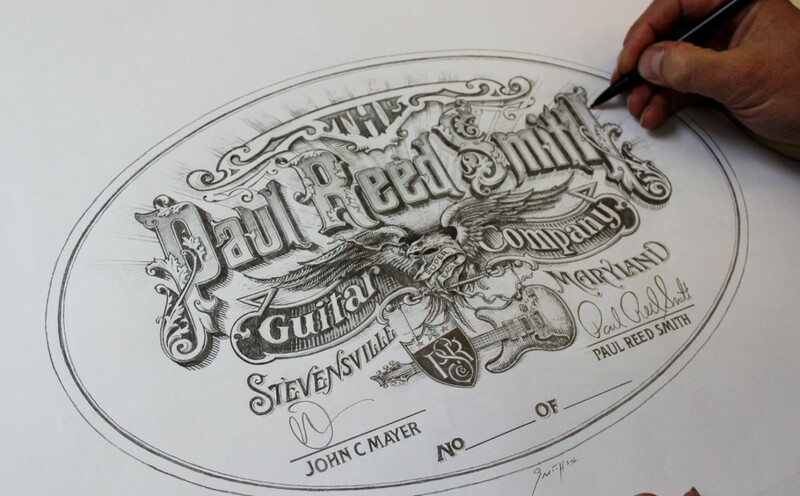 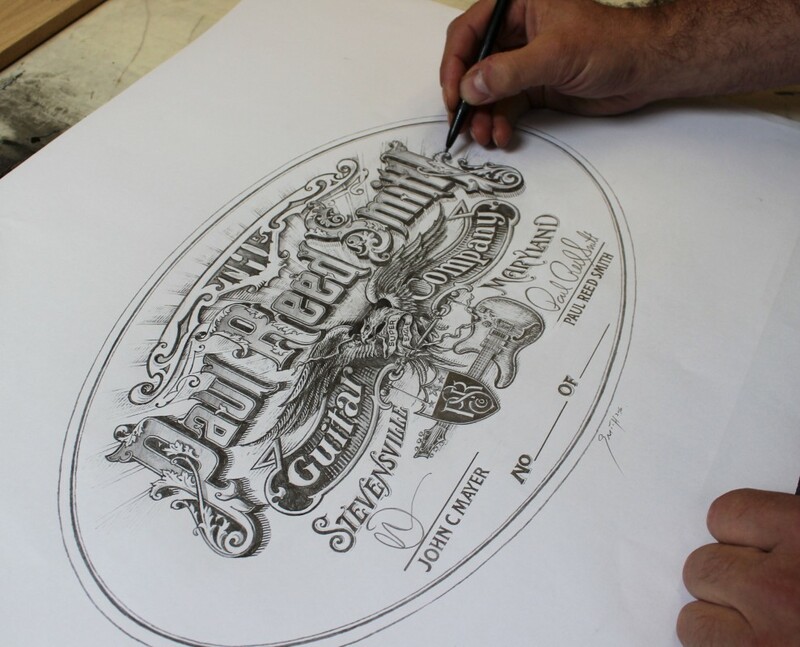 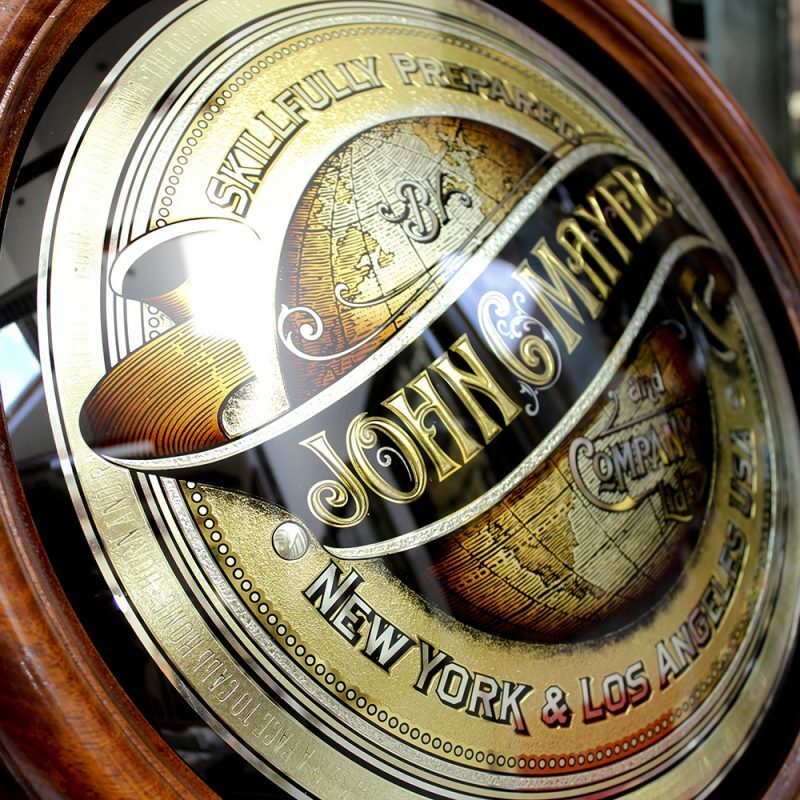 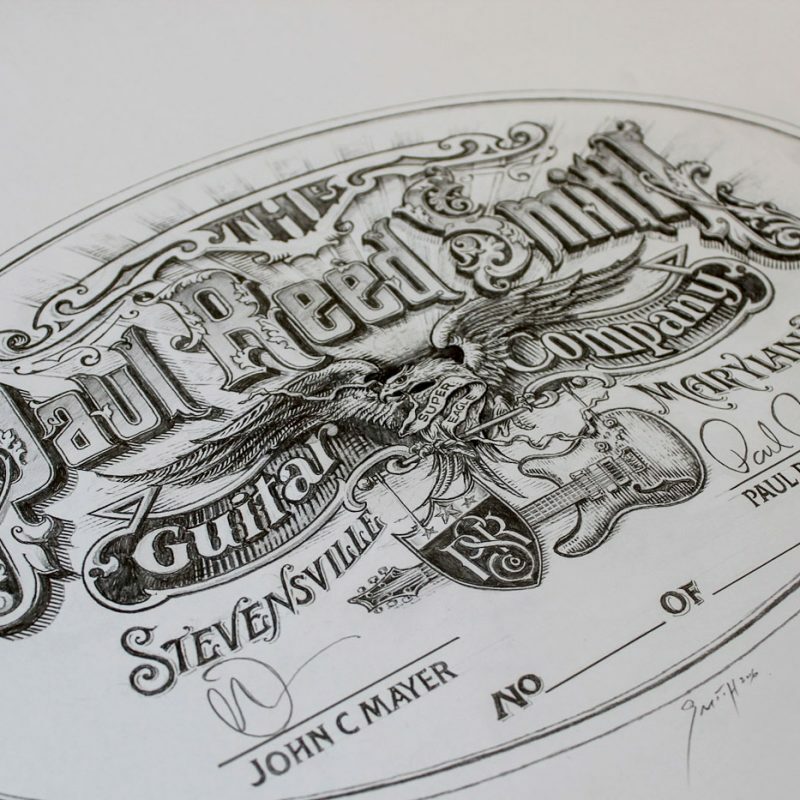 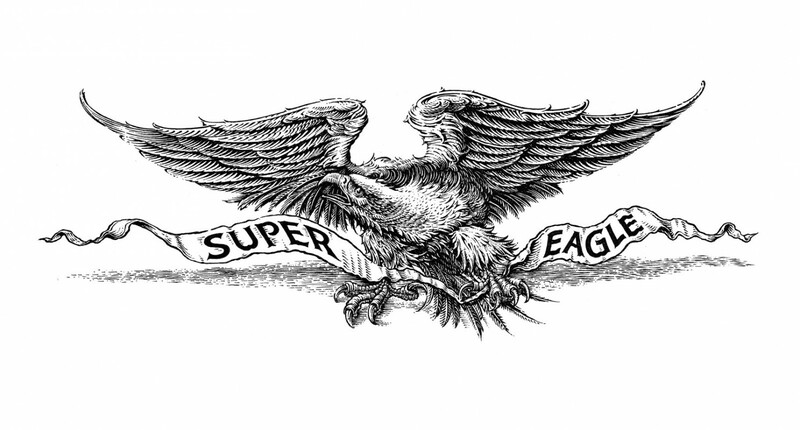 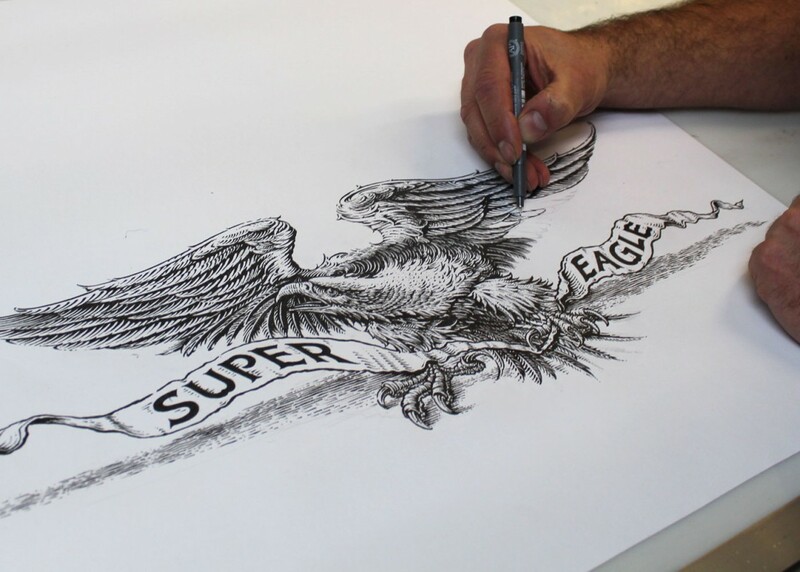 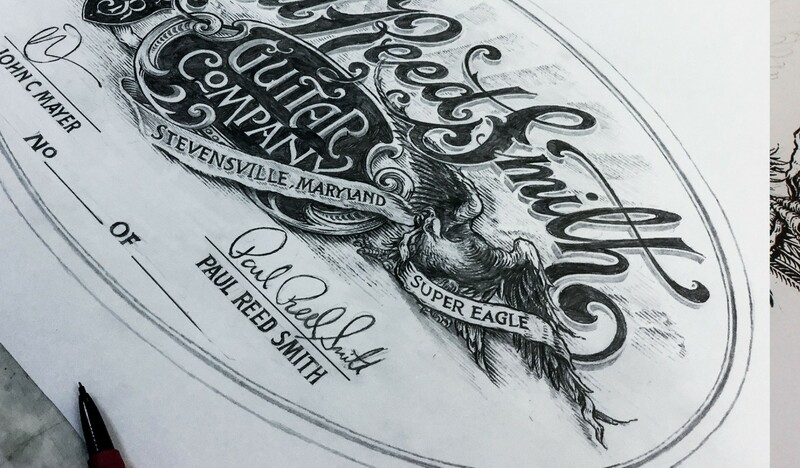 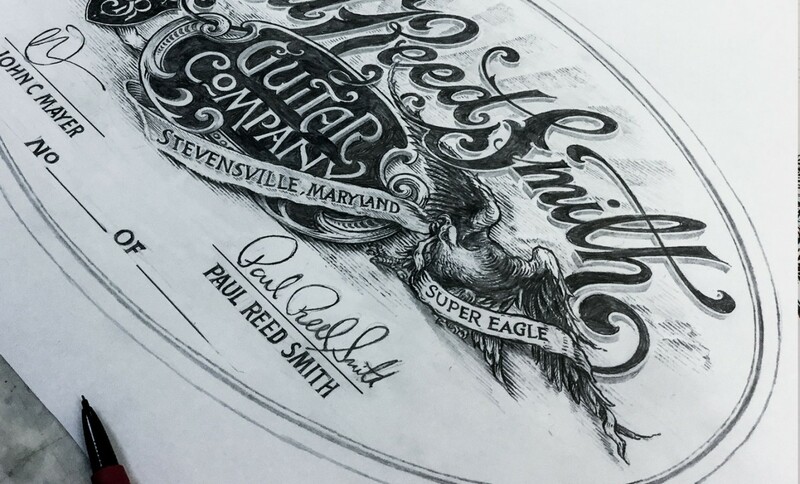 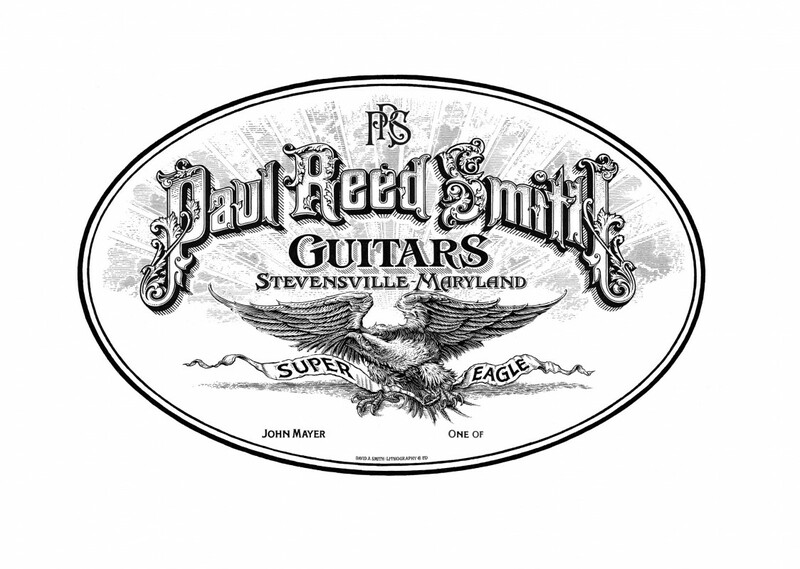 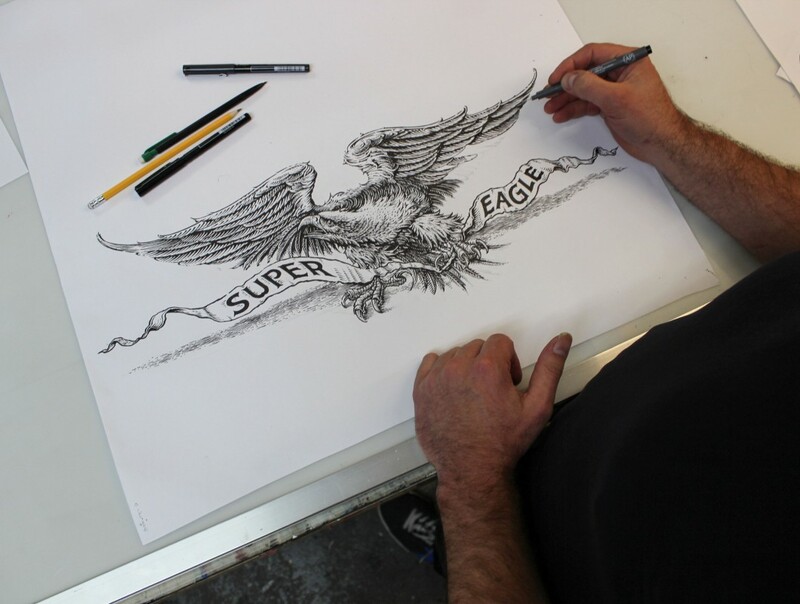 The label designed artwork for the John Mayer Limited Edition Super Eagle. 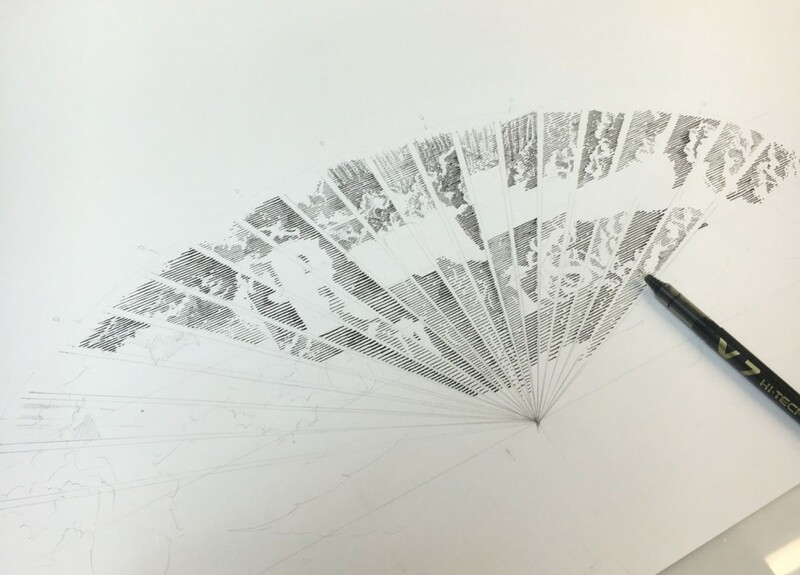 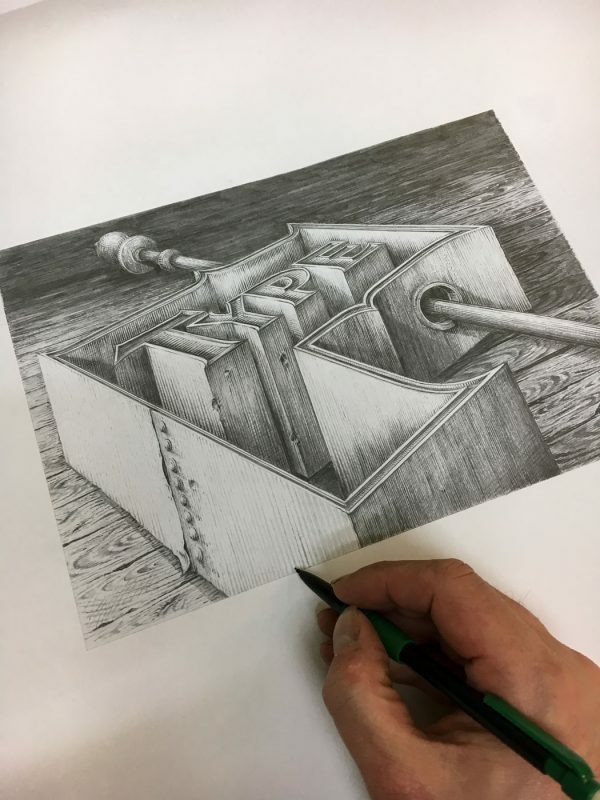 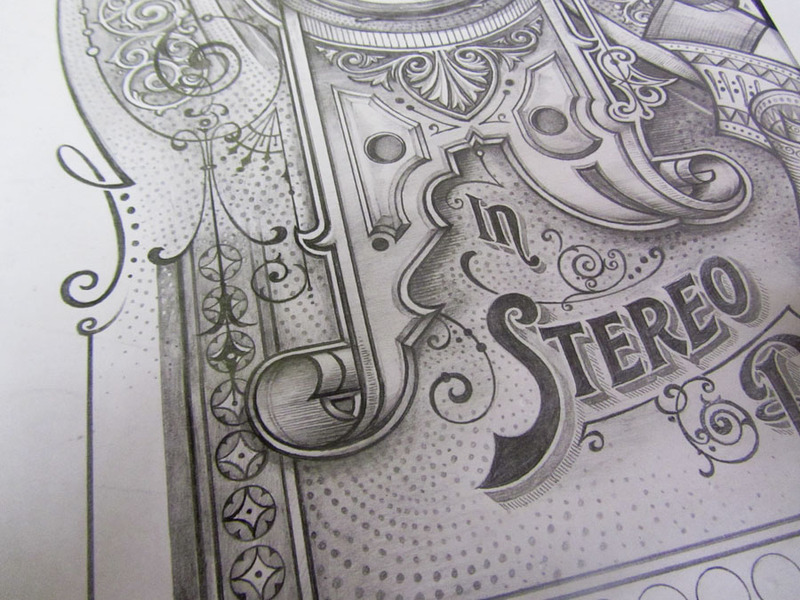 I made 3 versions of this artwork in pencil sketched ideas. 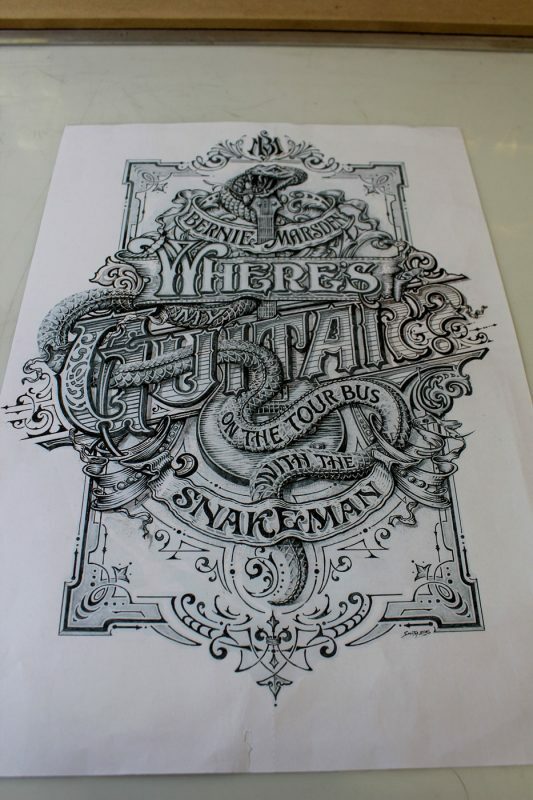 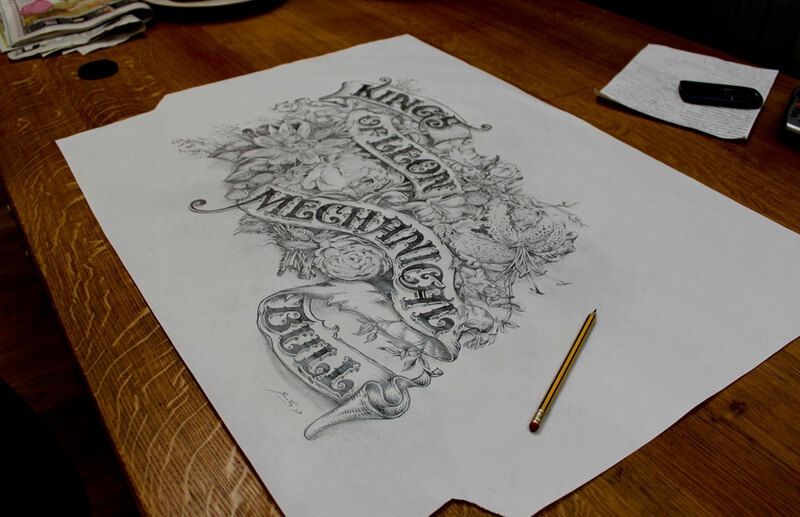 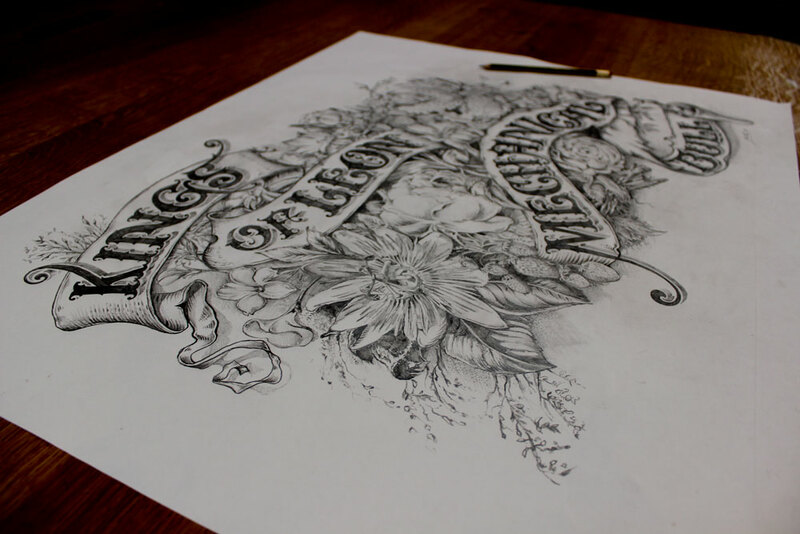 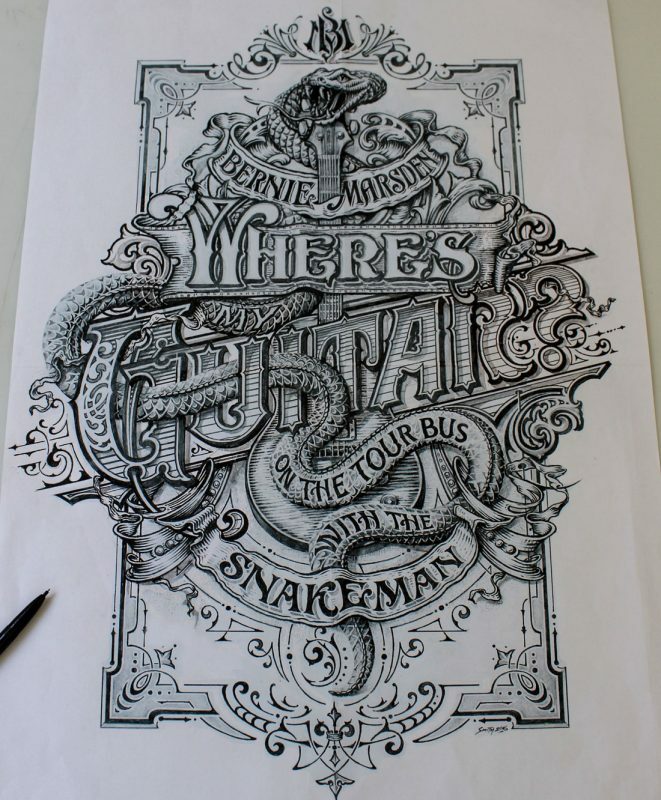 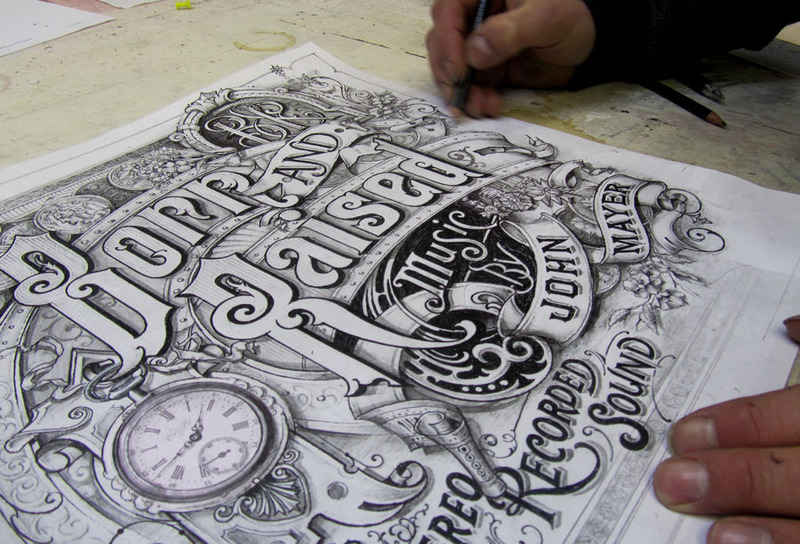 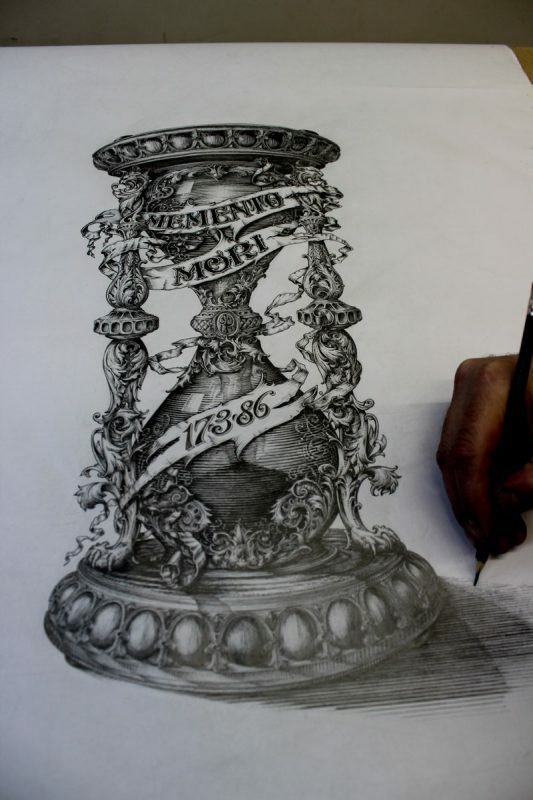 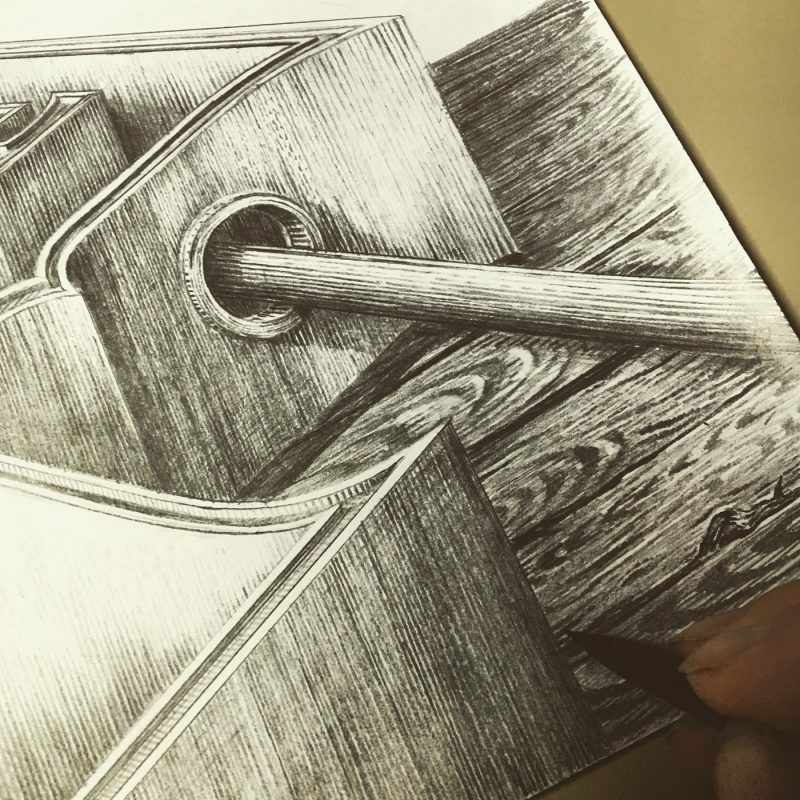 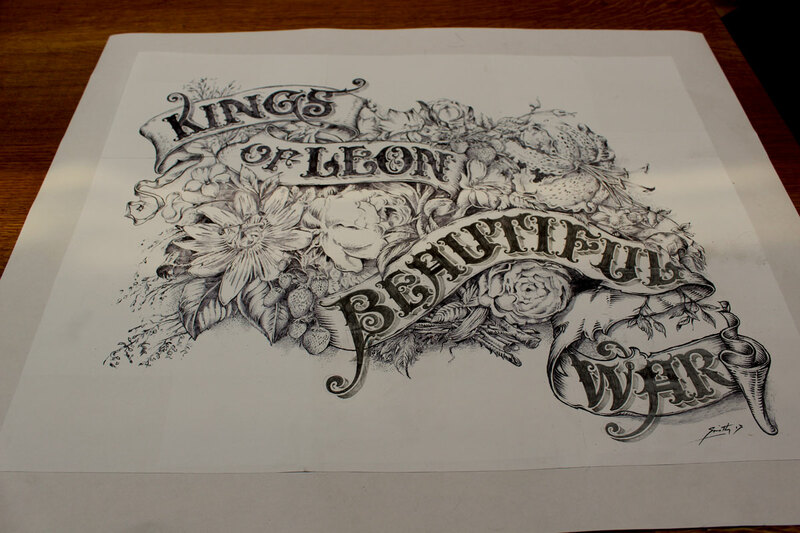 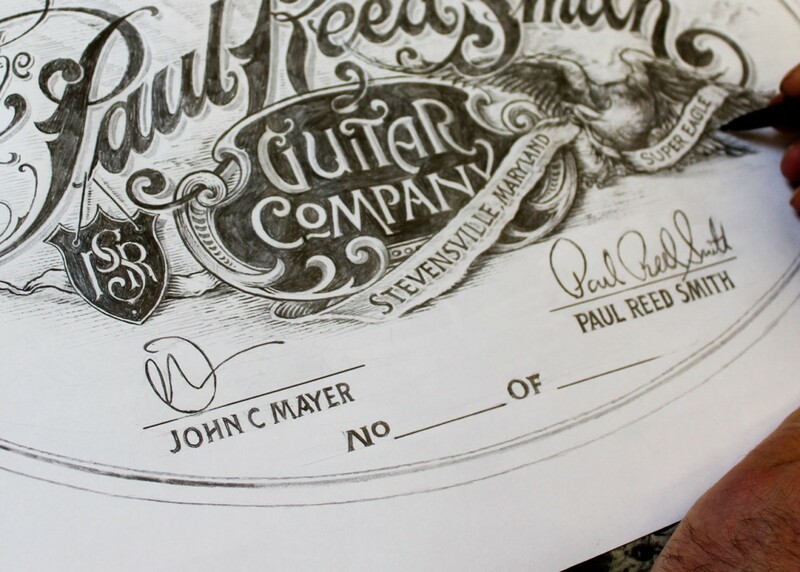 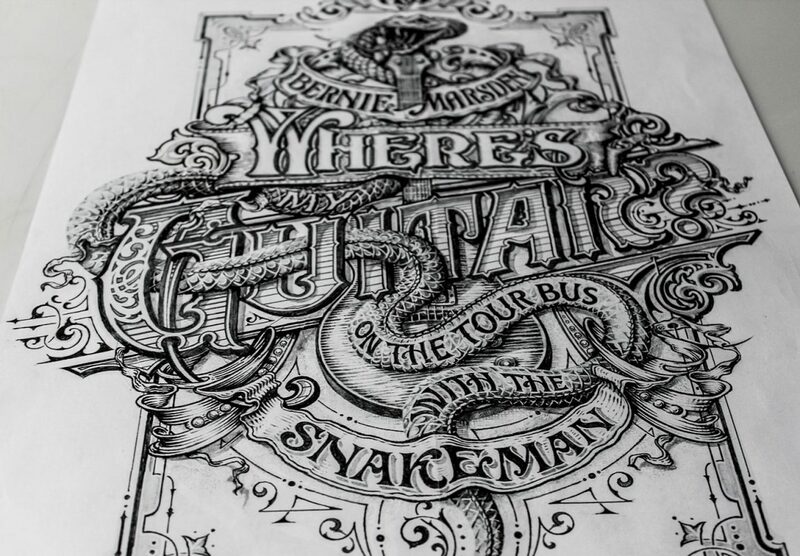 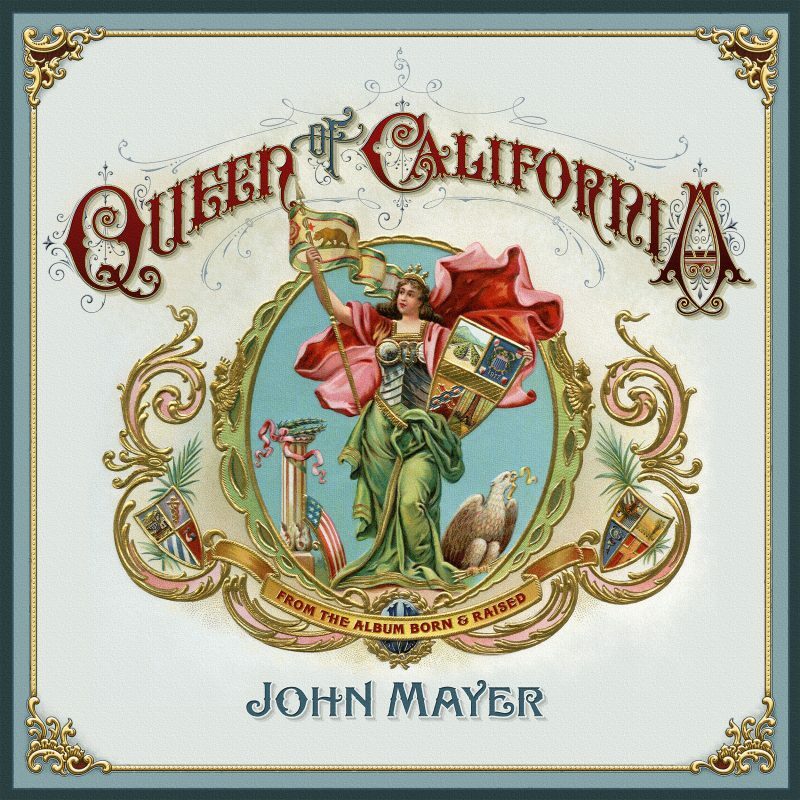 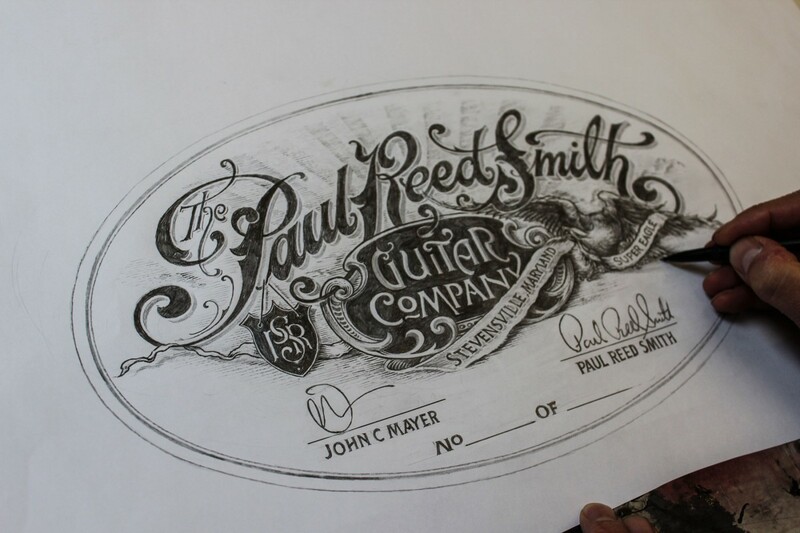 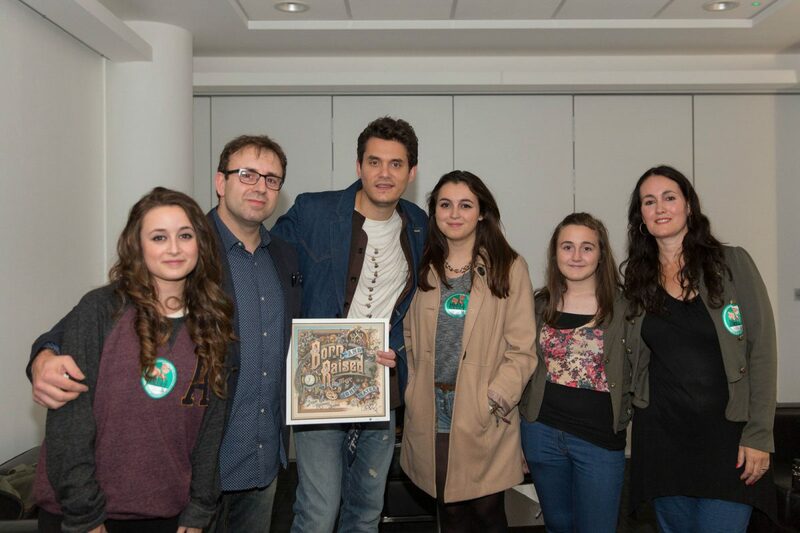 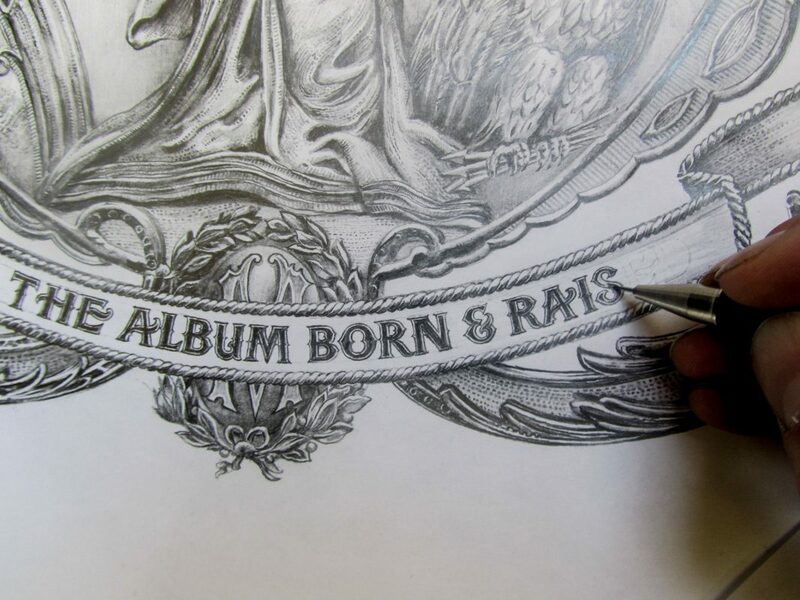 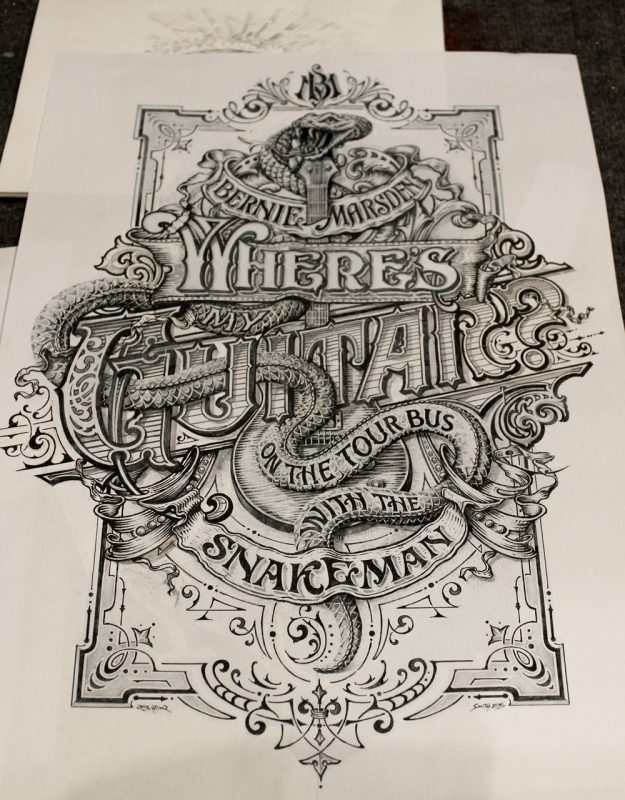 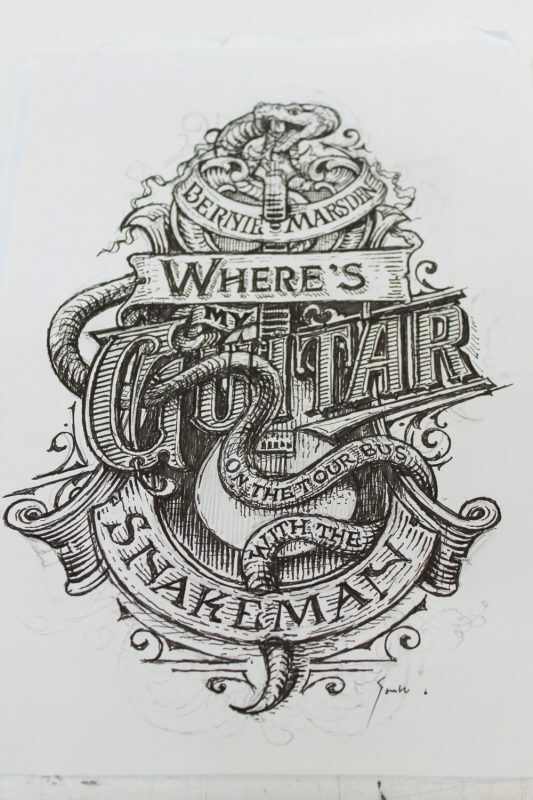 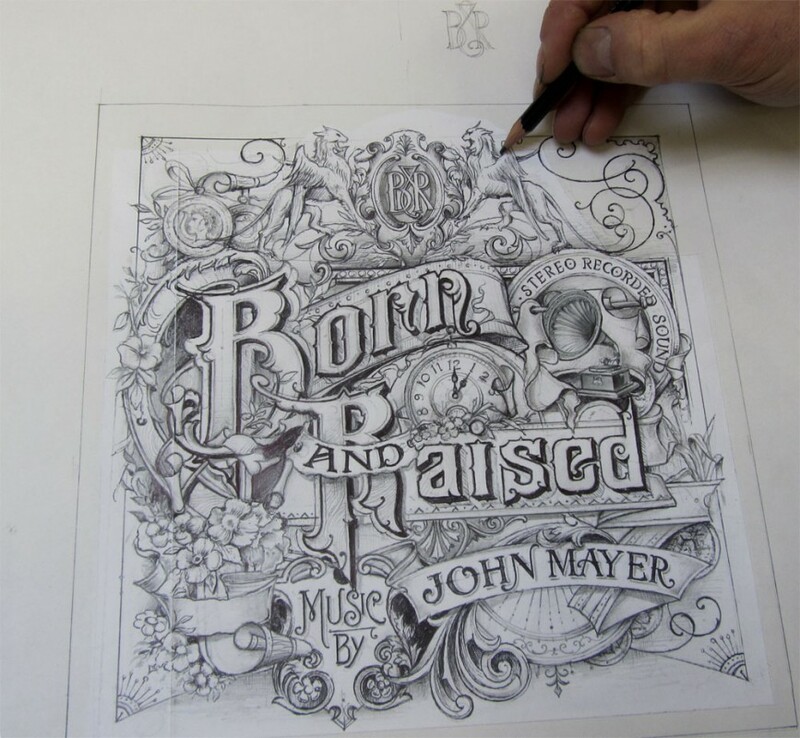 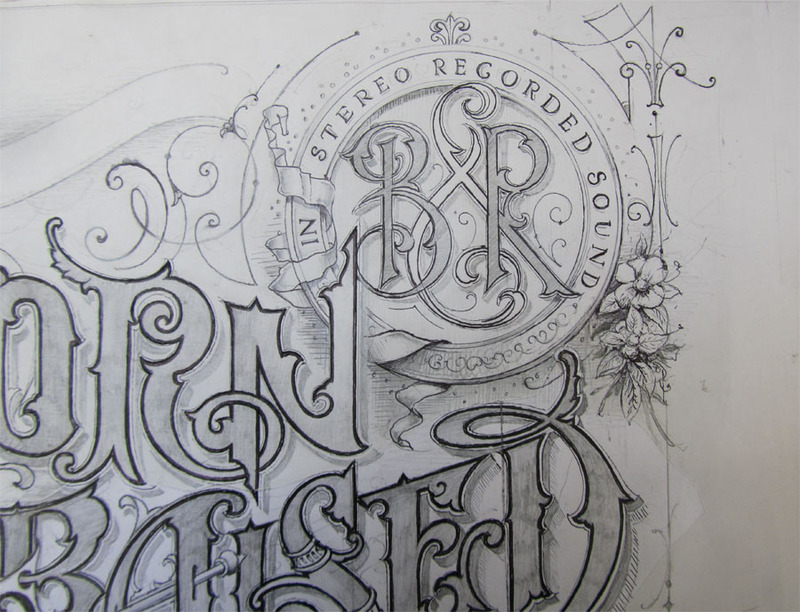 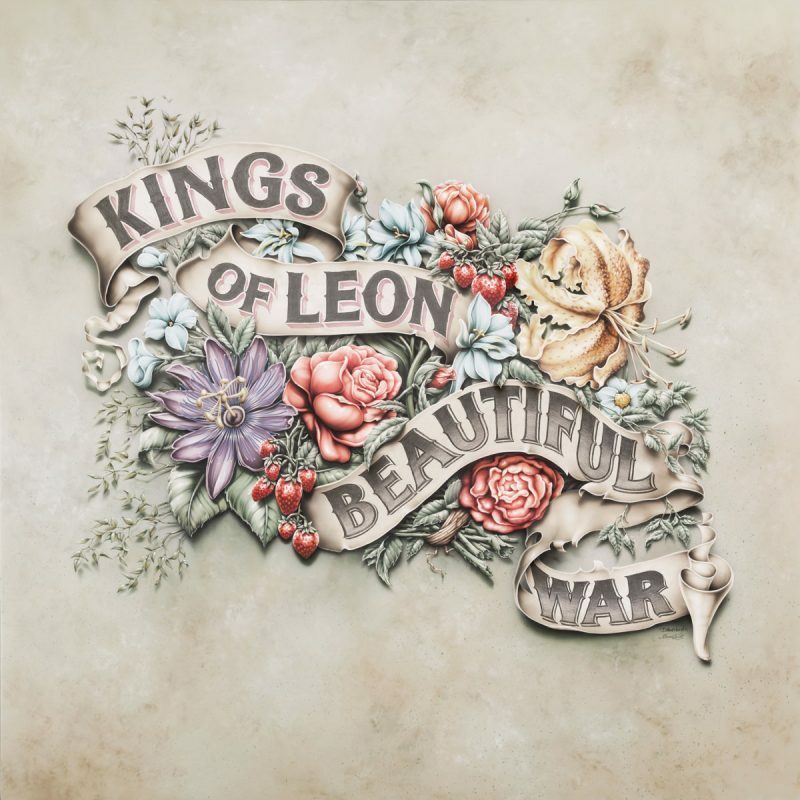 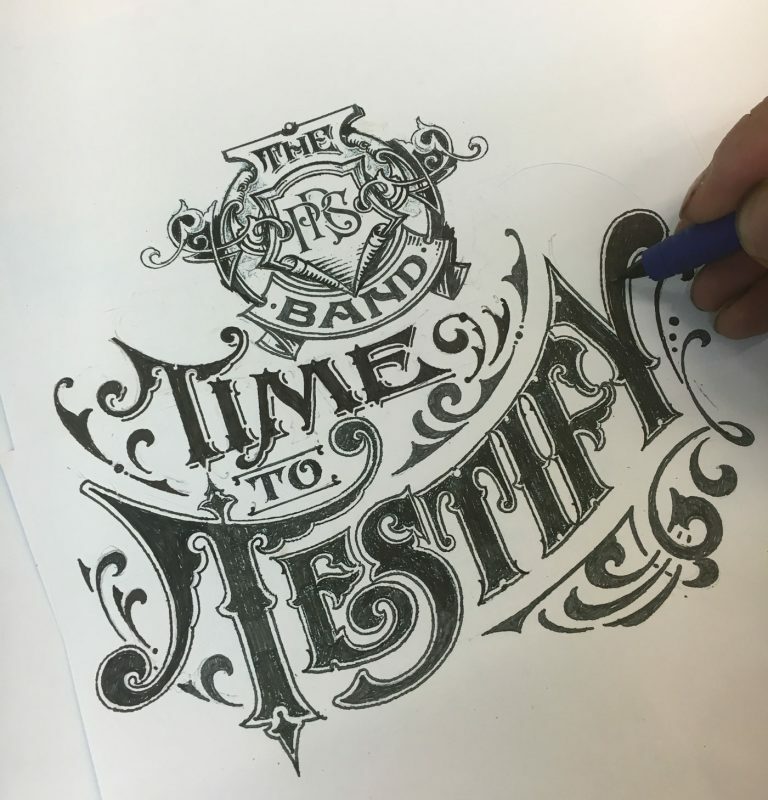 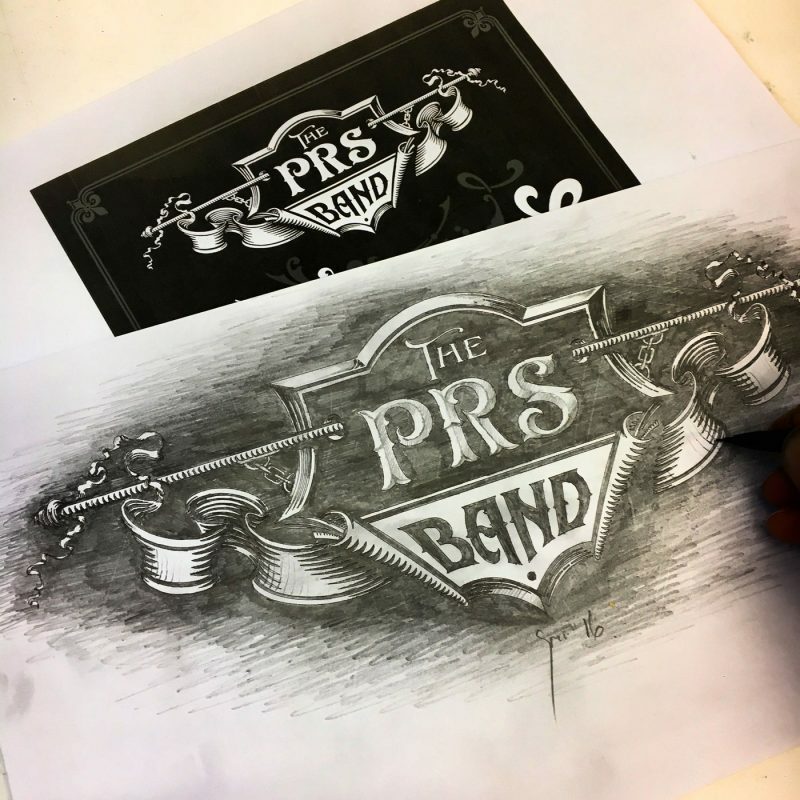 The final version was chosen by John Mayer and I then proceeded to pen draw the finished artwork. 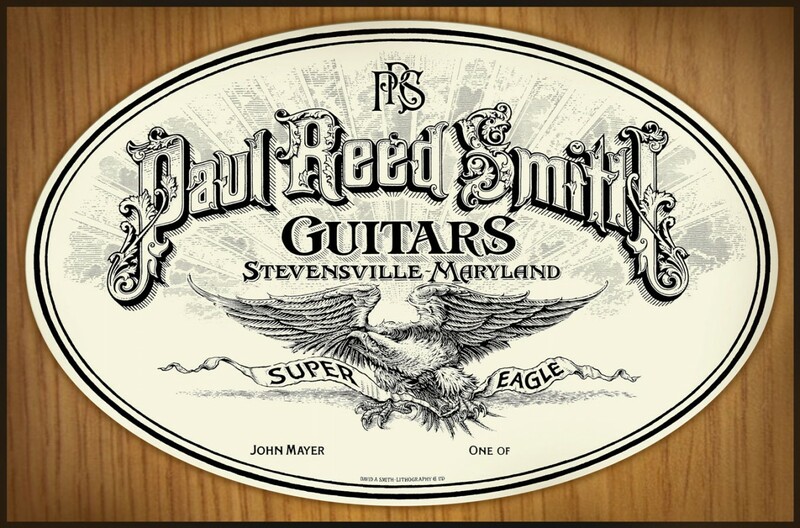 The label was made into a small 3 inch long adhesive graphic that went inside the f hole of the guitar. 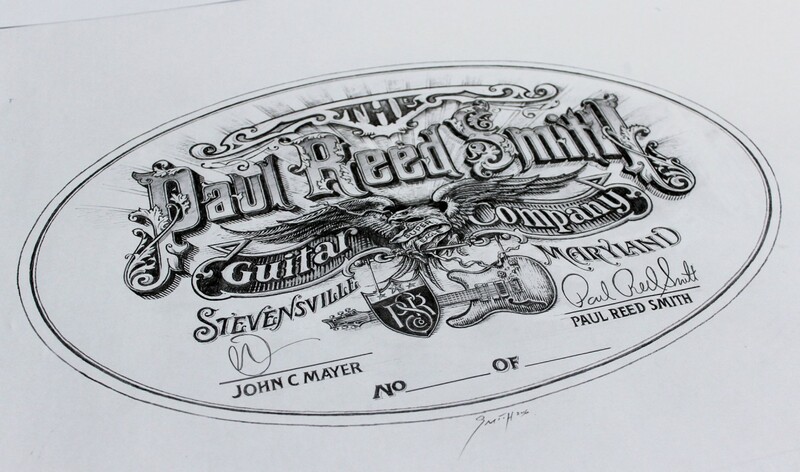 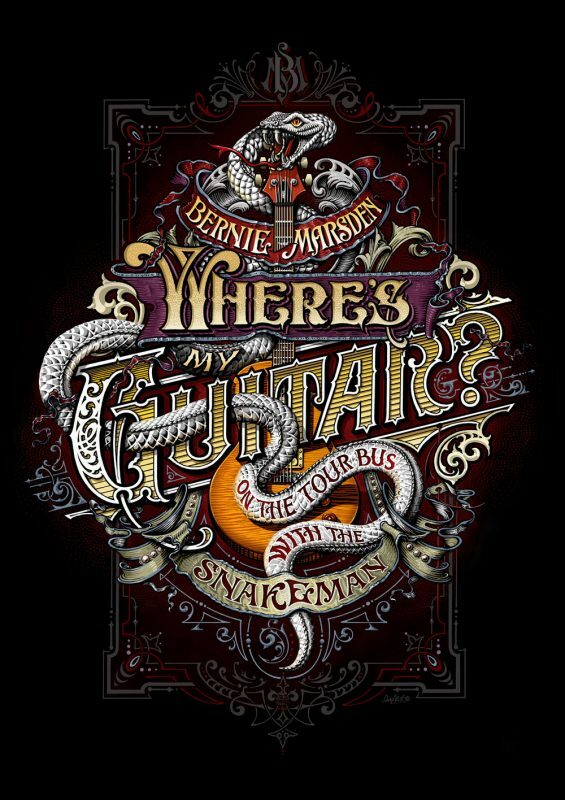 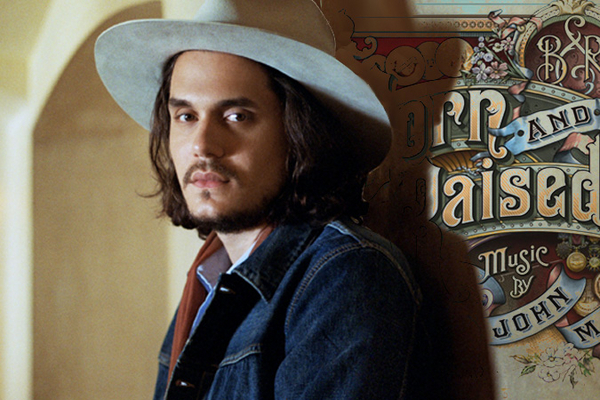 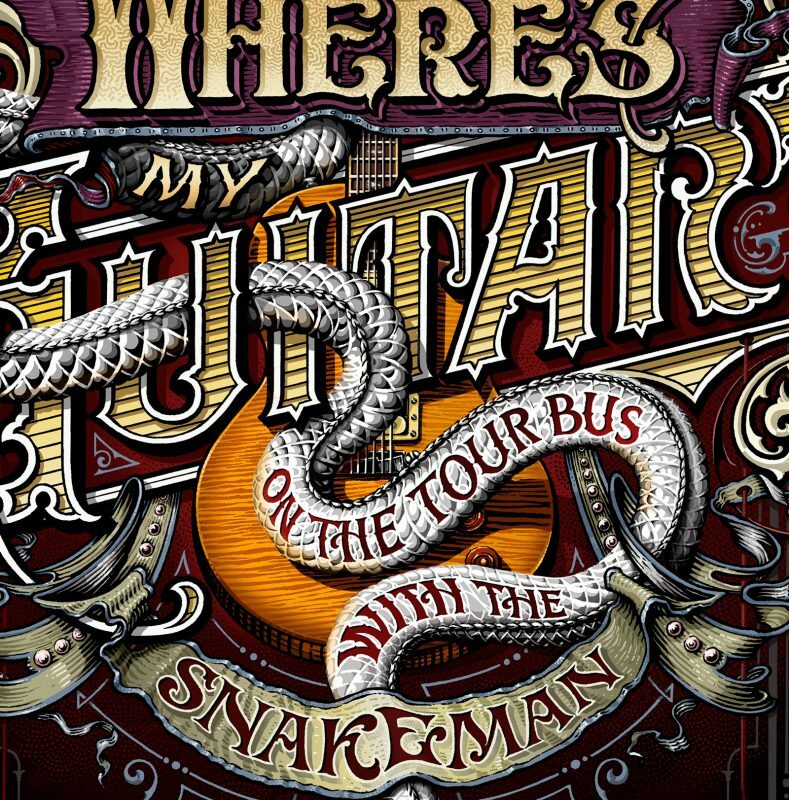 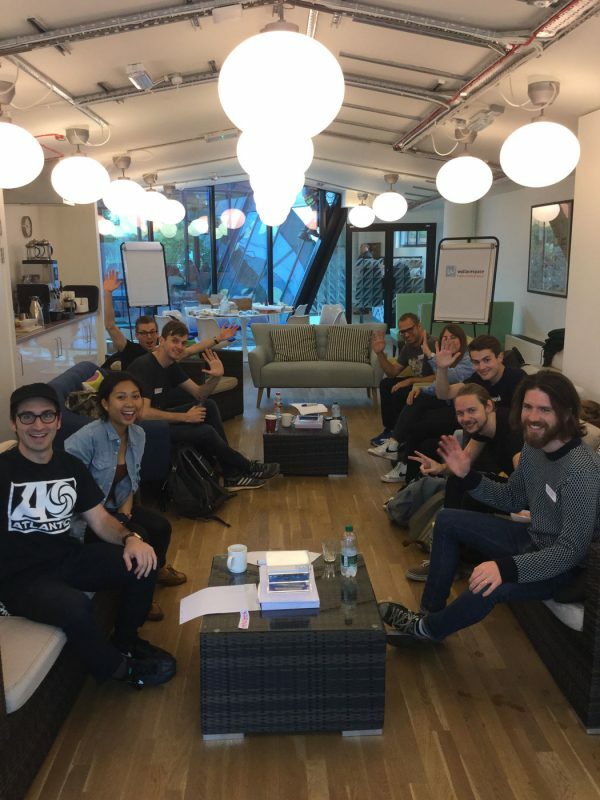 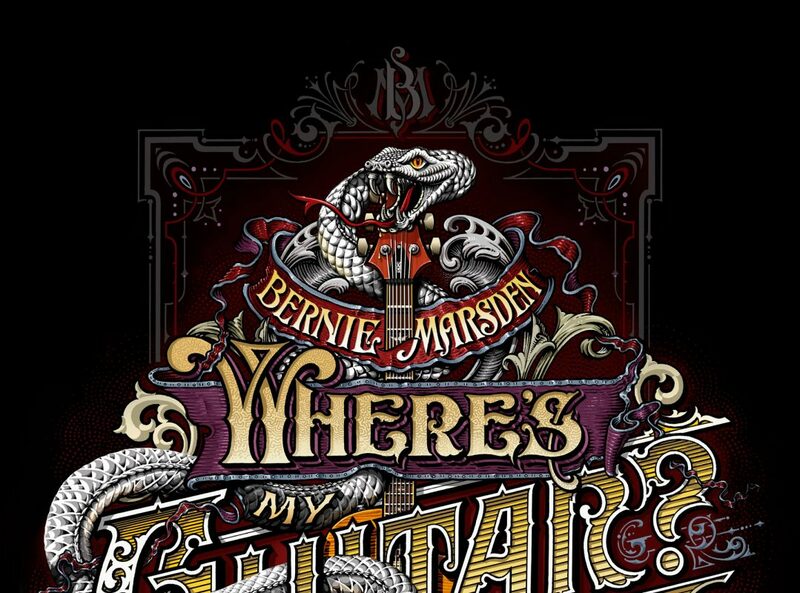 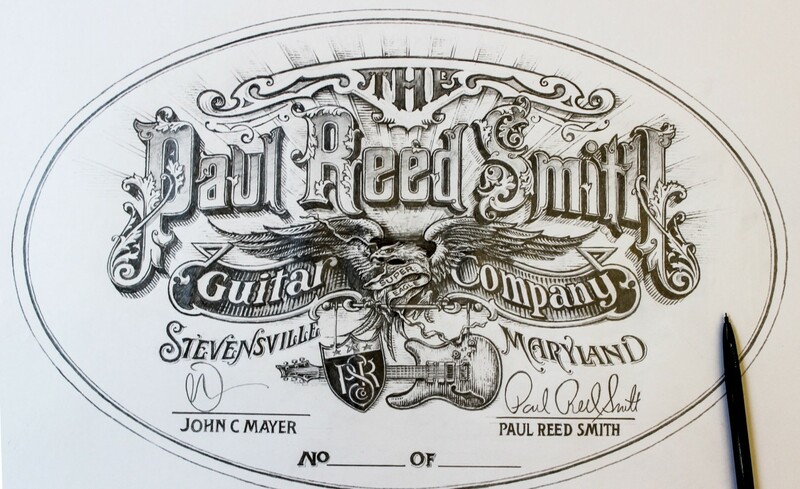 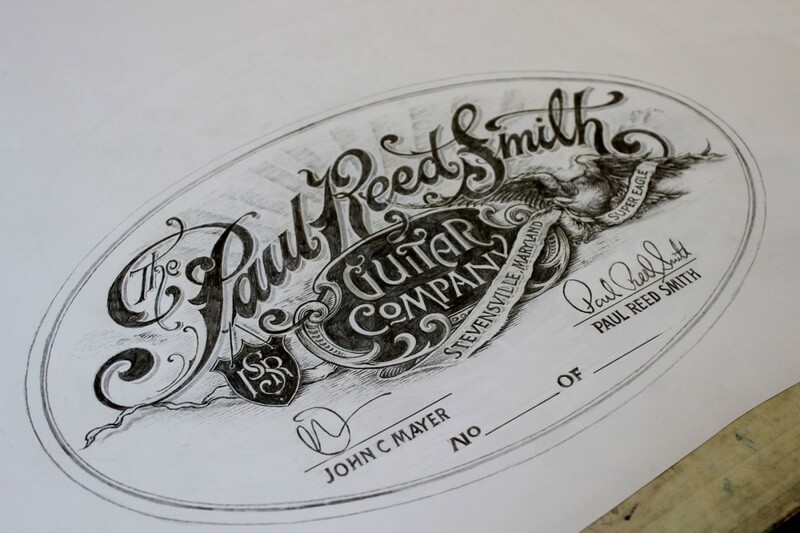 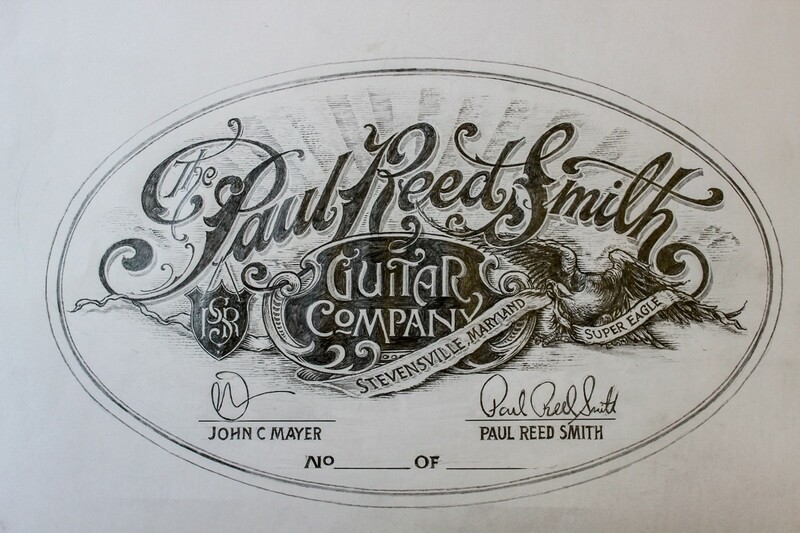 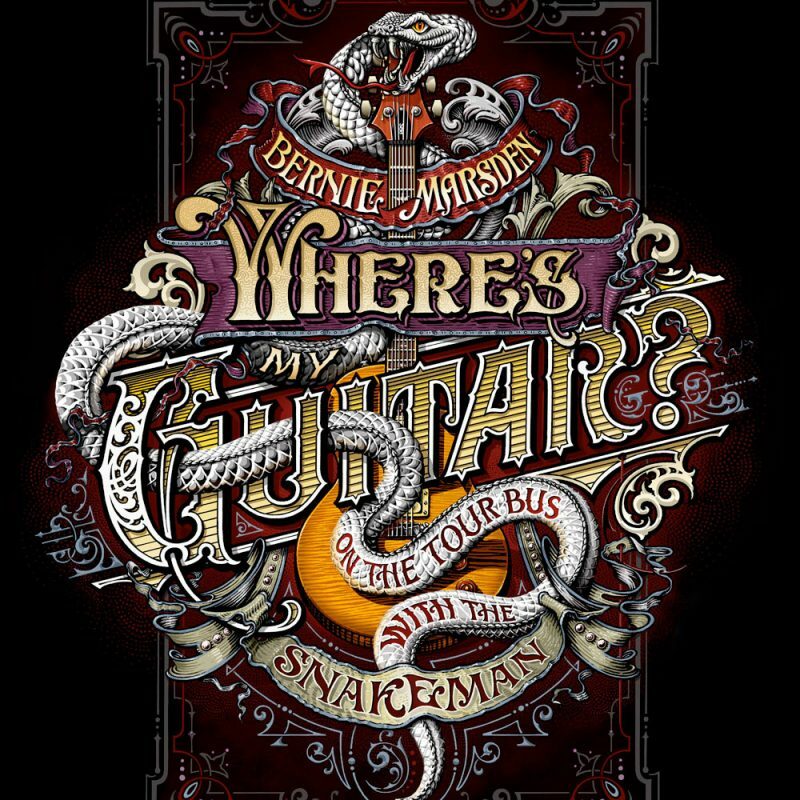 It was an honour to be involved with this project along side John Mayer and Paul Reed Smith. 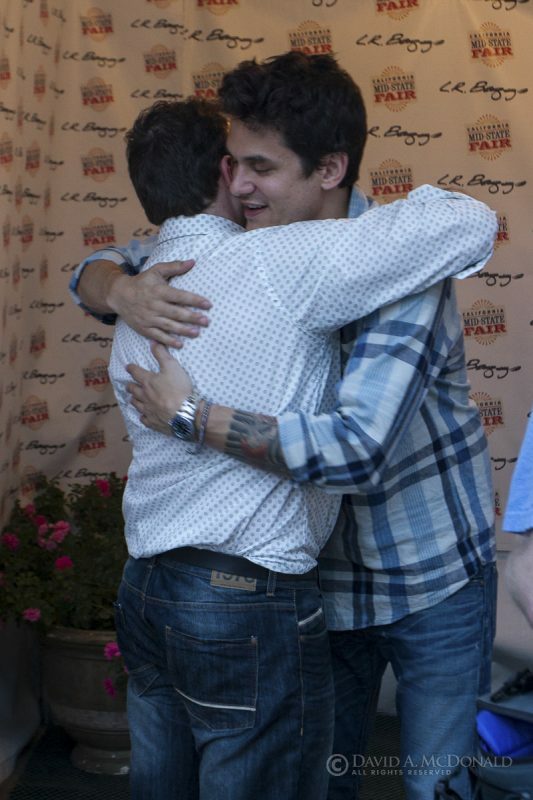 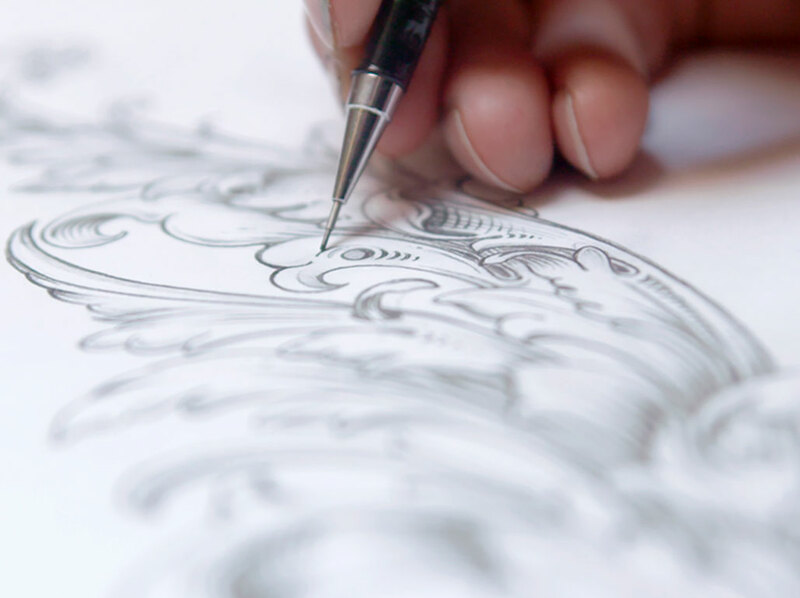 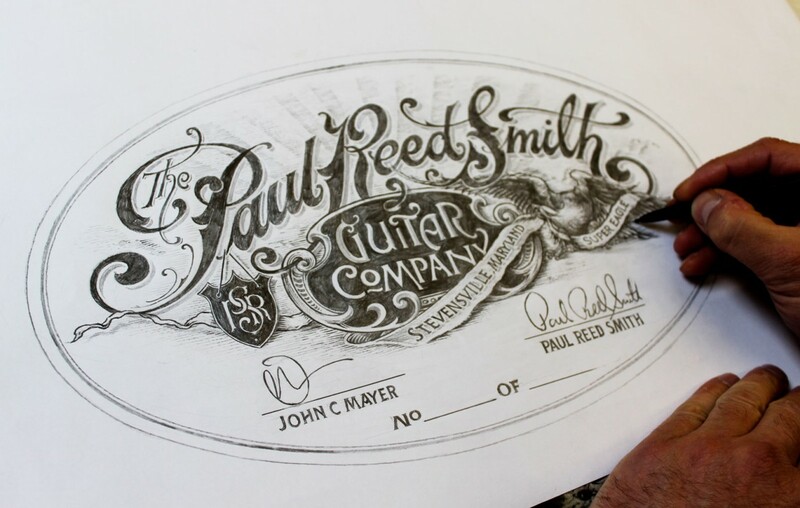 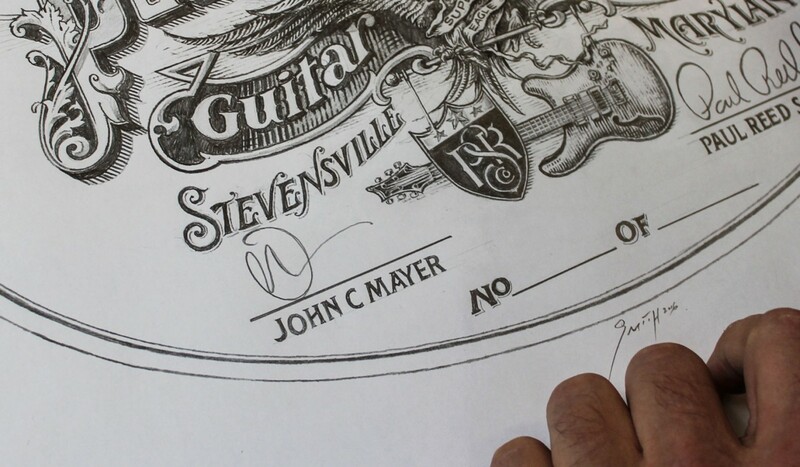 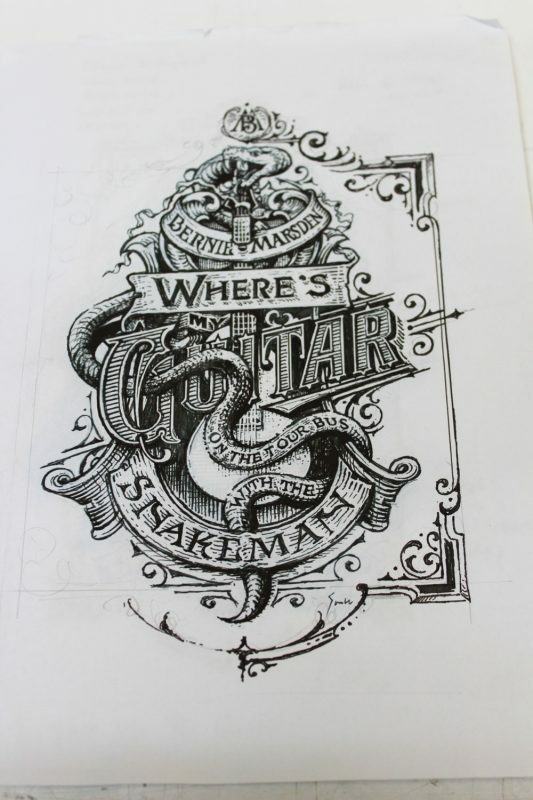 See the guitar and John Mayer explaining the exquiste craftsmanship in this film. 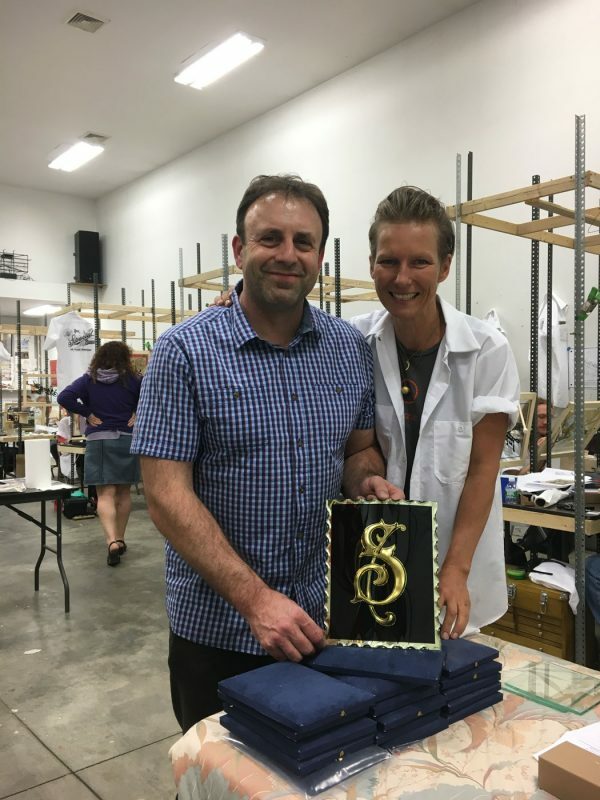 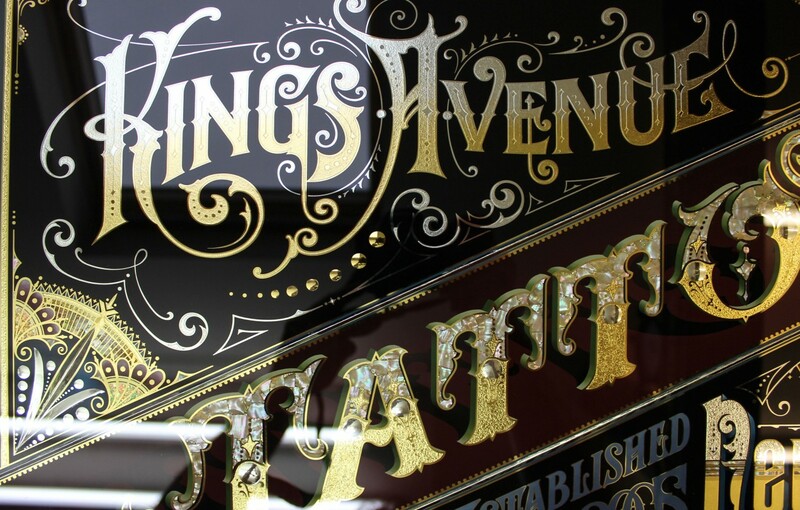 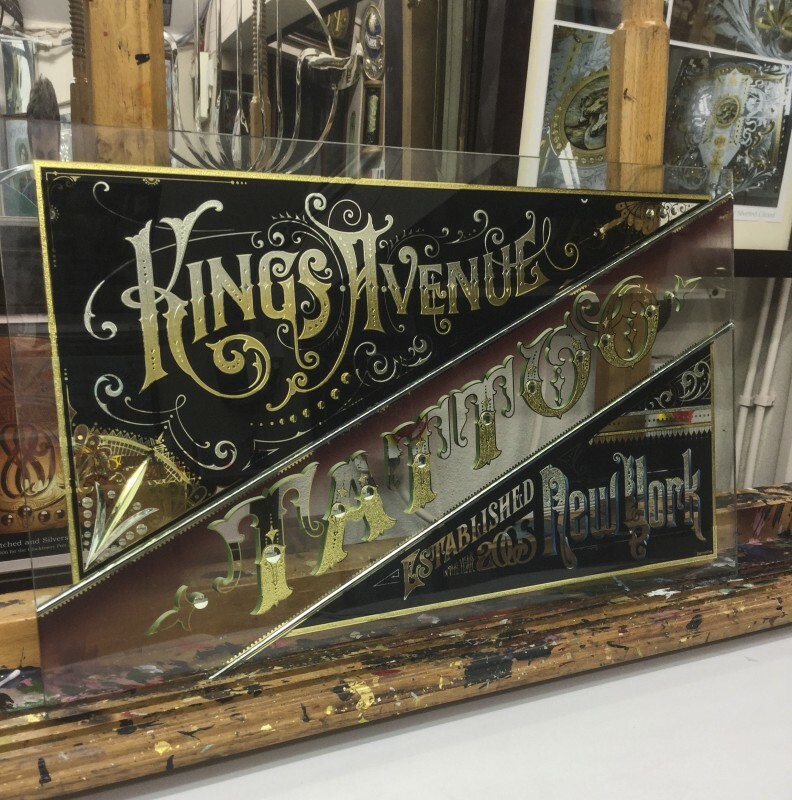 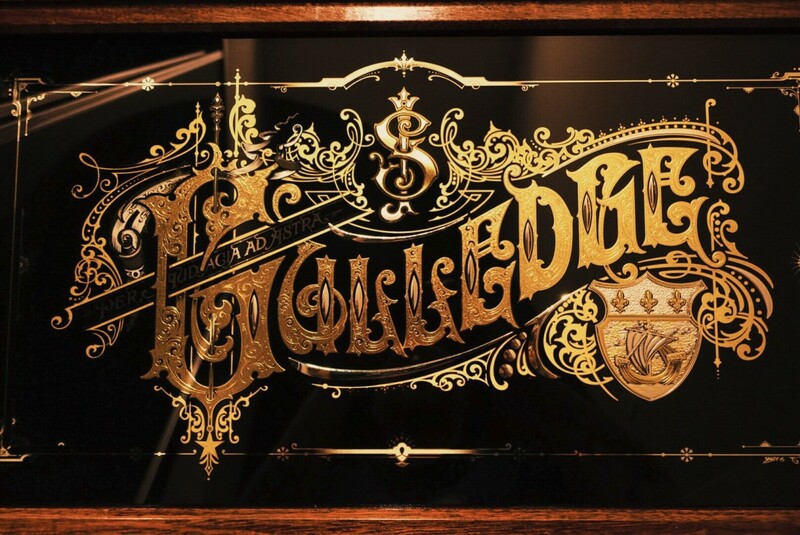 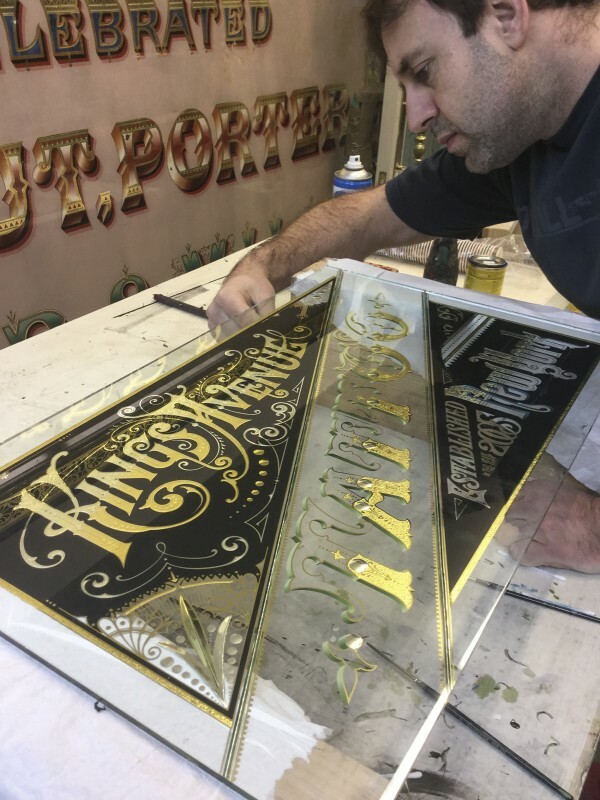 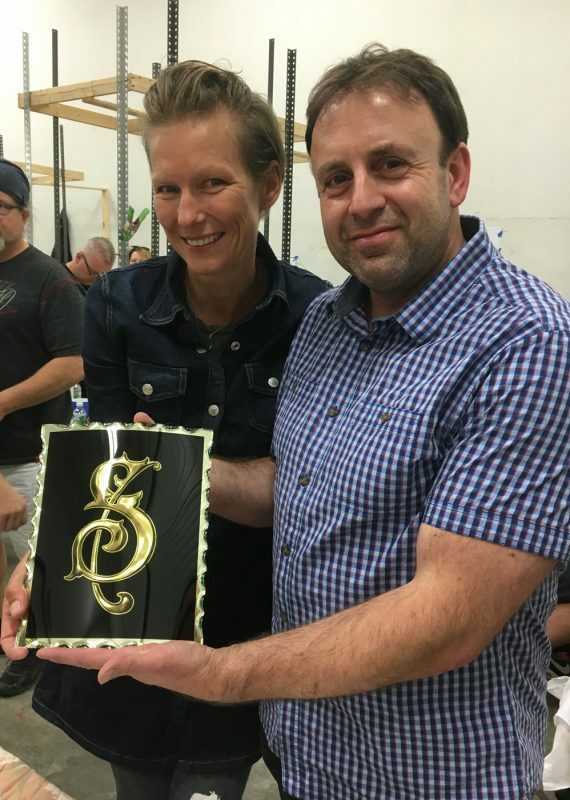 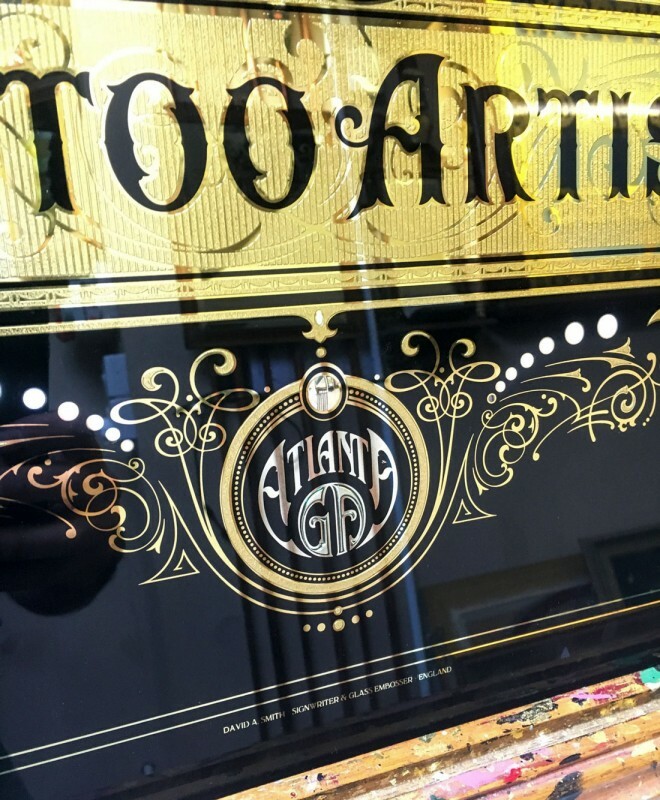 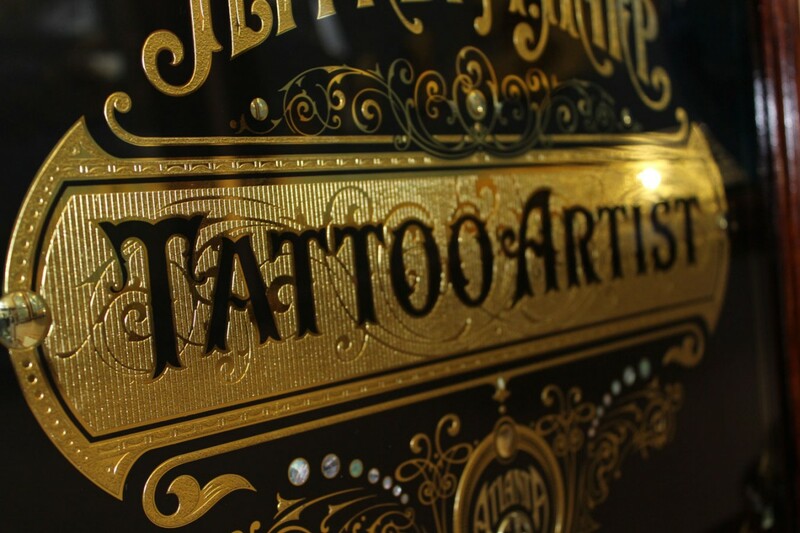 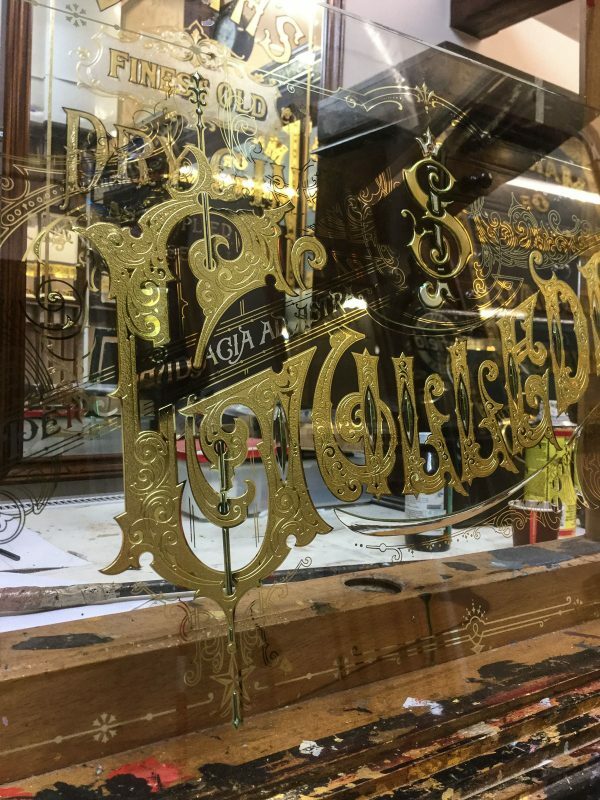 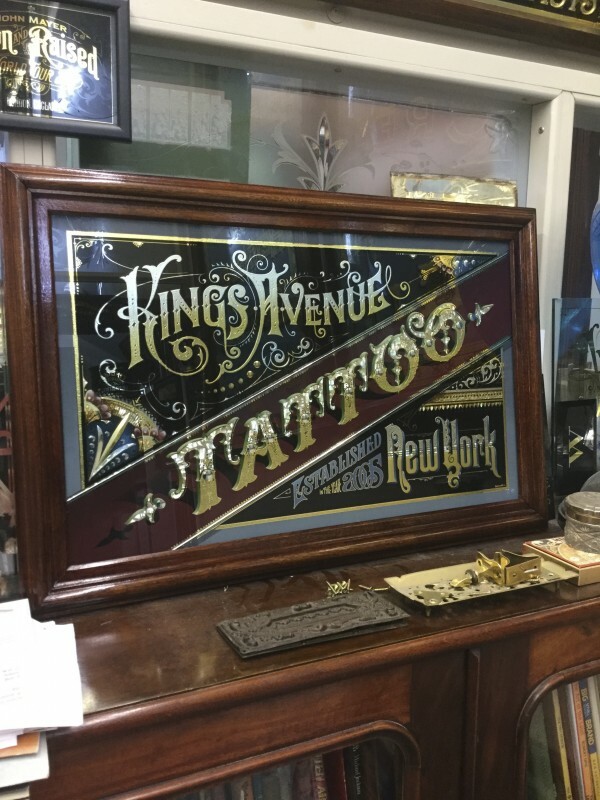 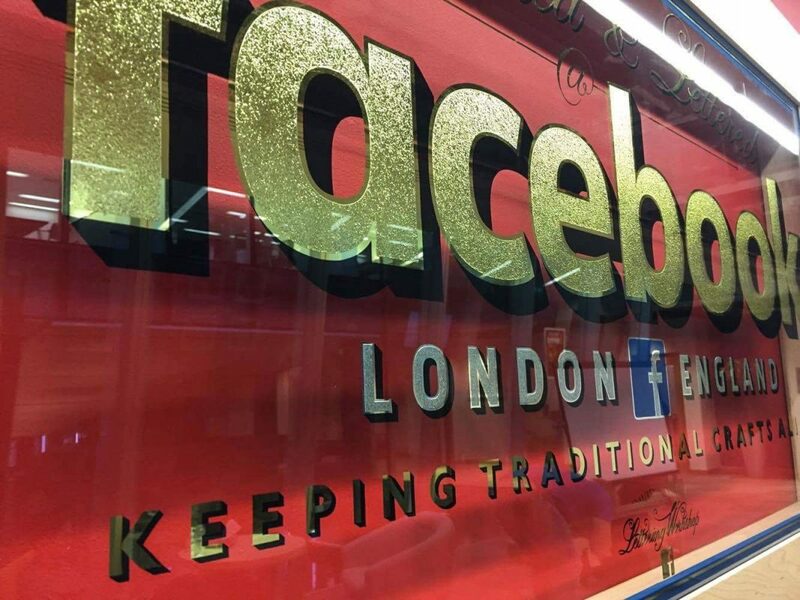 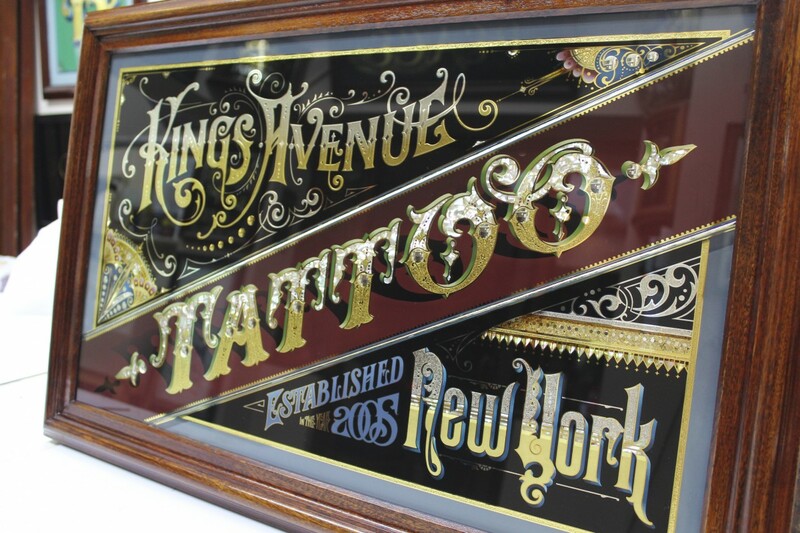 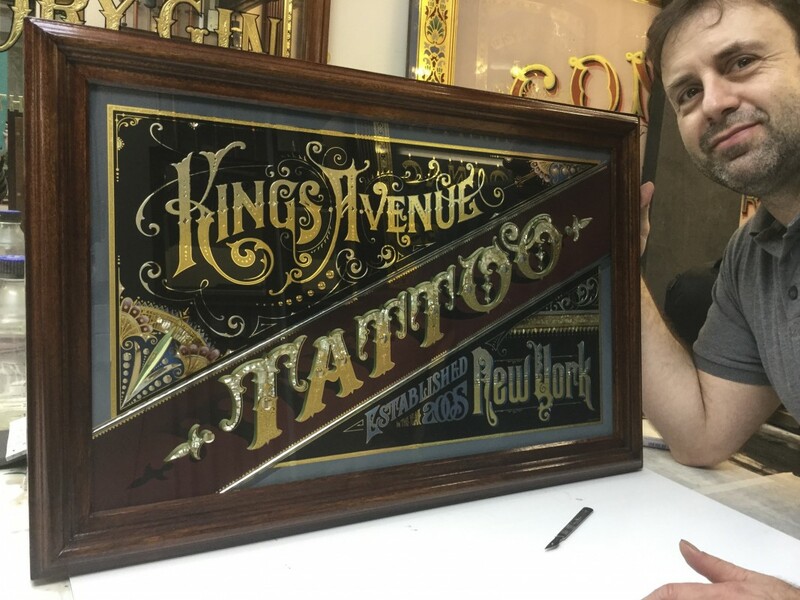 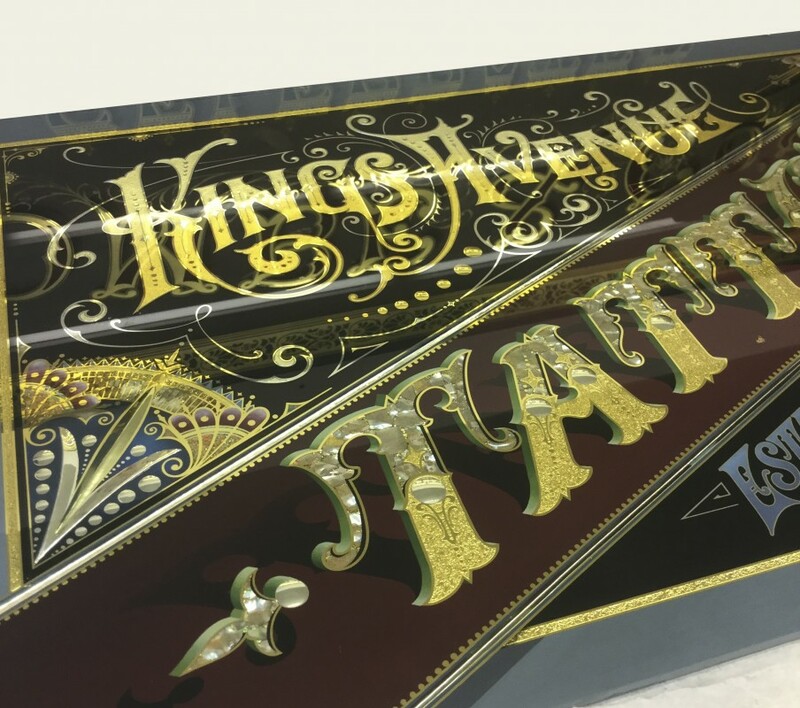 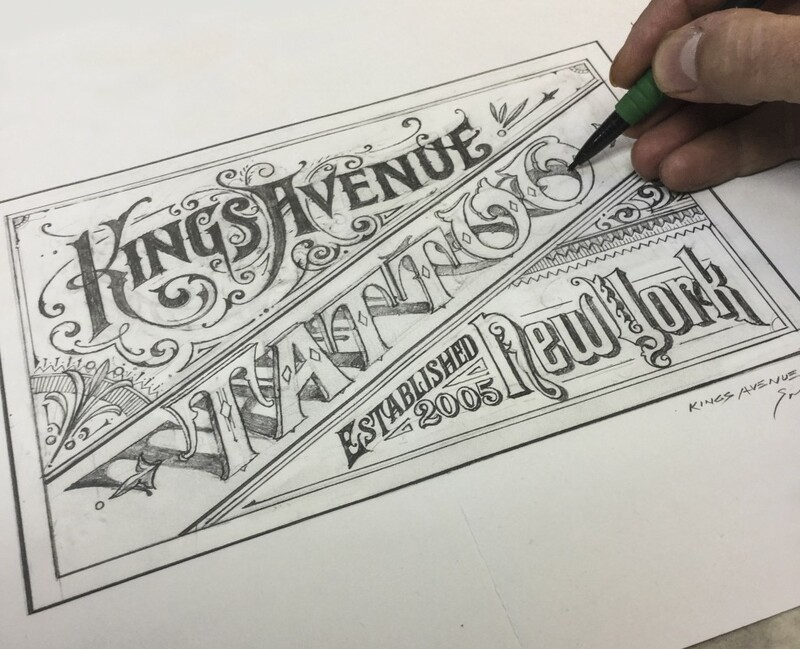 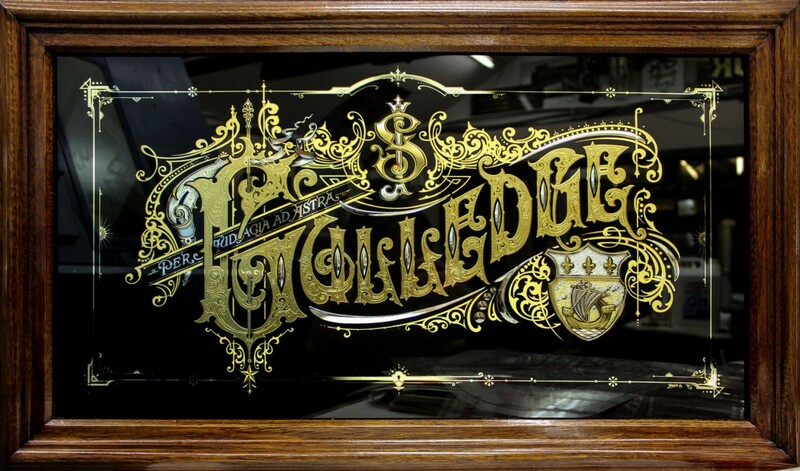 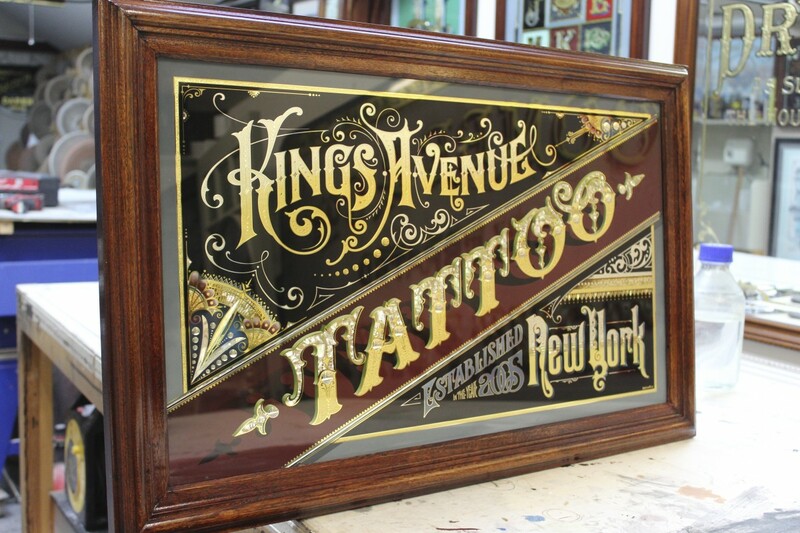 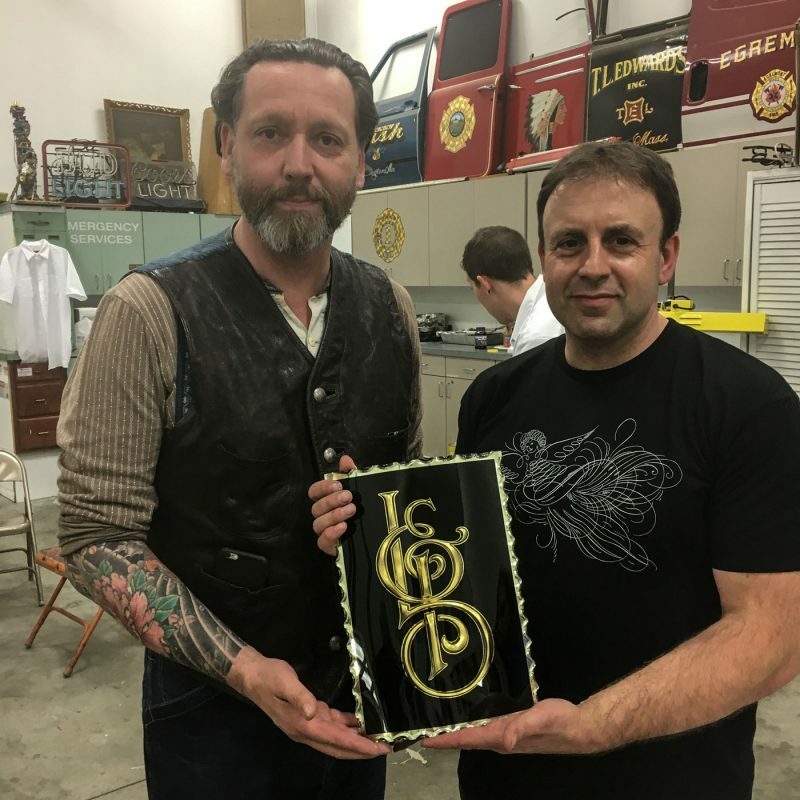 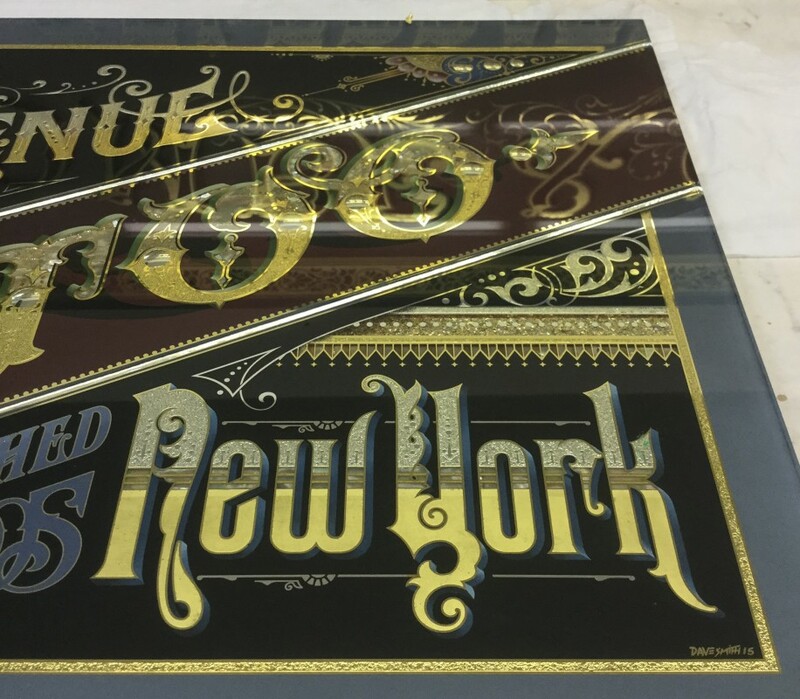 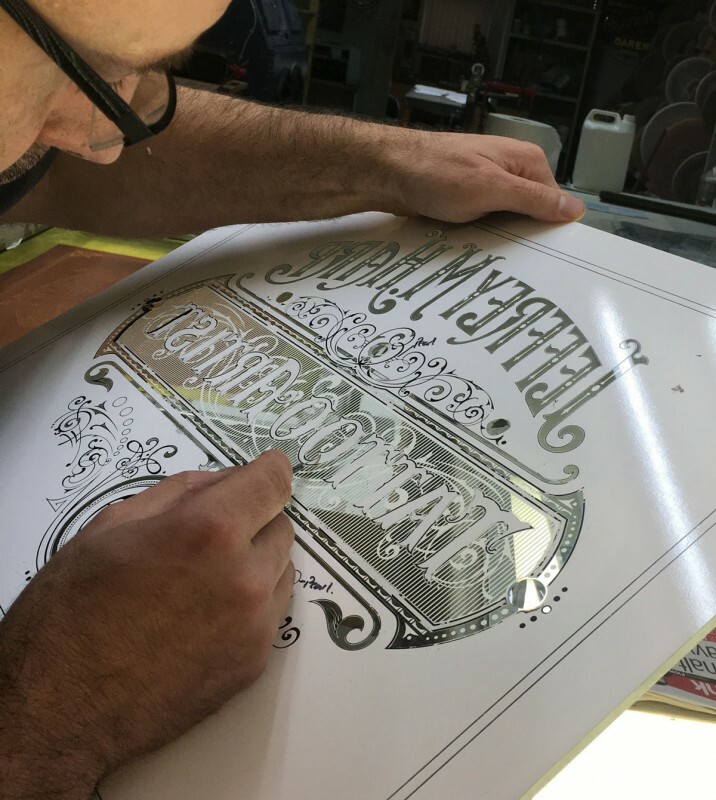 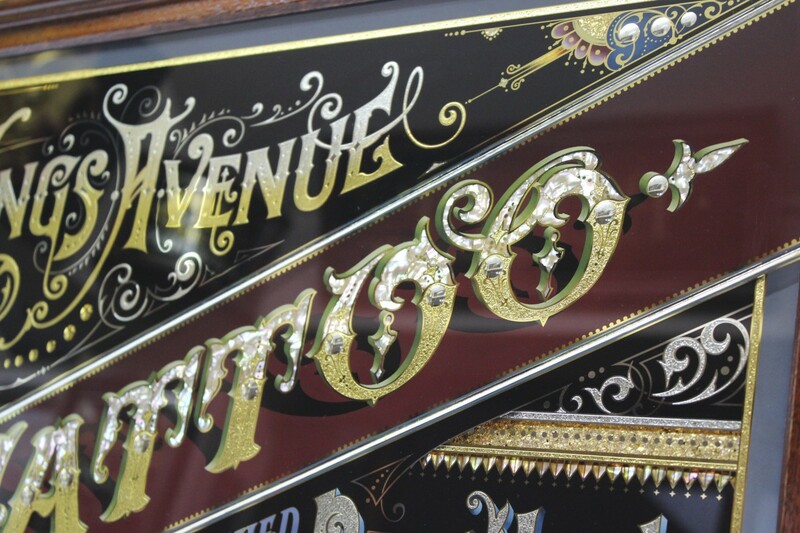 This Gilded glass sign was made in 2015 for the world famous Kings Avenue Tattoo Studios in downtown New York, USA . 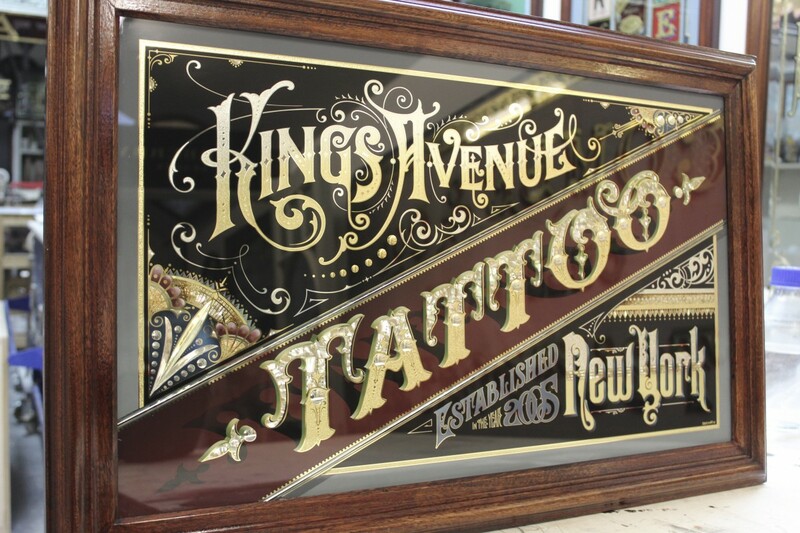 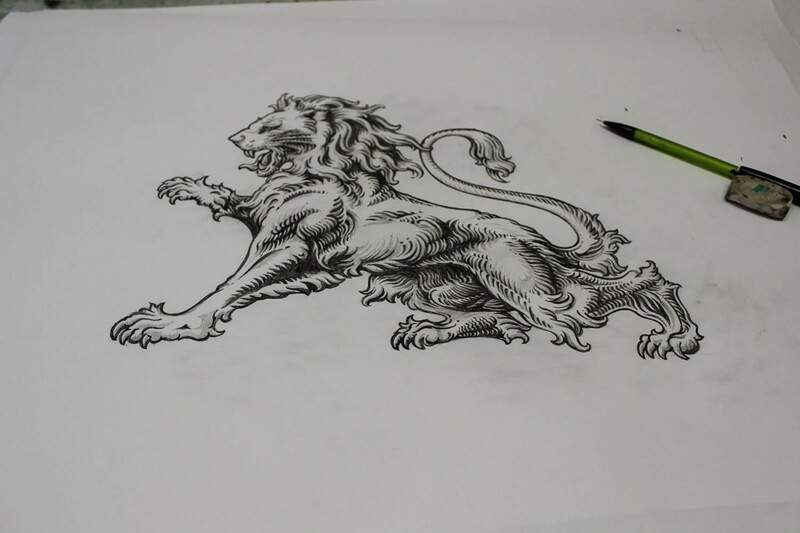 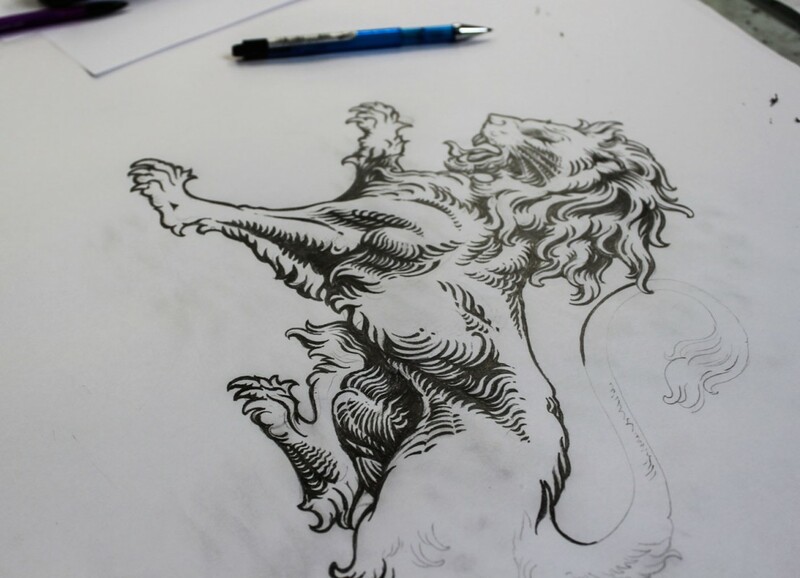 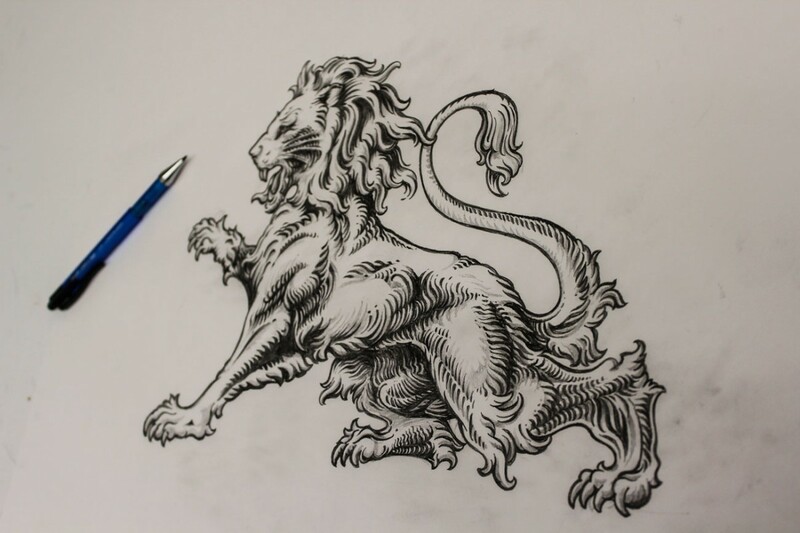 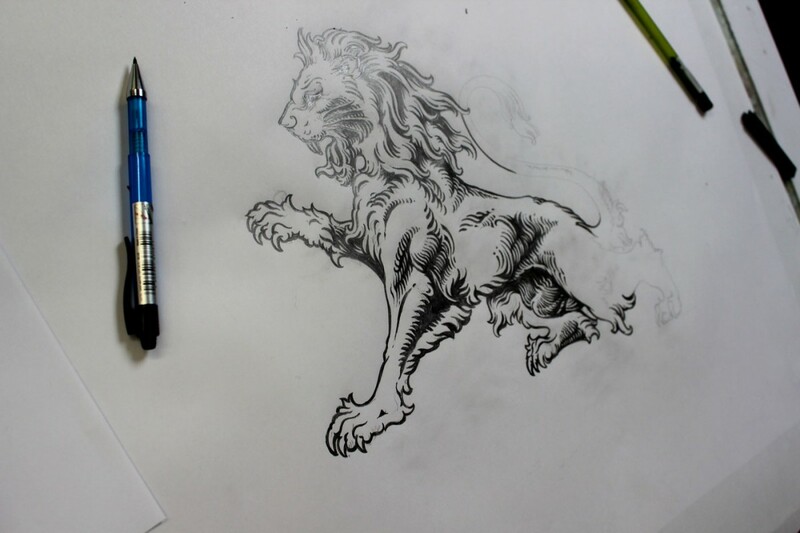 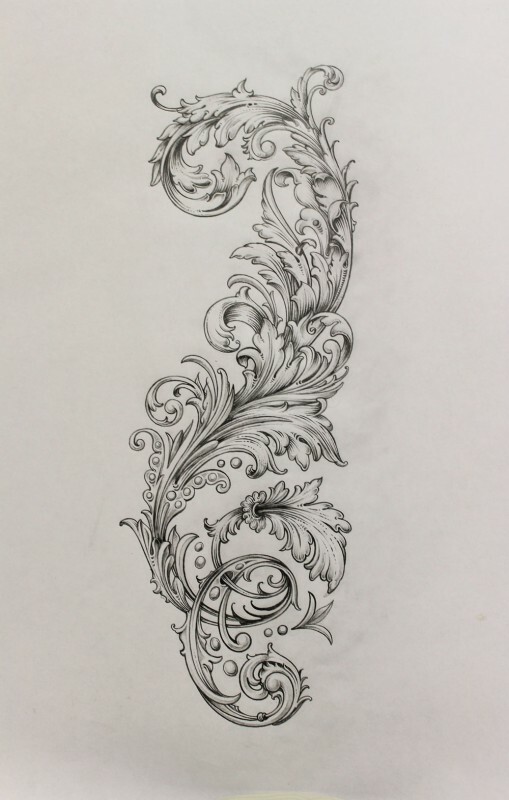 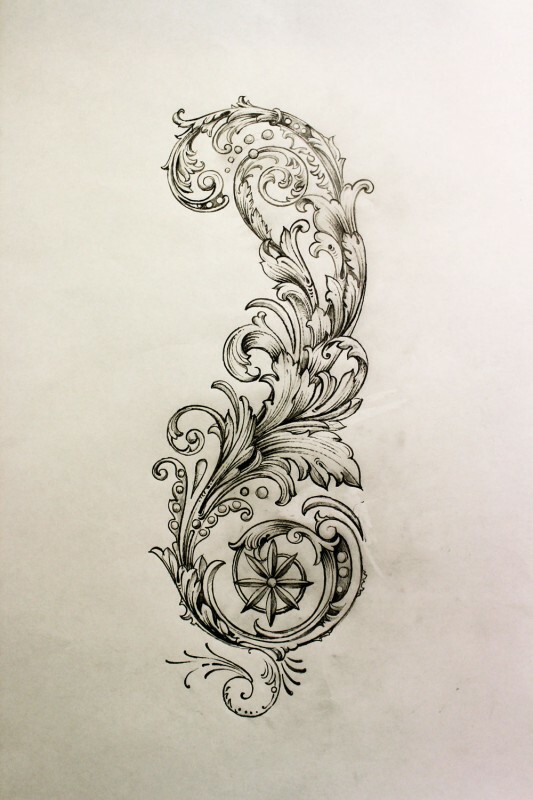 Mike Rubendall is an internationally renowned artist, entrepreneur, and the founder of Kings Avenue Tattoo. 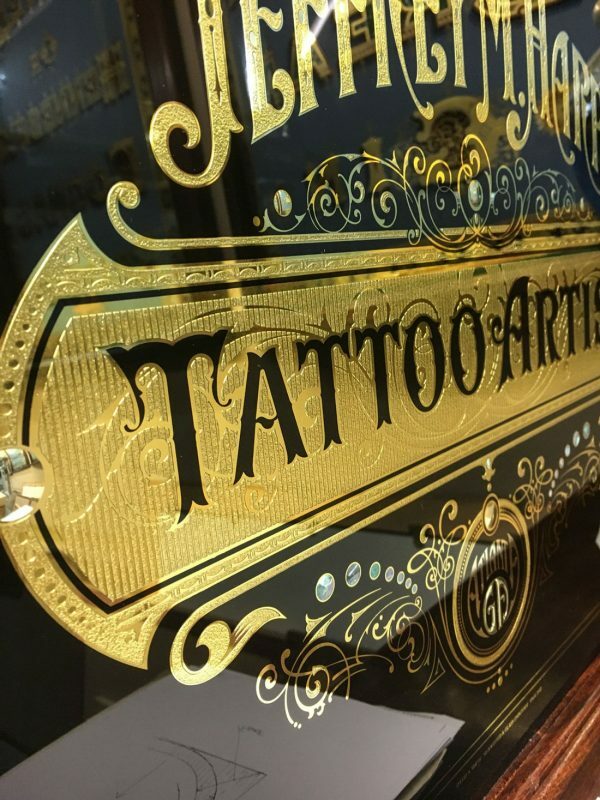 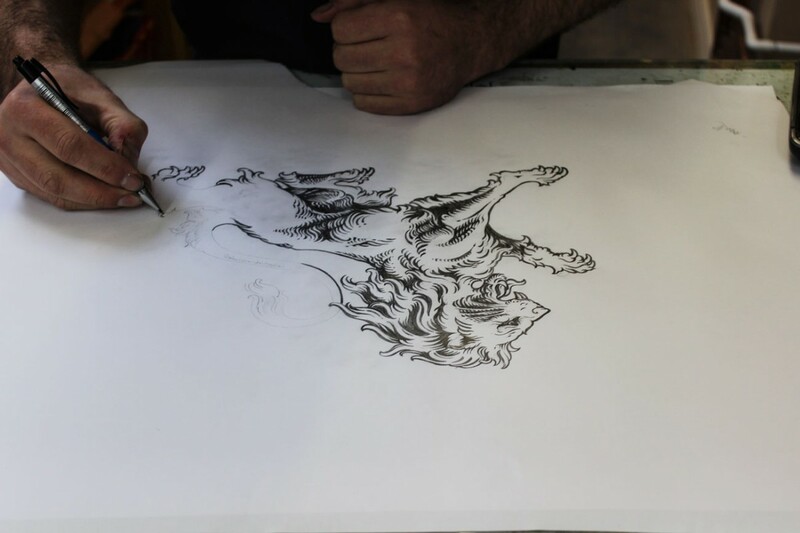 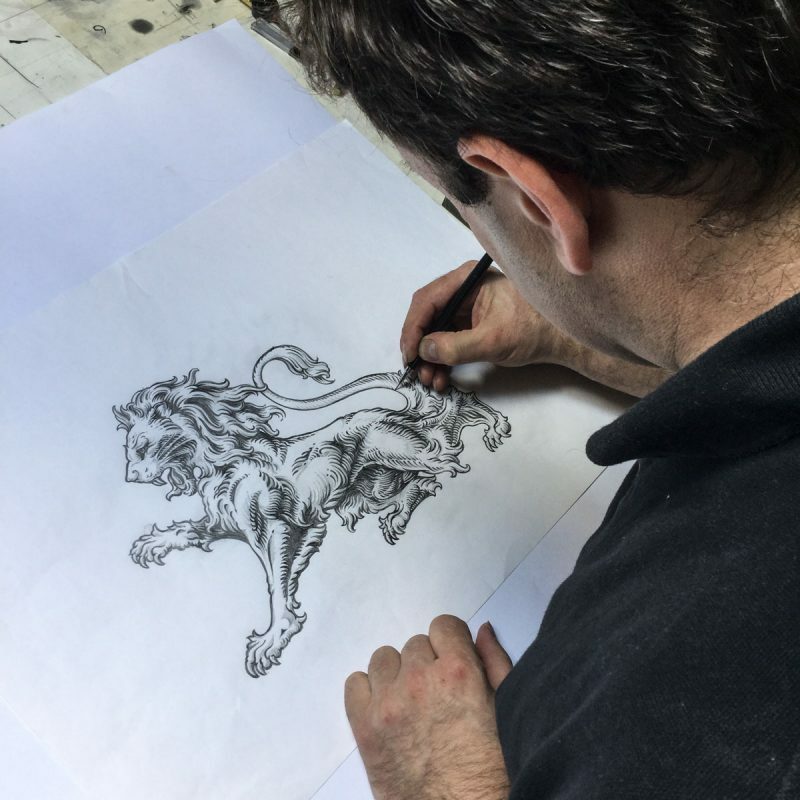 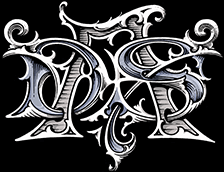 Mike has over twenty years experience in the tattoo industry and has received over fifty international awards for his work. 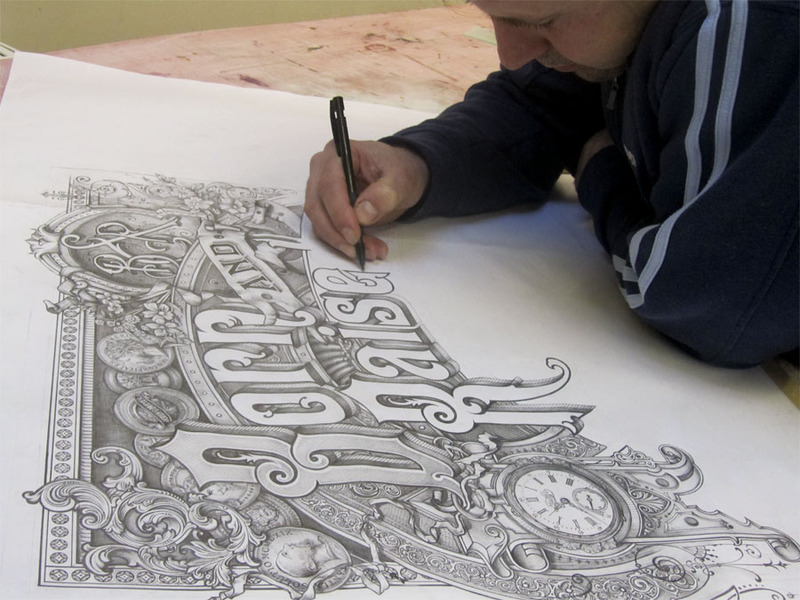 Mike?s work has been featured in over 100 publications and magazines. 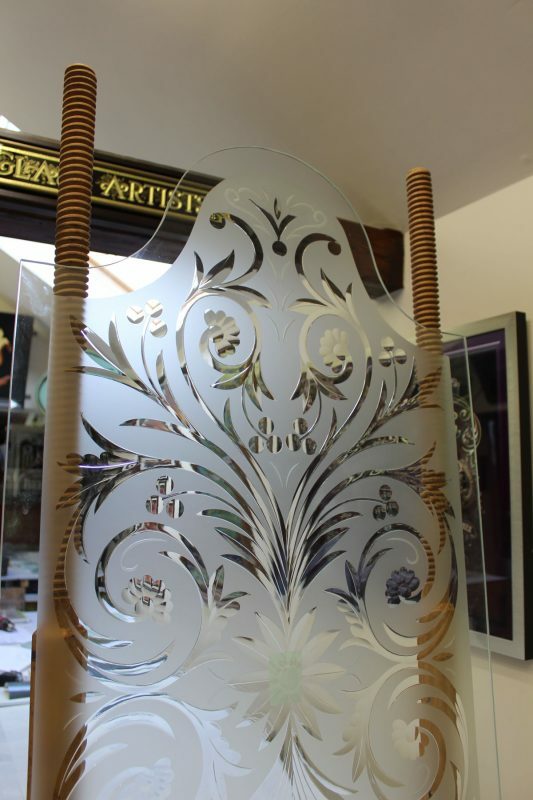 The glass is made up of many techniques including acid etching in fine mica stipple. 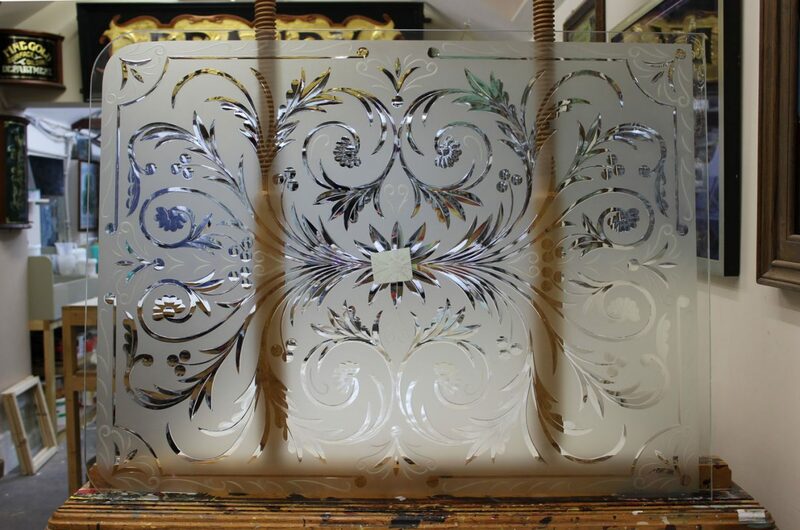 Mother-of-pearl inlay, hand painted shades and shadows and brilliant cutting. 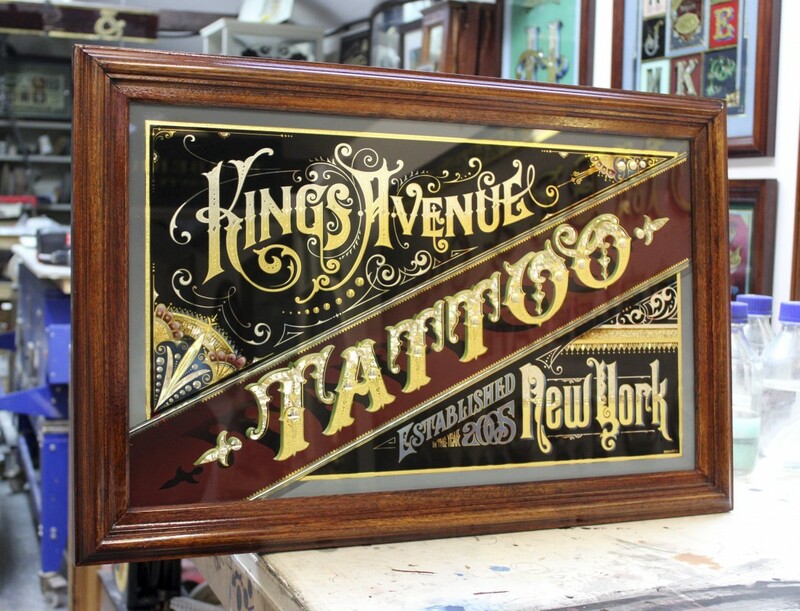 The frame is mahogany and is French Polished. 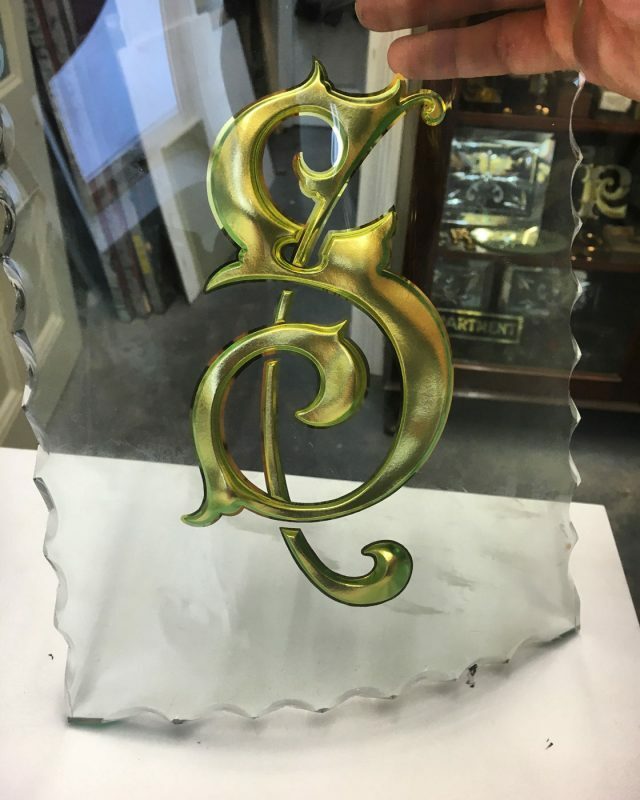 This glass piece was an anniversary surprise from the owners work colleagues.